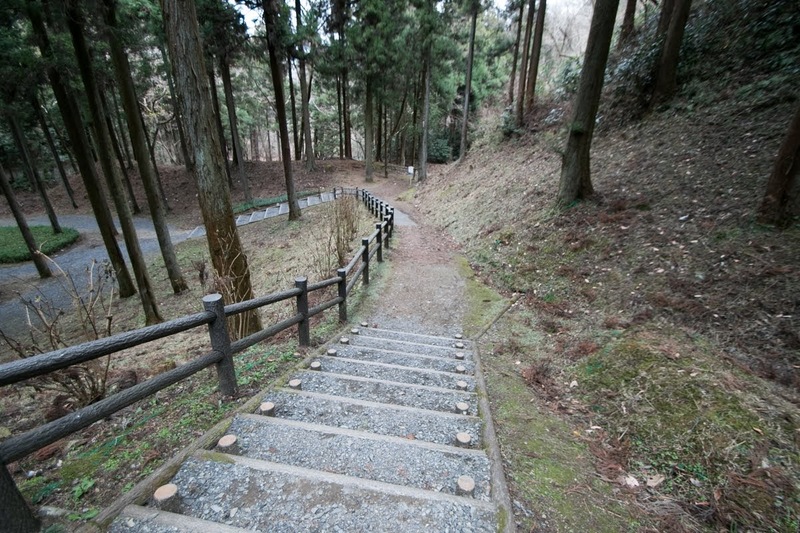 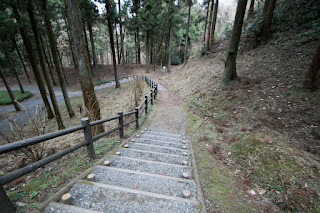 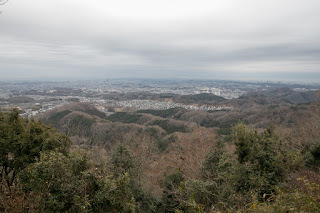 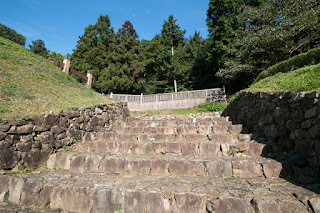 Hachioji castle (八王子城) is located on the top and hillside of Mt. 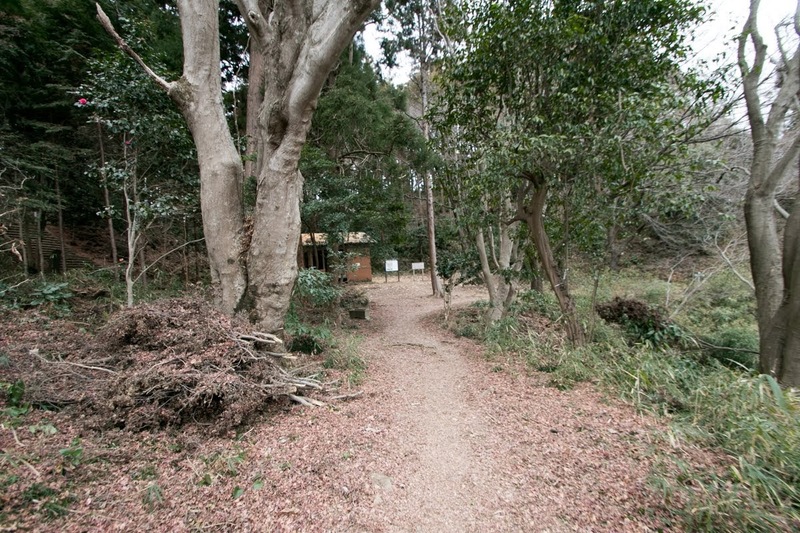 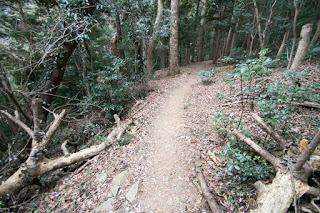 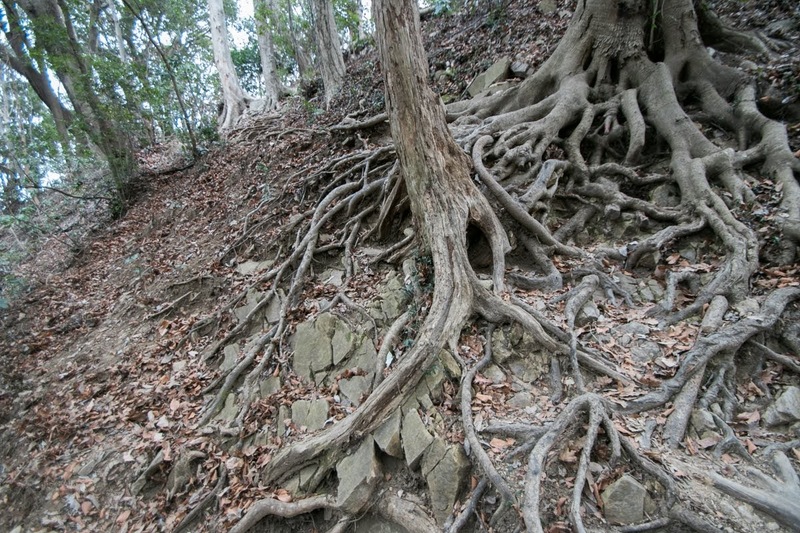 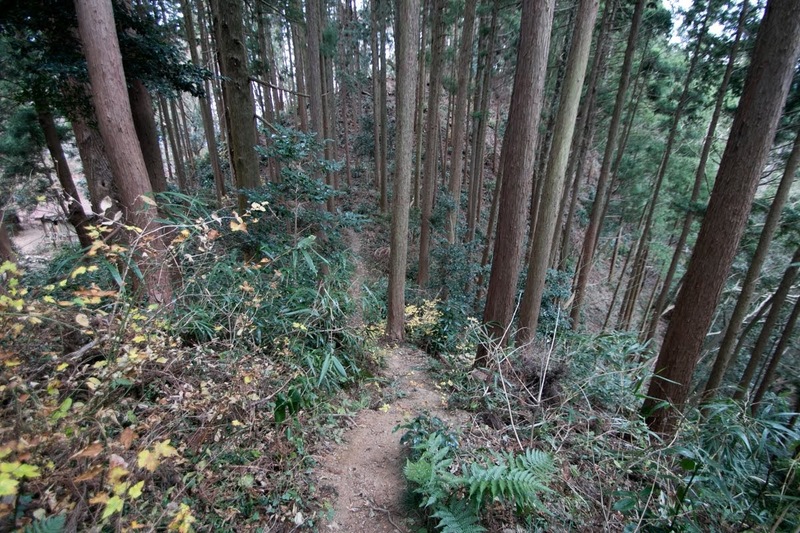 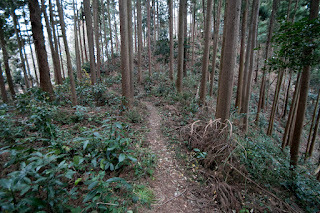 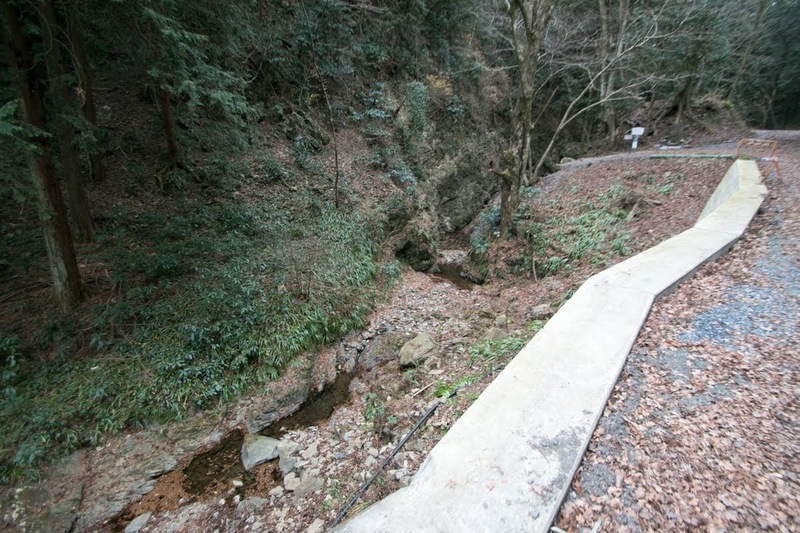 Fukasawayama, about five kilometer southwest of central Hachioji city. 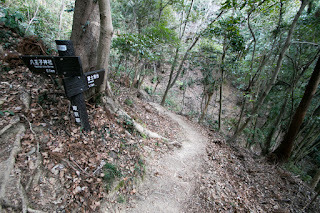 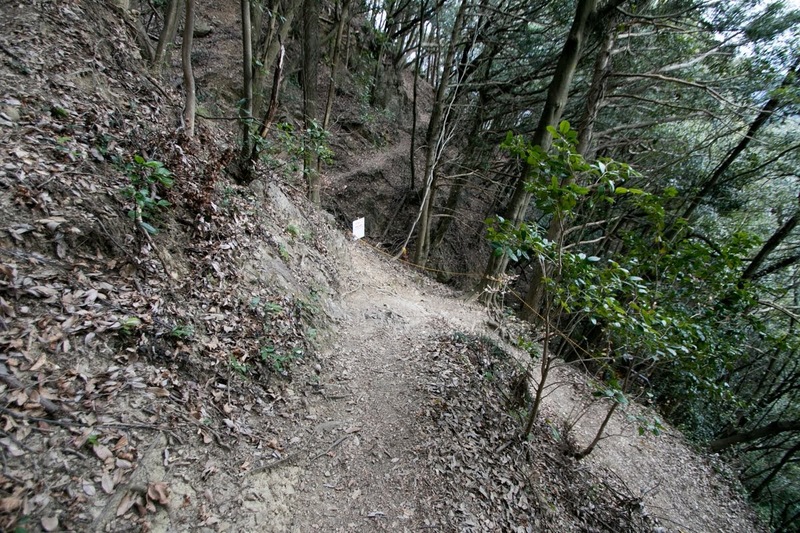 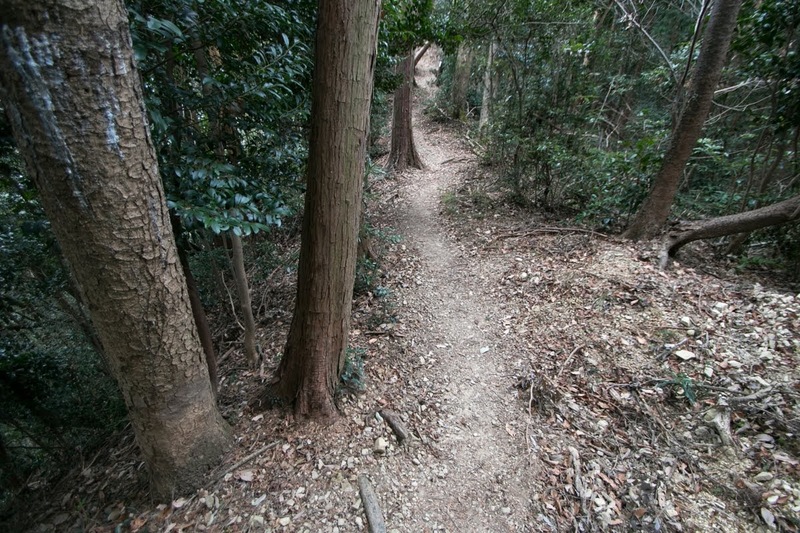 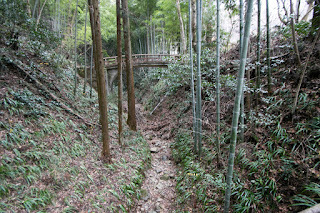 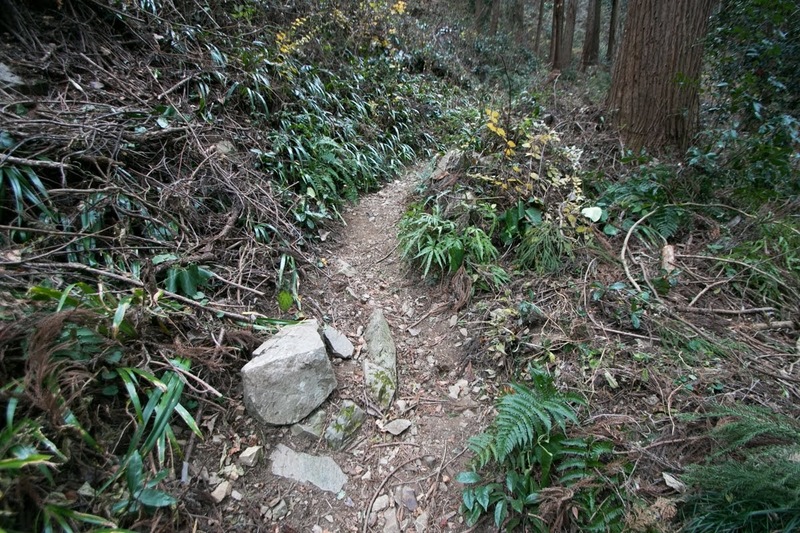 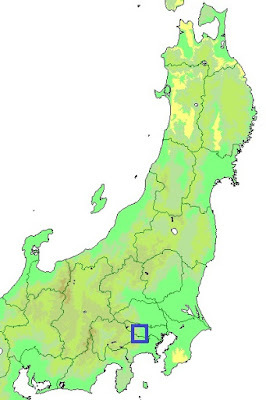 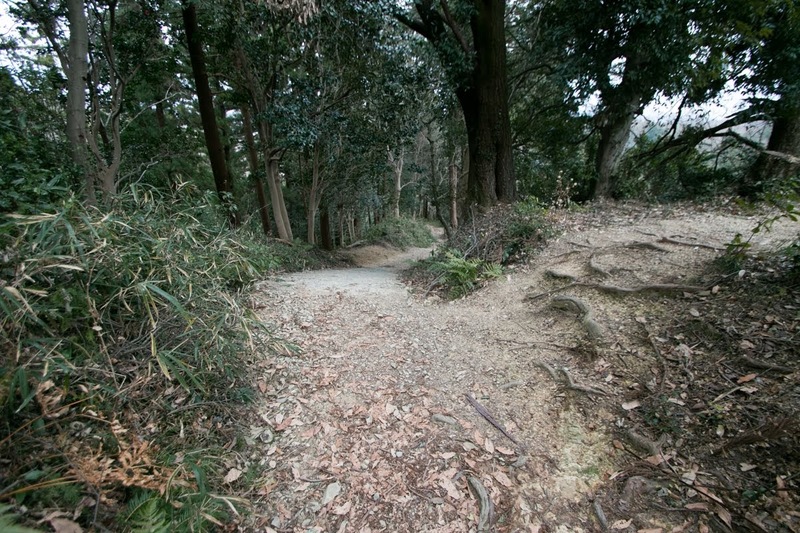 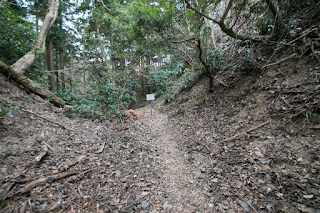 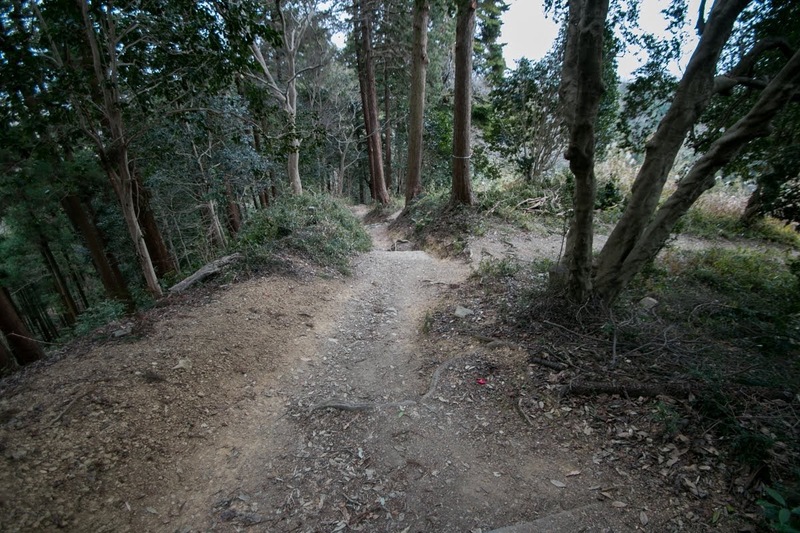 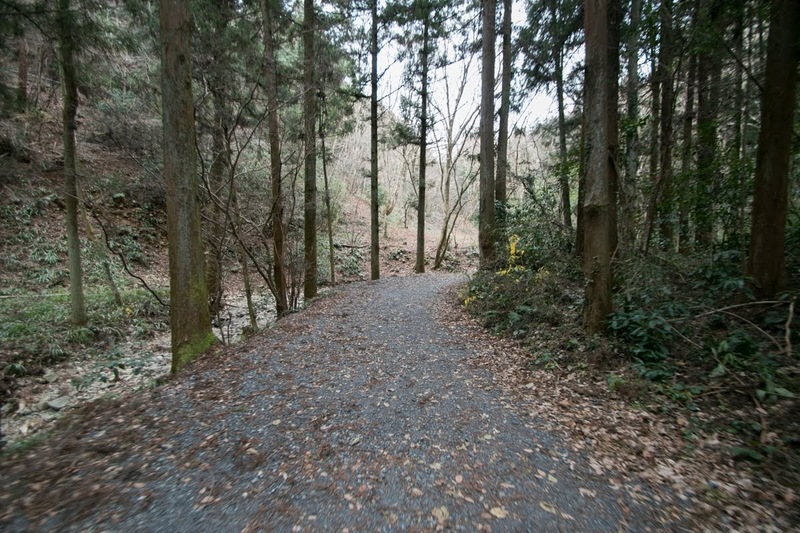 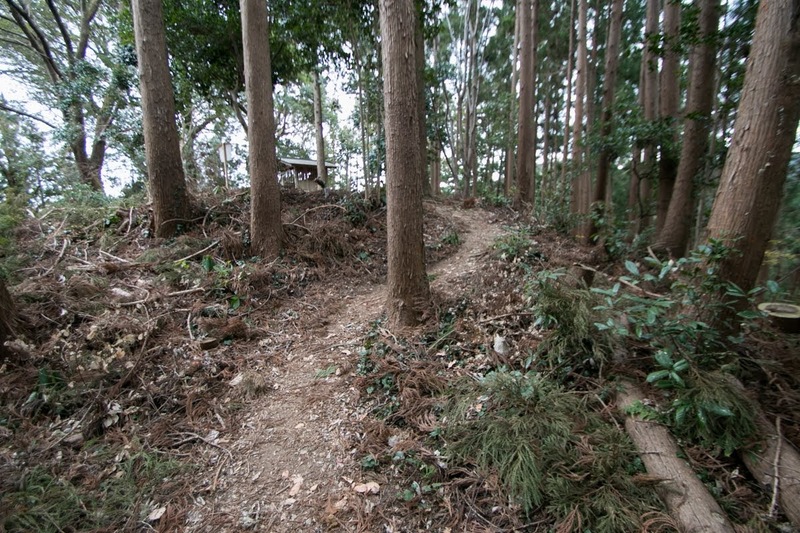 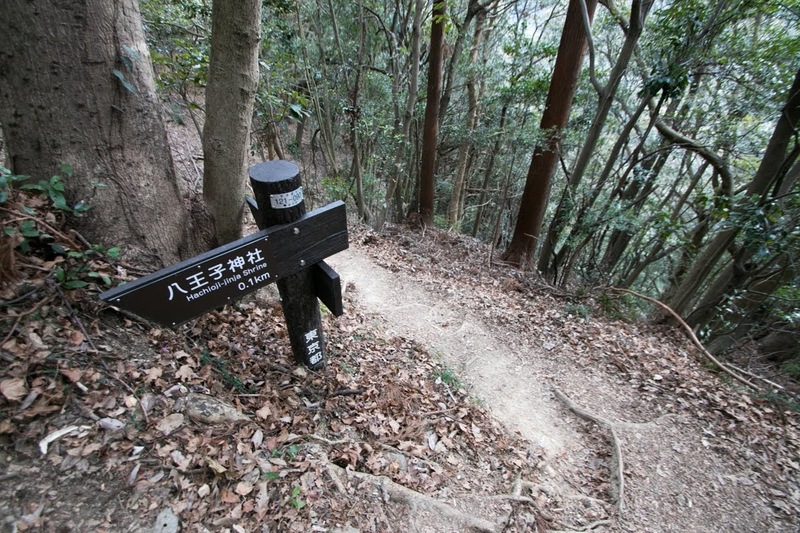 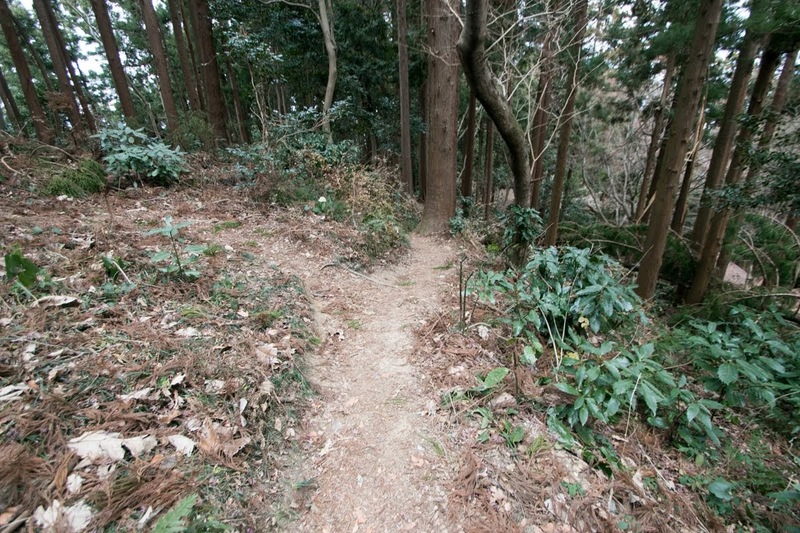 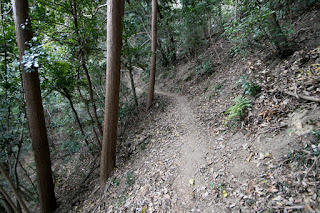 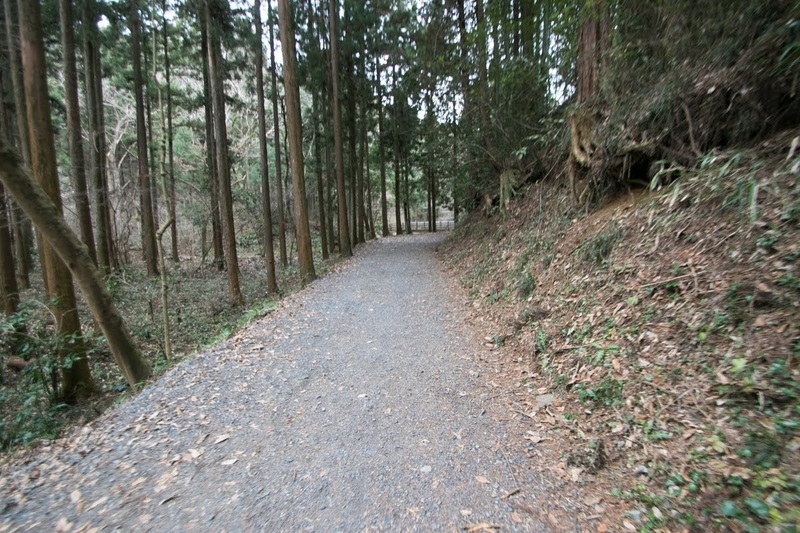 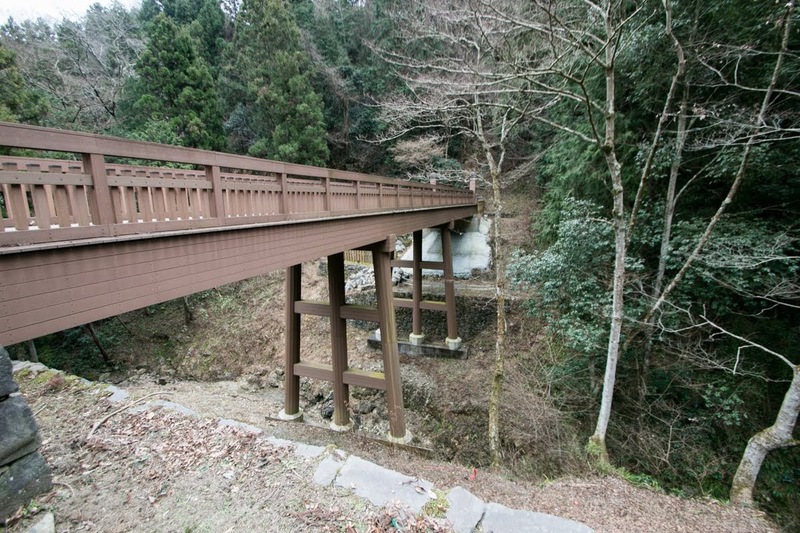 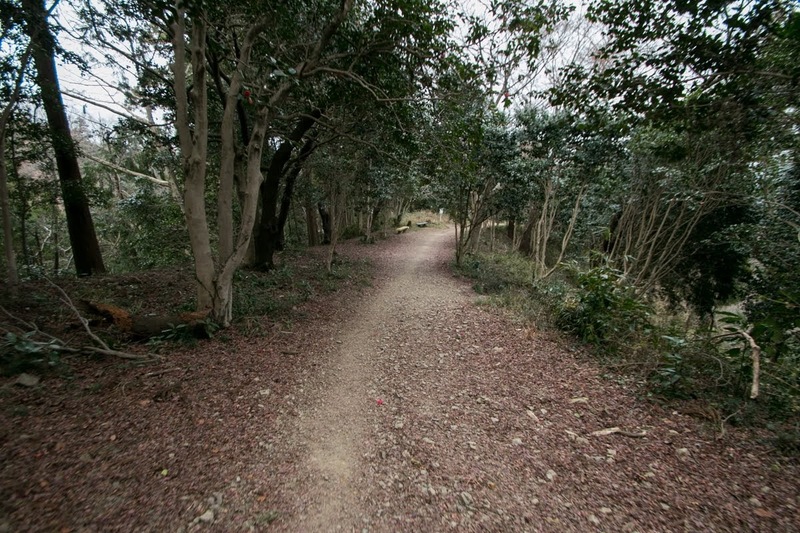 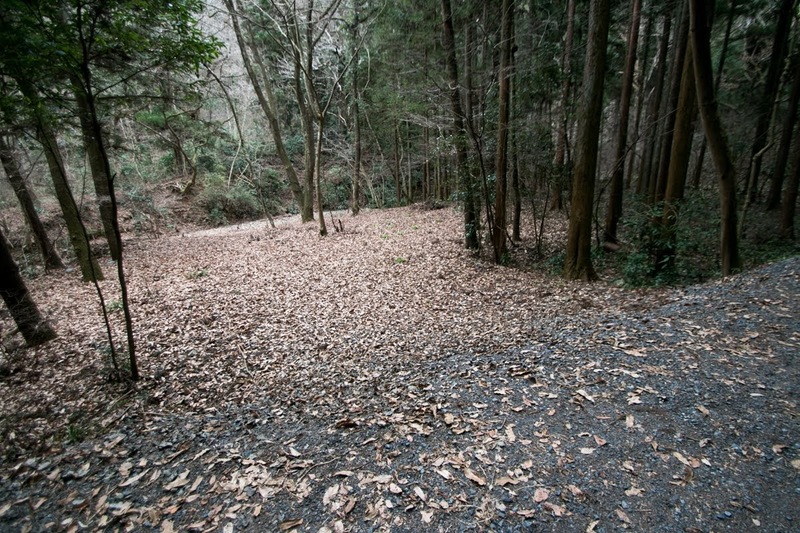 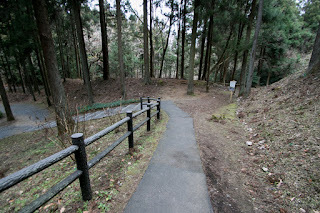 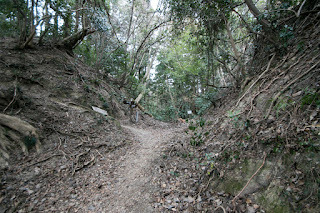 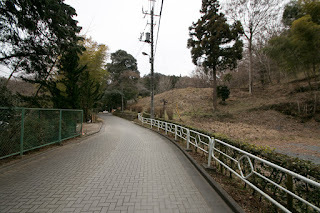 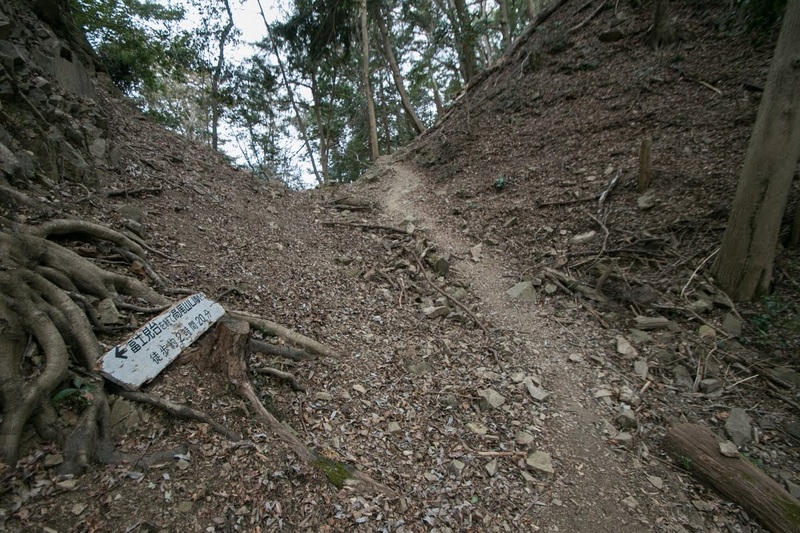 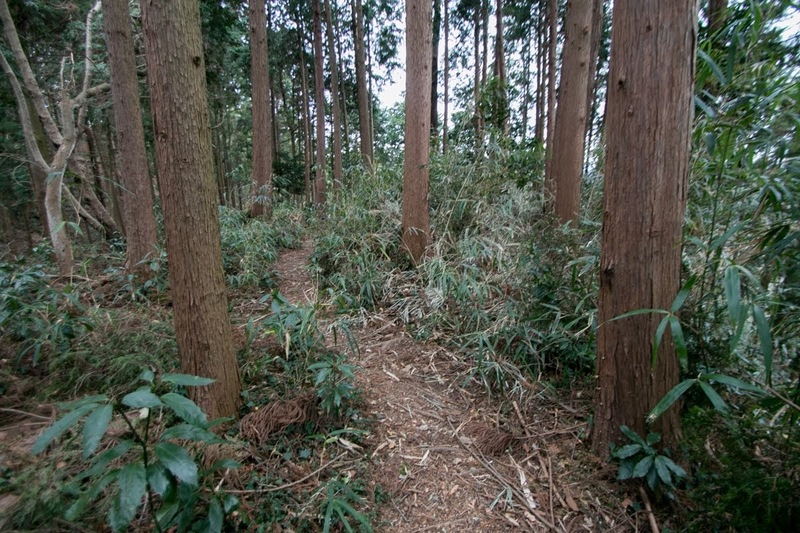 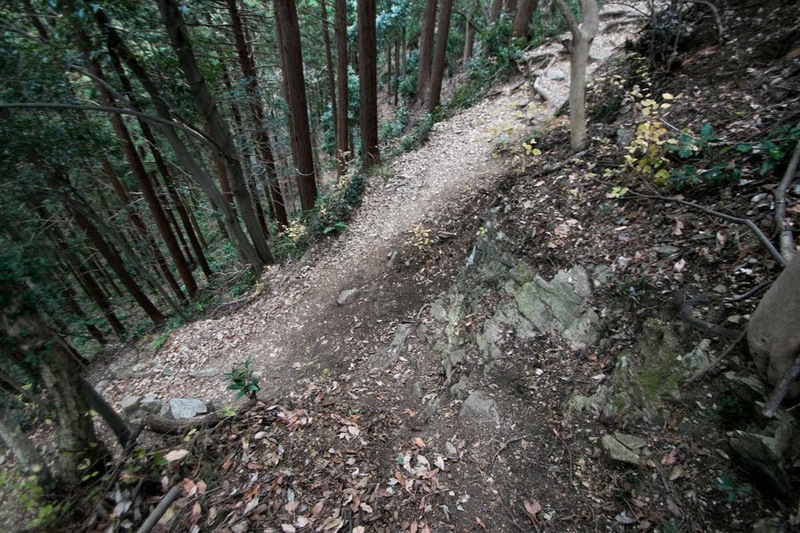 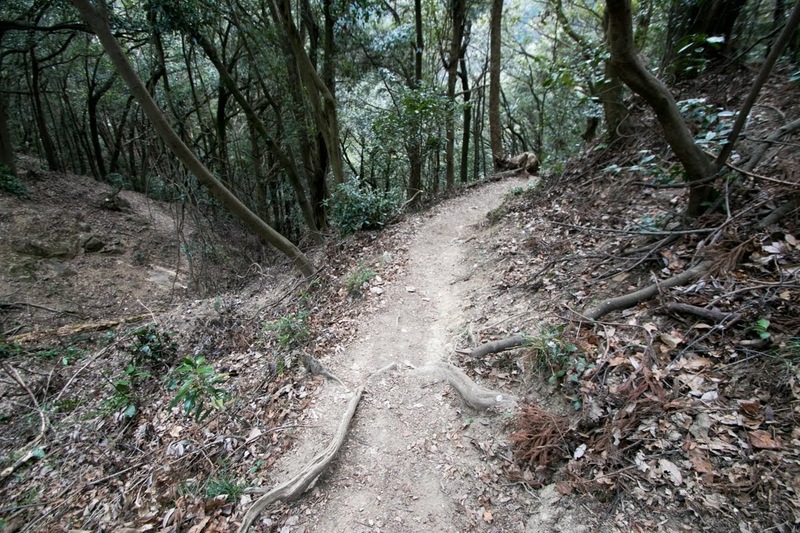 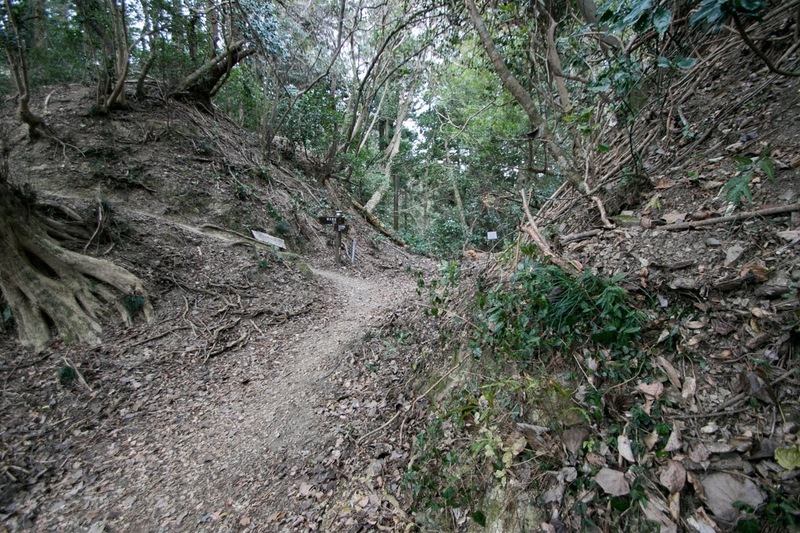 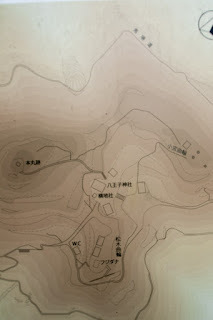 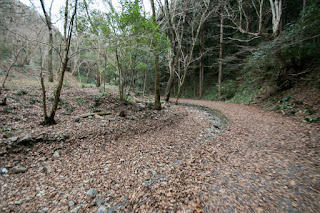 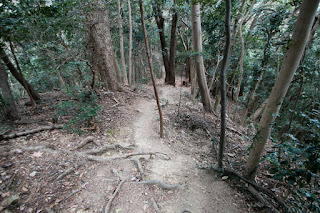 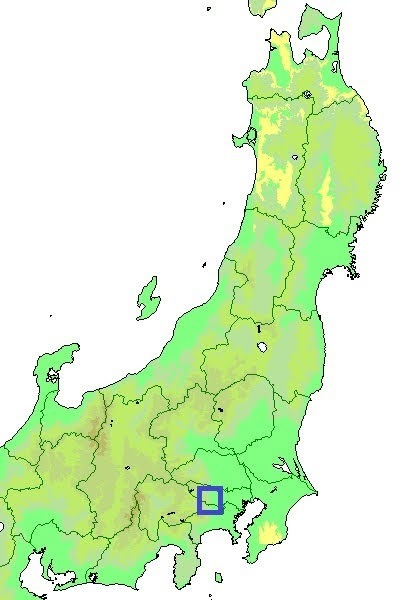 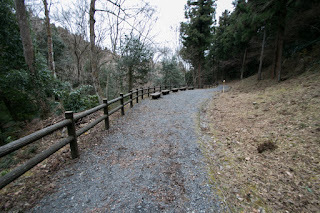 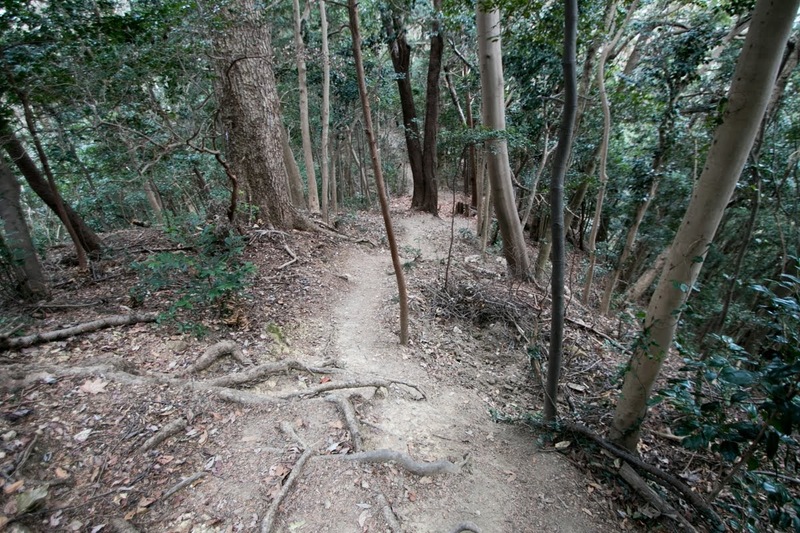 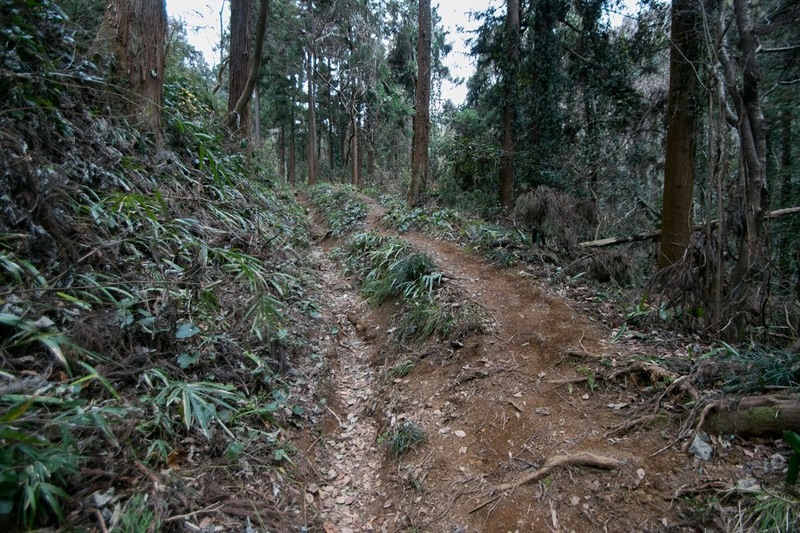 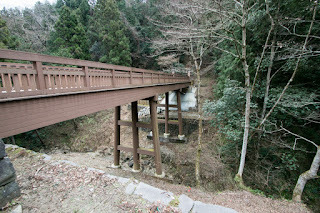 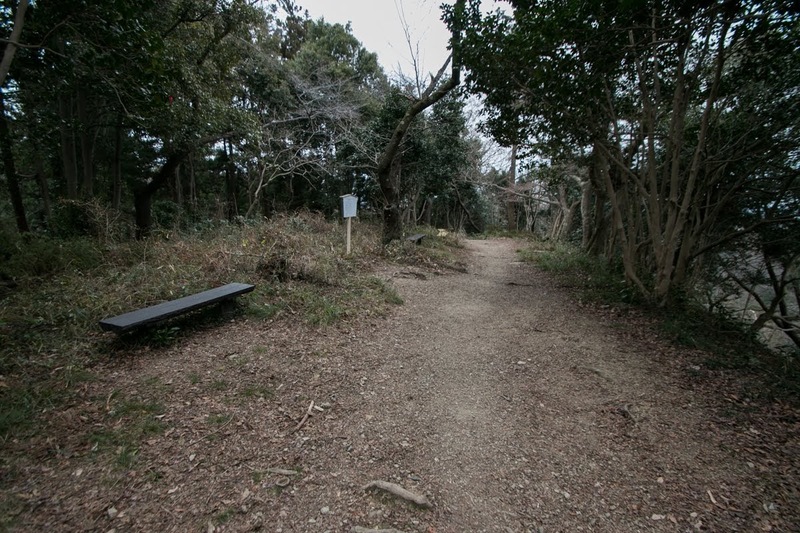 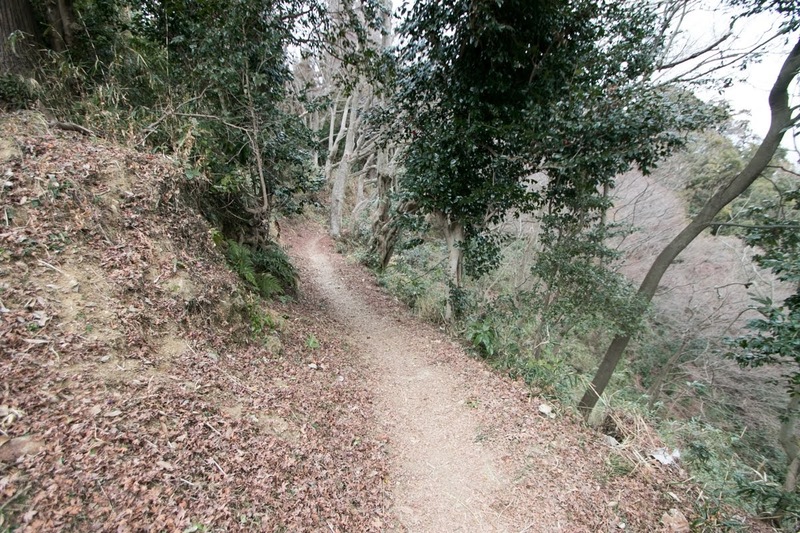 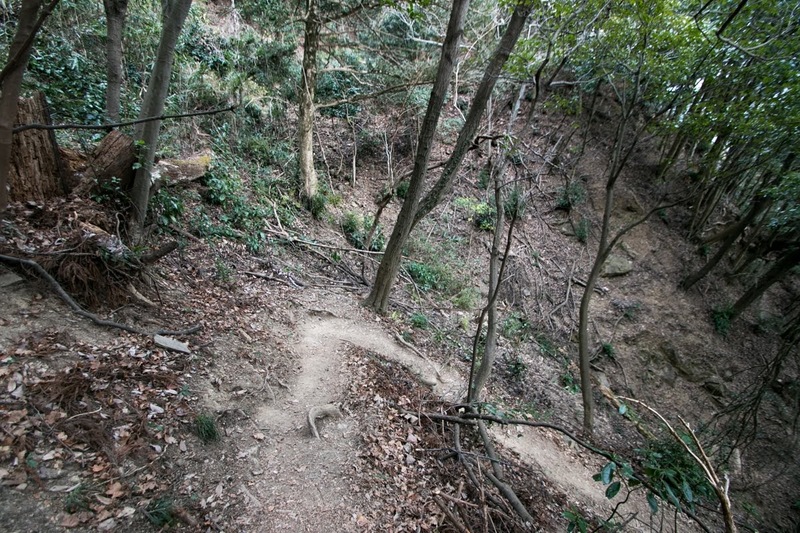 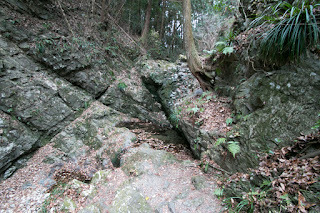 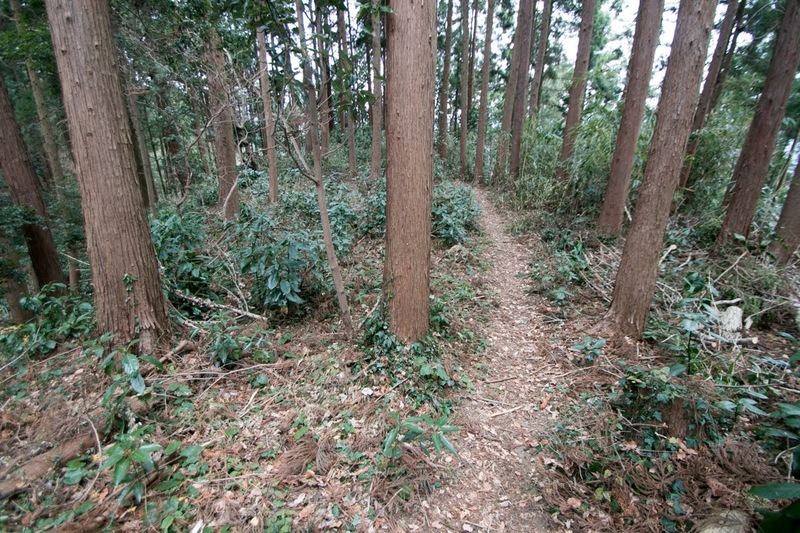 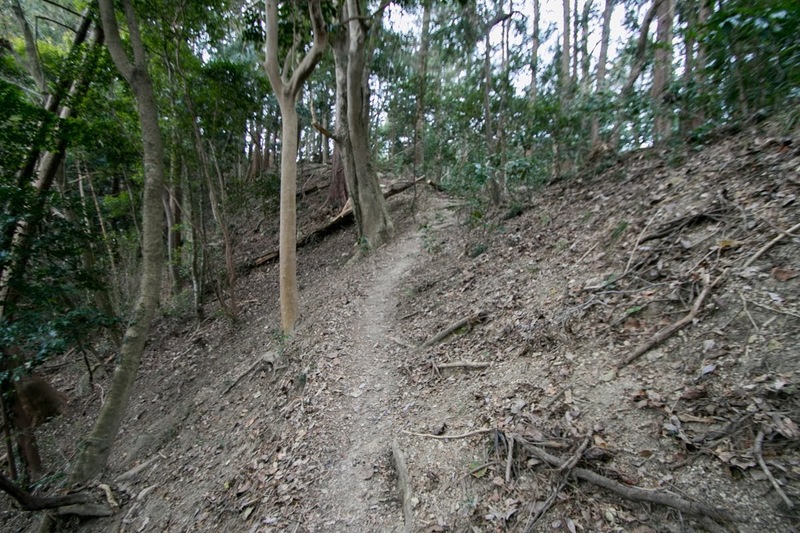 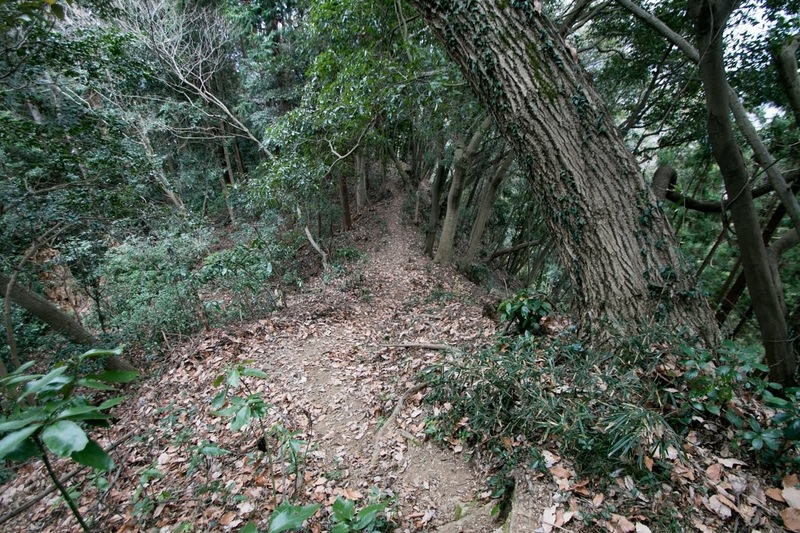 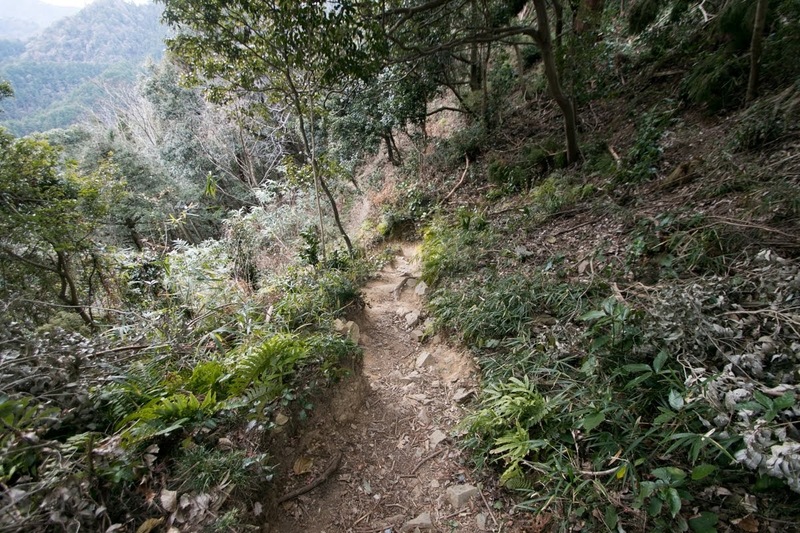 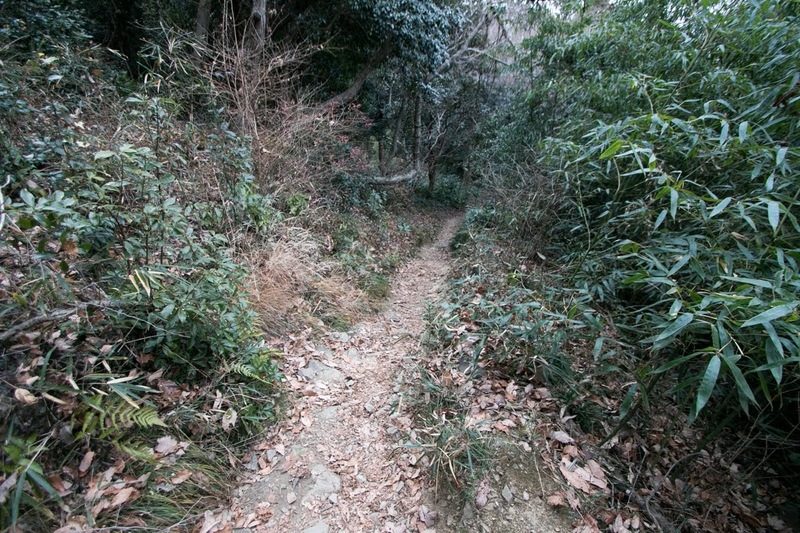 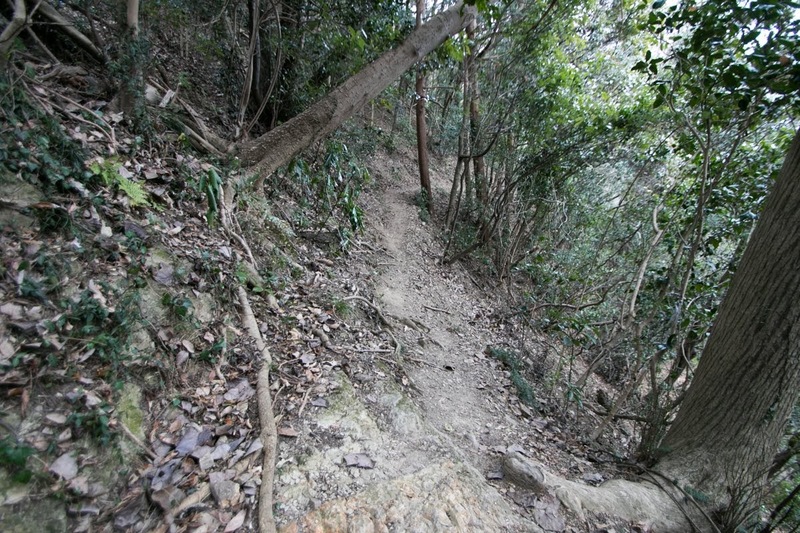 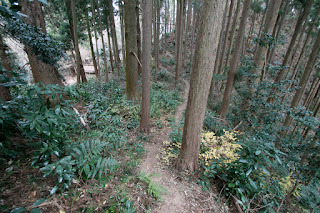 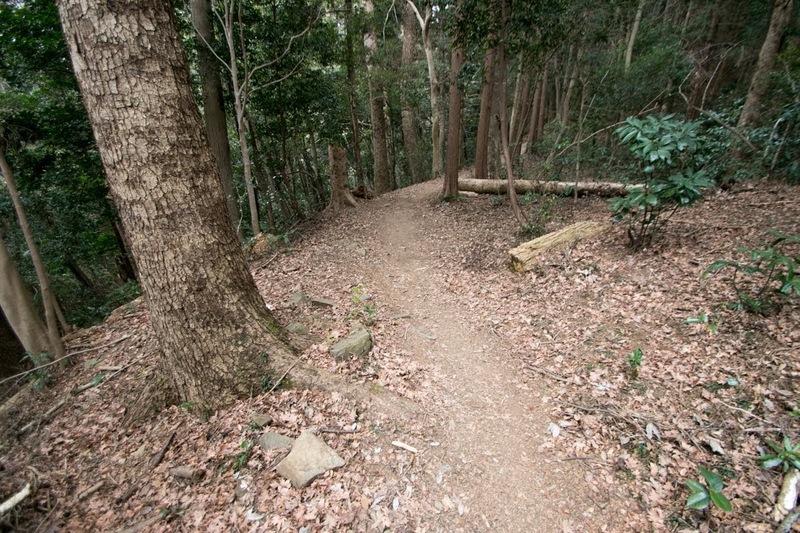 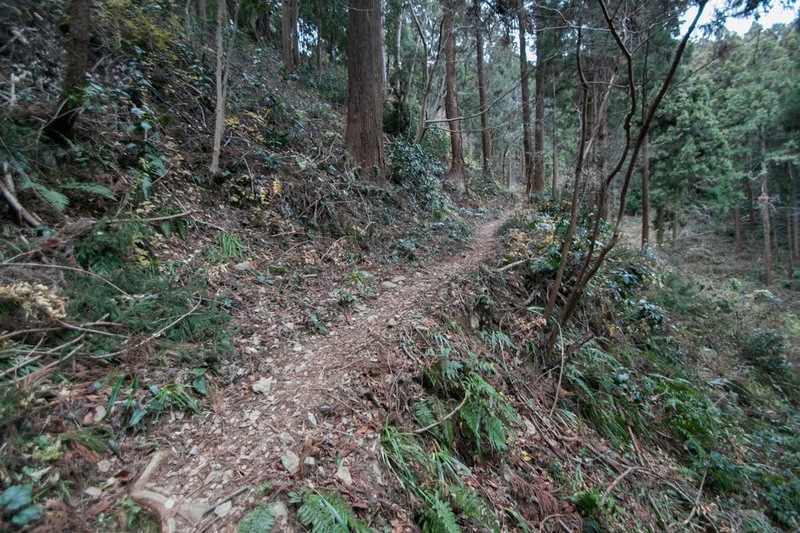 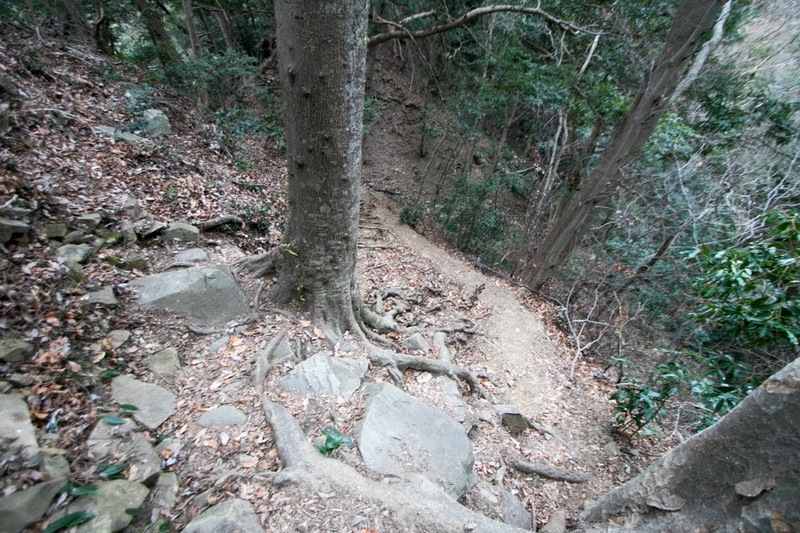 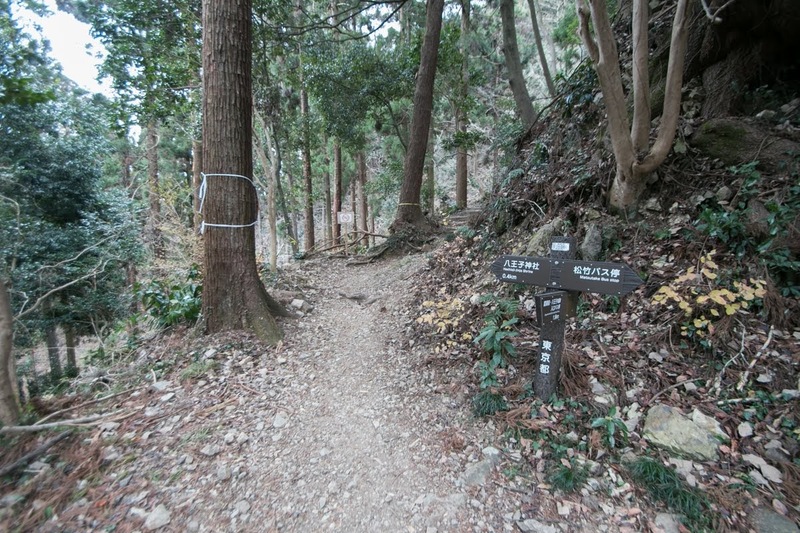 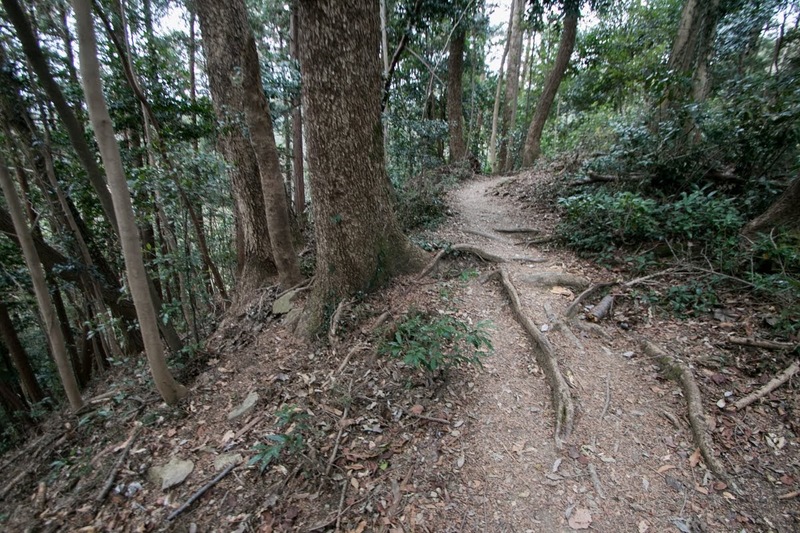 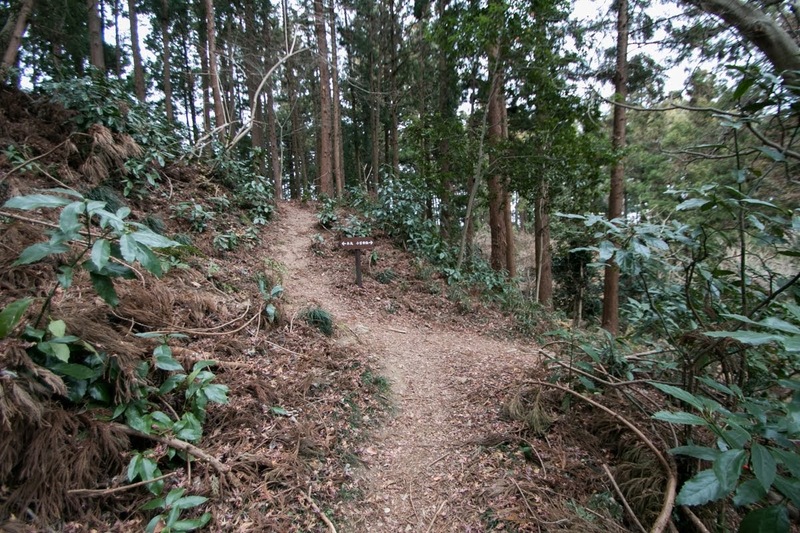 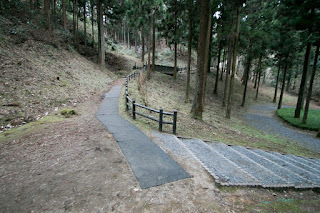 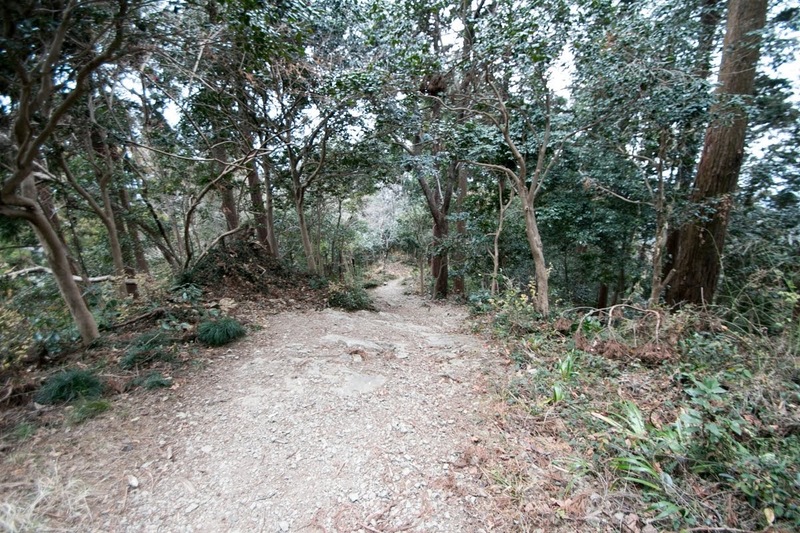 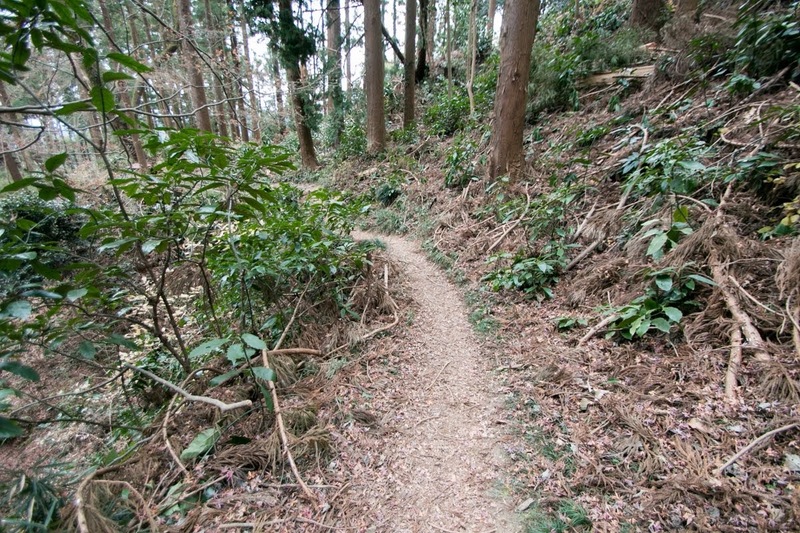 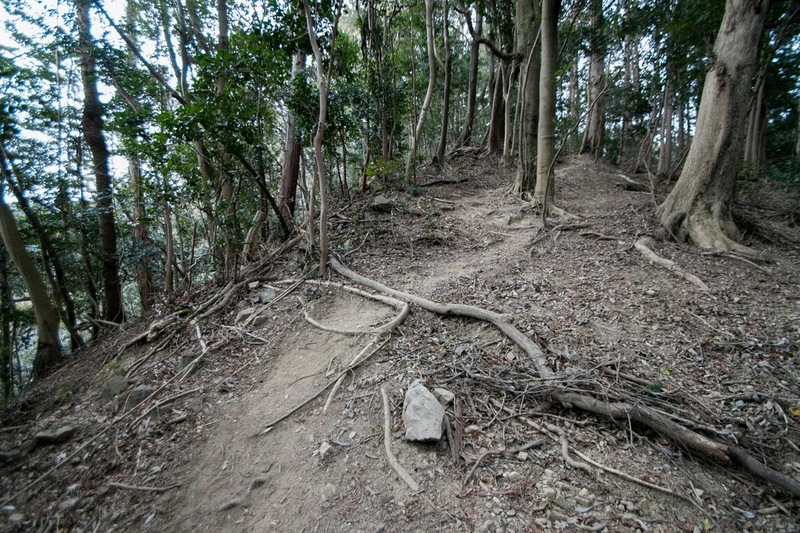 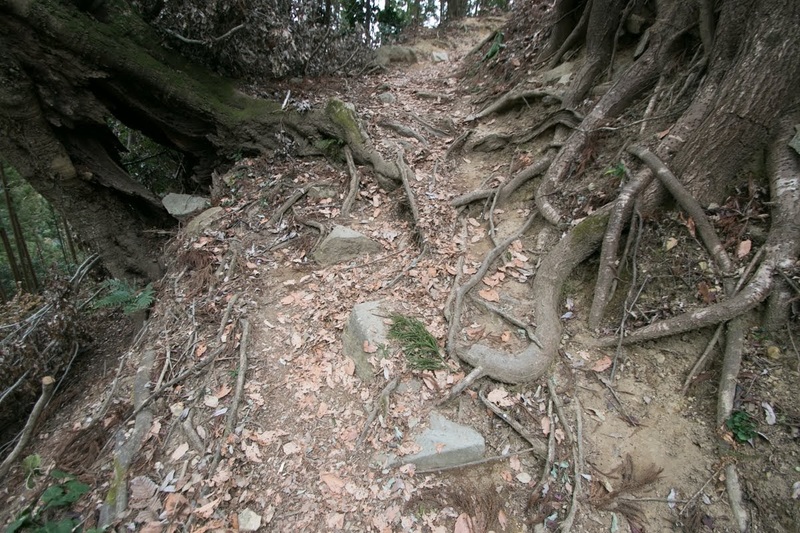 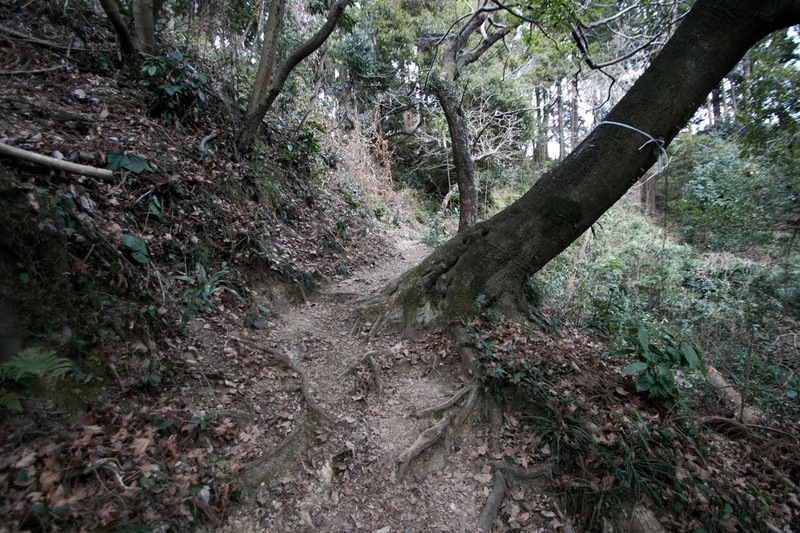 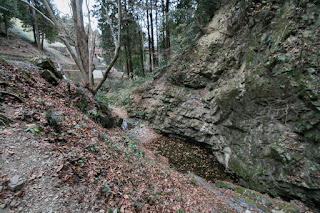 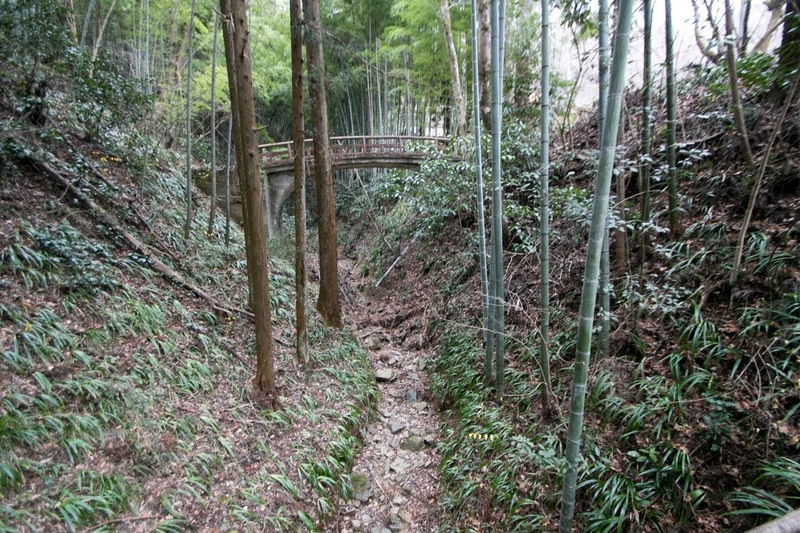 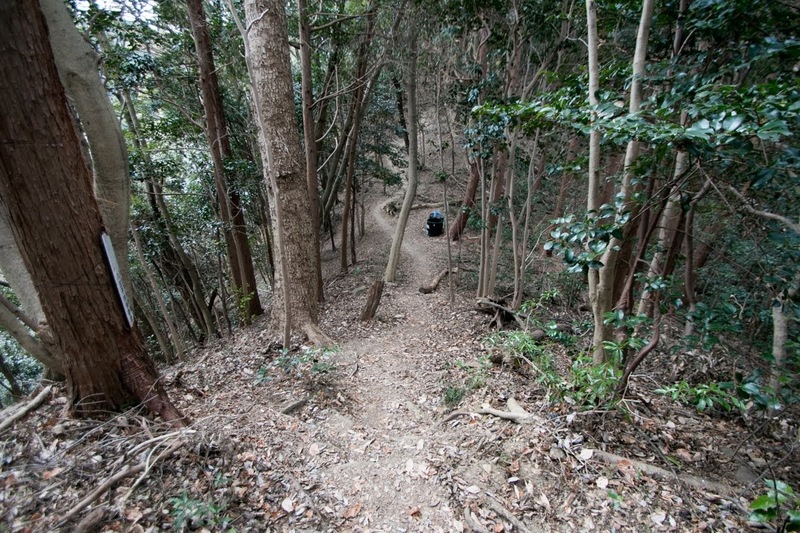 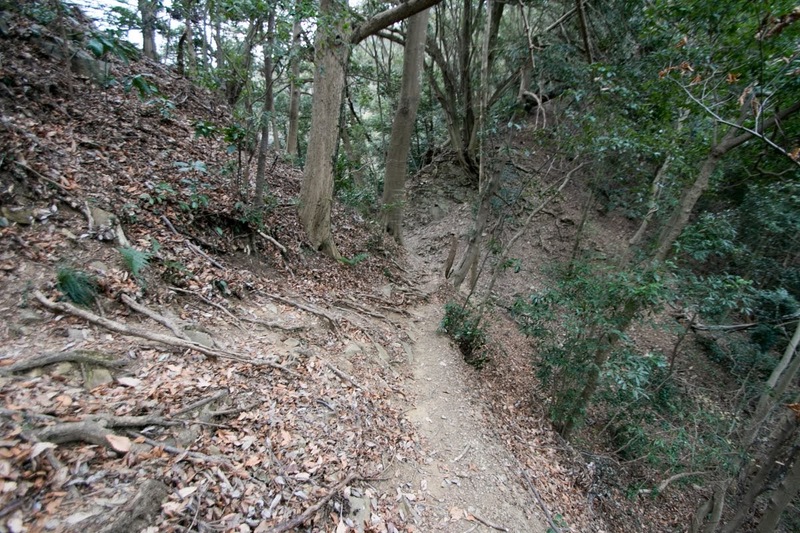 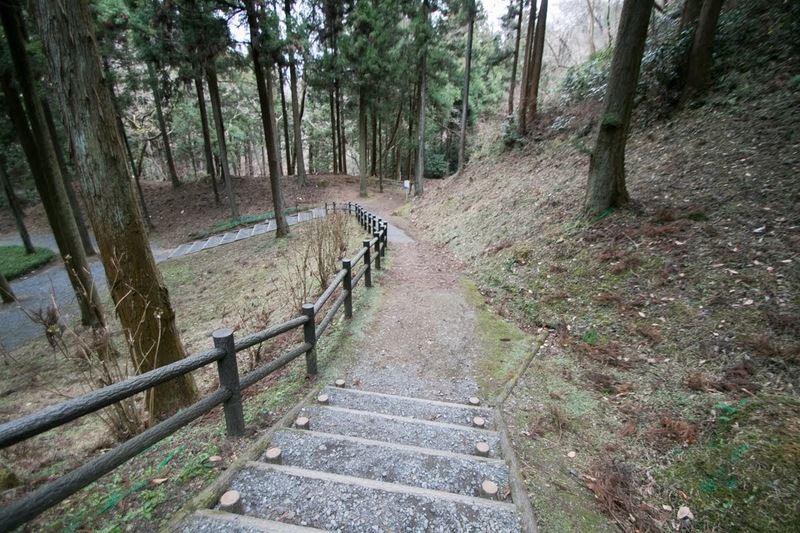 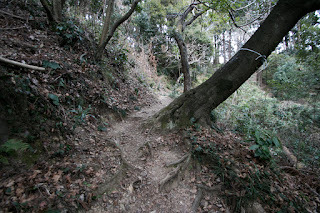 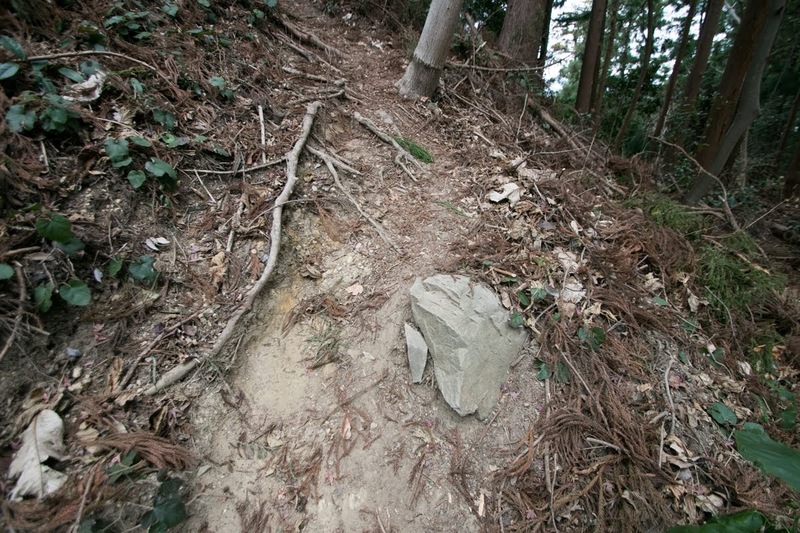 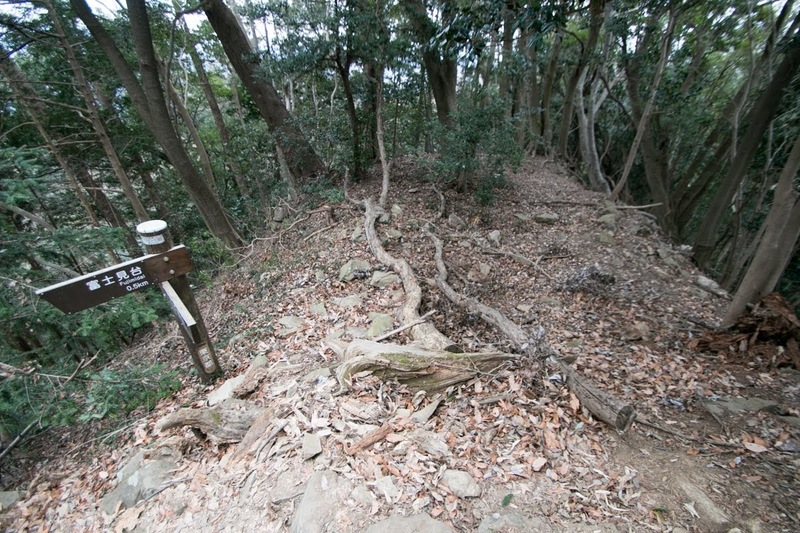 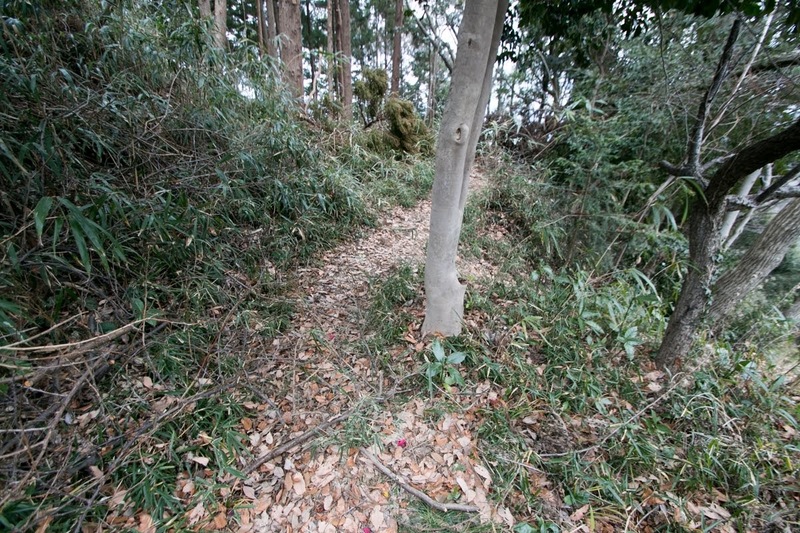 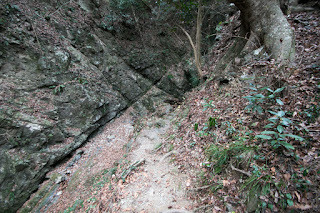 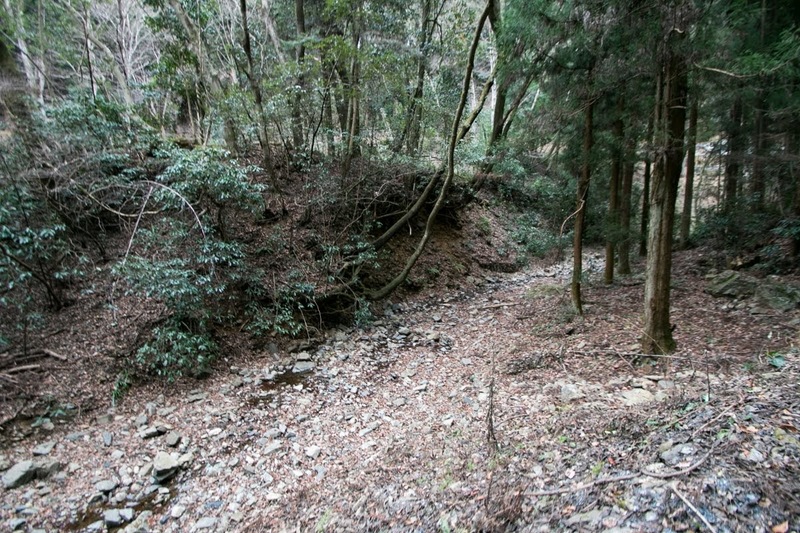 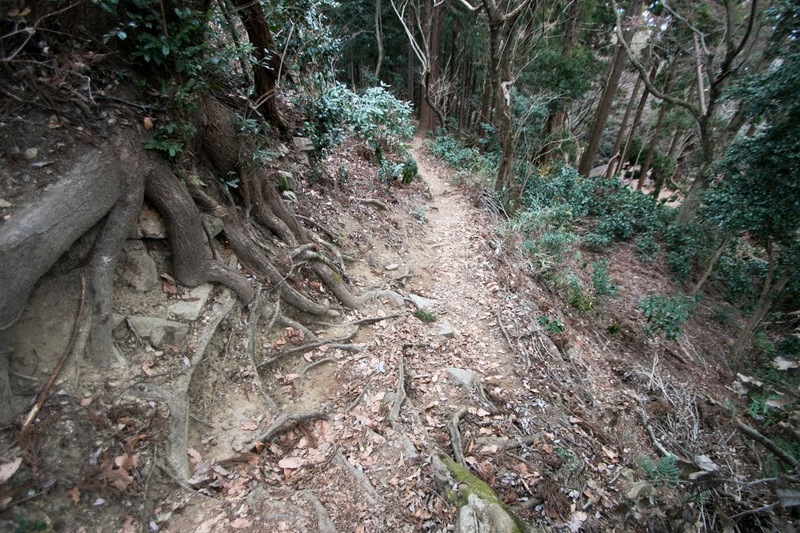 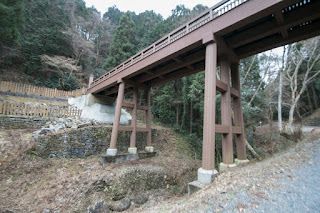 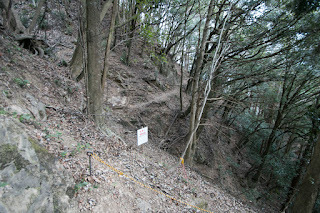 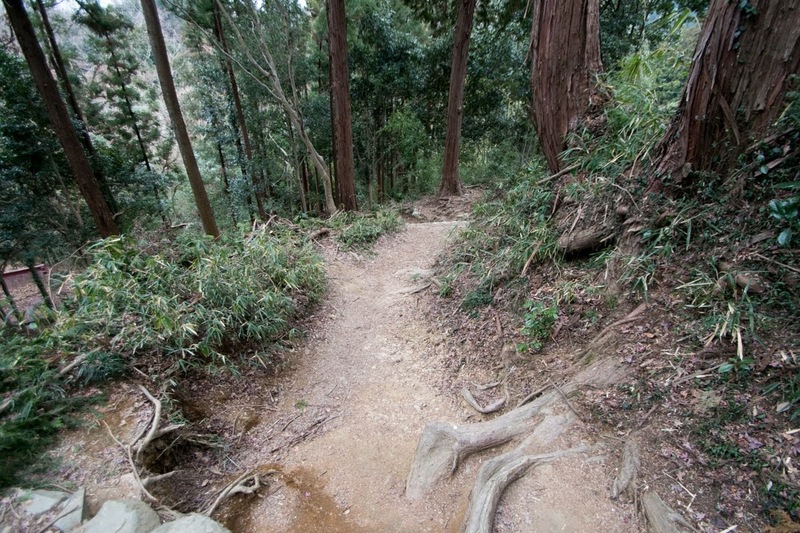 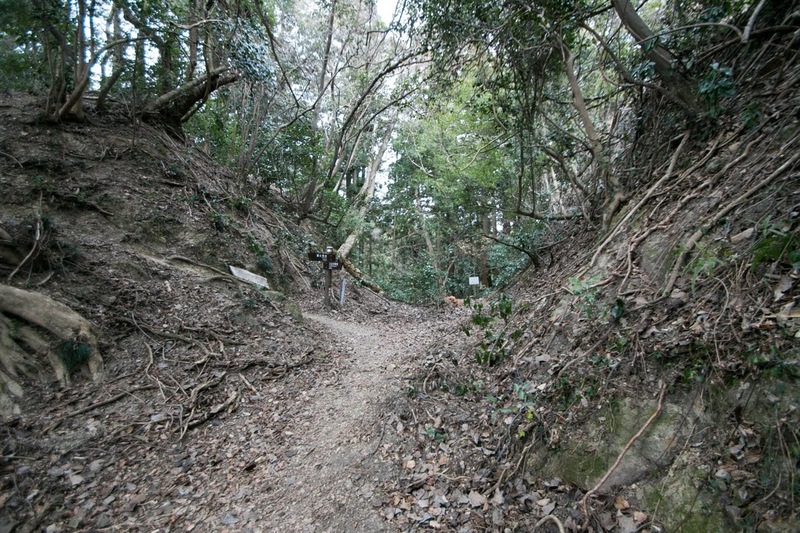 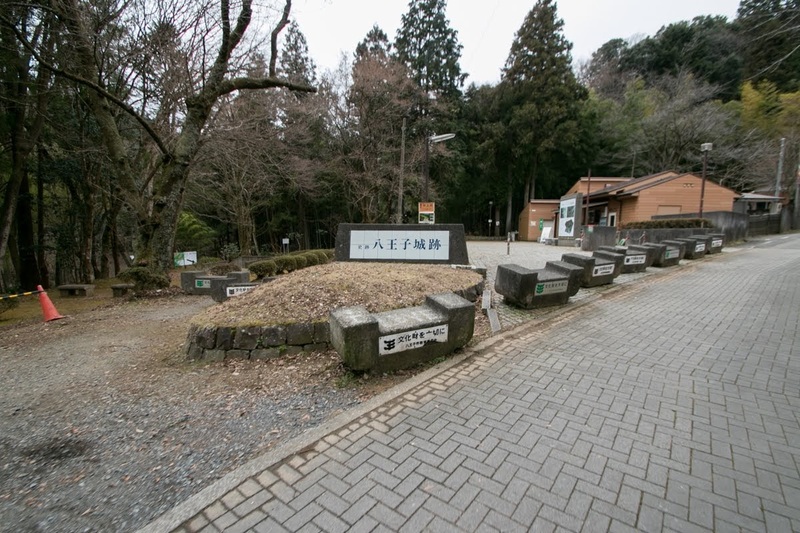 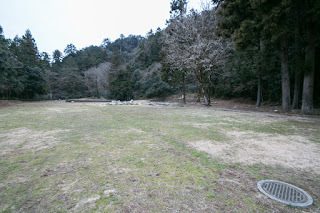 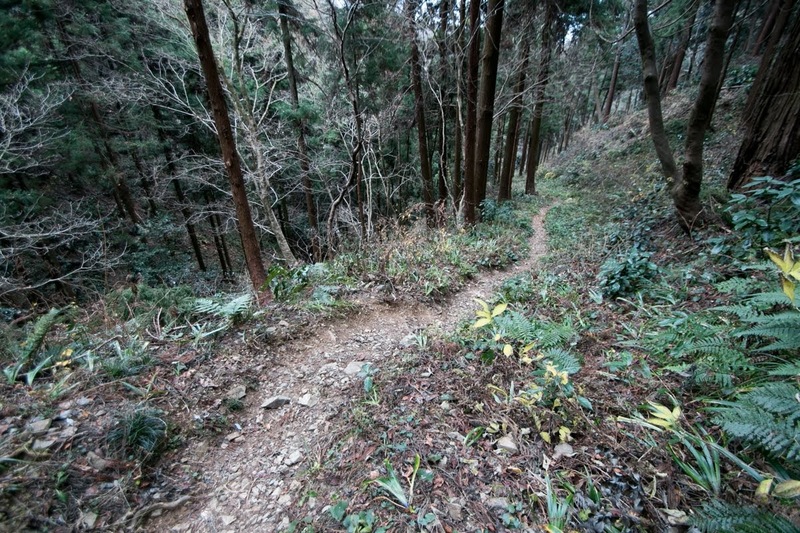 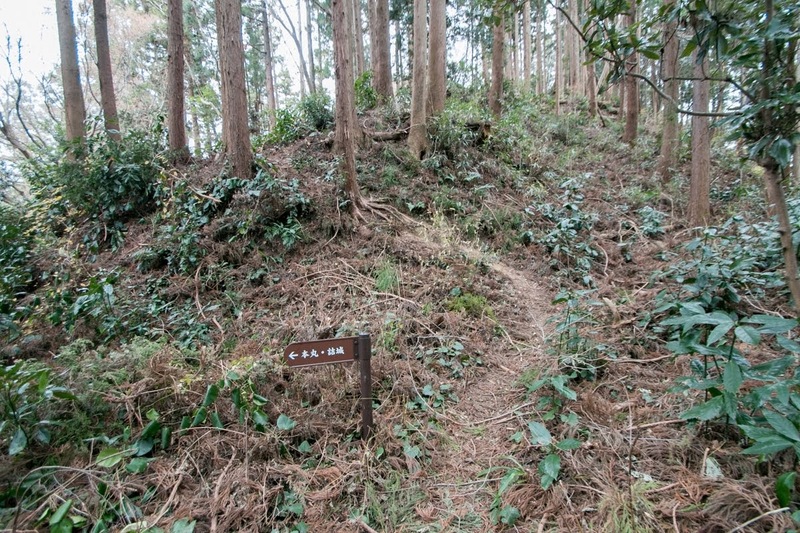 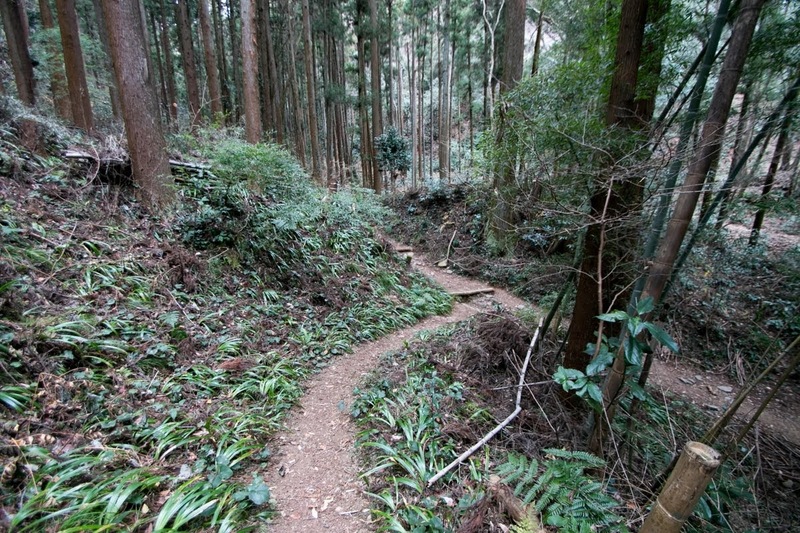 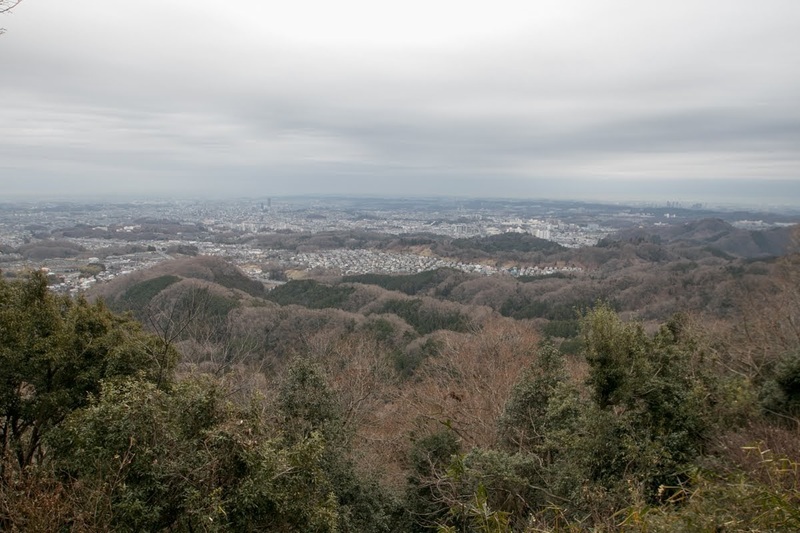 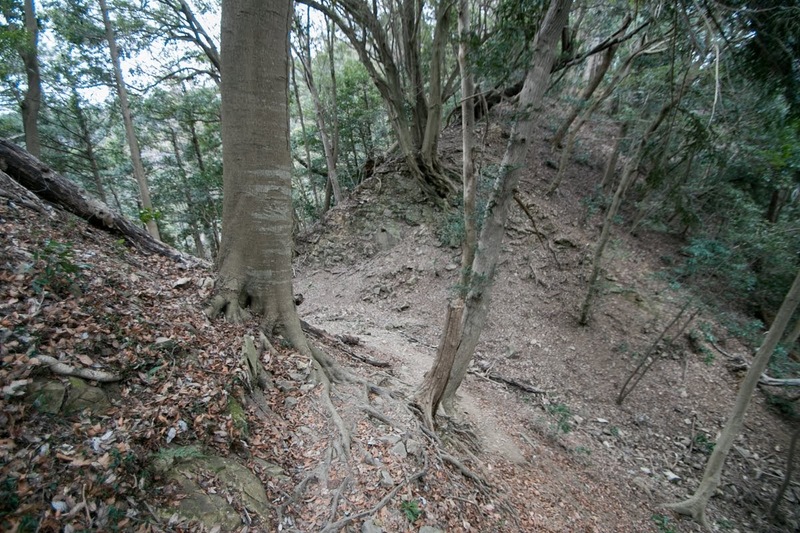 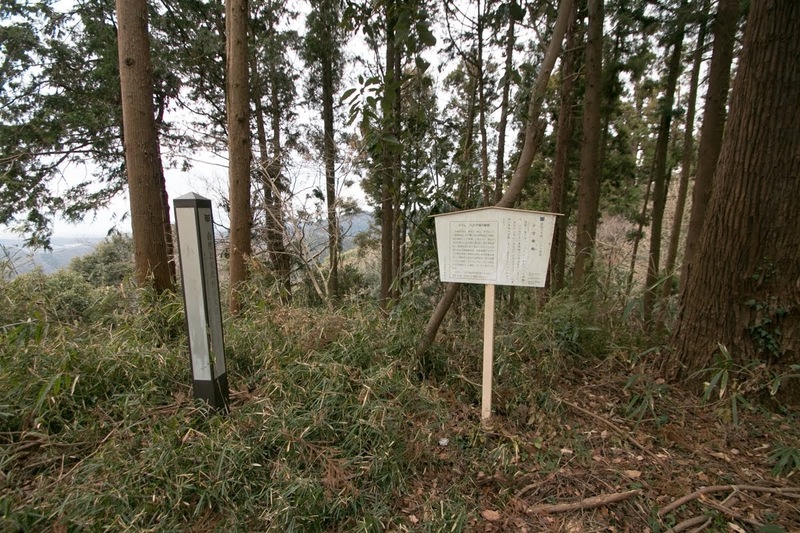 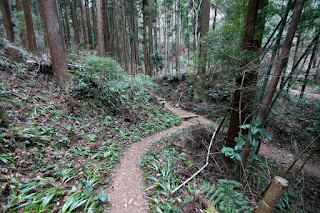 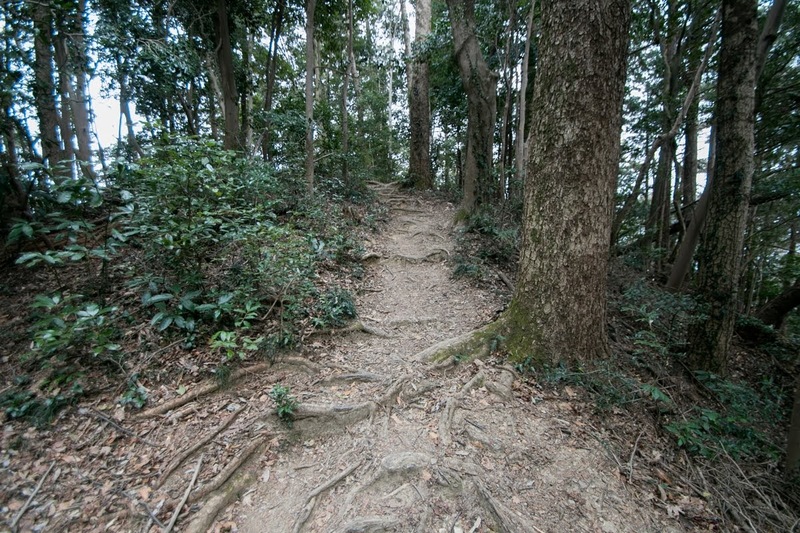 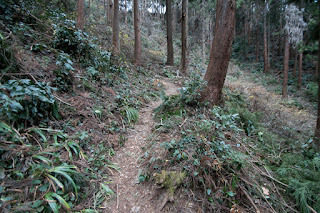 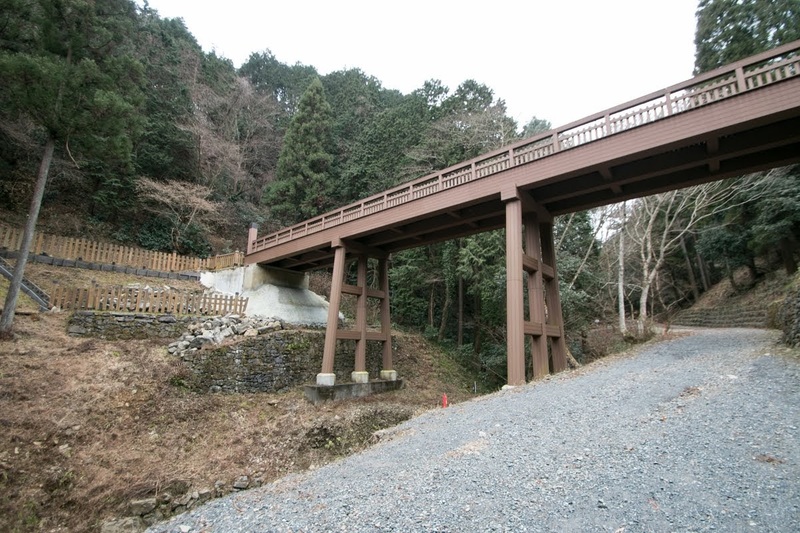 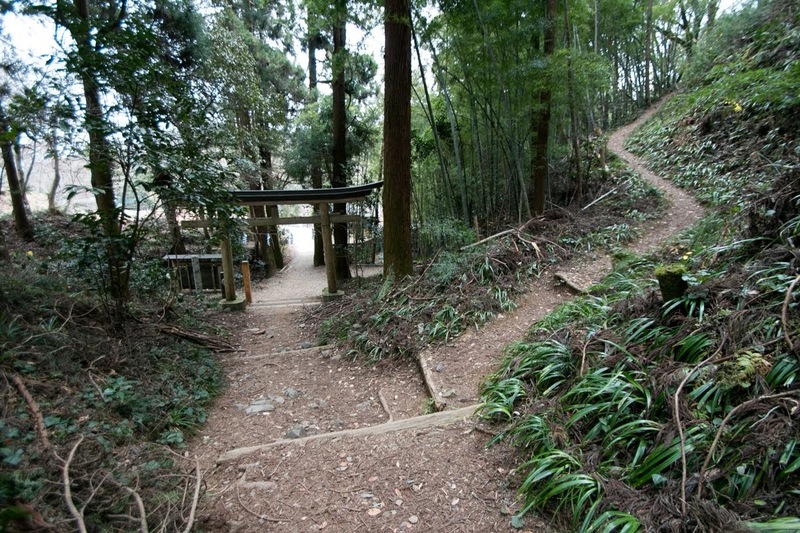 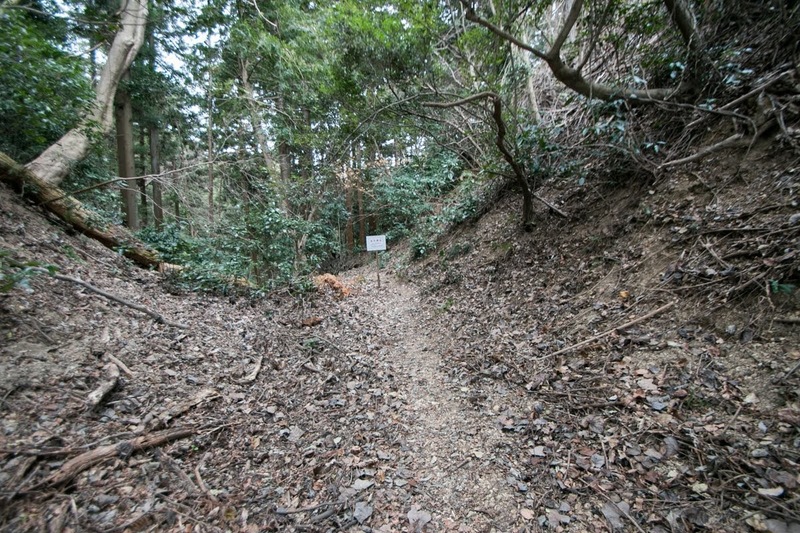 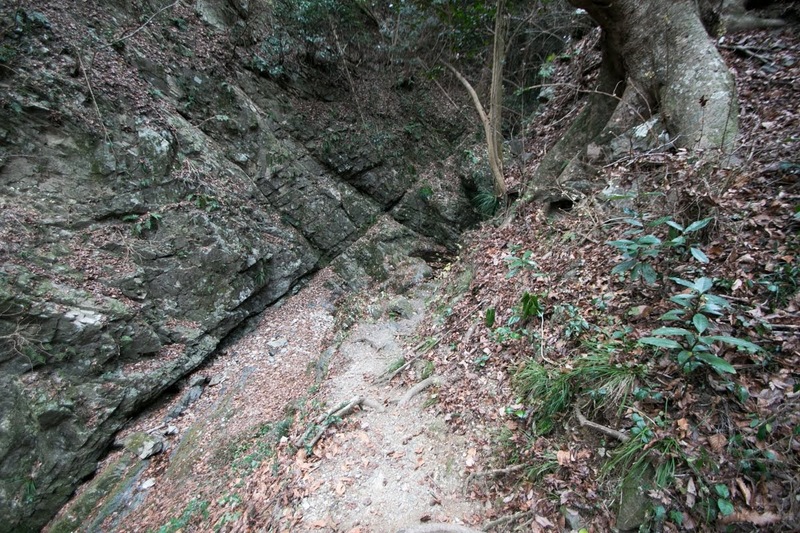 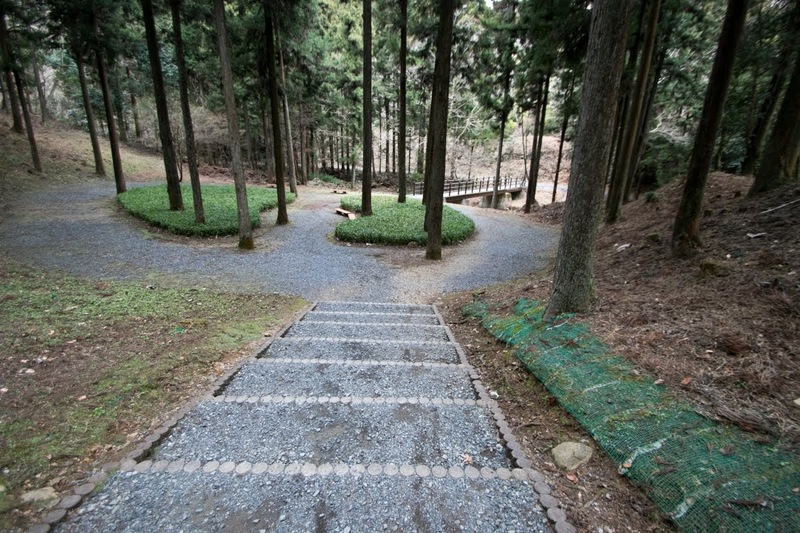 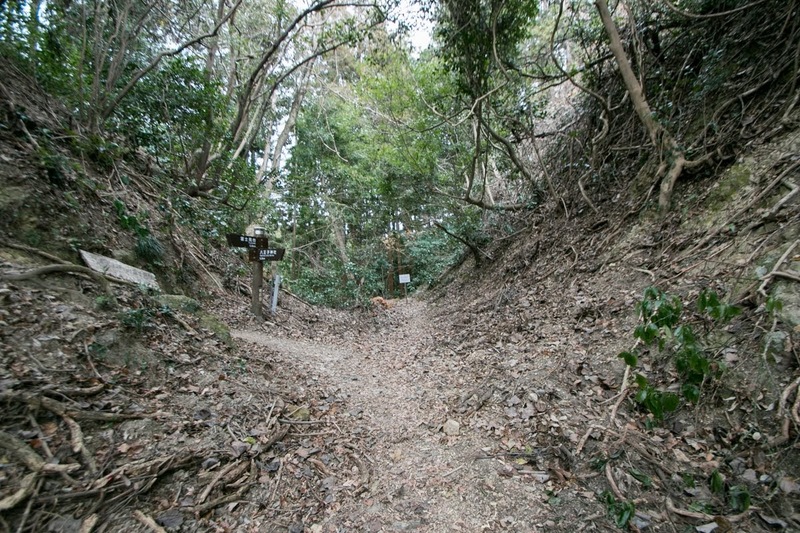 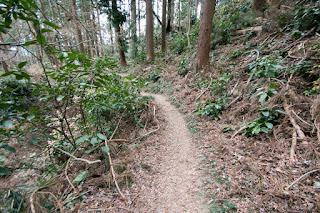 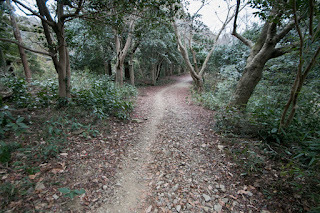 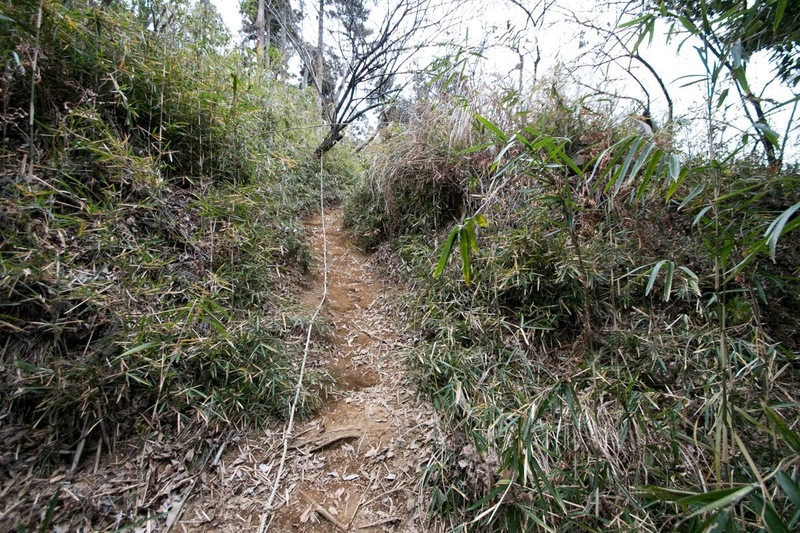 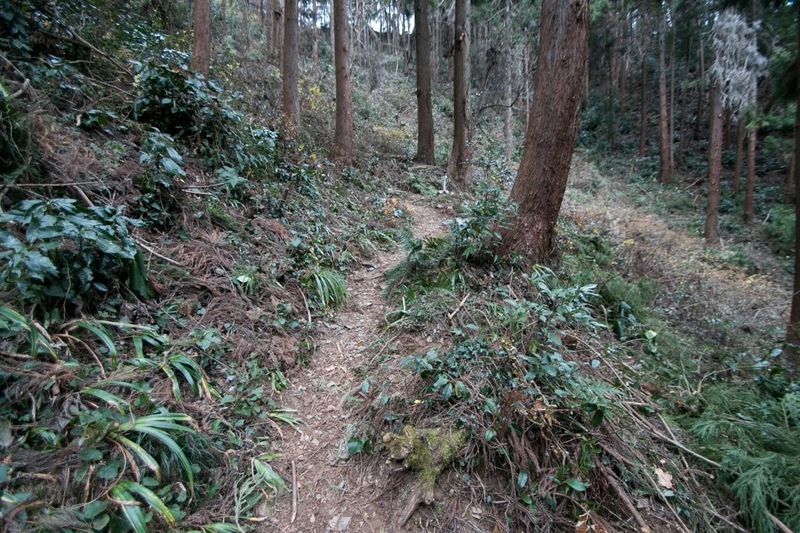 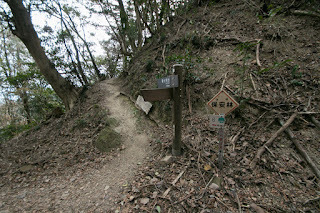 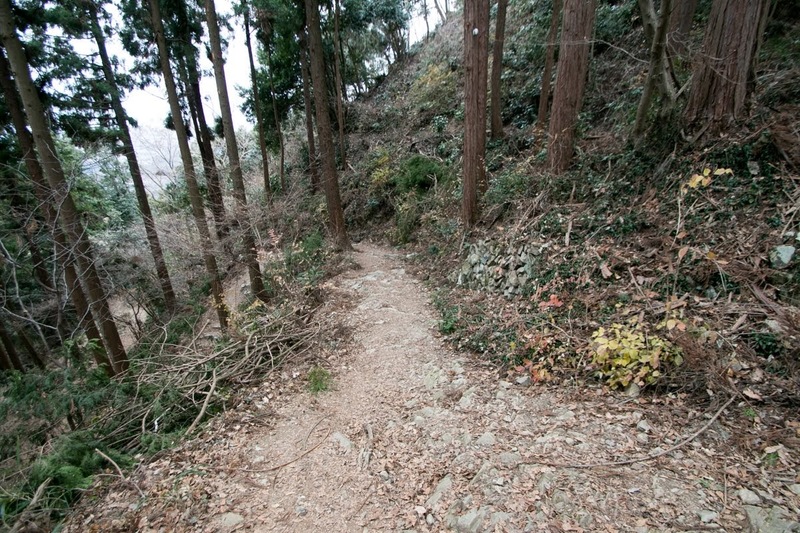 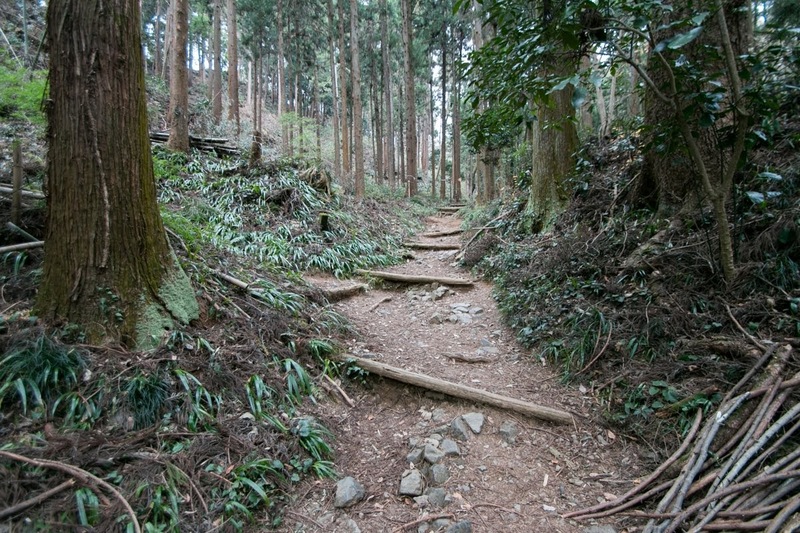 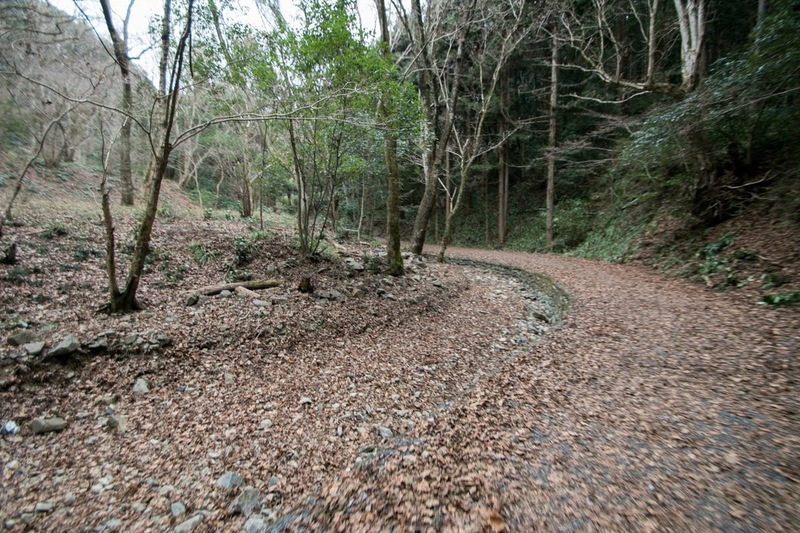 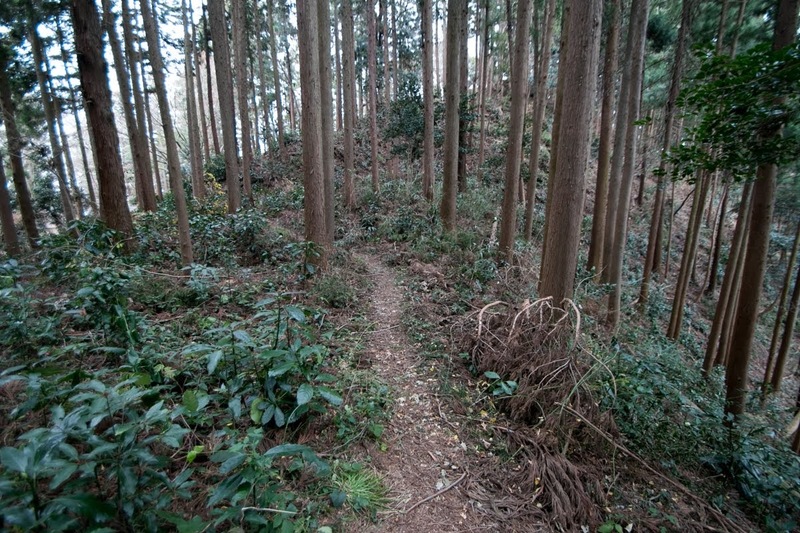 The site of the castle can control both main route (Kobotoke pass) and sub route (Ange pass) from Kai province (Yamanashi prefecture) to Musashi province (Tokyo metropolis). Hachioji Castle was built by Ujiteru Hojo (1540-1590), younger brother of fourth leader Ujimasa Hojo (1538-1590) and current military leader of Hojo clan. 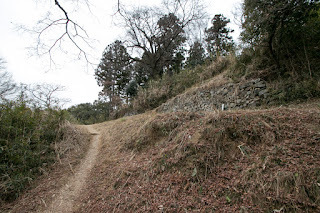 Originally Ujiteru resided Takiyama castle, a castle beside Tamagawa river about 15 kilometer north of this castle. 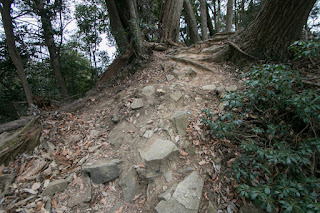 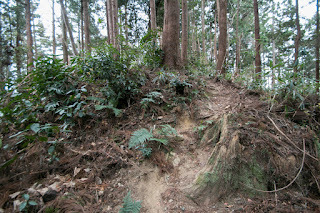 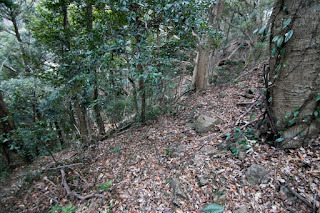 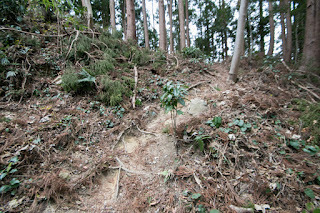 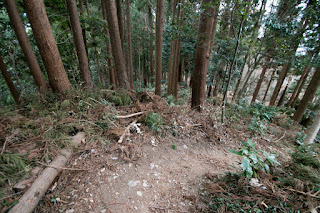 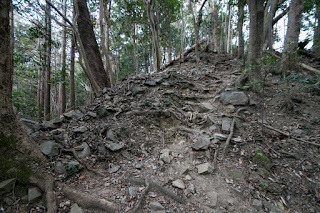 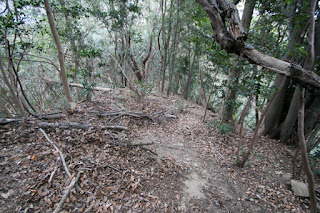 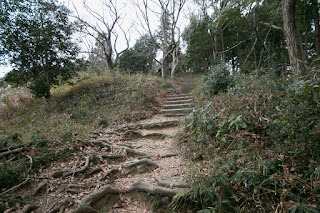 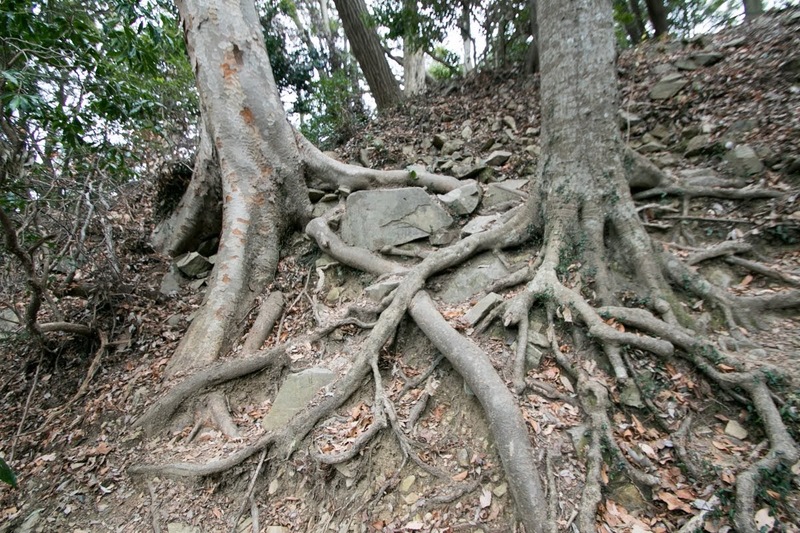 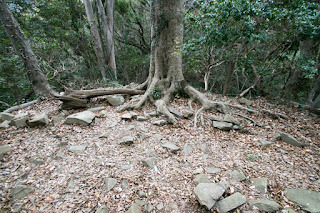 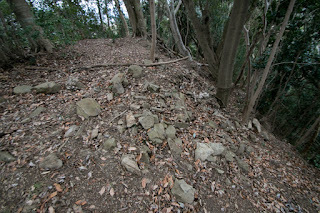 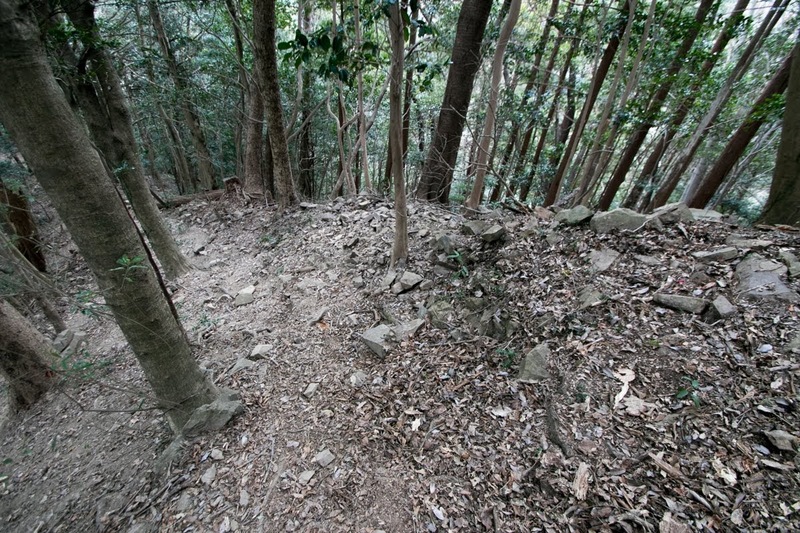 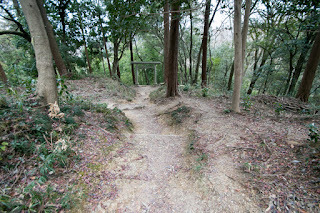 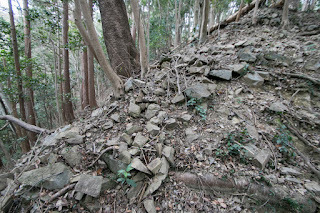 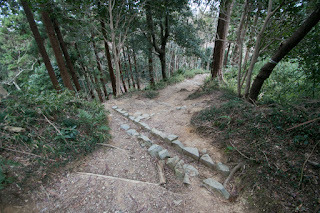 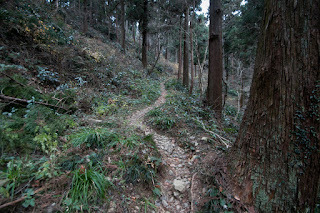 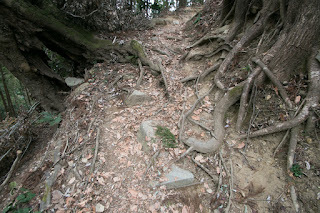 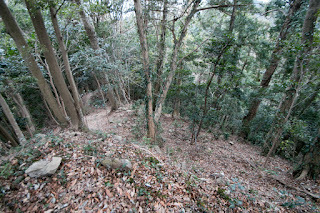 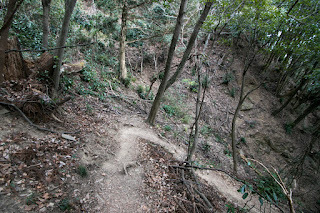 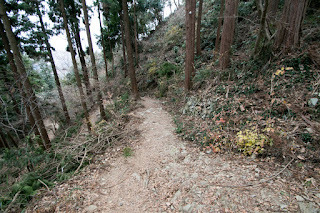 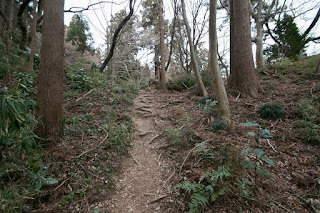 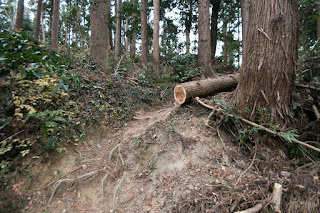 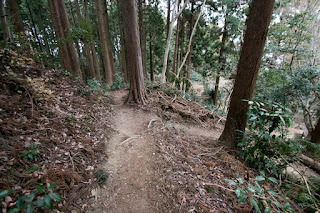 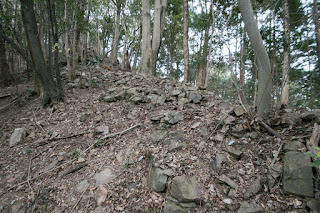 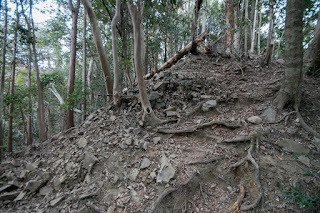 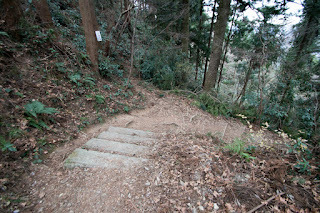 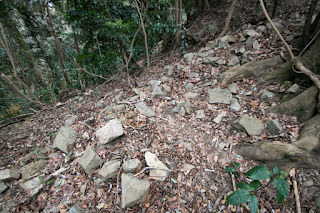 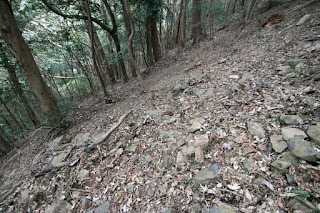 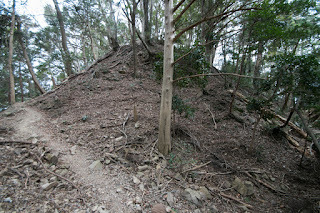 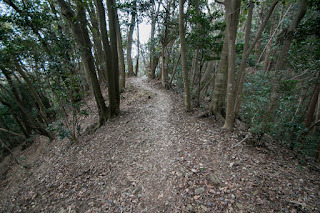 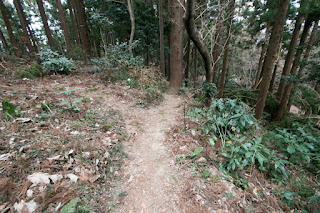 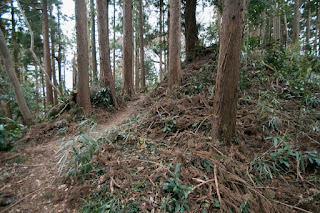 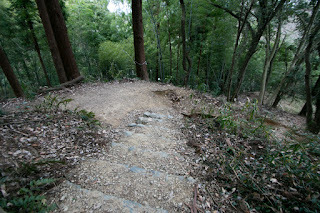 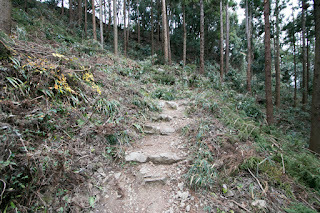 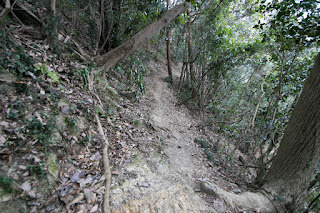 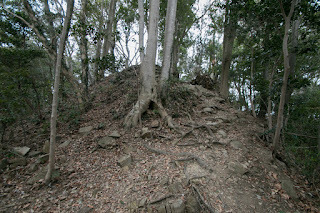 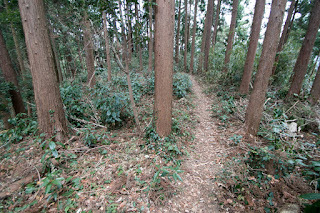 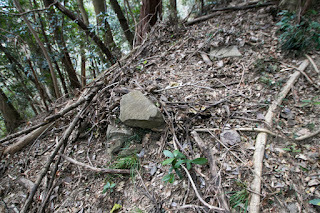 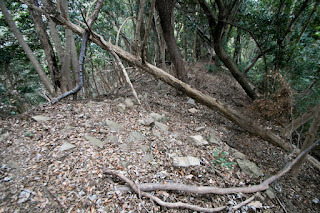 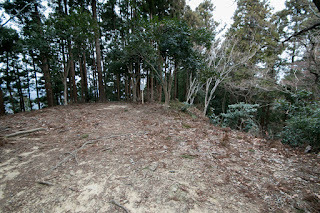 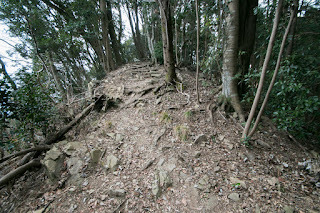 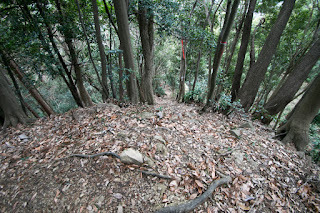 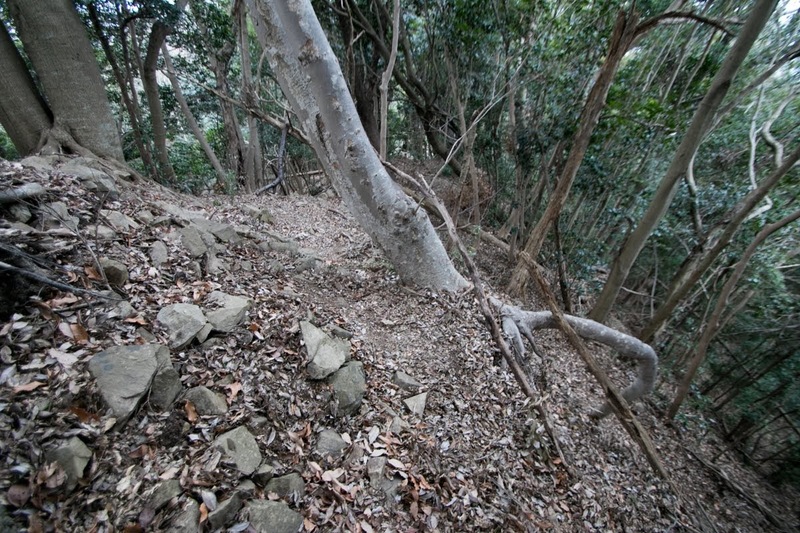 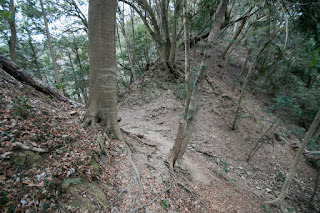 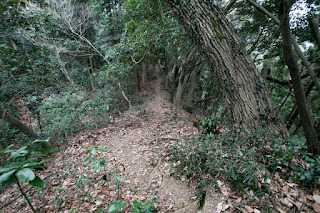 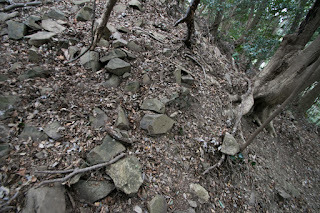 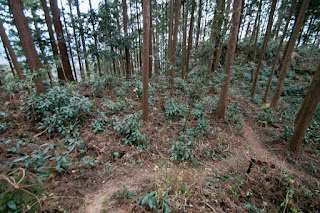 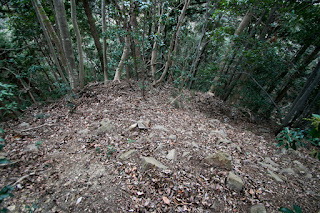 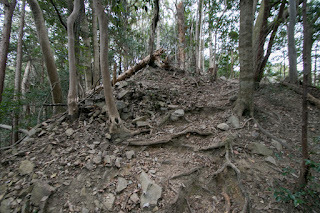 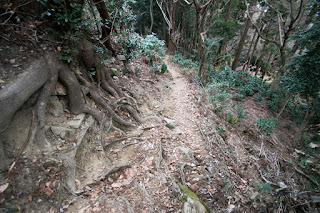 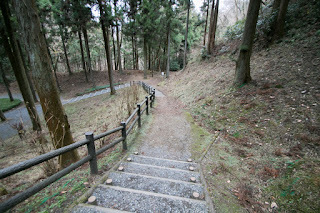 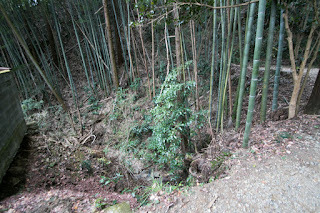 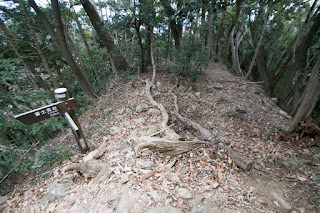 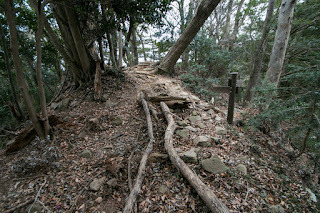 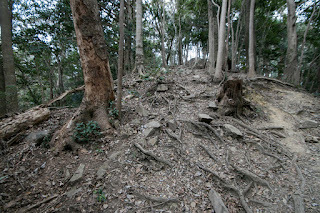 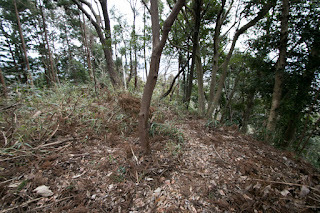 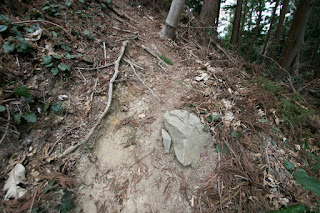 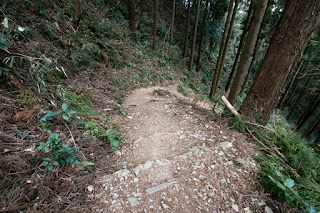 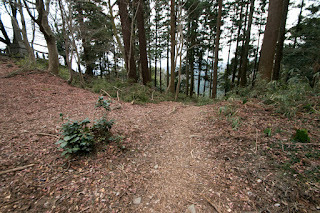 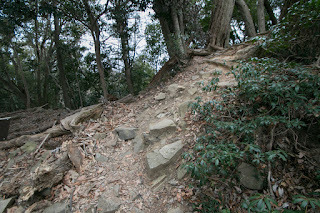 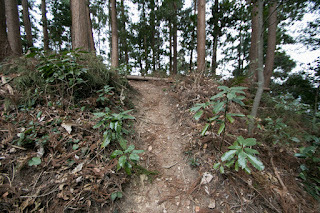 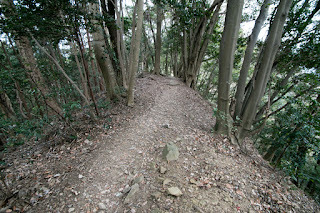 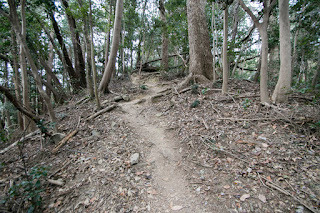 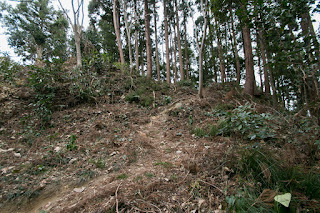 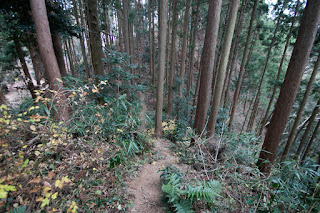 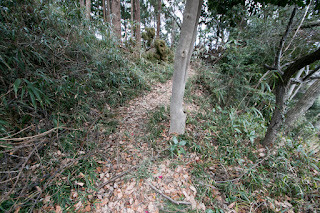 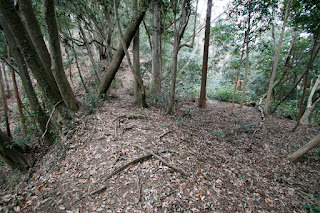 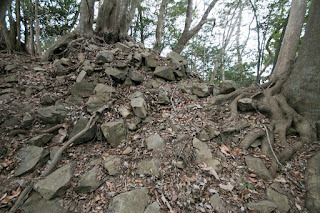 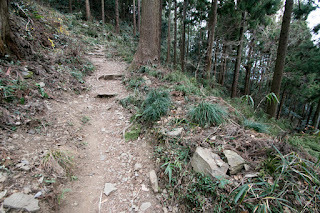 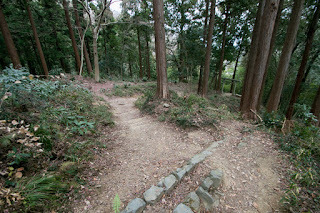 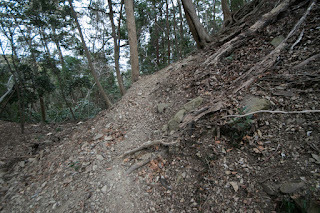 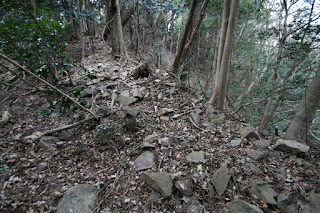 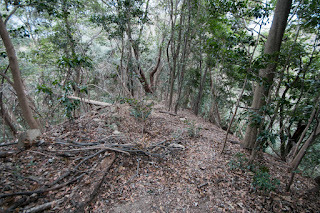 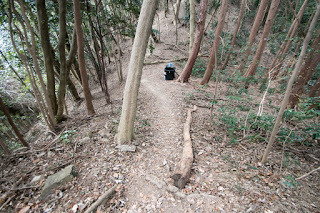 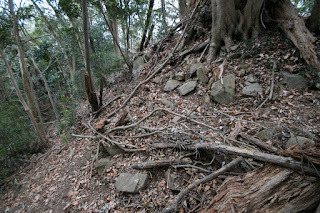 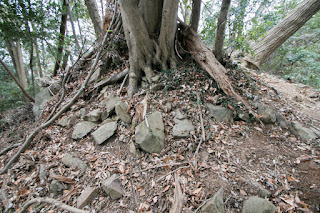 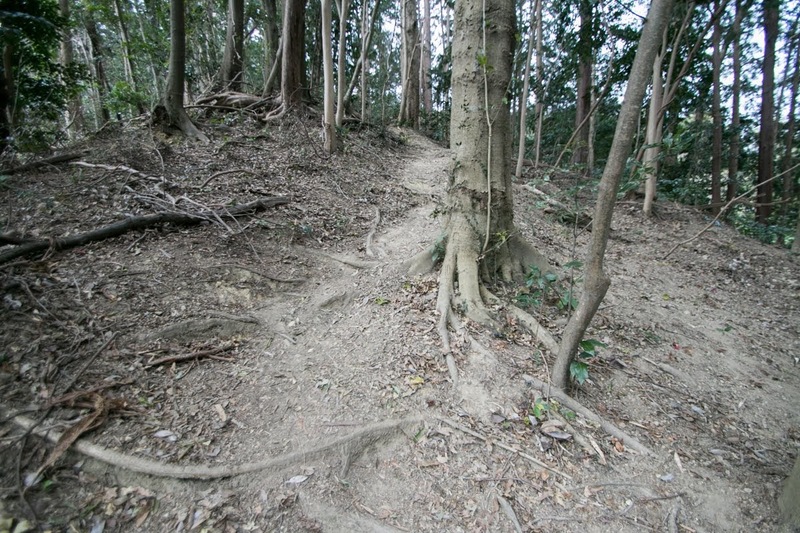 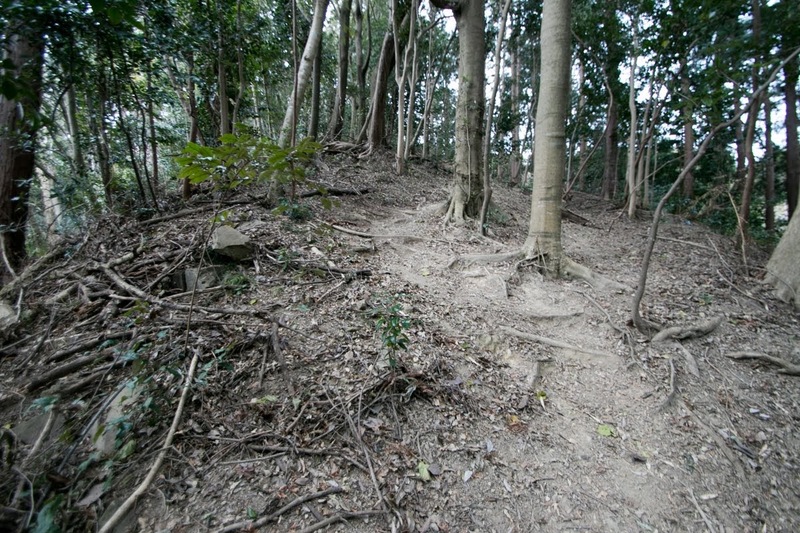 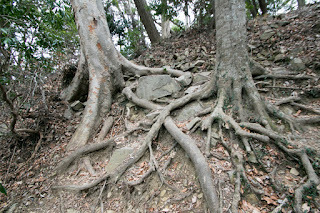 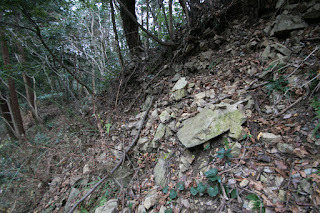 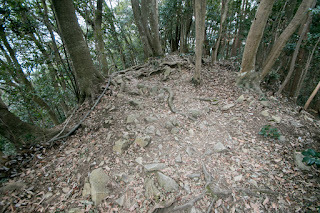 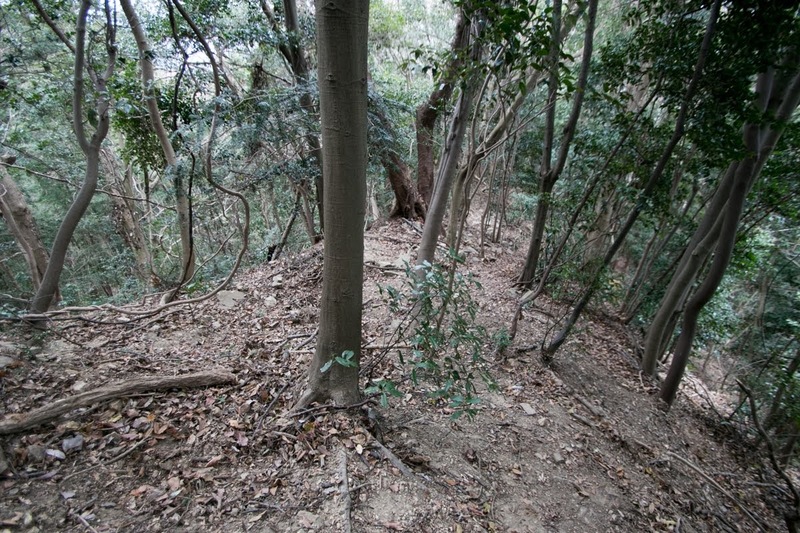 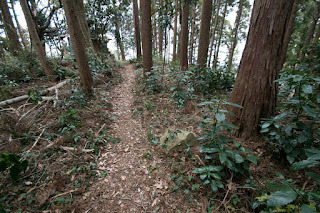 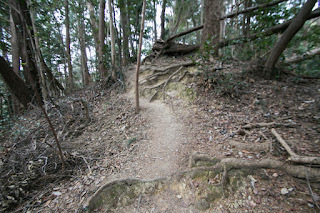 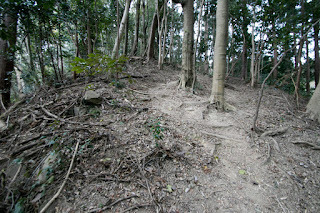 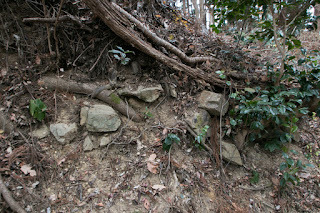 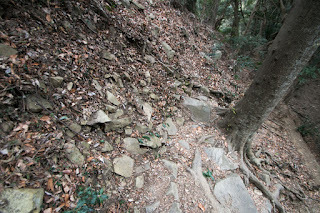 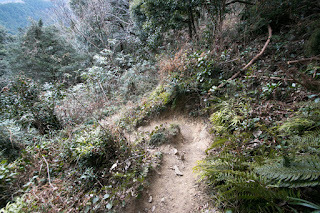 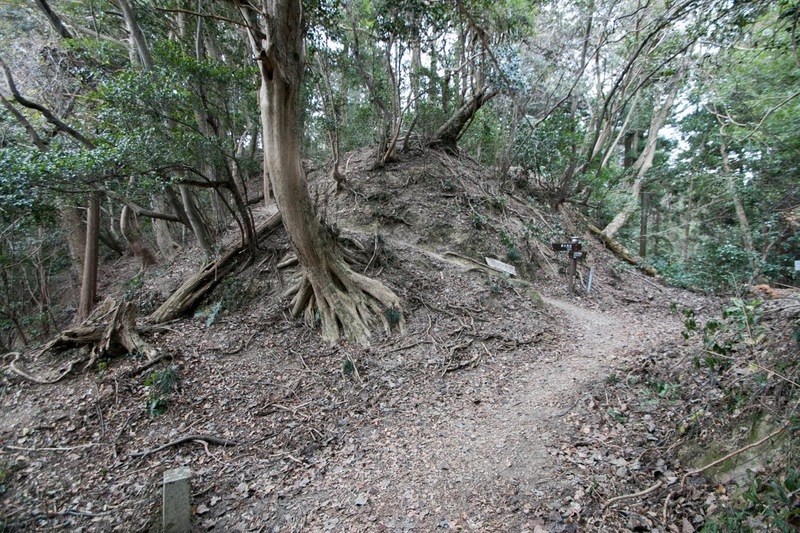 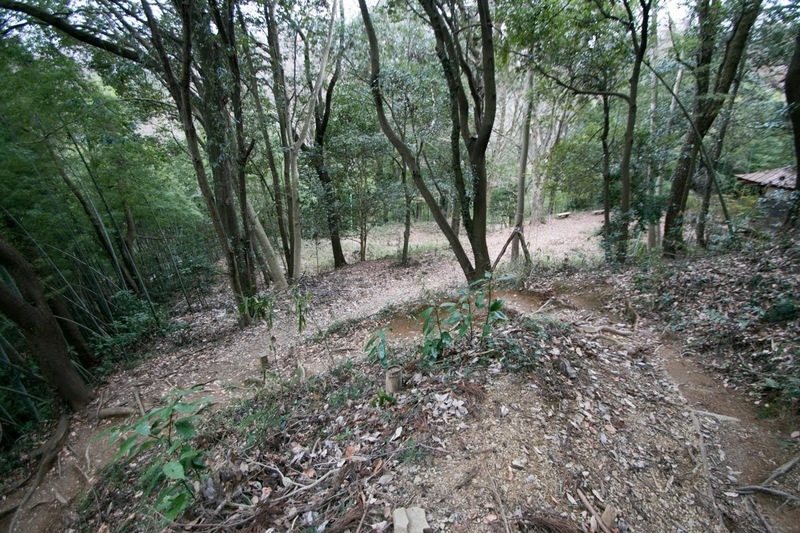 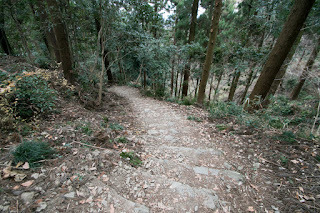 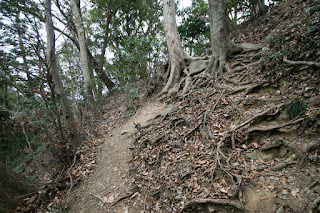 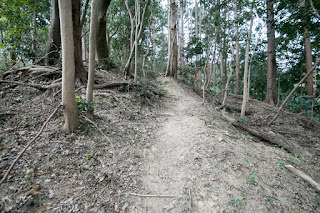 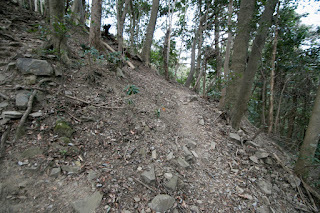 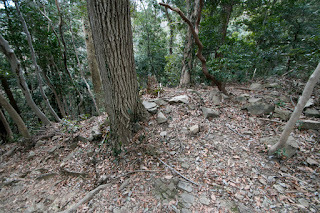 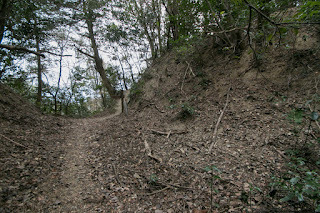 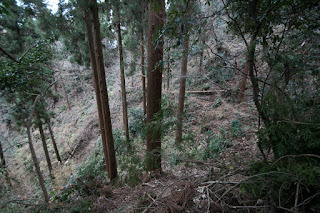 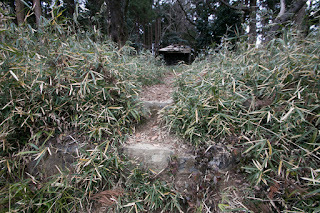 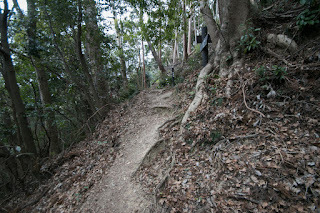 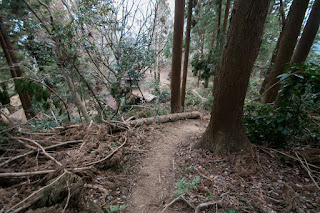 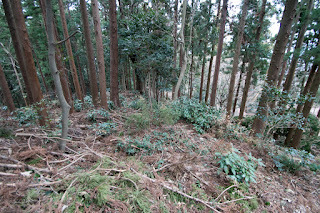 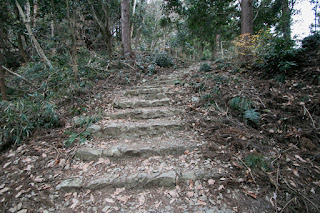 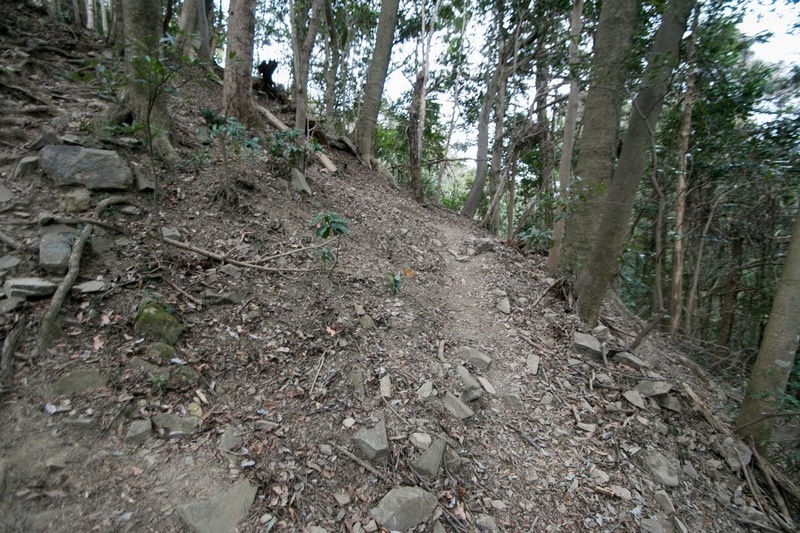 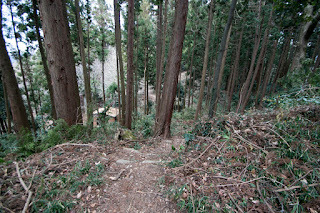 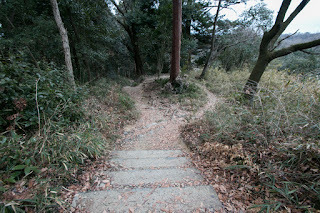 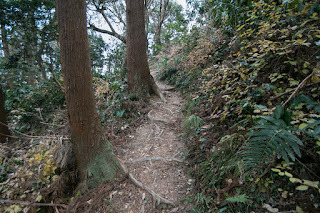 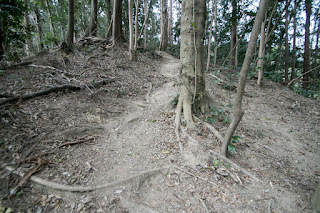 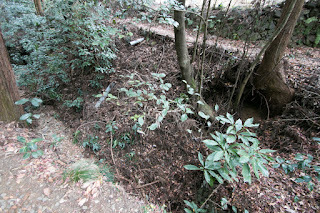 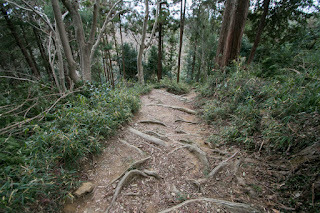 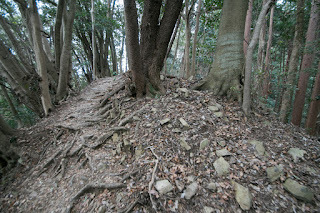 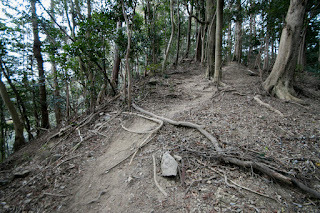 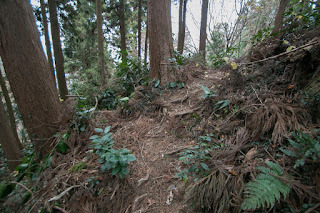 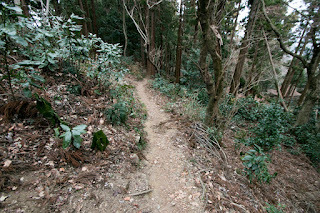 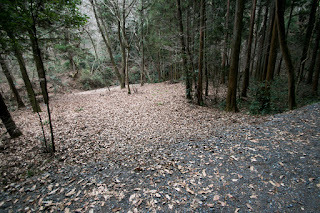 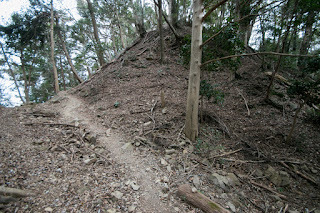 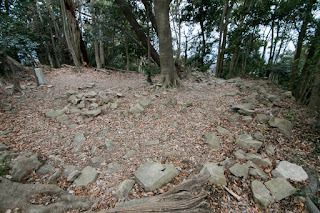 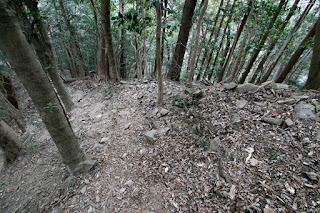 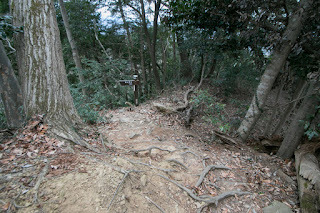 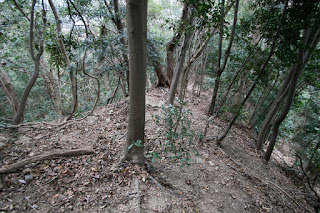 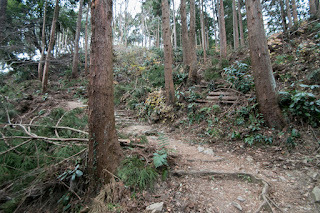 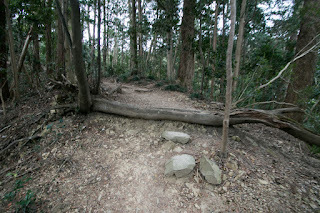 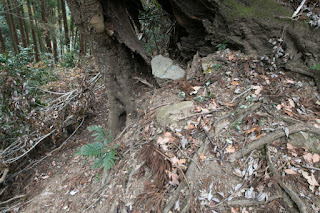 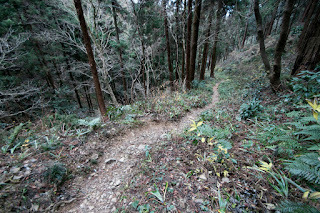 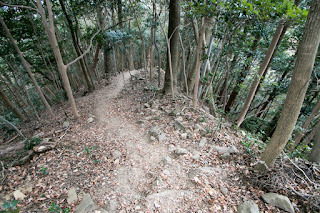 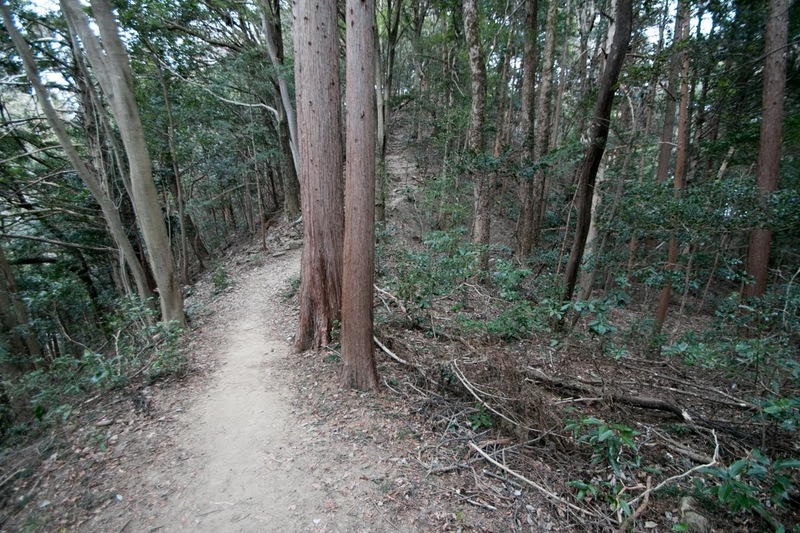 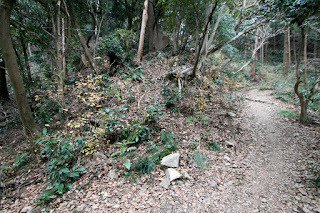 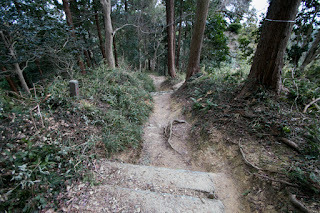 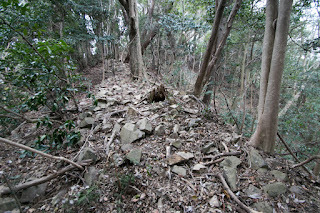 Takiyama castle was a large castle but built on loose slope, it allowed enemy to approach the edge of the castle easily. 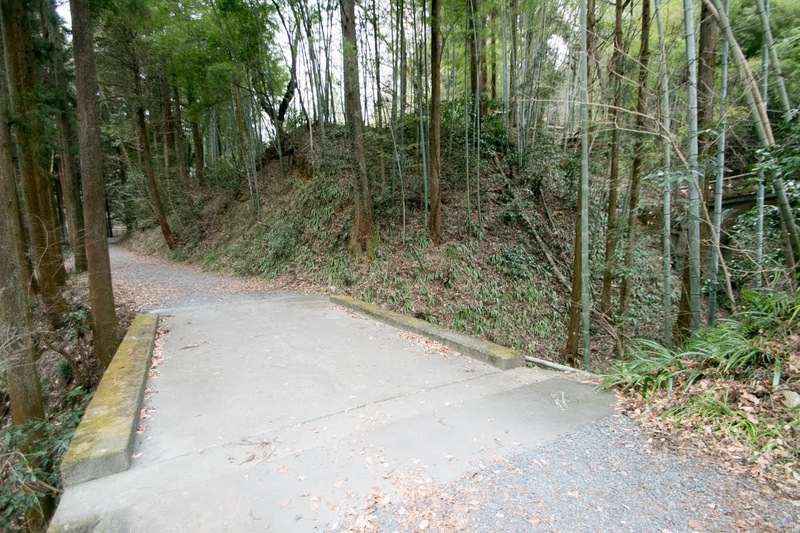 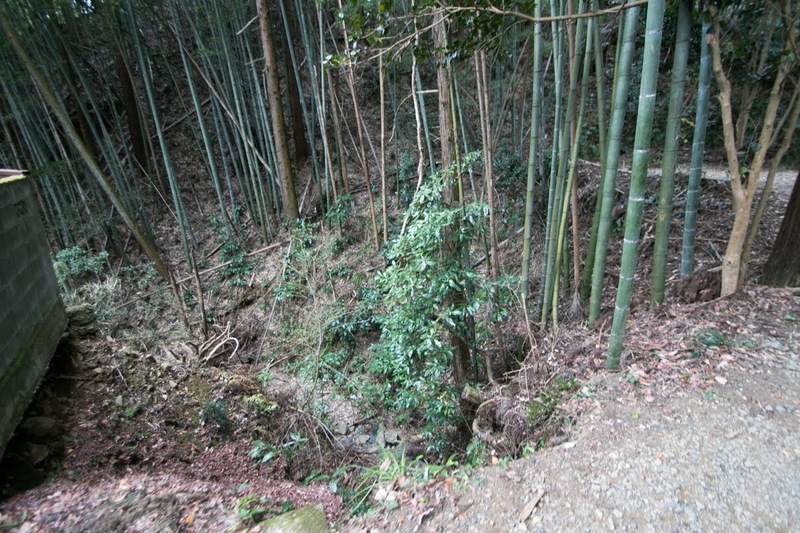 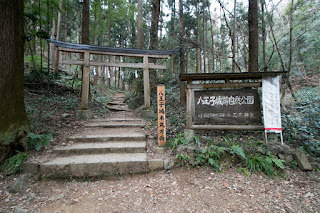 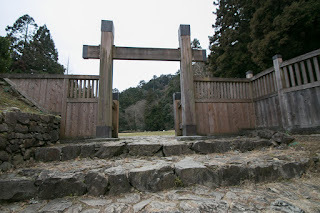 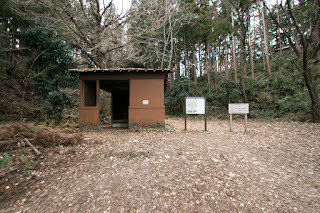 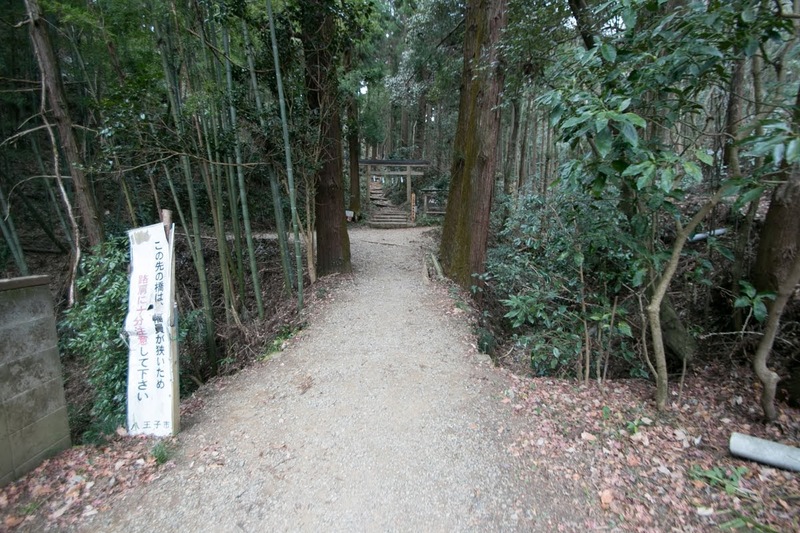 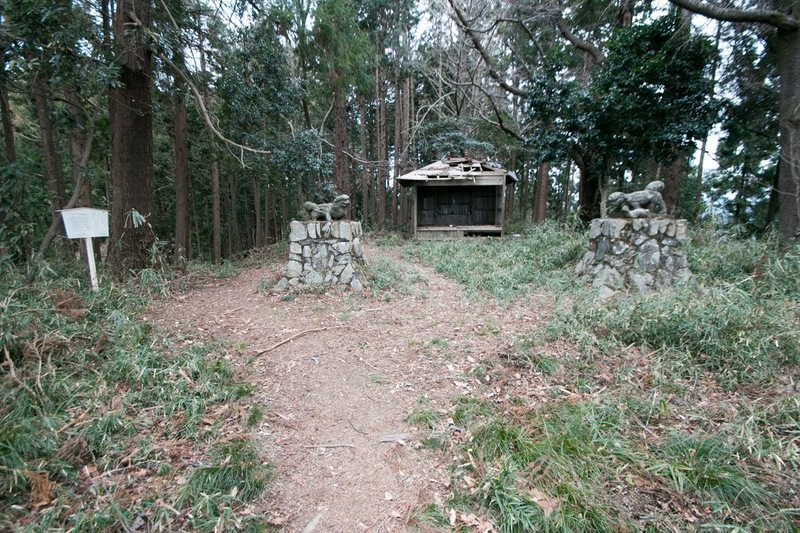 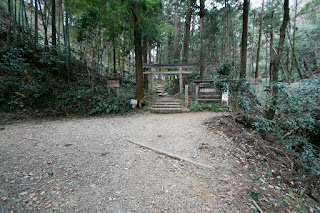 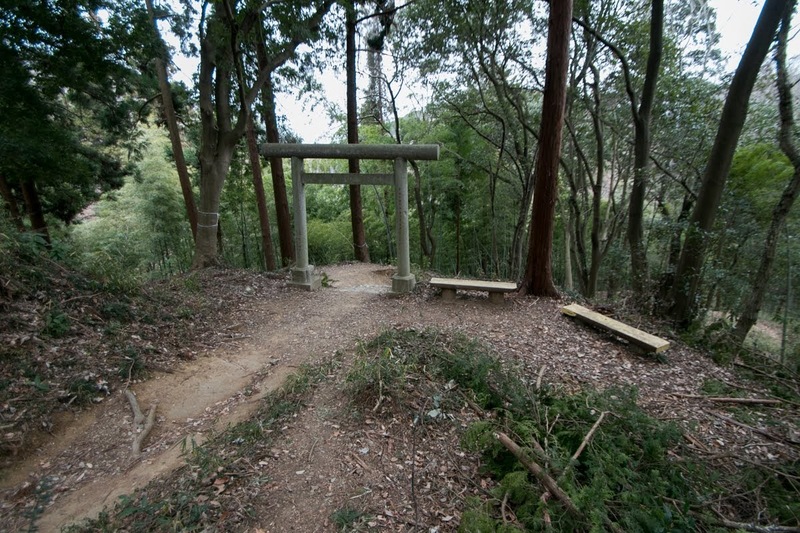 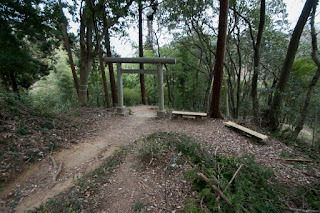 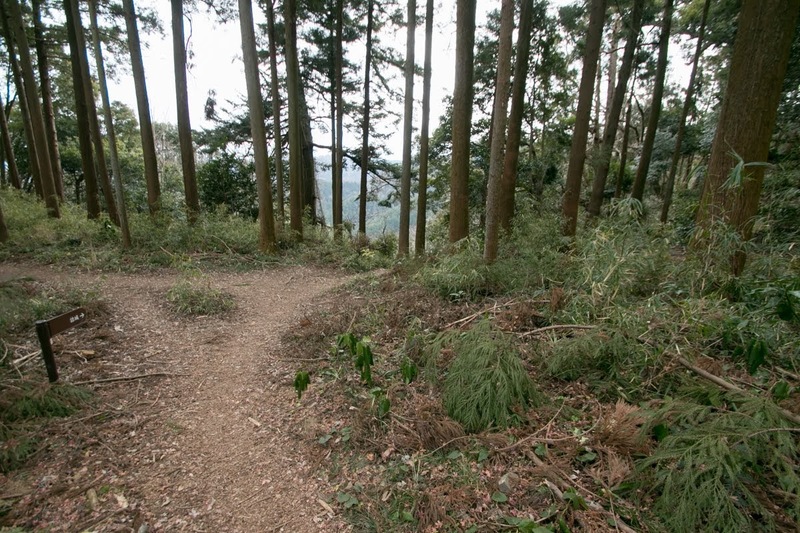 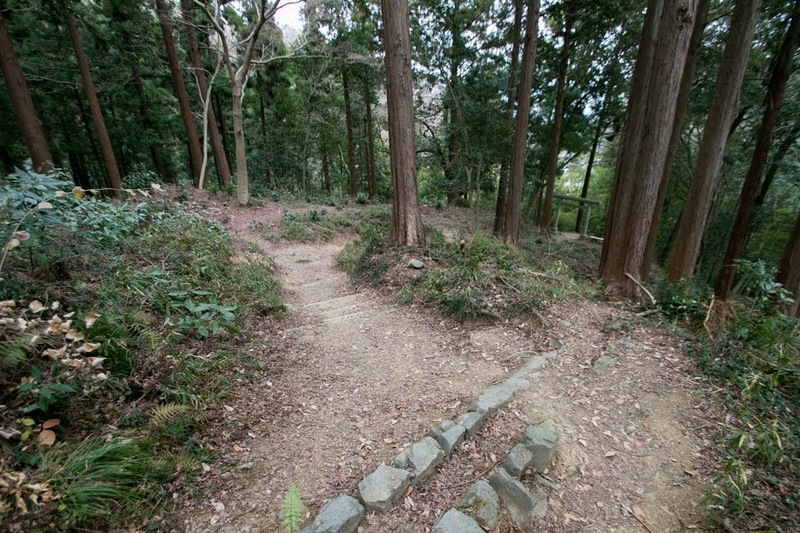 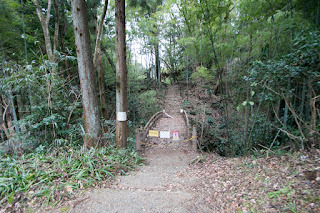 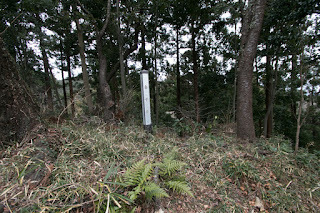 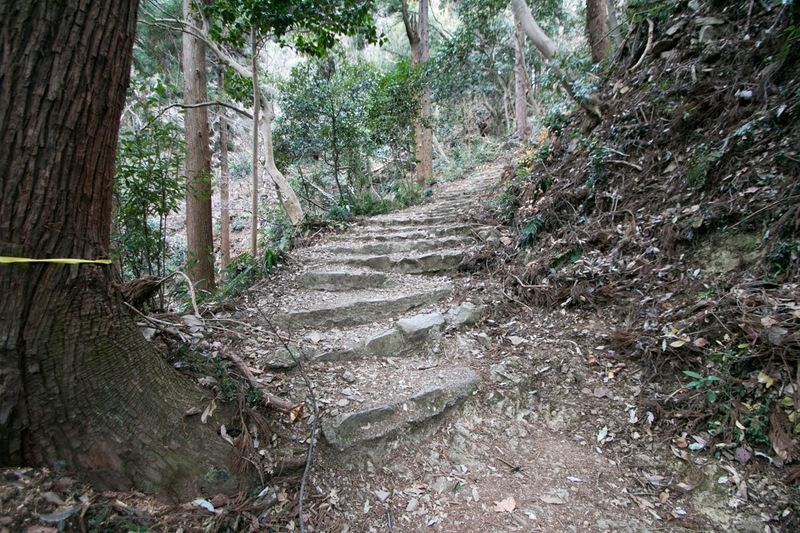 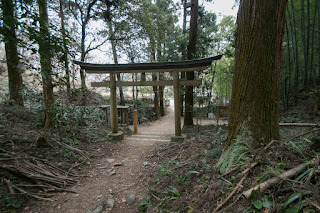 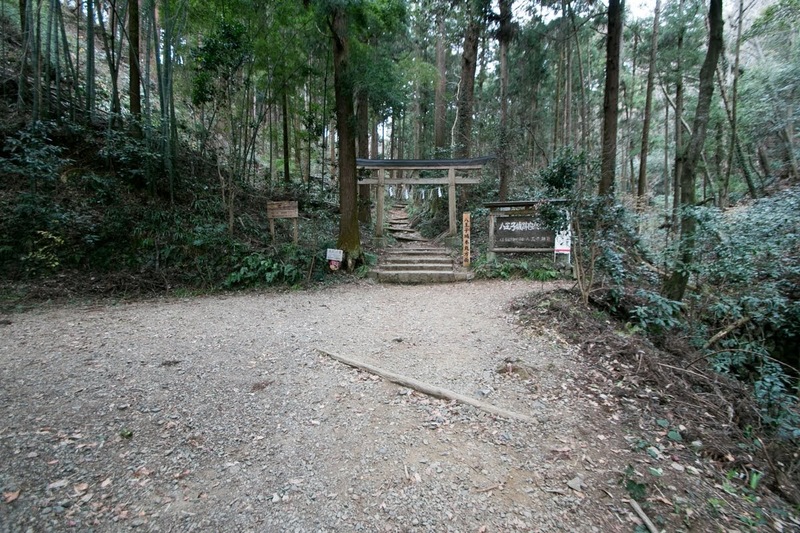 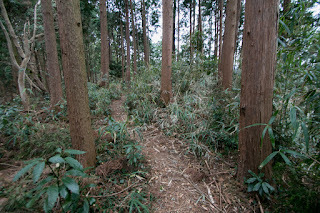 In 1569 when Takeda clan attacked Takiyama castle, there was a fierce battle at the secondary gate between both army. 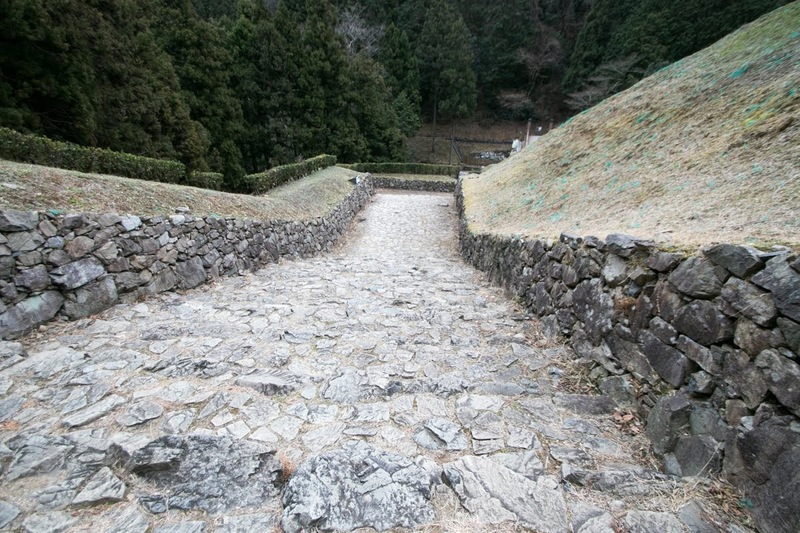 As a result, Ujiteru stroke back the attack of Takeda army, but he might thought the necessity of more secure castle. 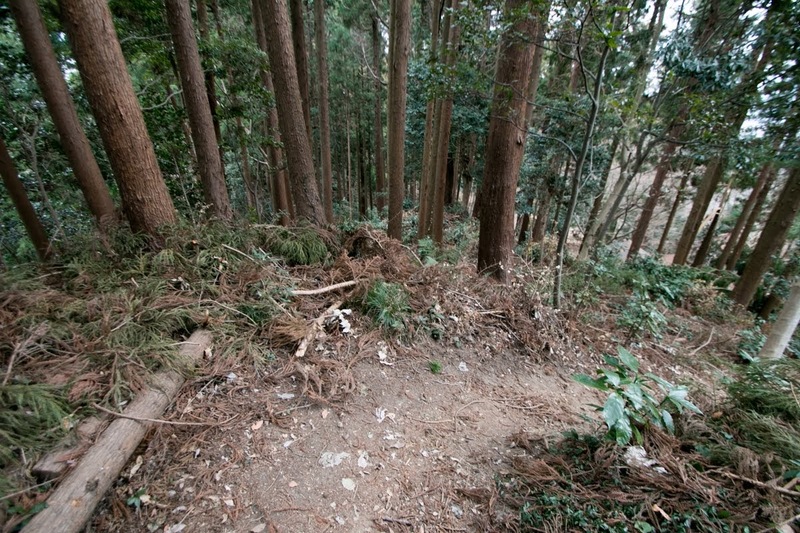 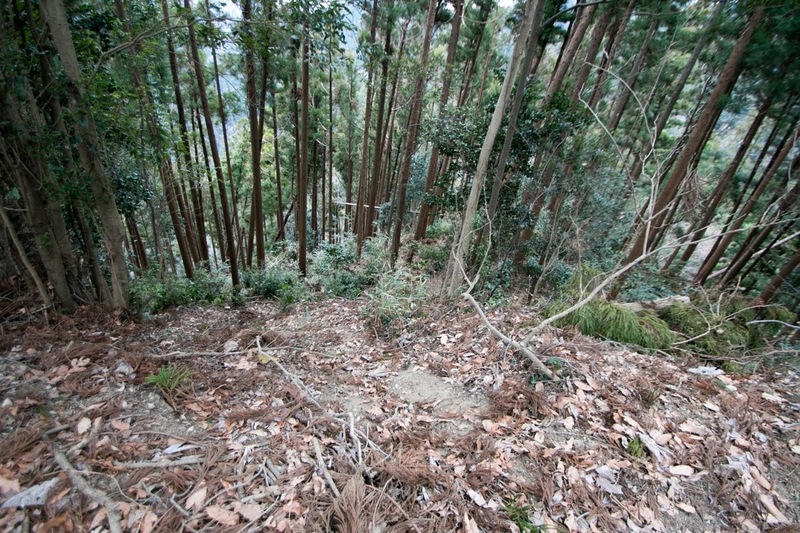 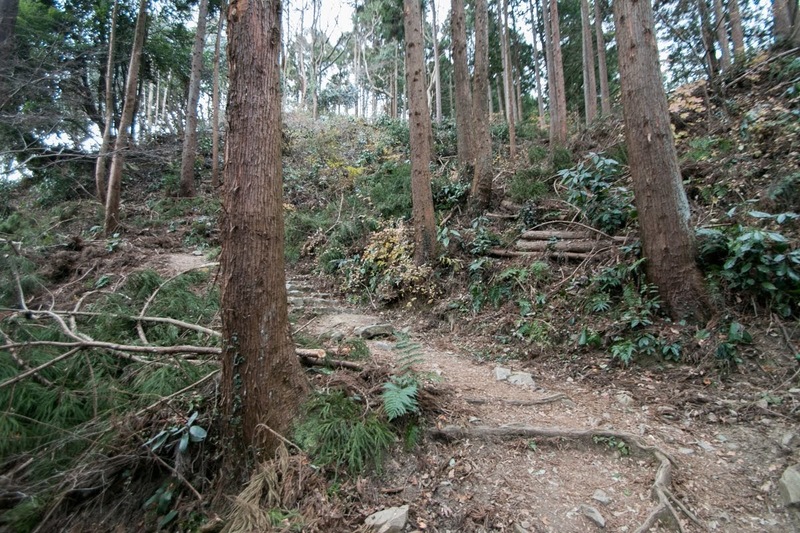 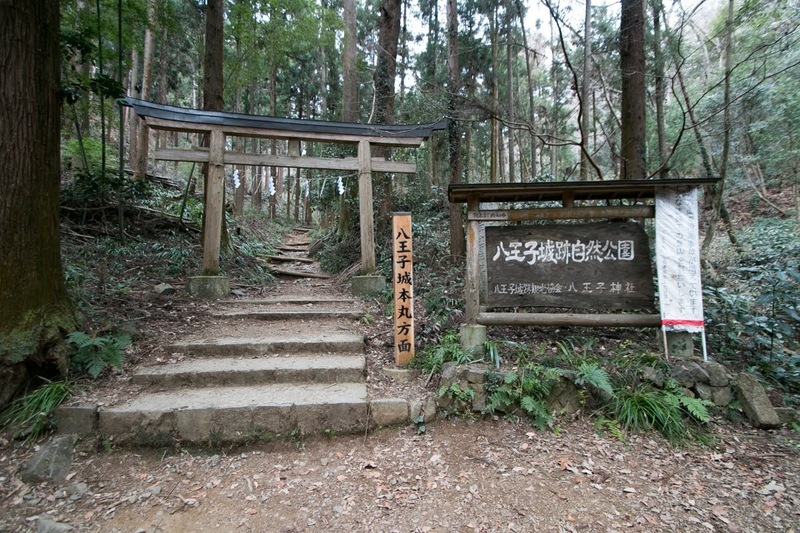 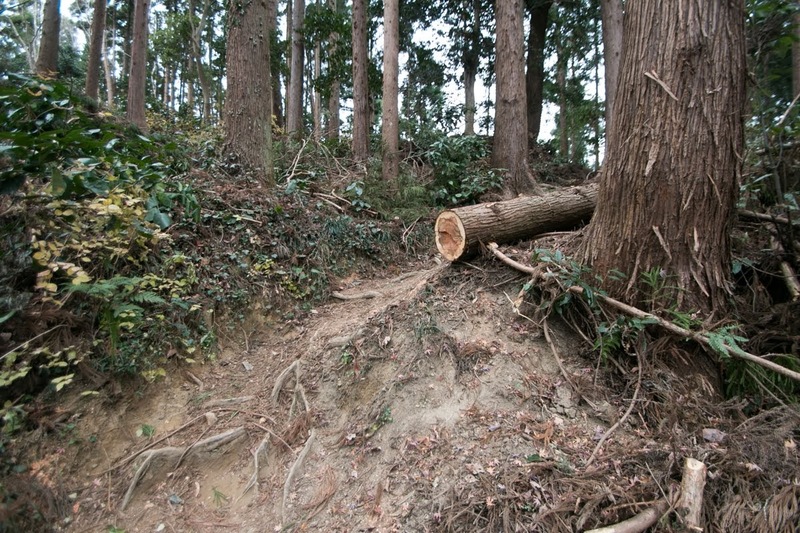 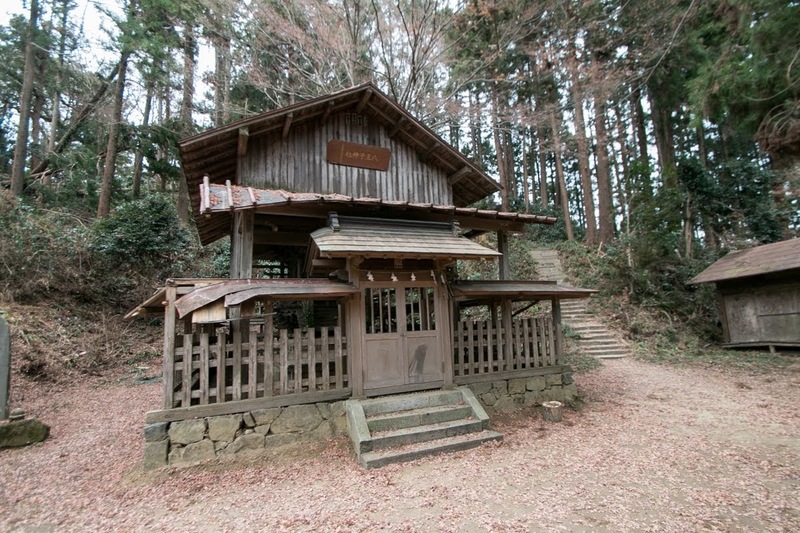 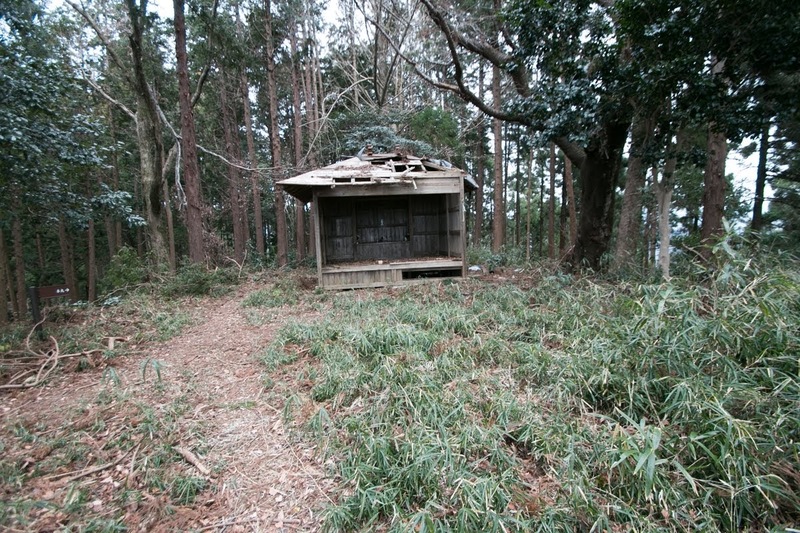 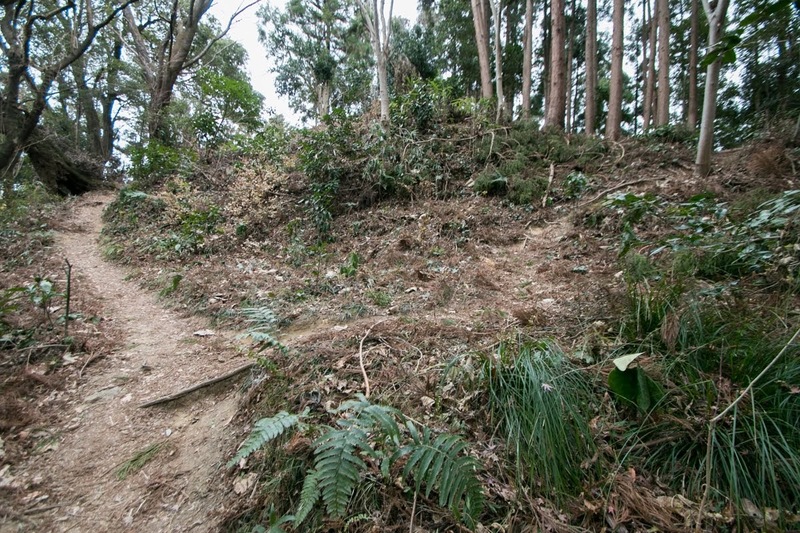 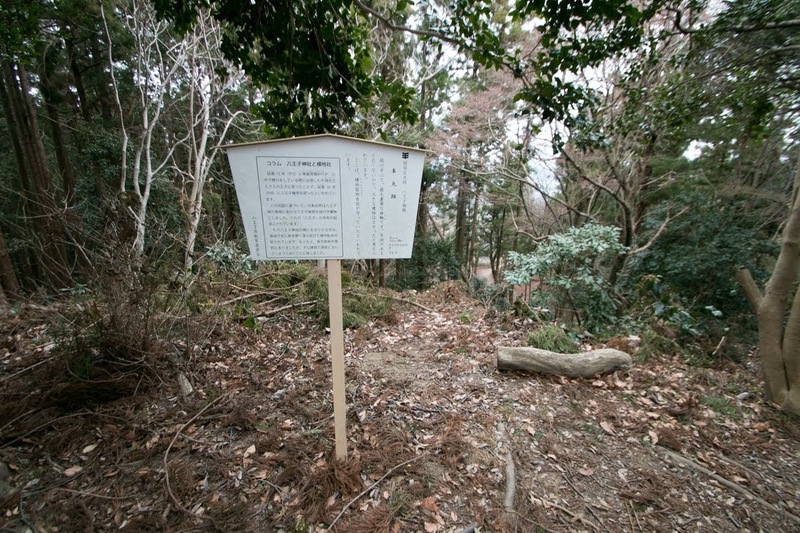 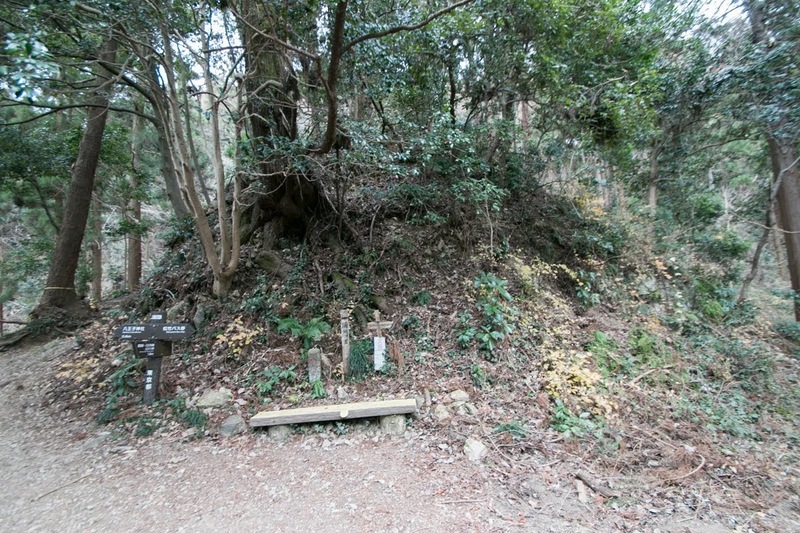 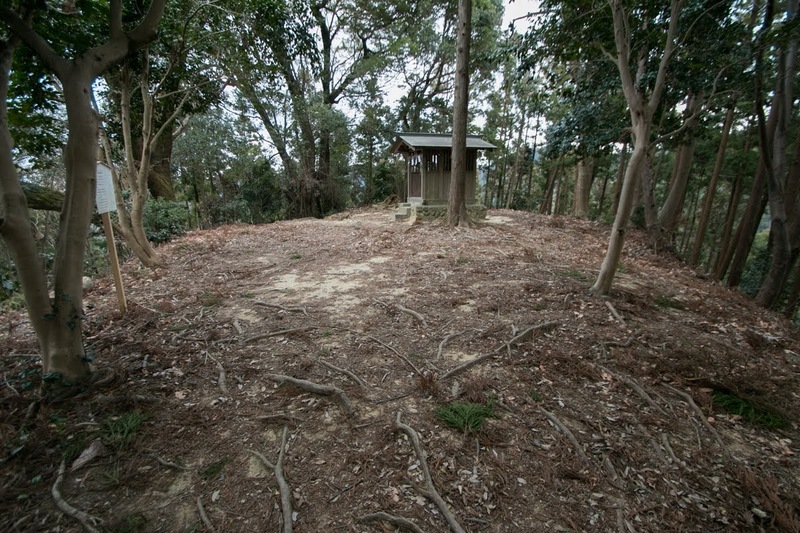 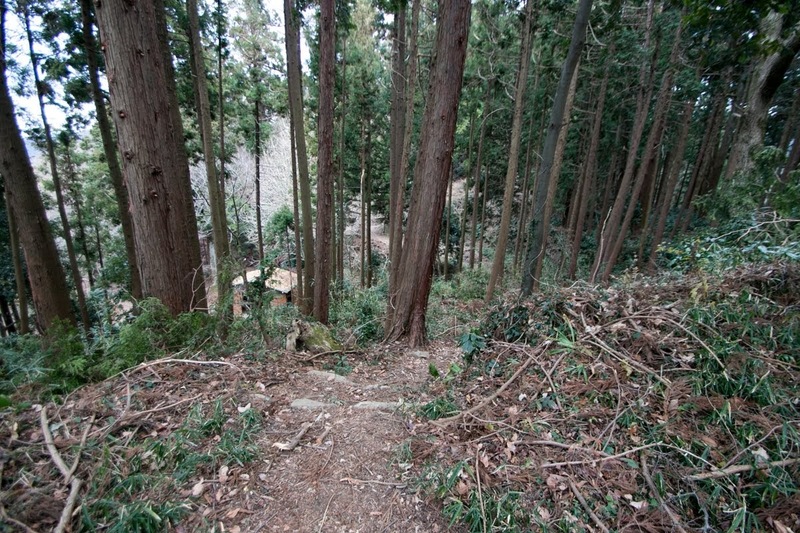 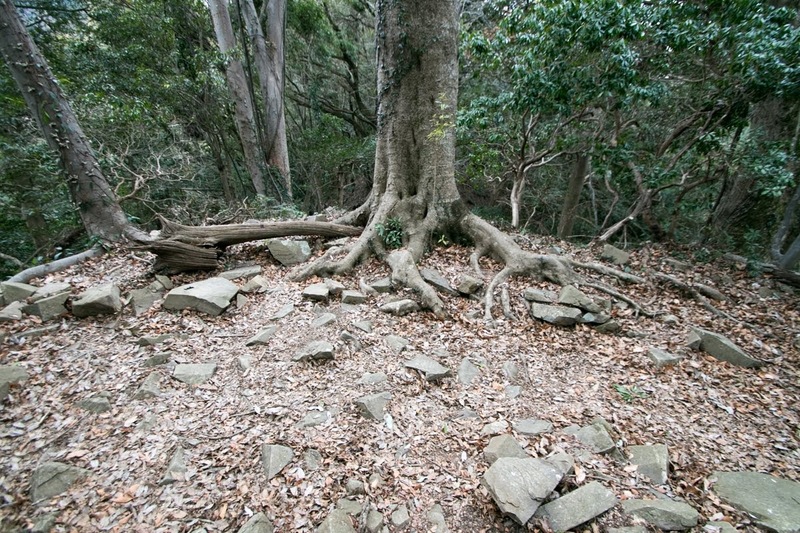 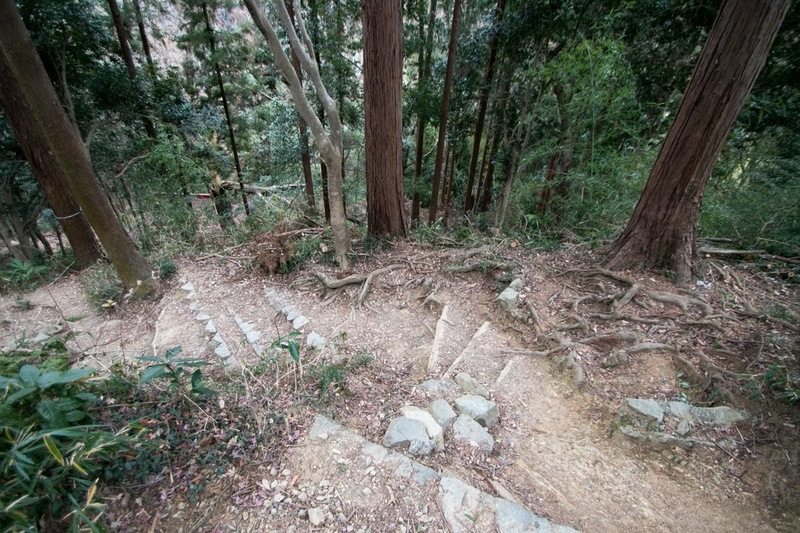 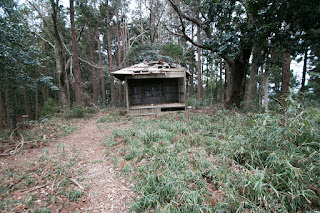 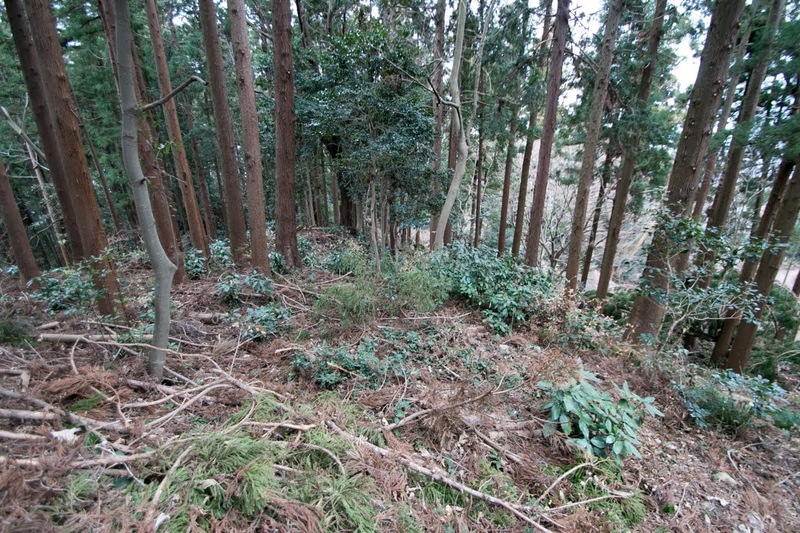 Several years after the battle, Ujiteru started to build a new castle at Mt. 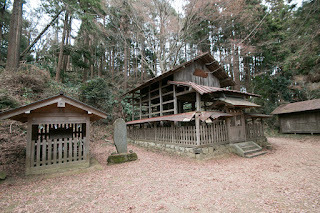 Fukasawayama around mid 1570's. During the construction, in 1582, Takeda clan was extinguished by Oda clan, and Kai province (Yamanashi prefecture) was seized by Oda clan or Tokugawa clan, central powers and substantial enemies of Hojyo clan. 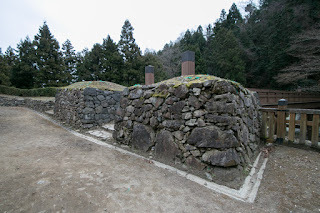 To avoid direct attack from Kai province to Musashi province (Tokyo metropolis), a vital area of Hojo clan, Ujiteru pushed construction and completed certain facilities by 1587. 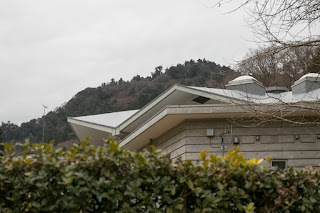 Takiyama castle was abolished and Ujiteru moved his residence to Hachioji castle. 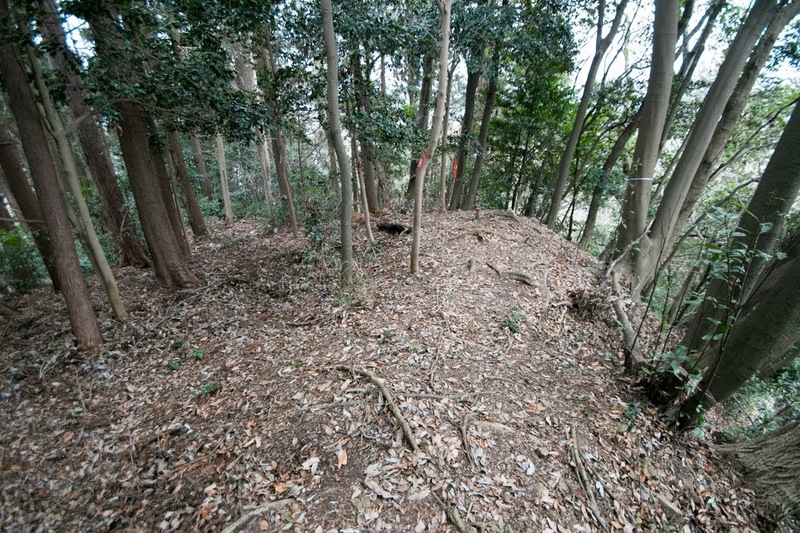 The structure of castle is divided into hillside area and hilltop area. 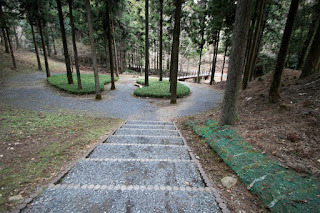 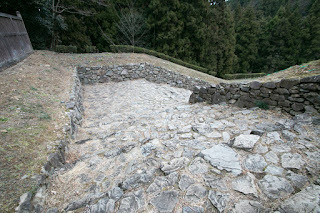 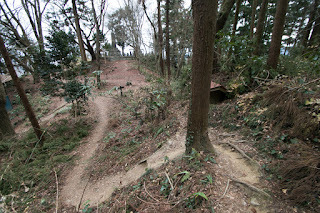 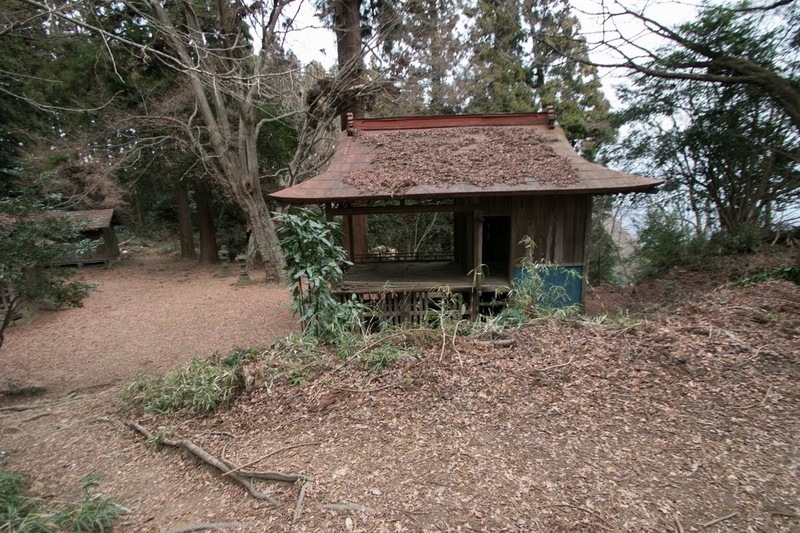 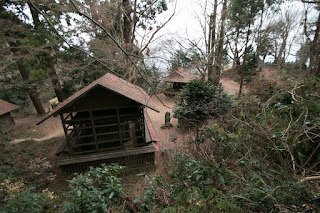 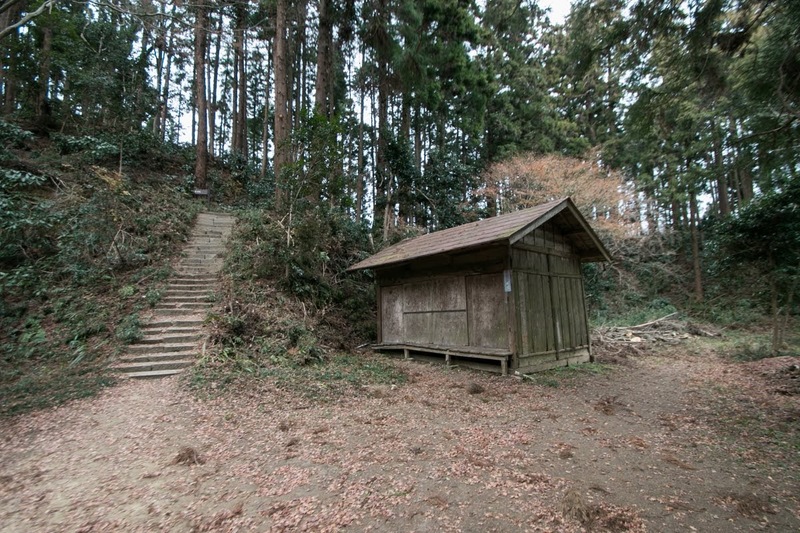 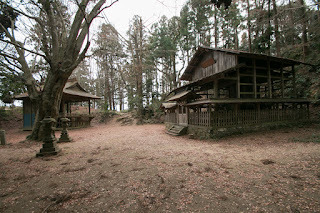 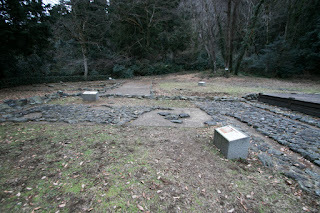 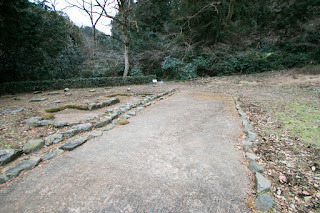 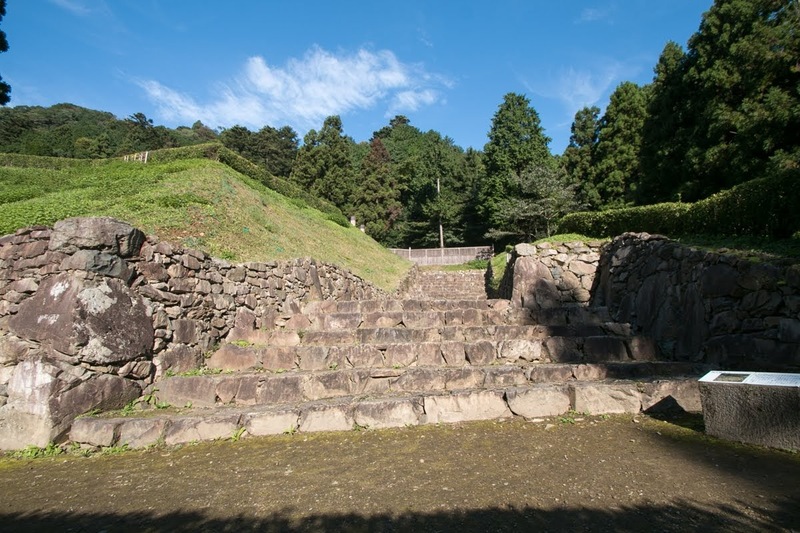 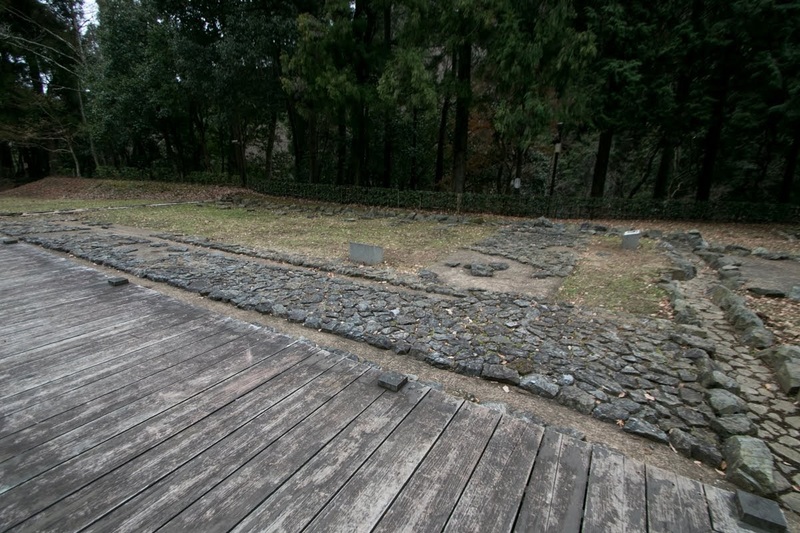 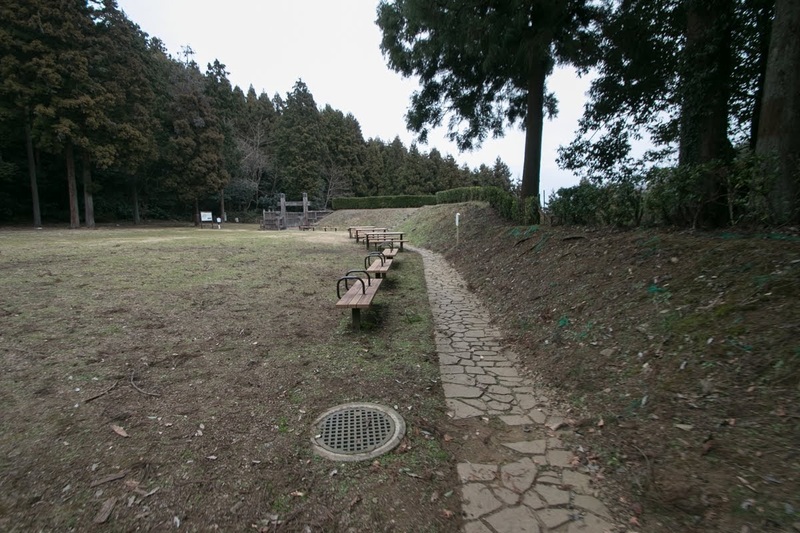 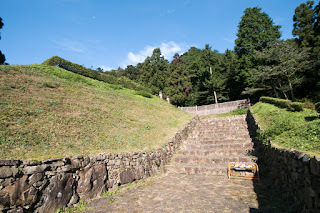 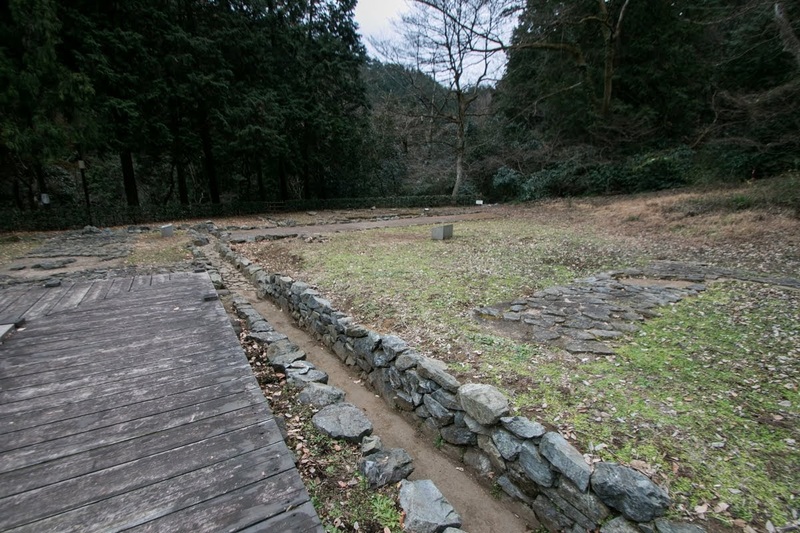 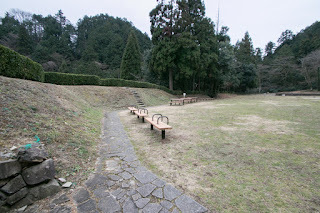 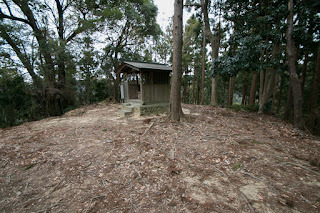 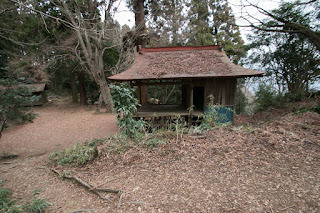 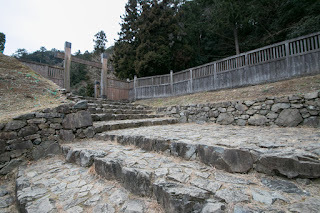 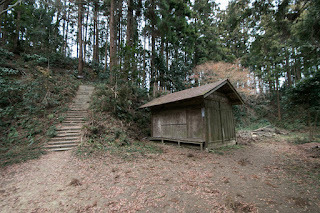 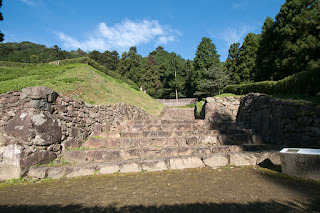 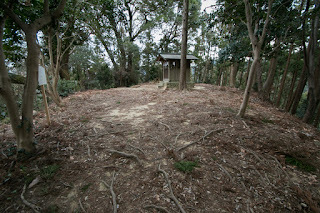 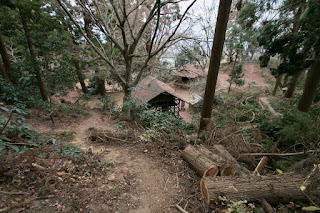 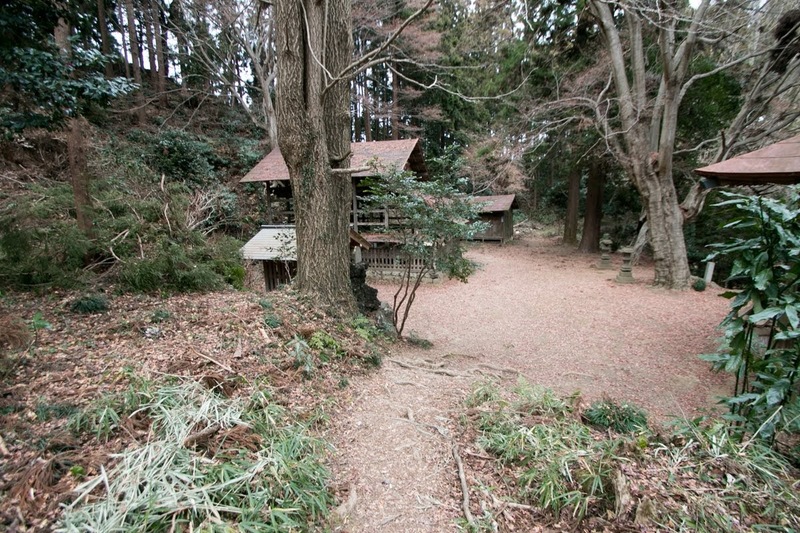 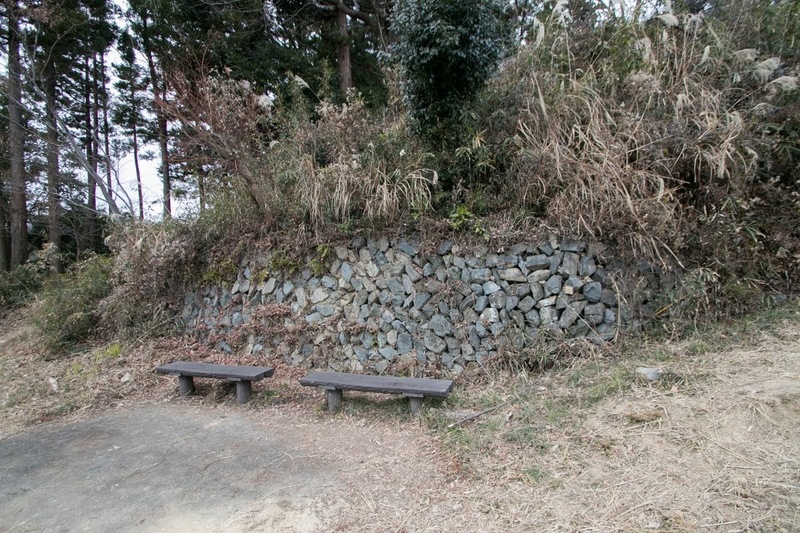 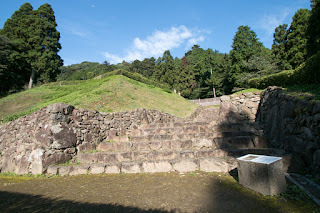 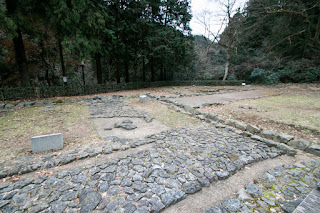 At hillside area, there was a palace of Ujiteru at the largest terrace, and also many surrounding small compartment existed. 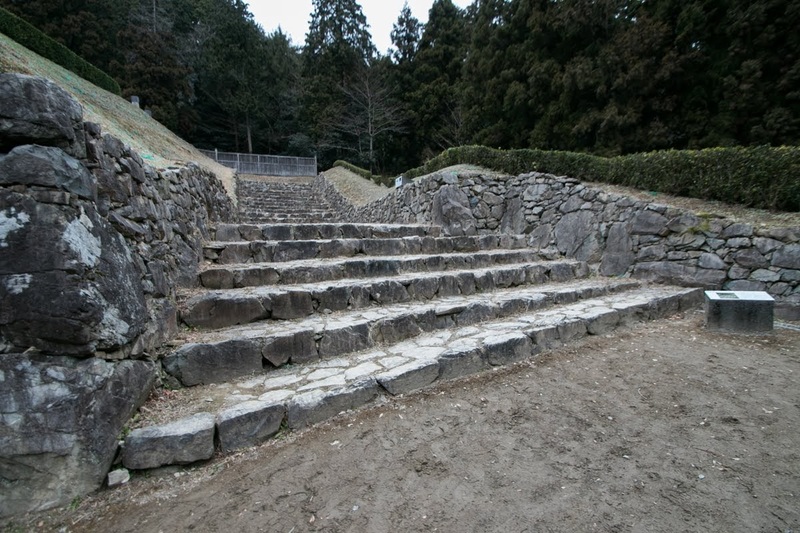 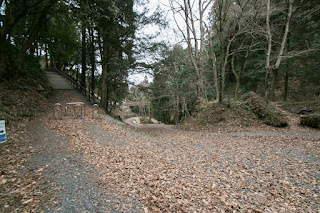 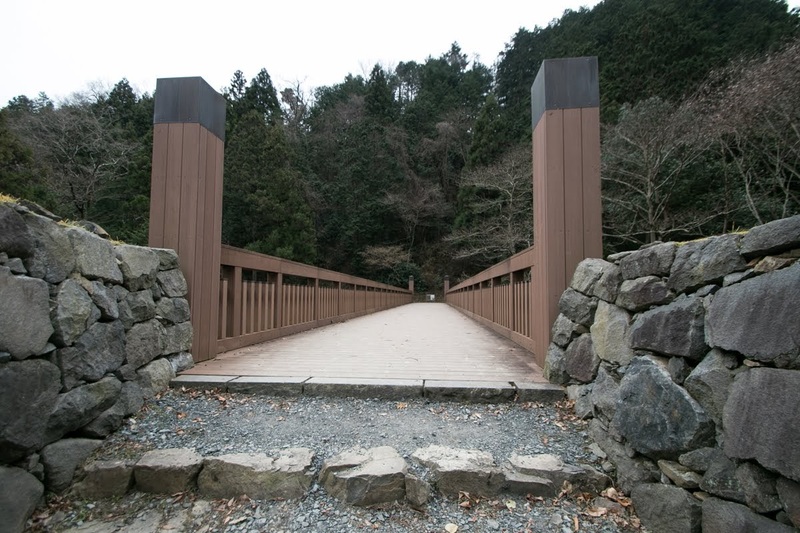 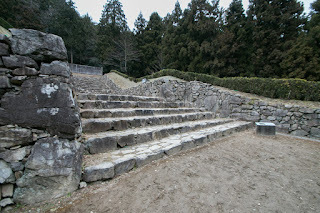 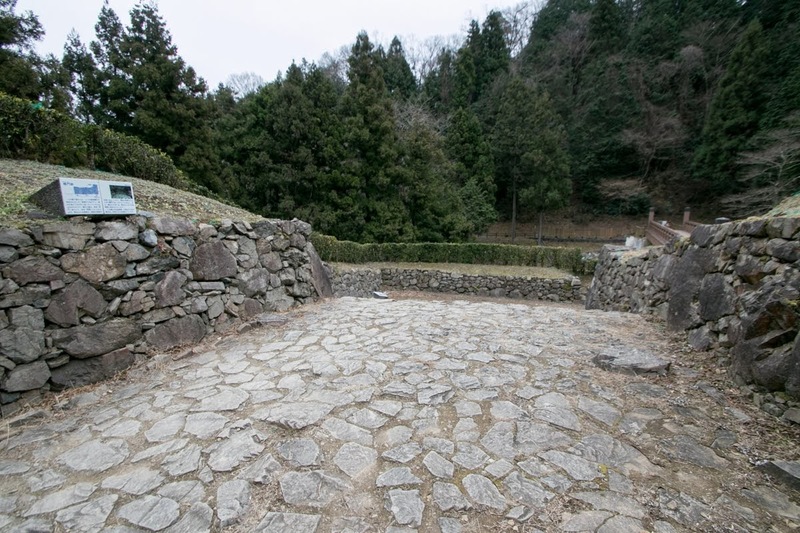 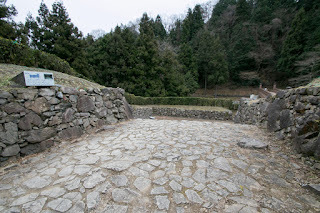 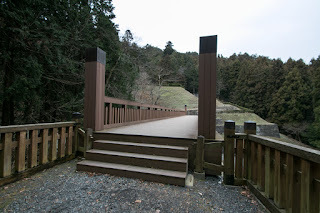 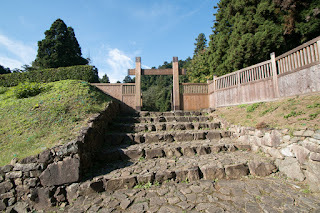 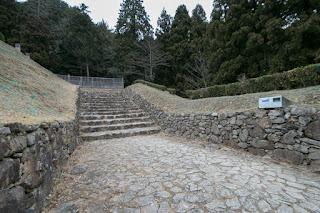 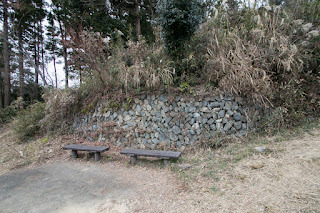 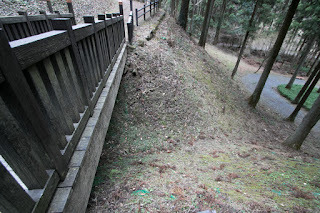 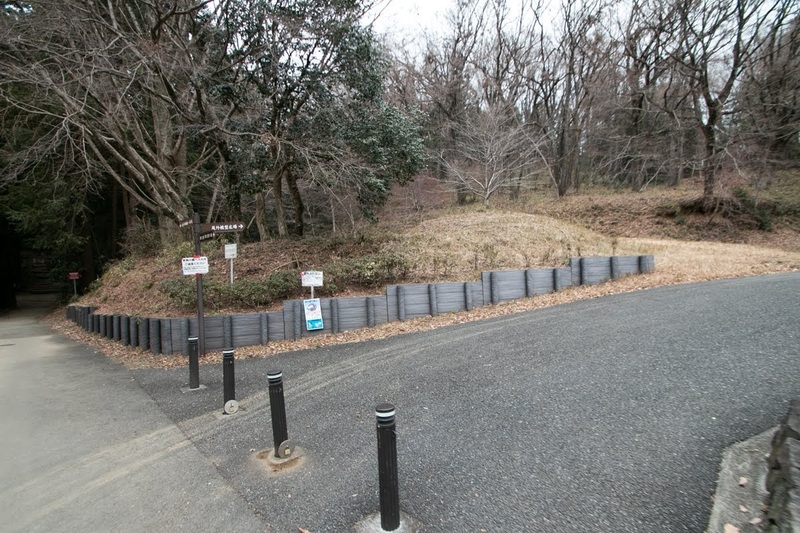 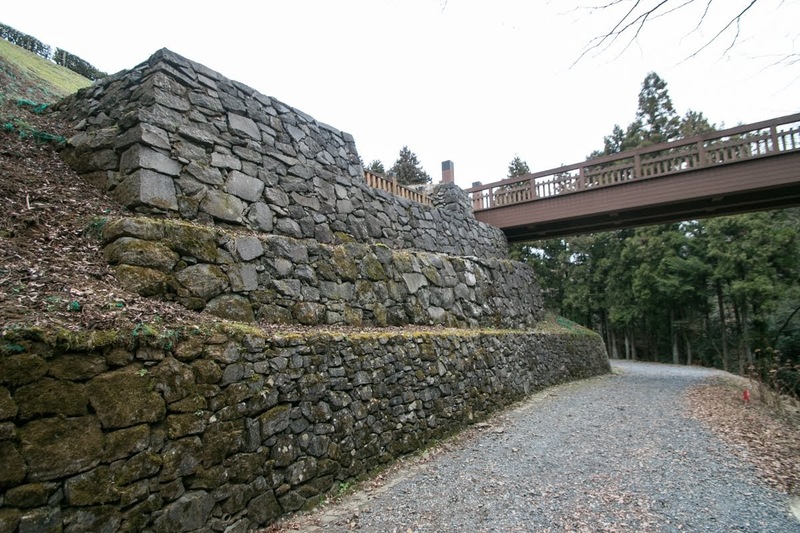 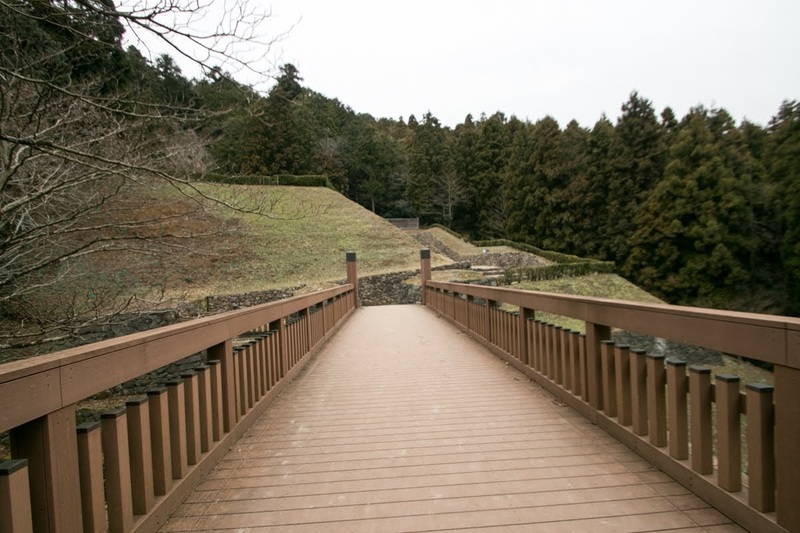 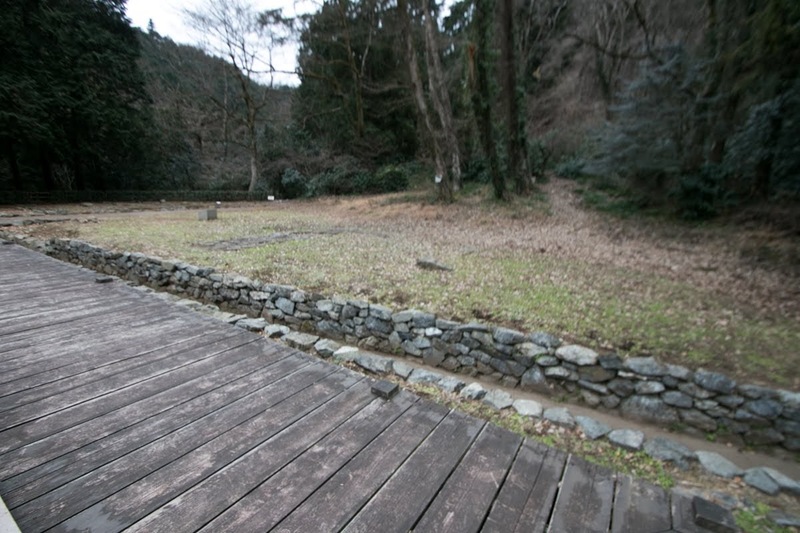 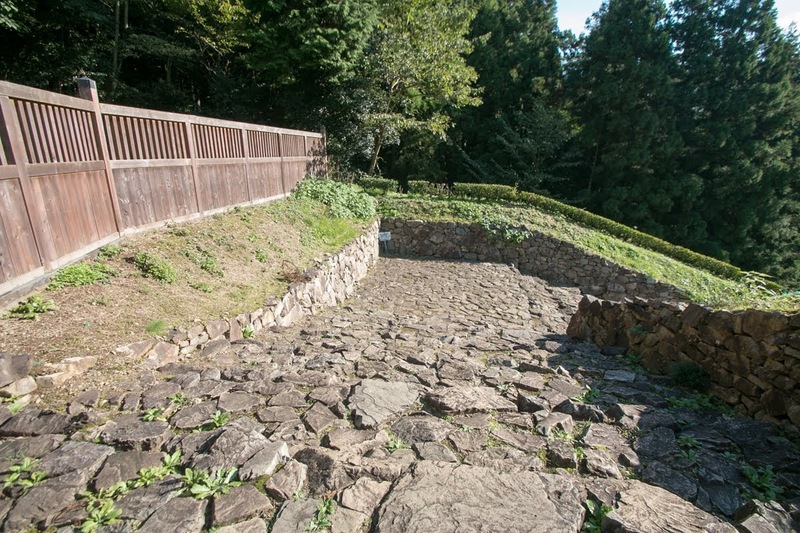 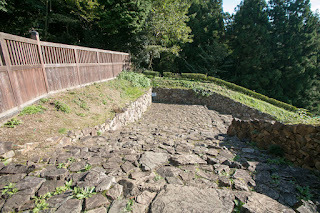 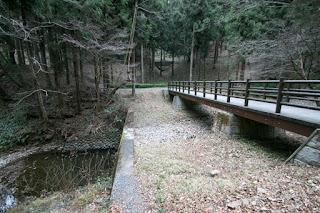 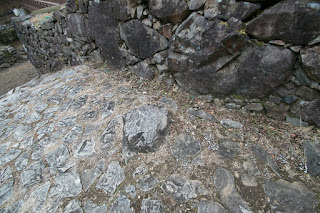 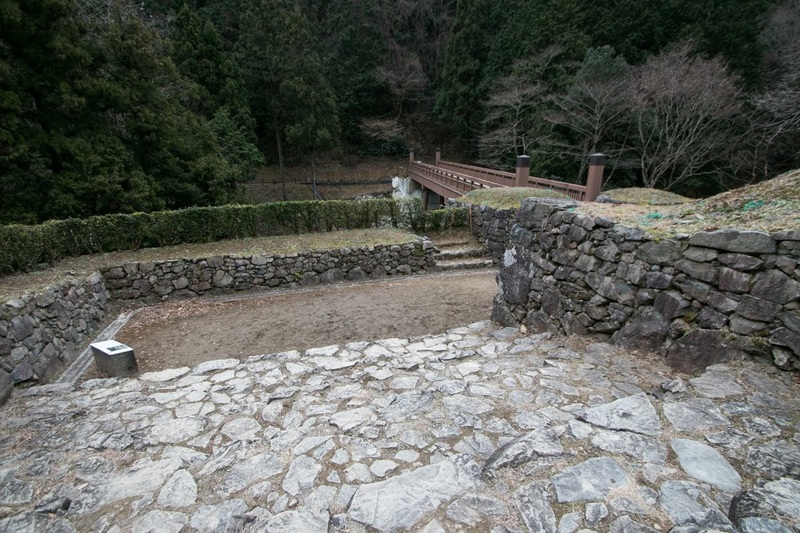 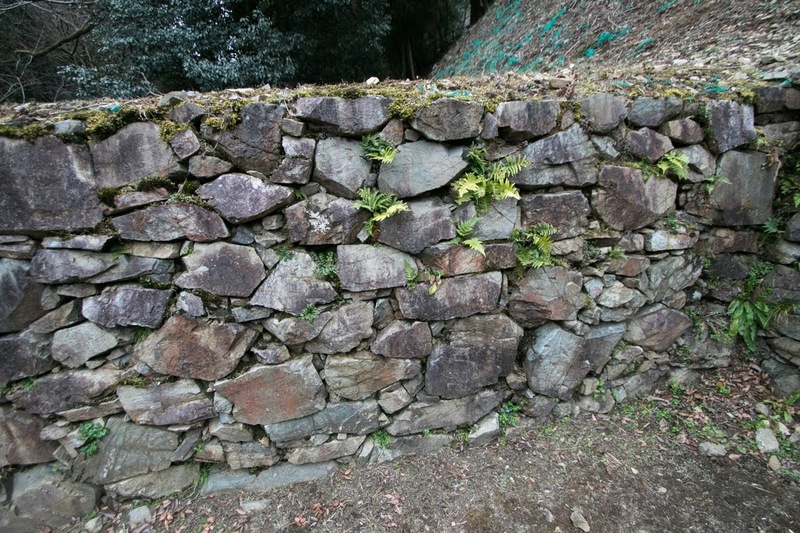 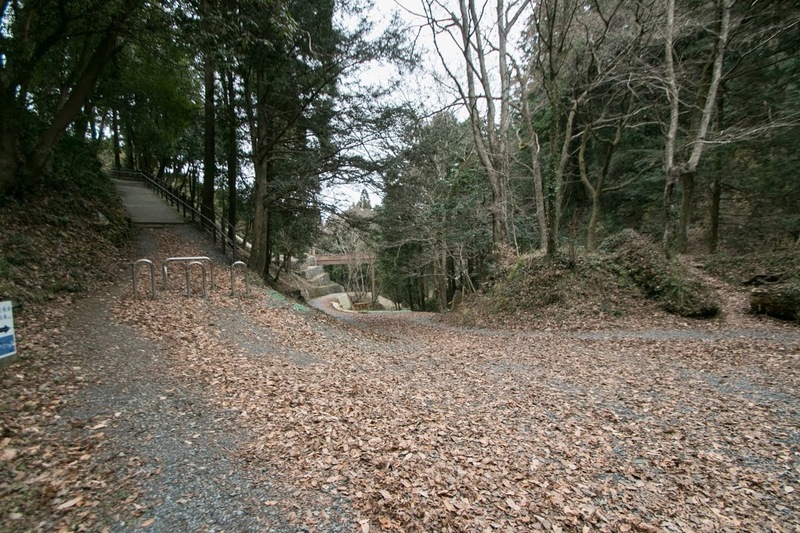 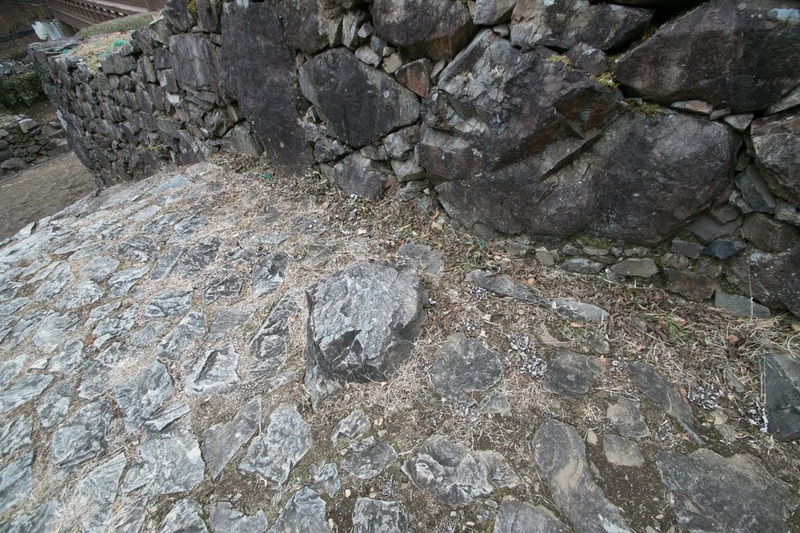 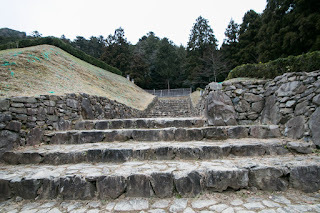 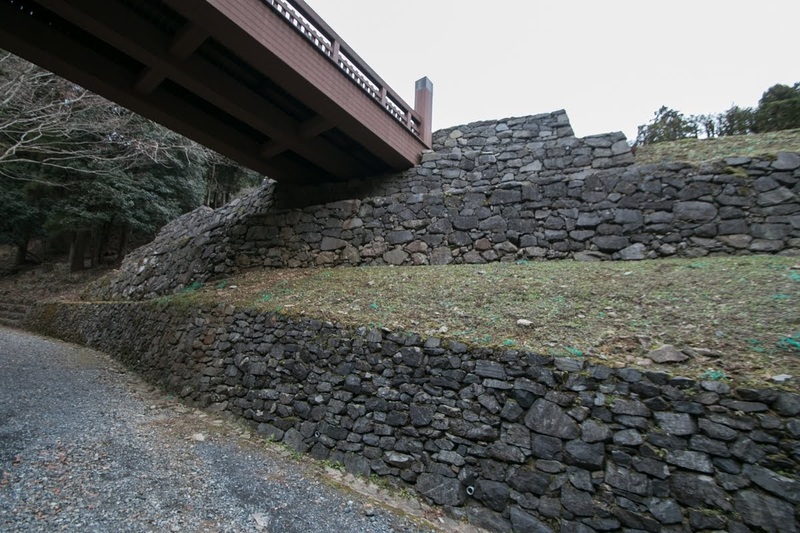 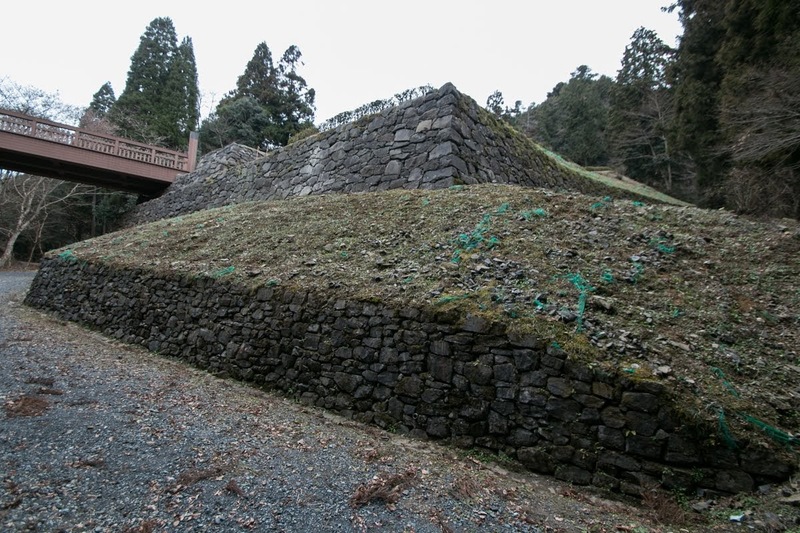 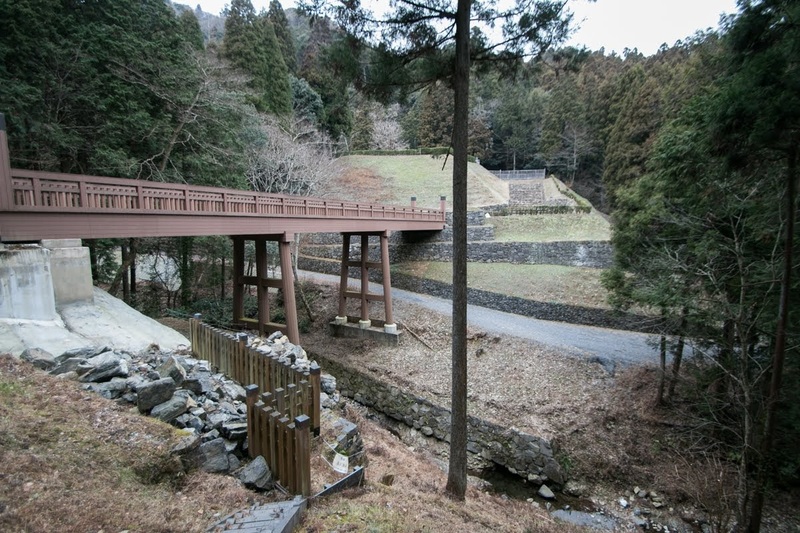 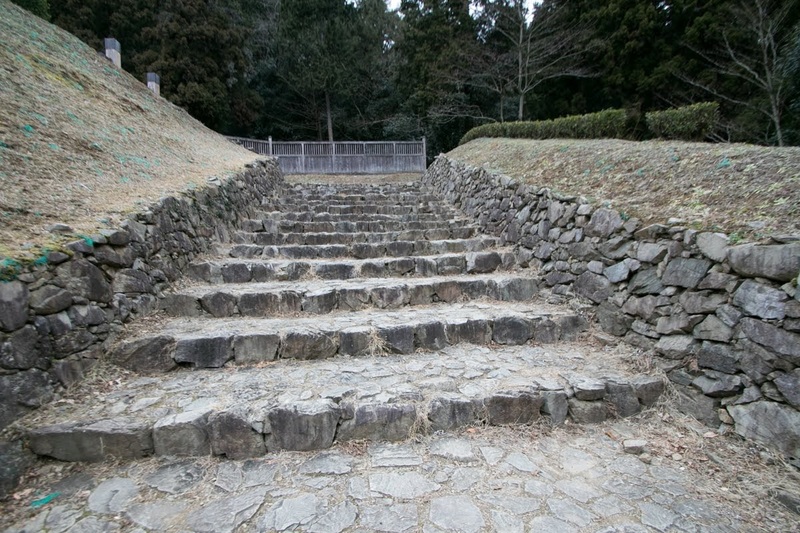 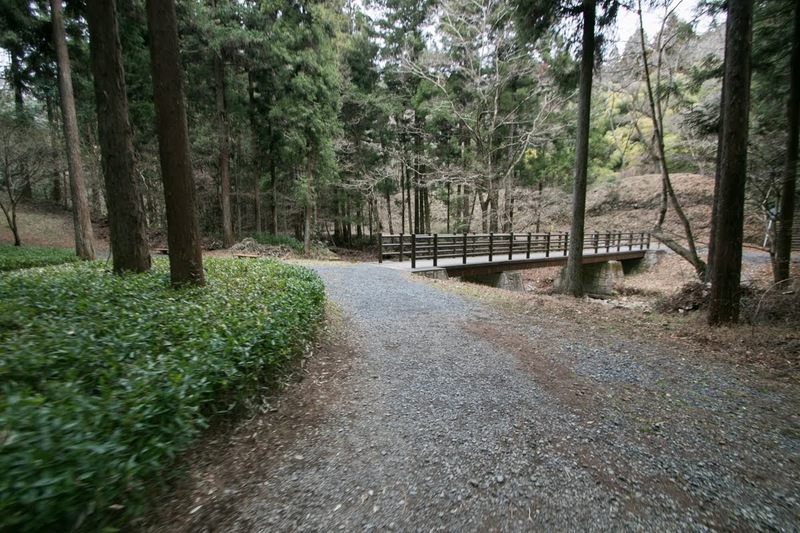 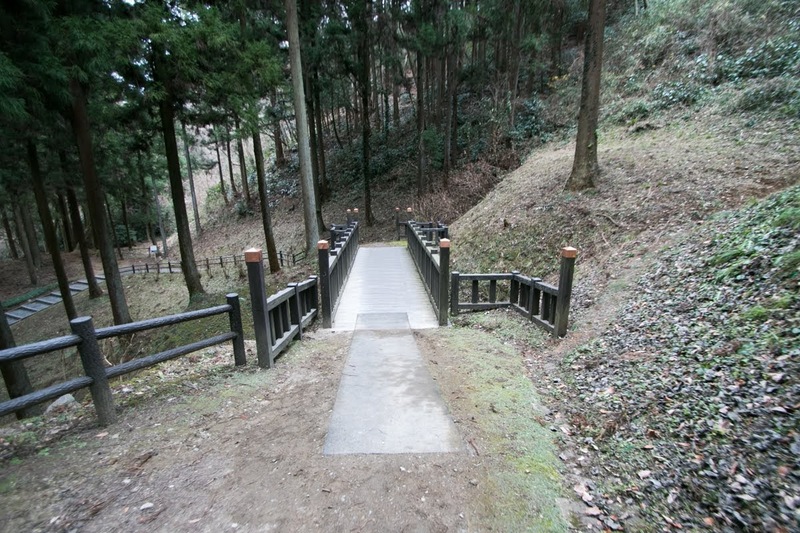 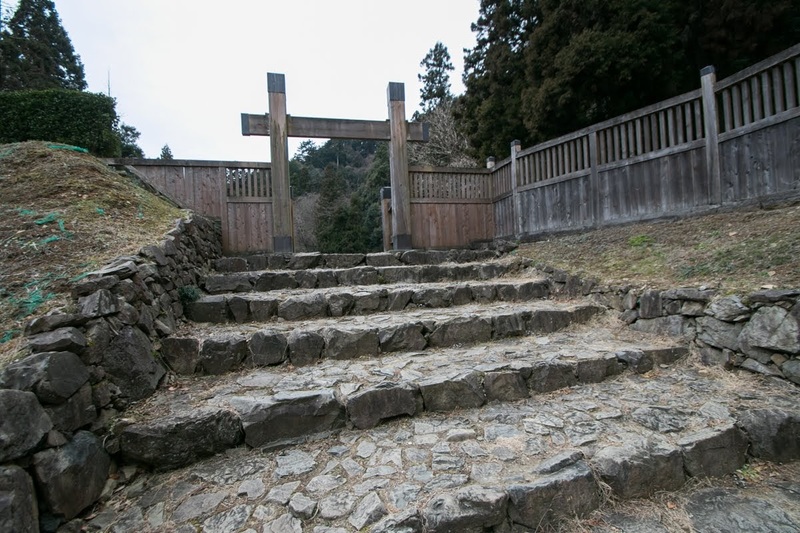 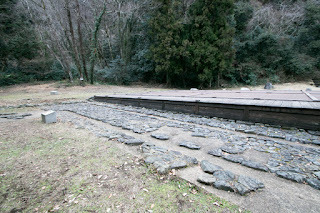 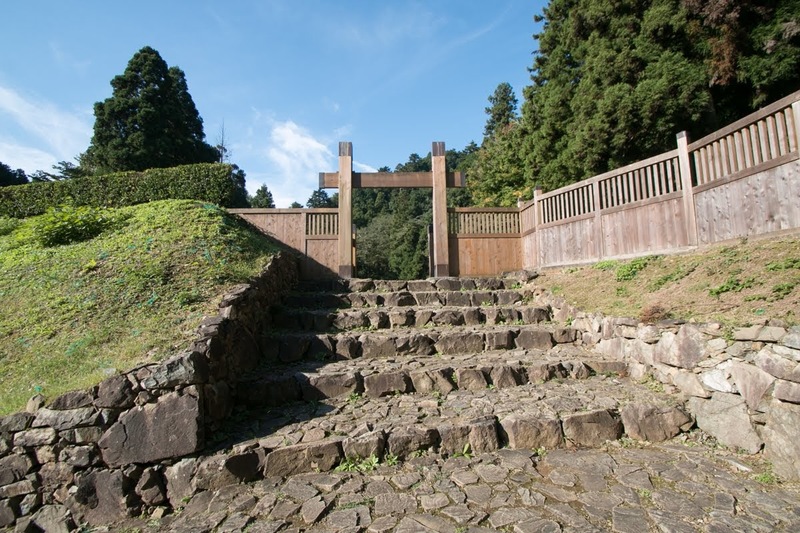 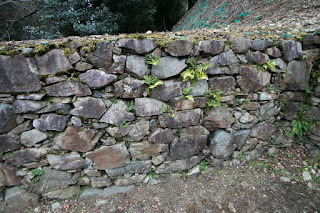 To show the authority of Ujiteru, front wall of terrace and main route to the gate of palace were covered by stone walls, and folding bridge was built between palace and main gate area. 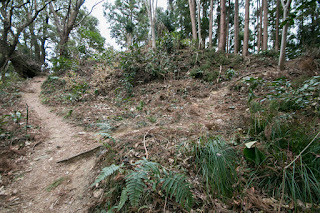 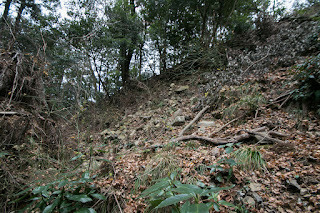 From the middle to hilltop, many terraces made at slope or ridge. 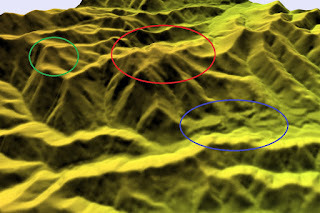 Central area was placed at the top of the mountain but not so large and had no complex defense facilities. 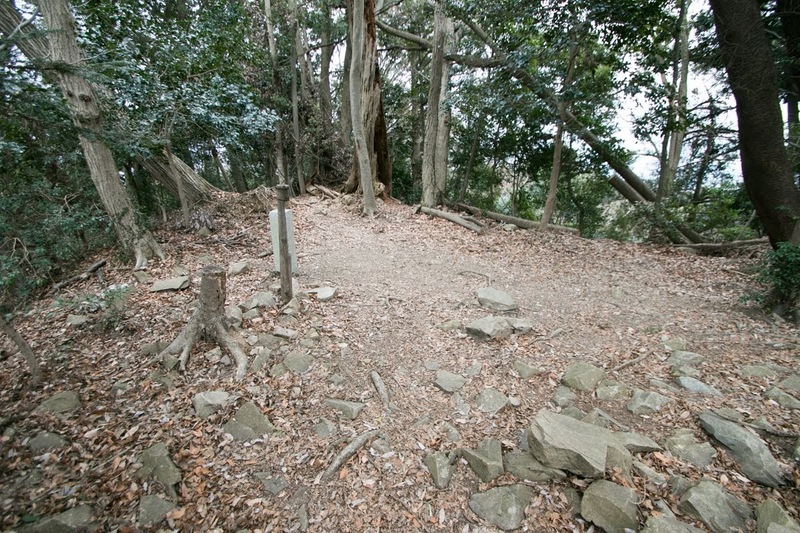 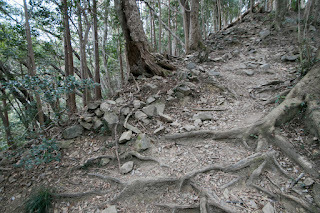 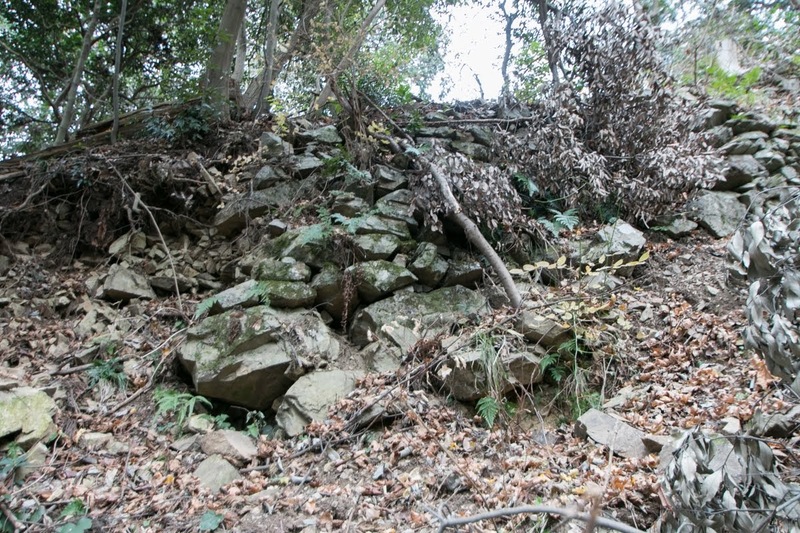 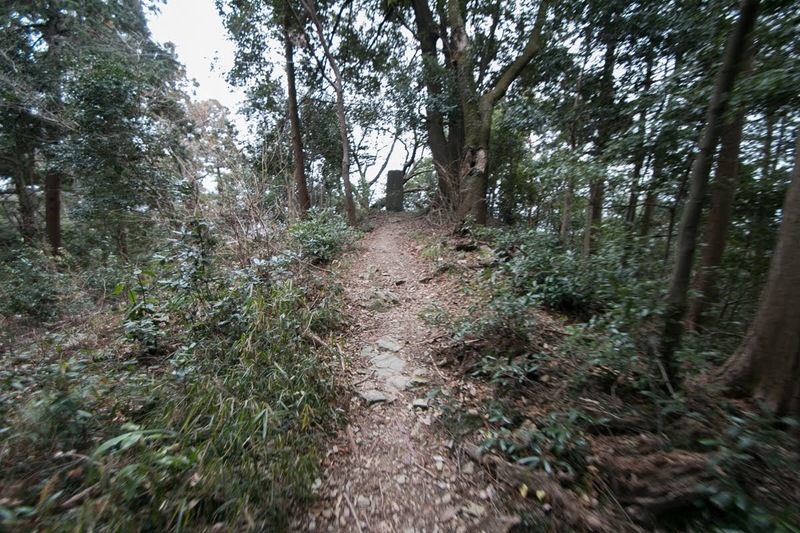 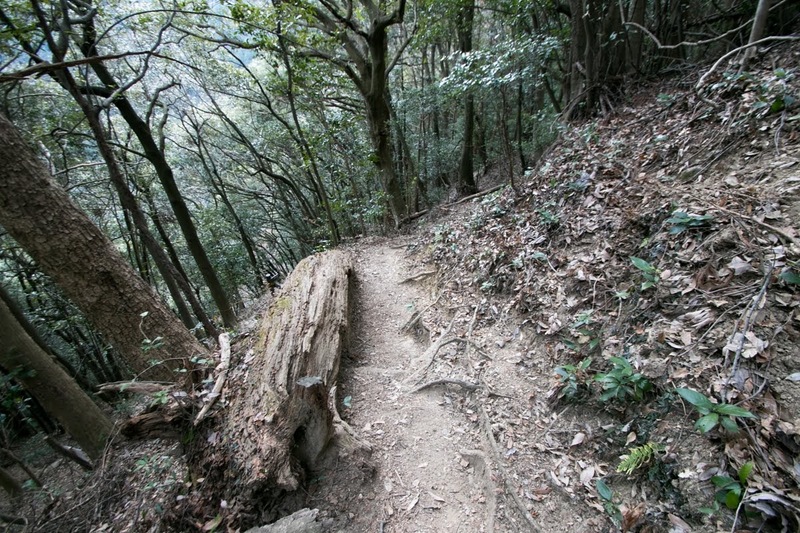 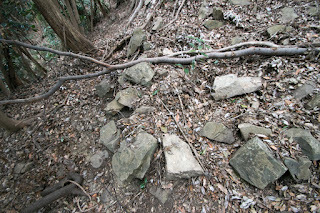 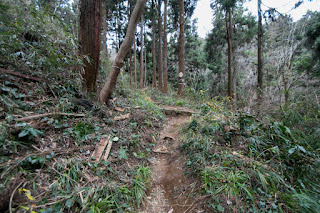 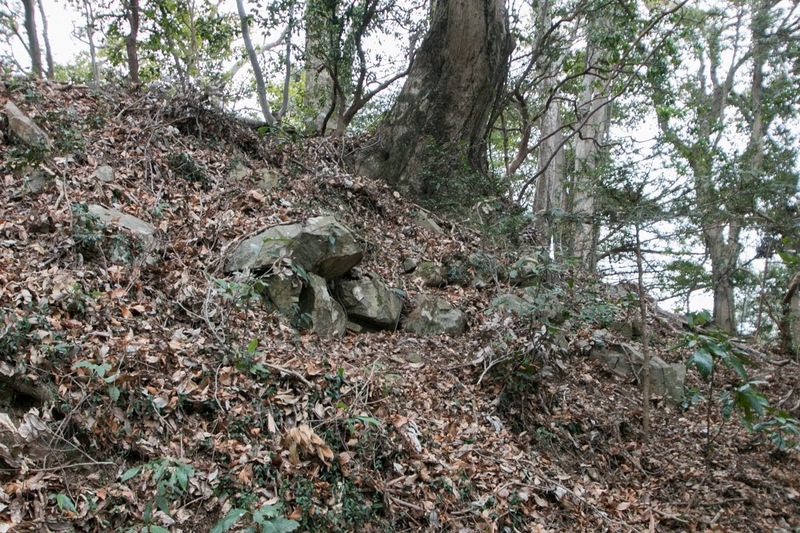 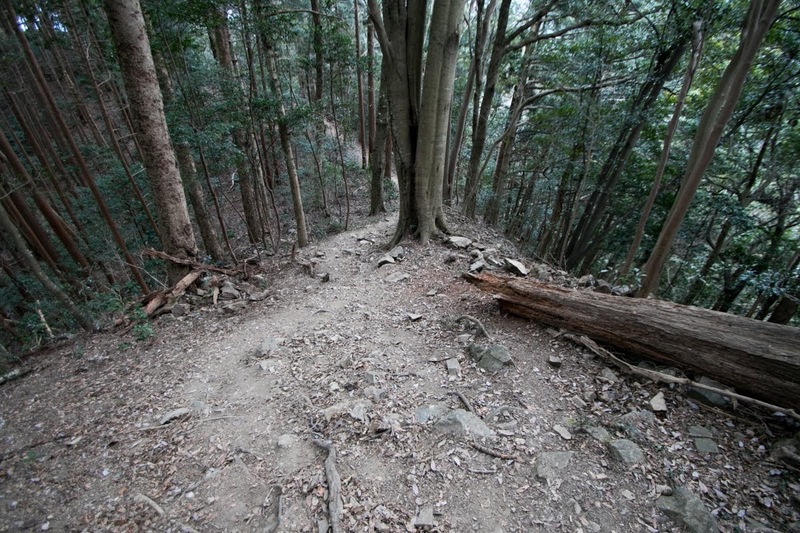 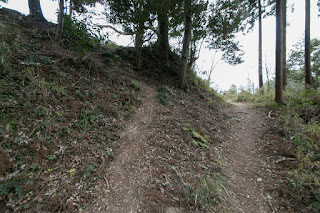 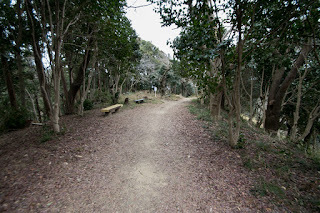 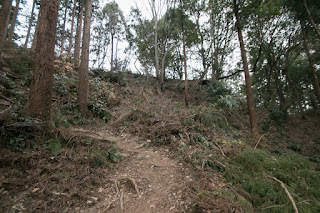 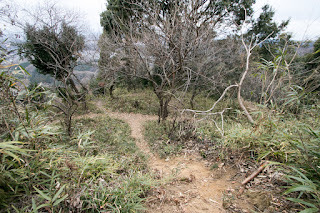 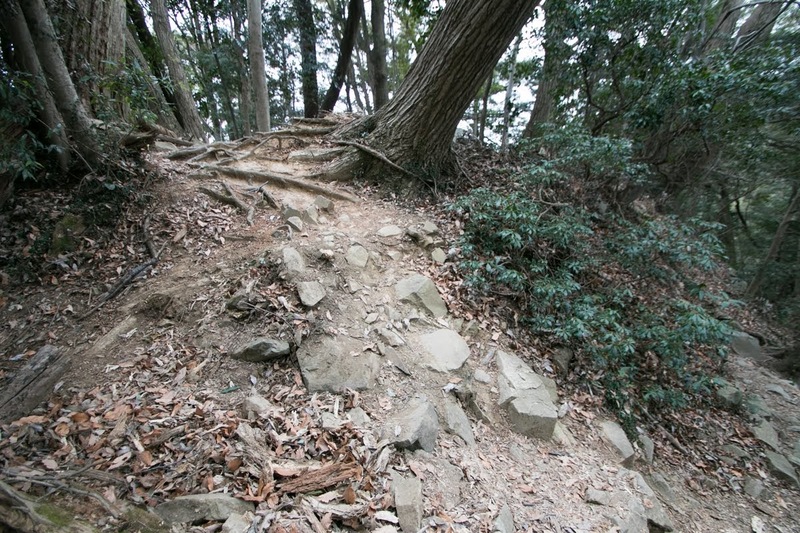 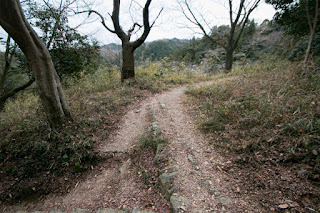 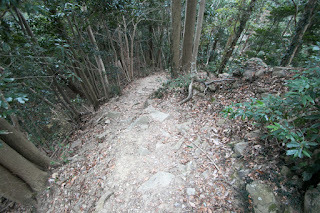 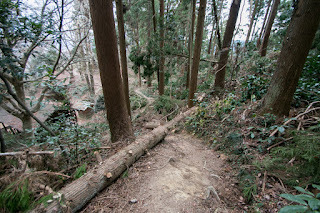 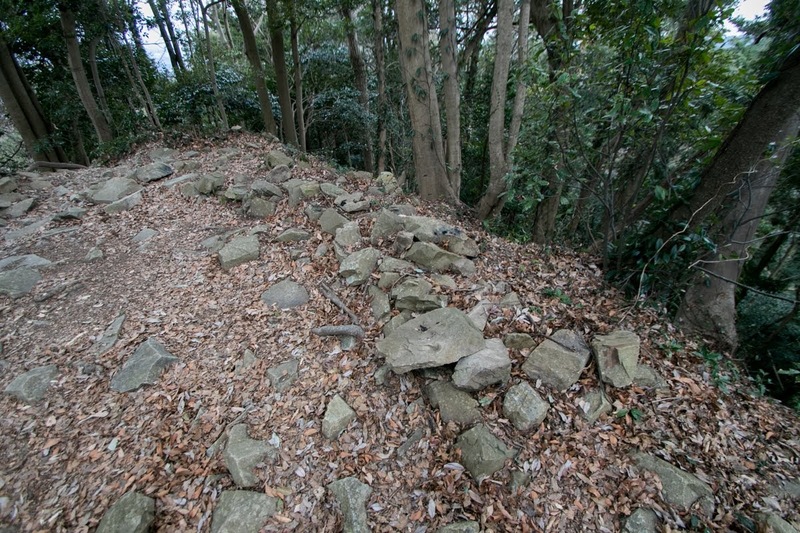 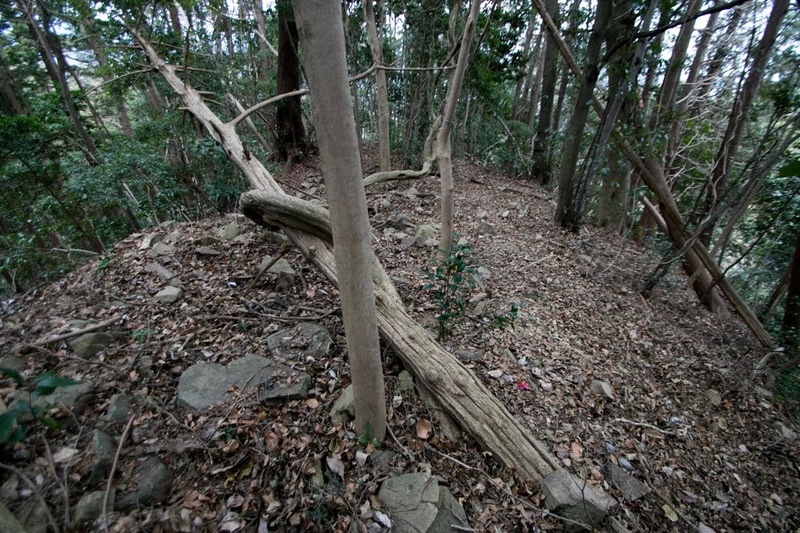 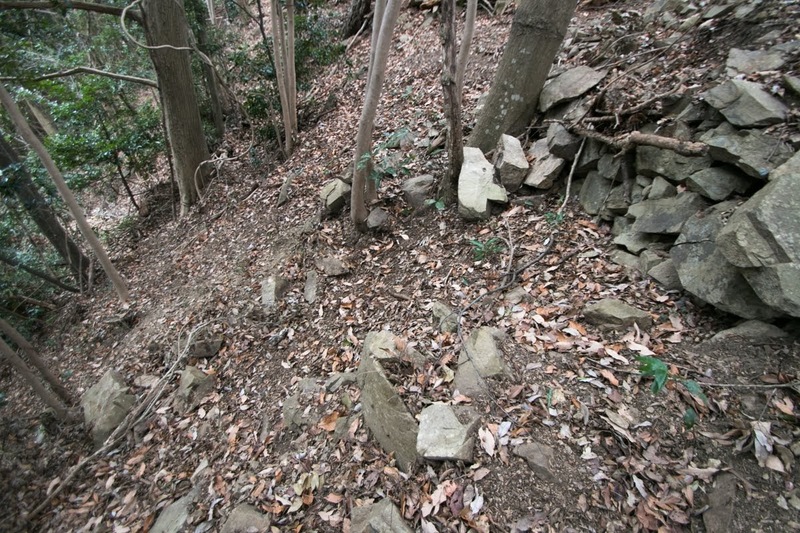 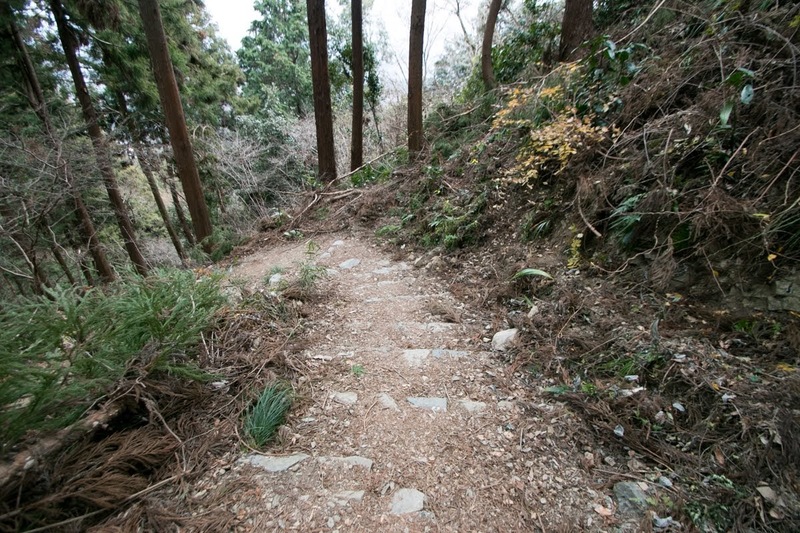 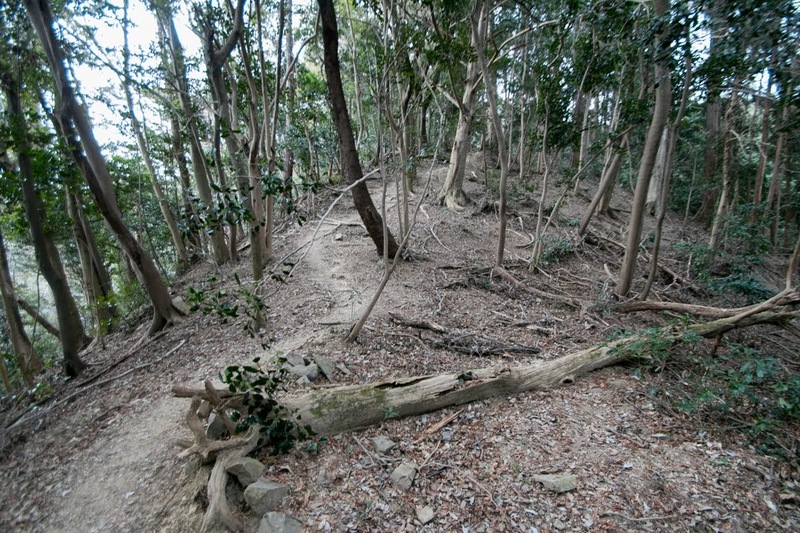 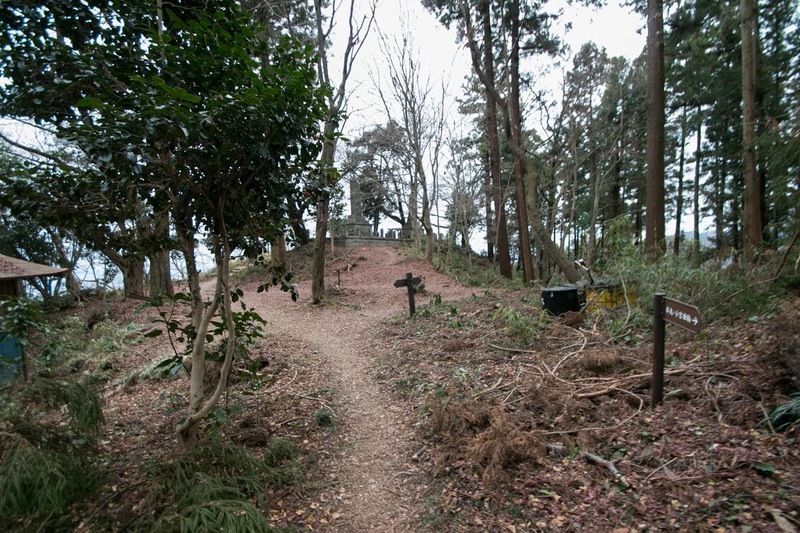 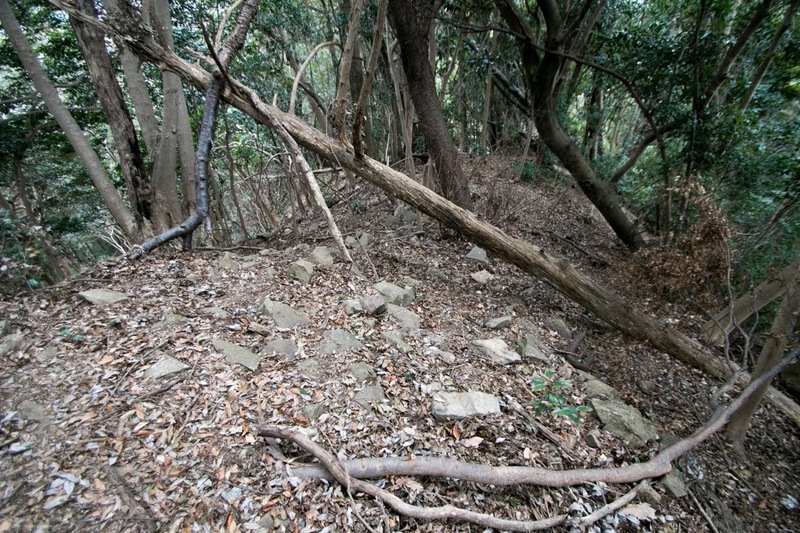 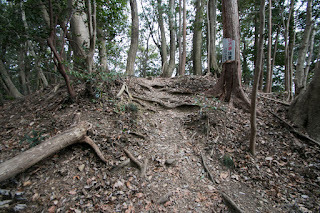 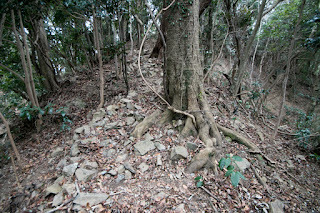 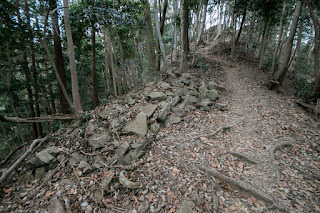 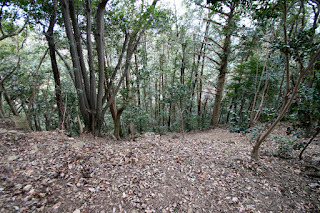 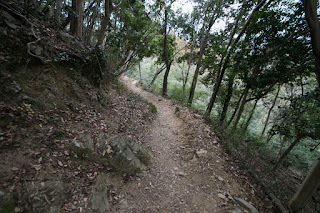 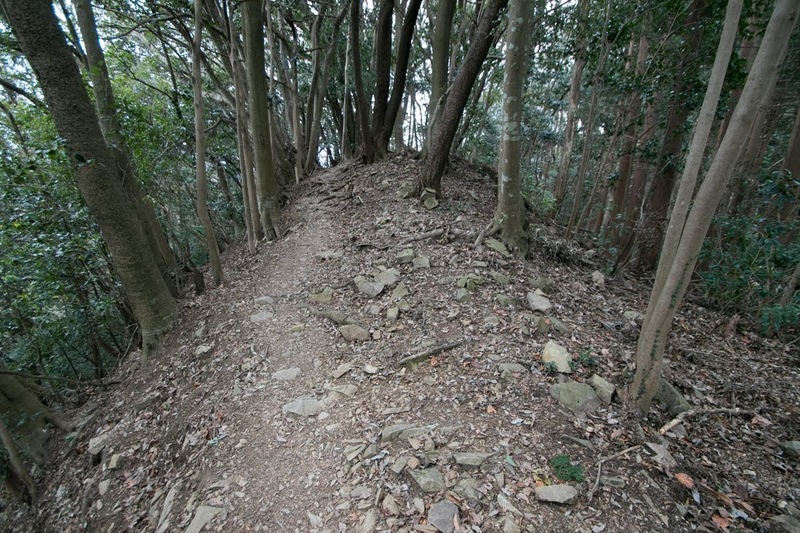 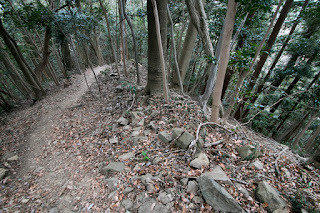 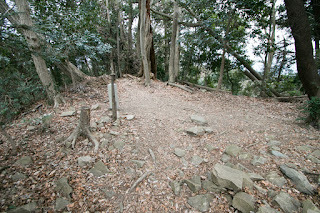 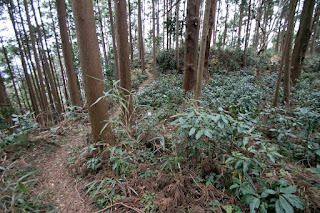 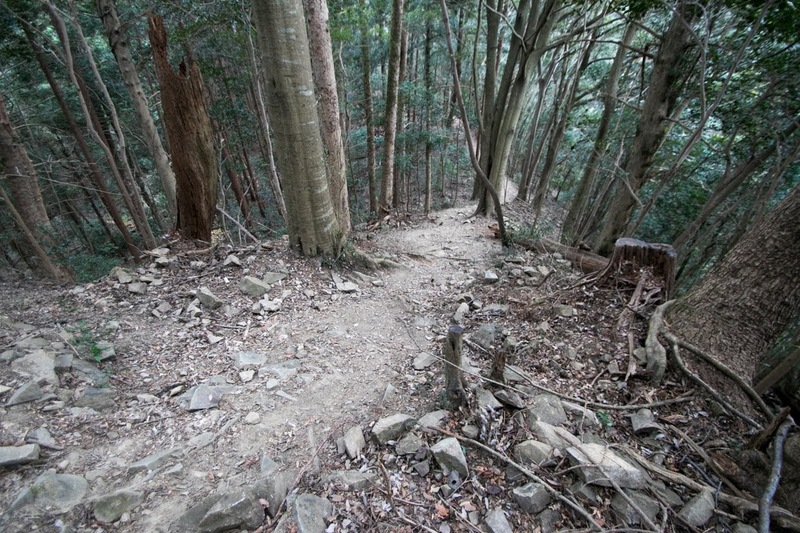 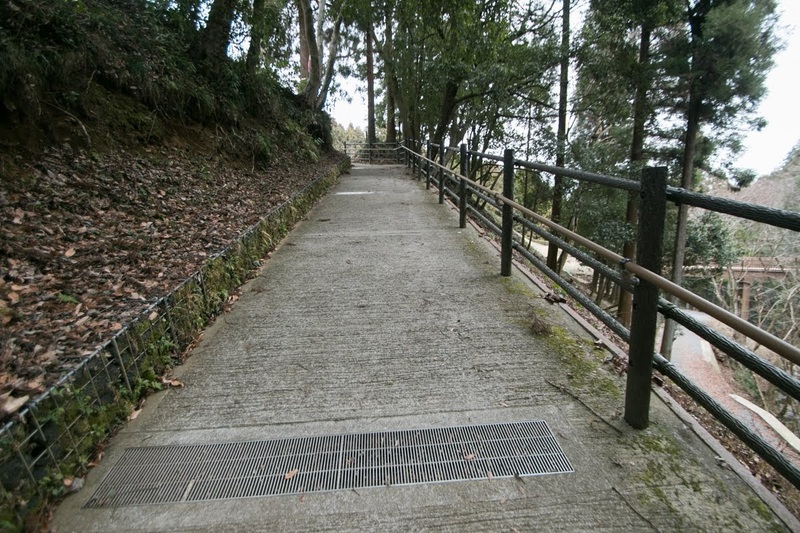 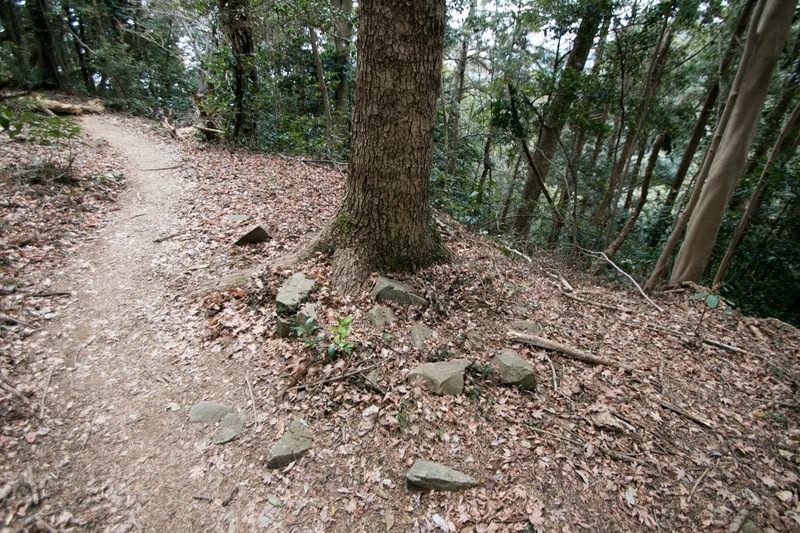 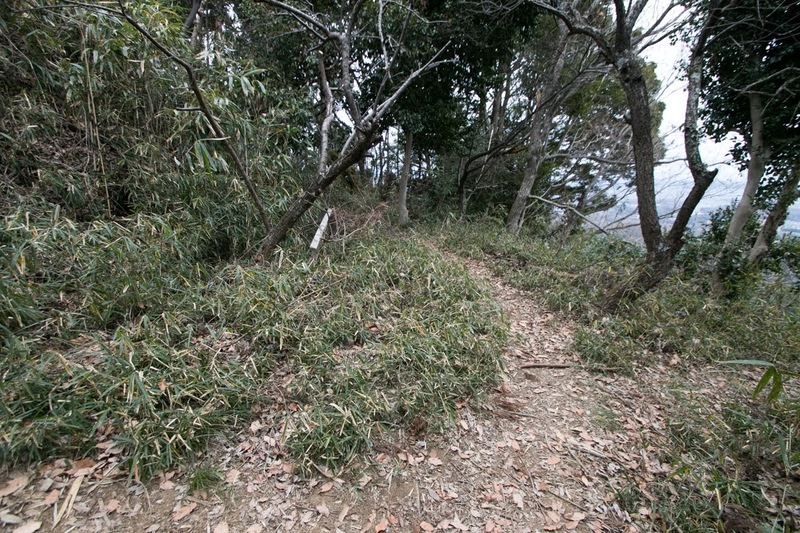 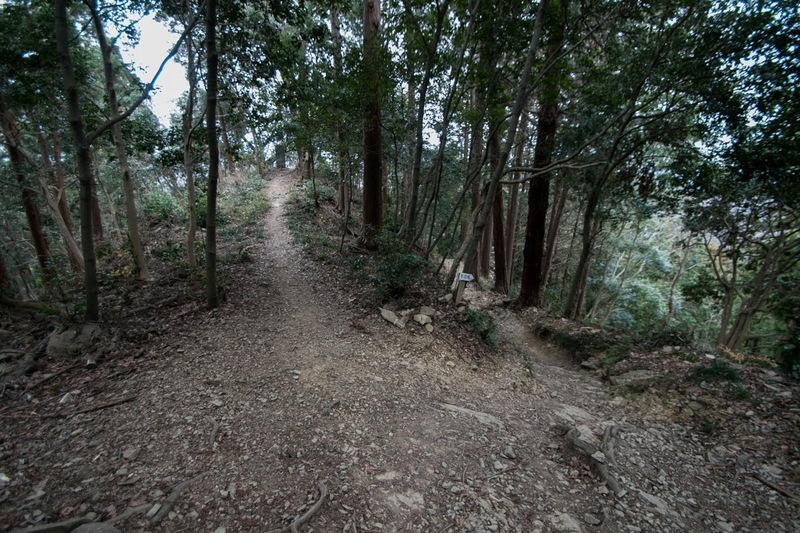 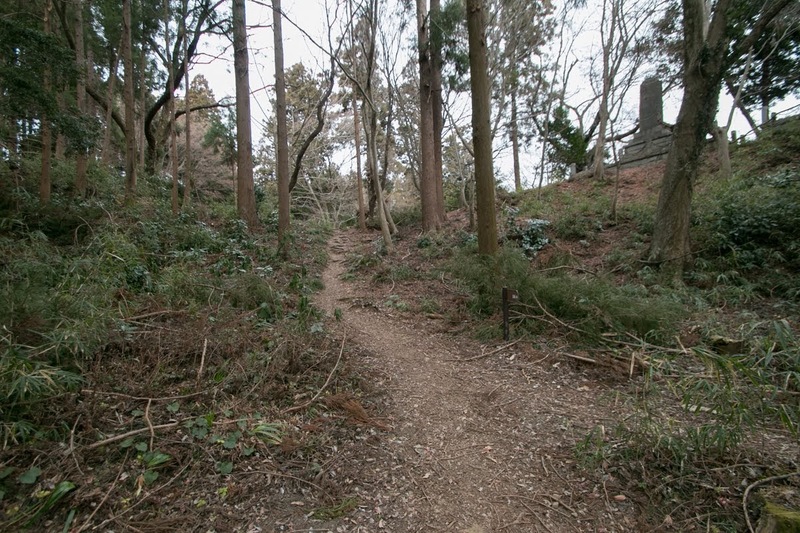 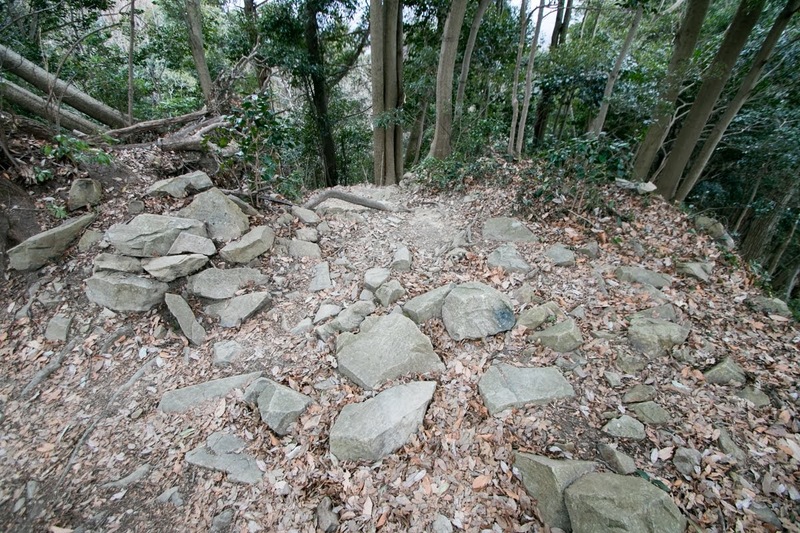 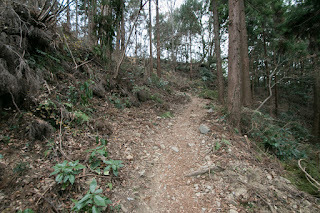 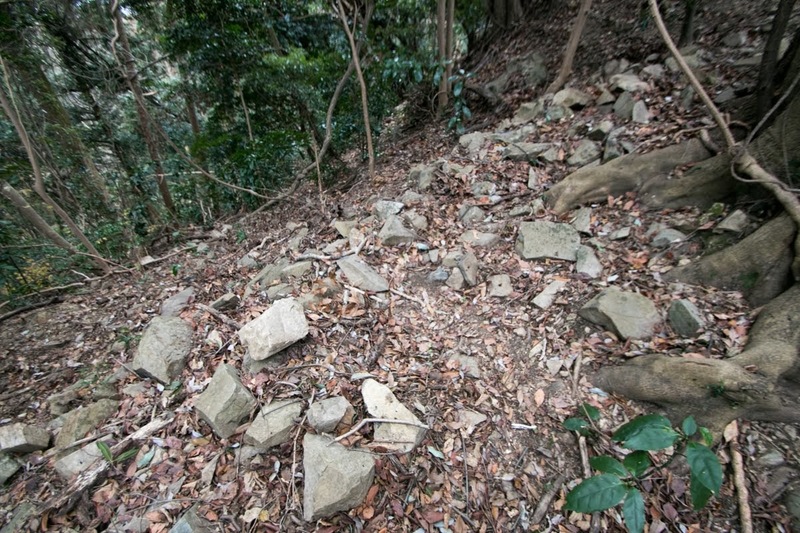 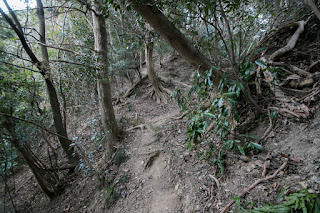 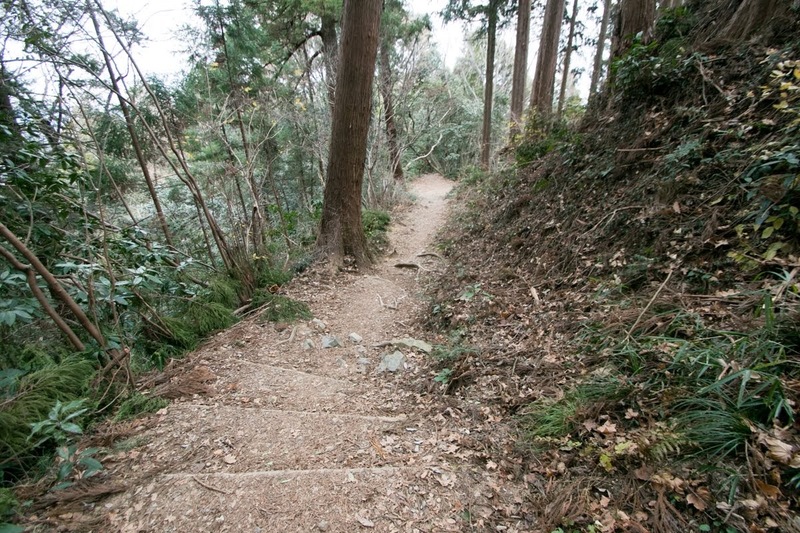 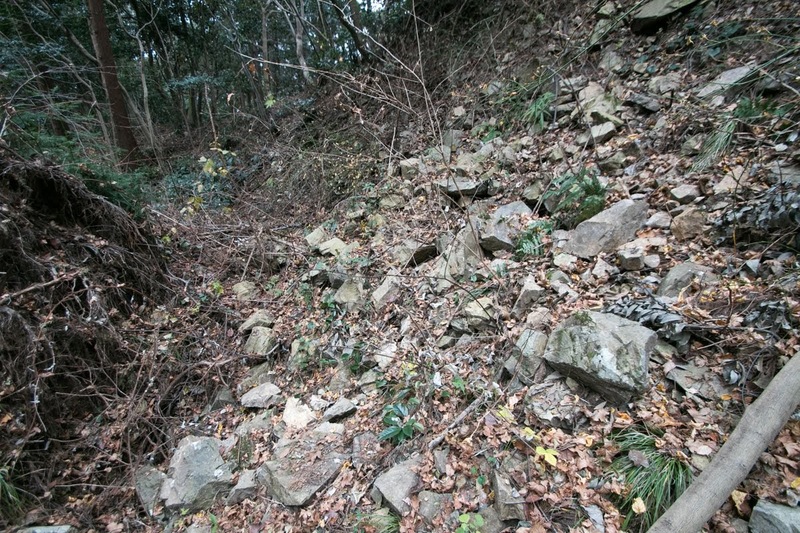 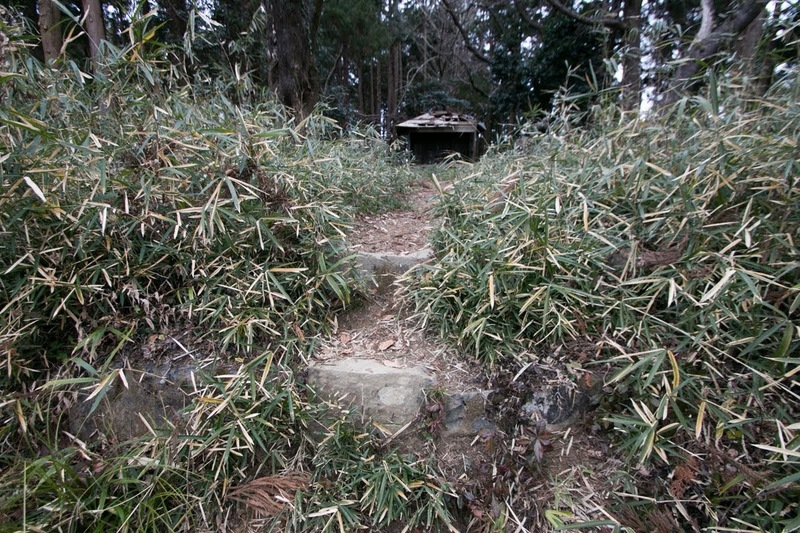 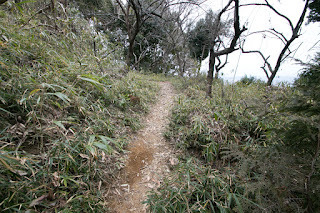 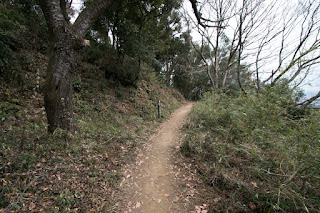 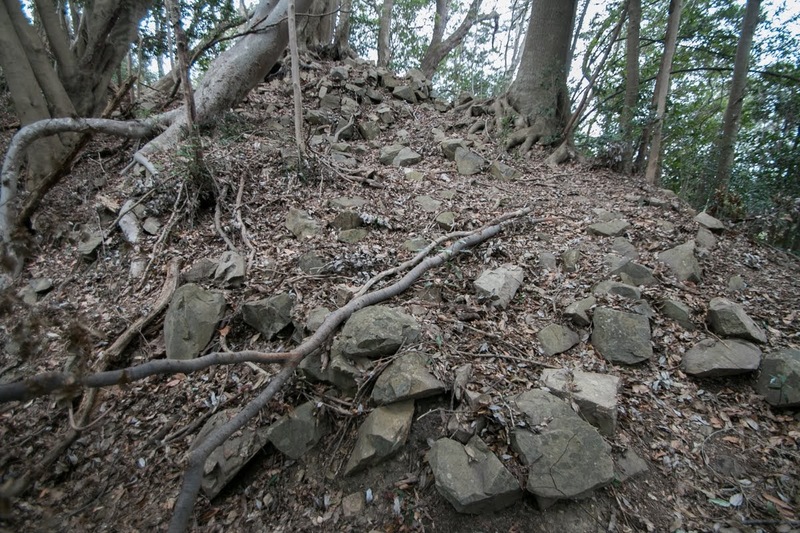 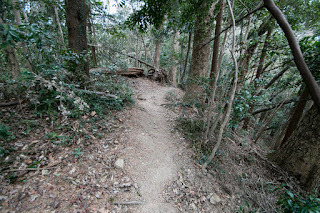 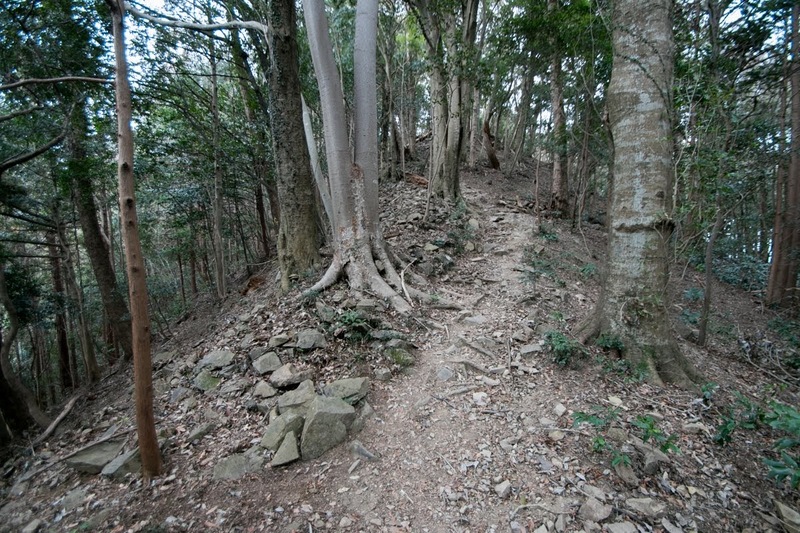 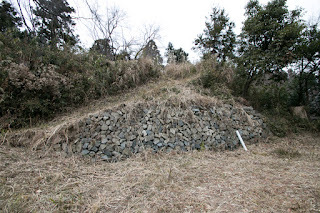 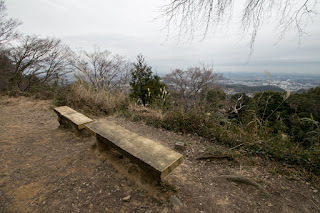 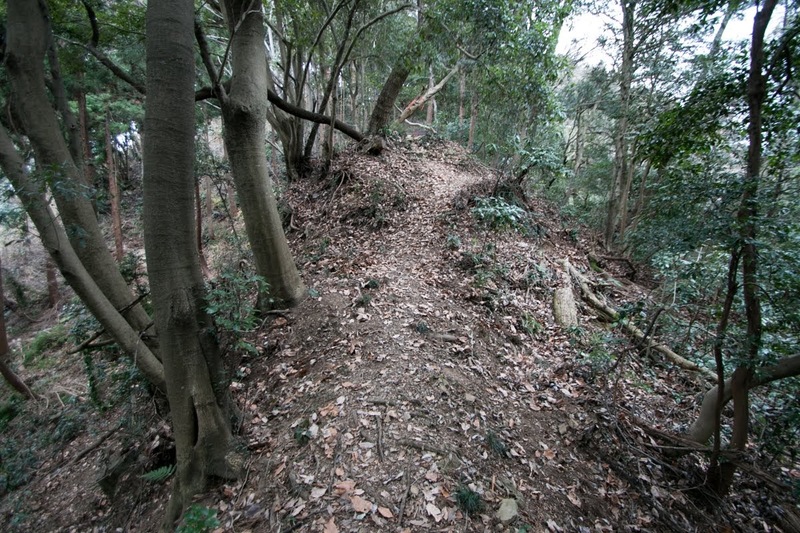 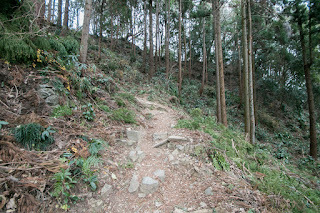 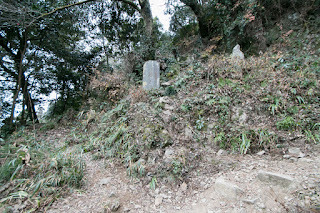 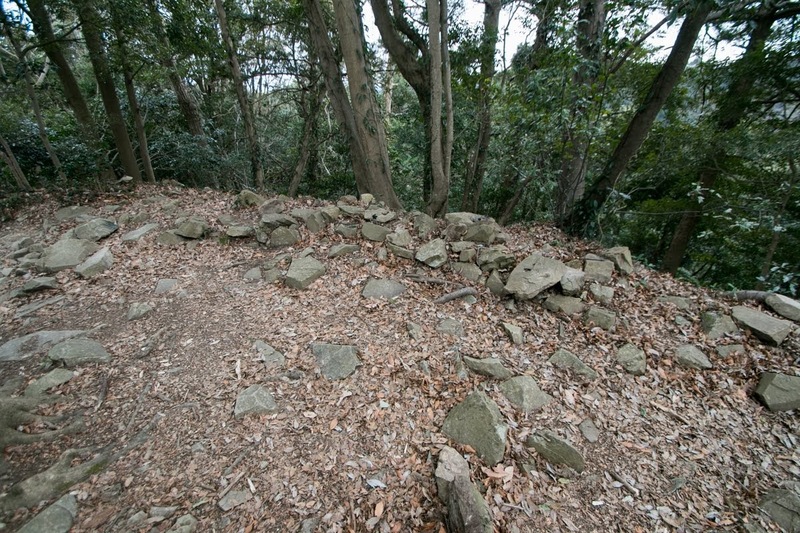 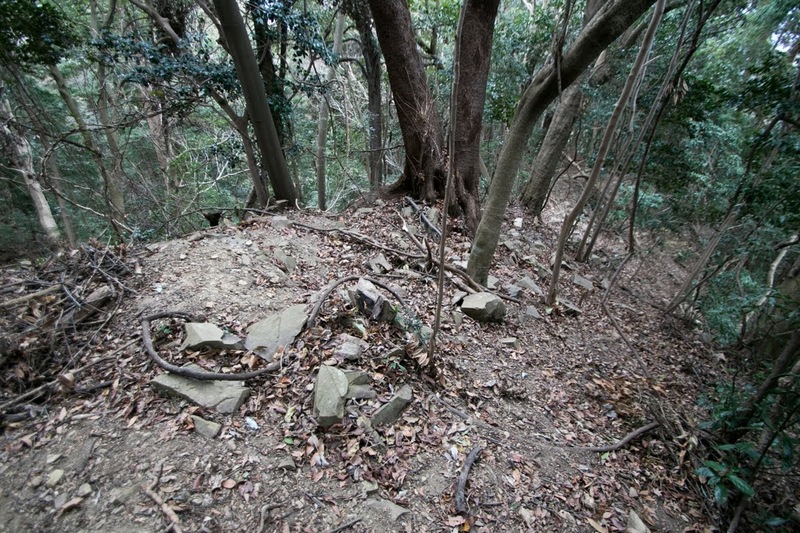 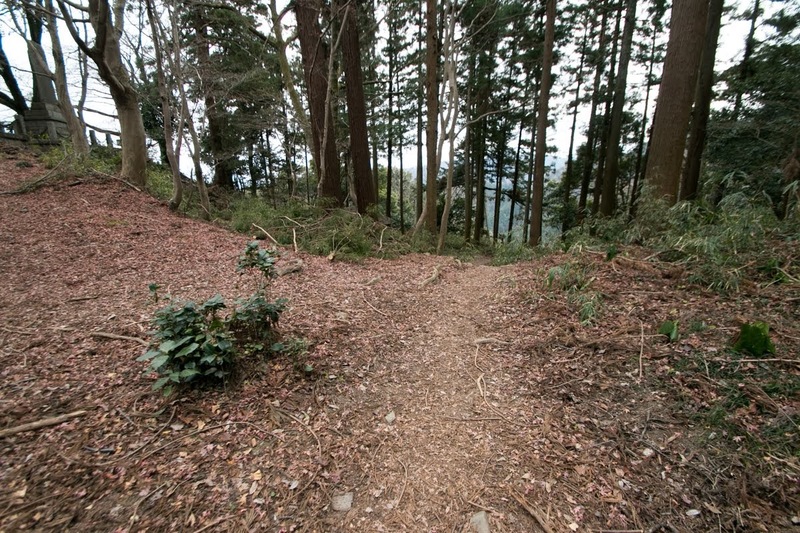 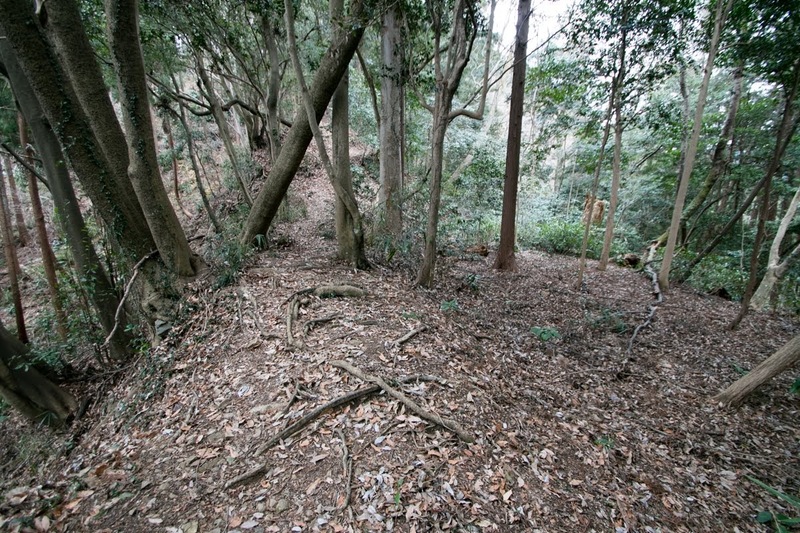 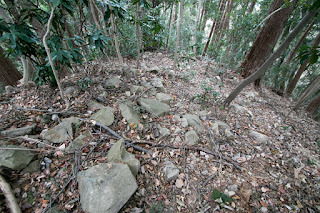 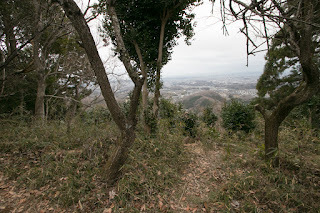 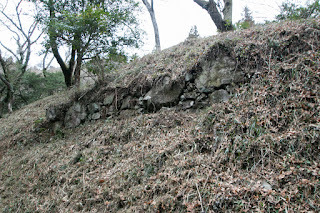 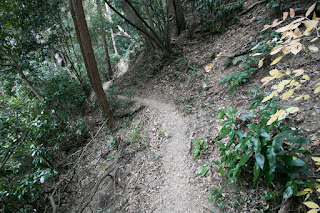 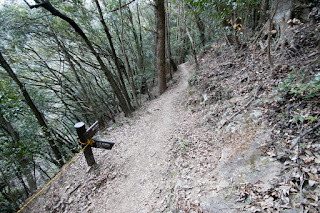 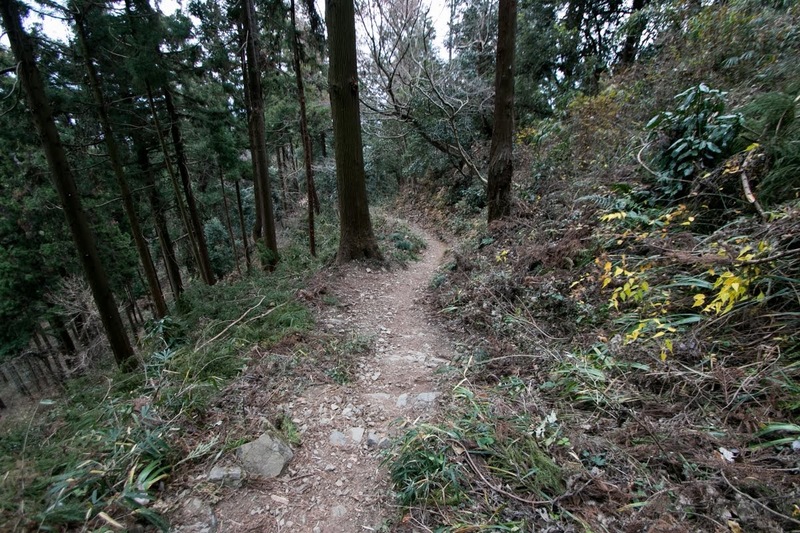 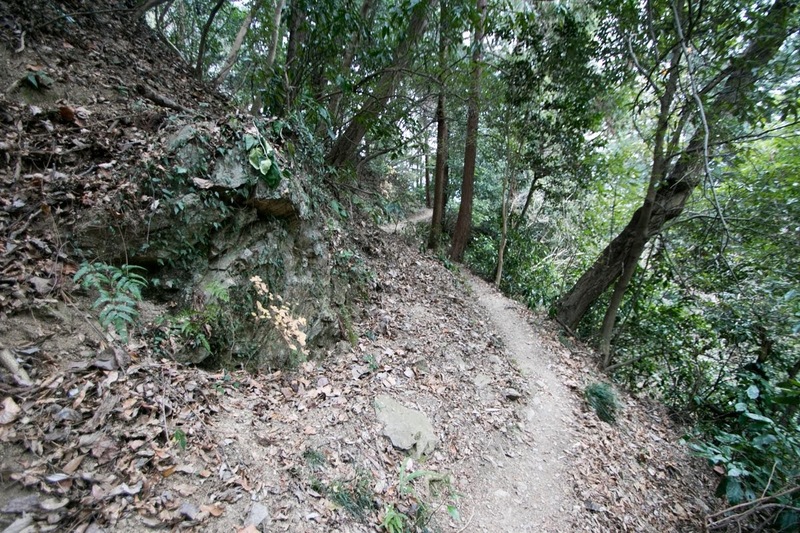 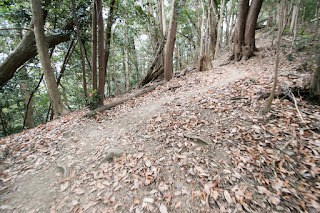 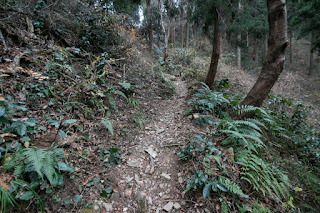 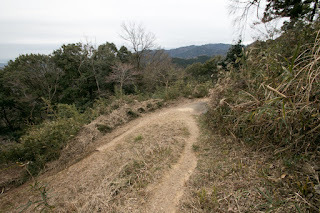 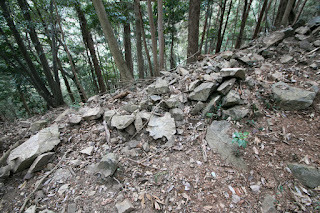 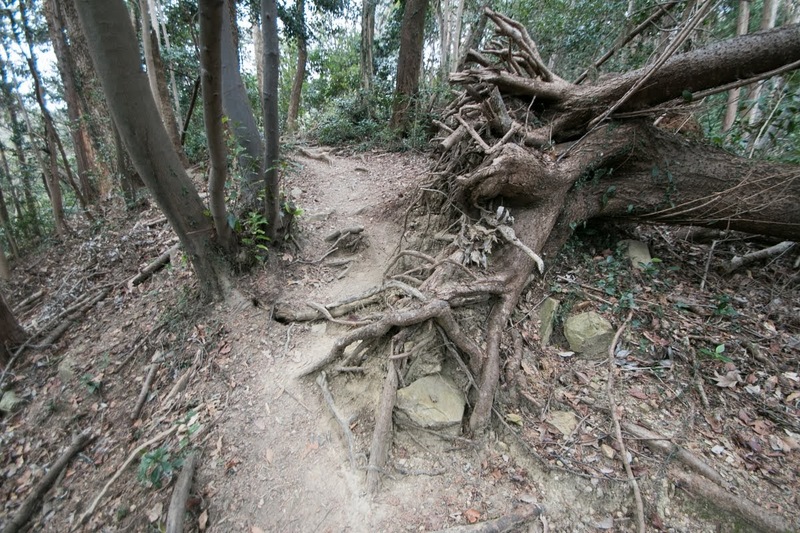 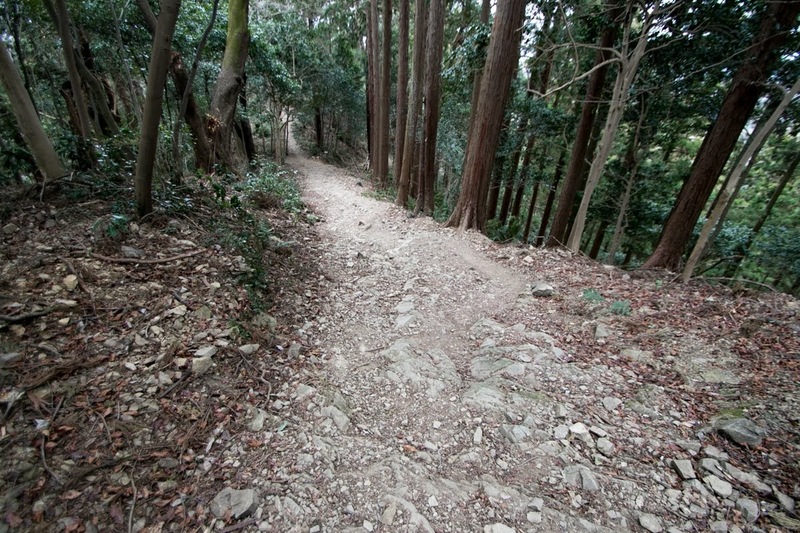 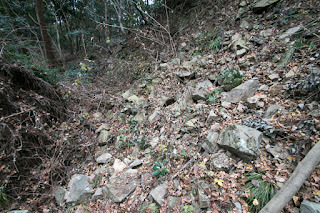 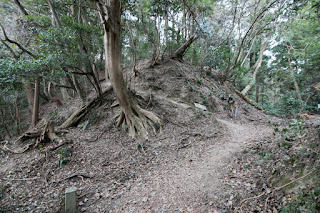 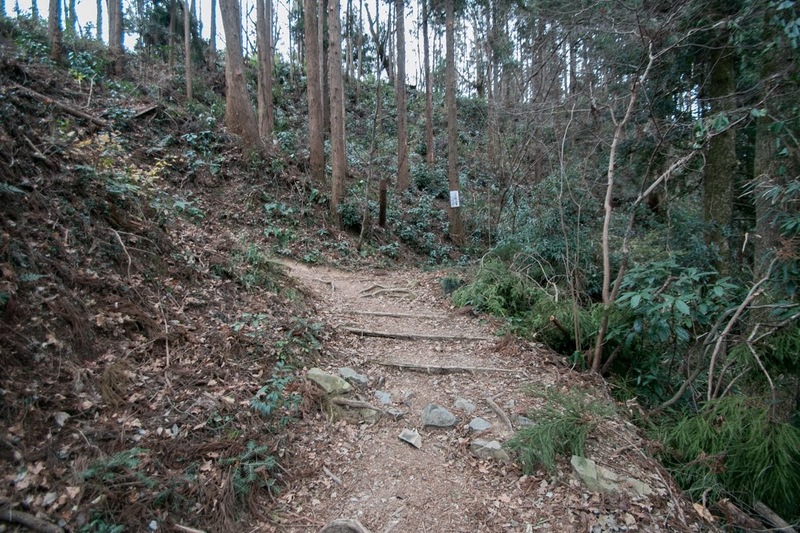 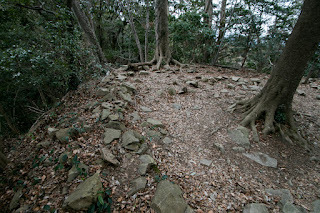 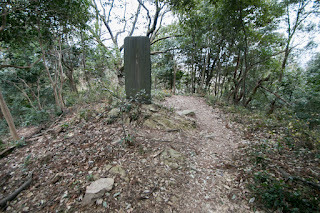 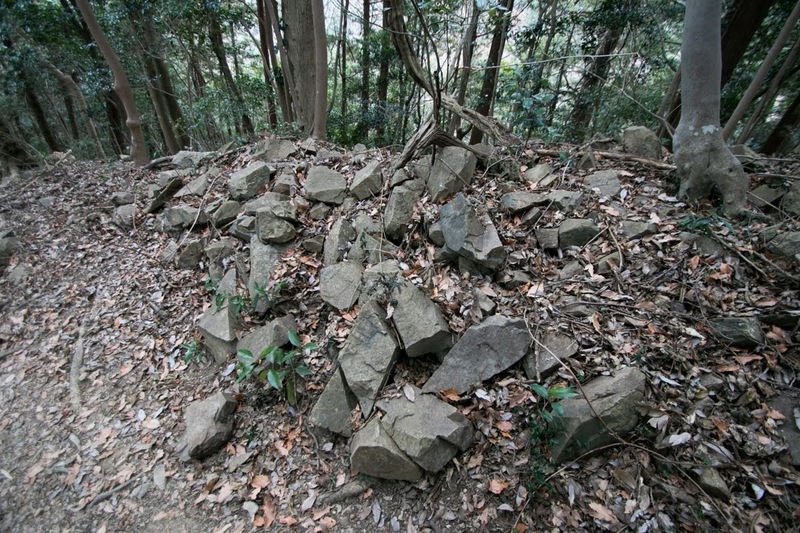 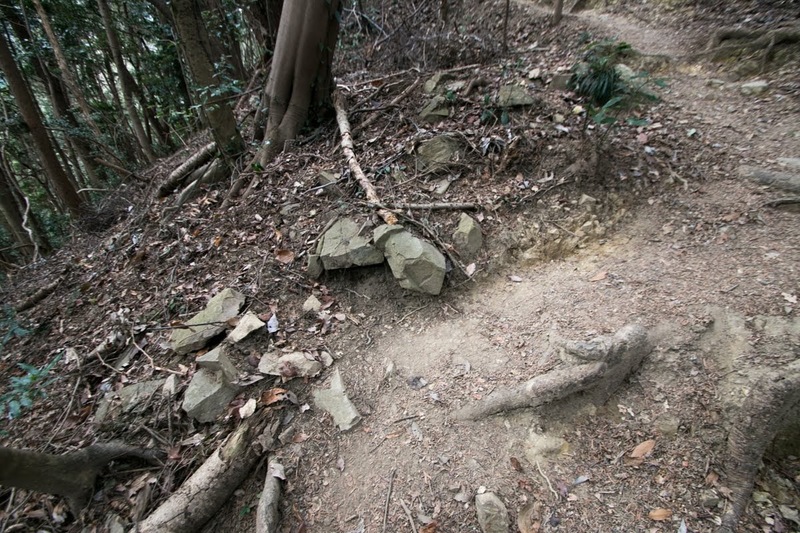 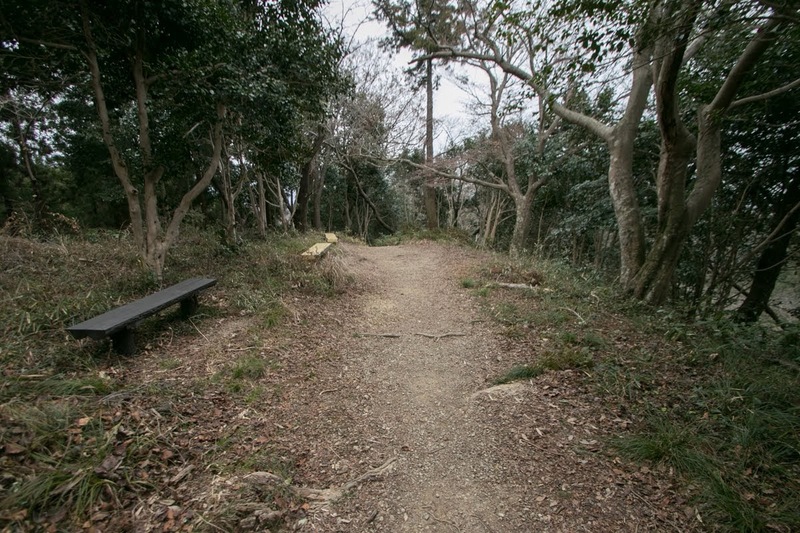 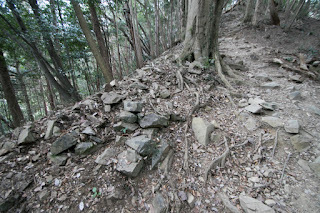 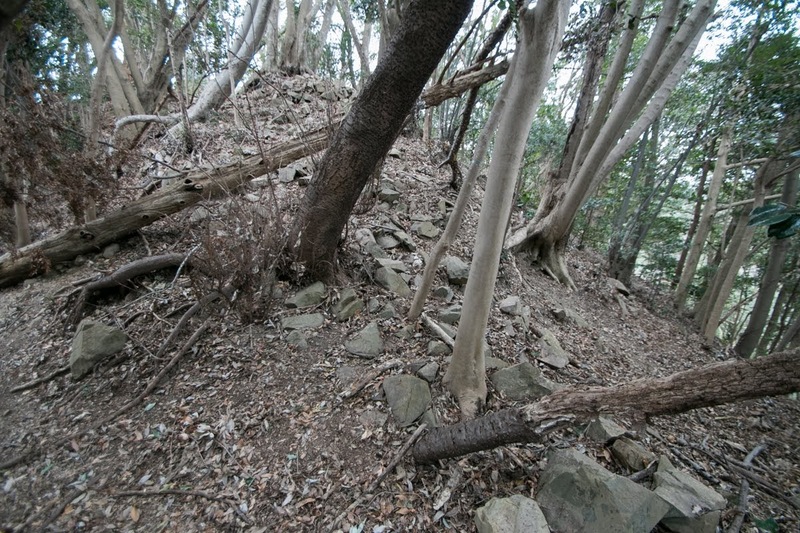 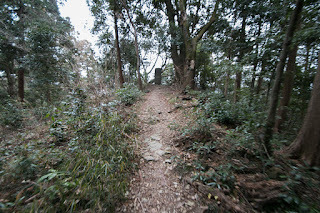 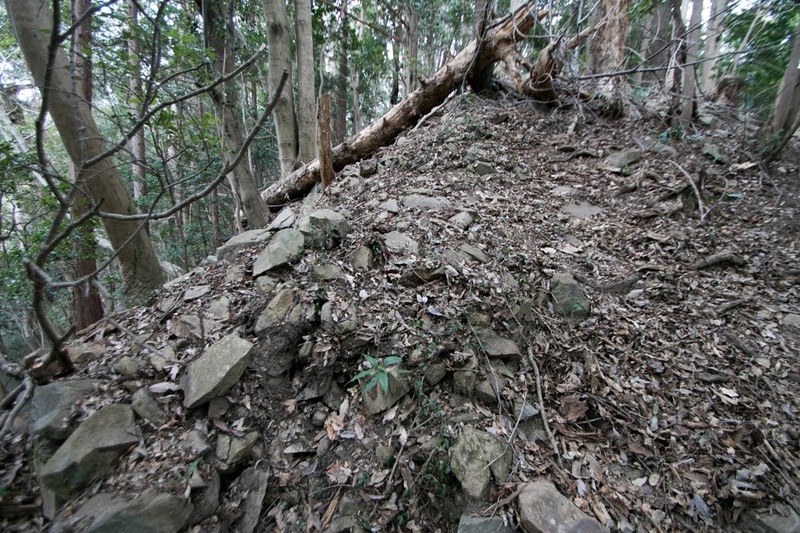 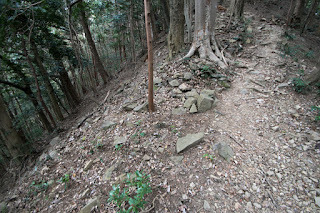 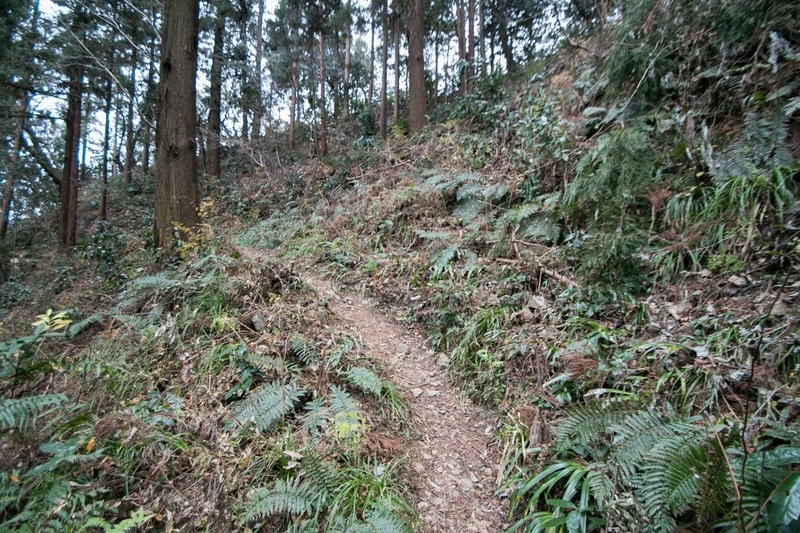 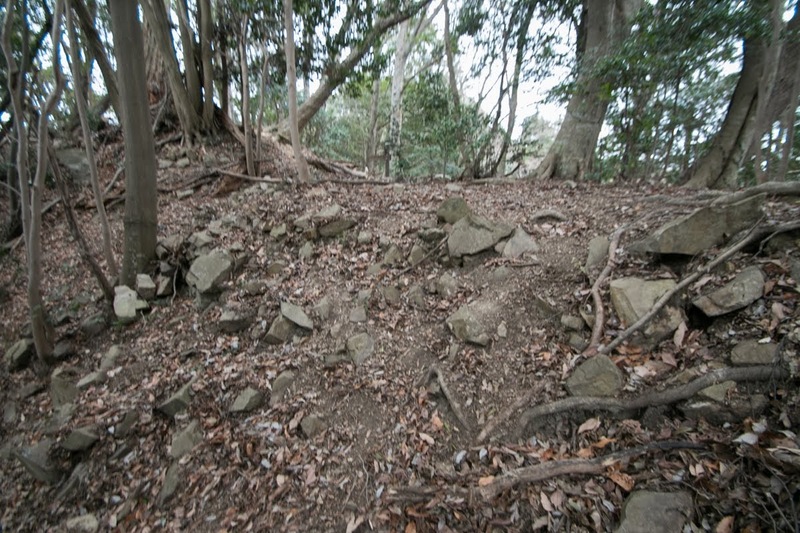 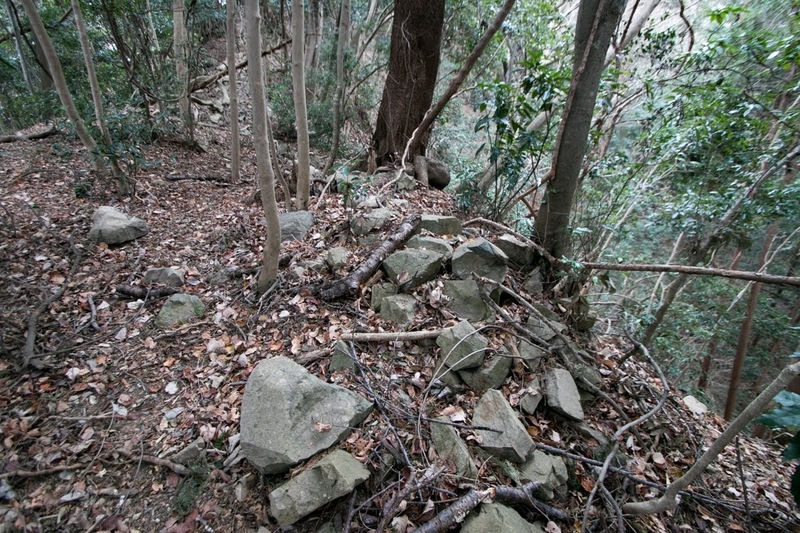 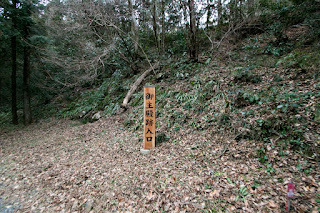 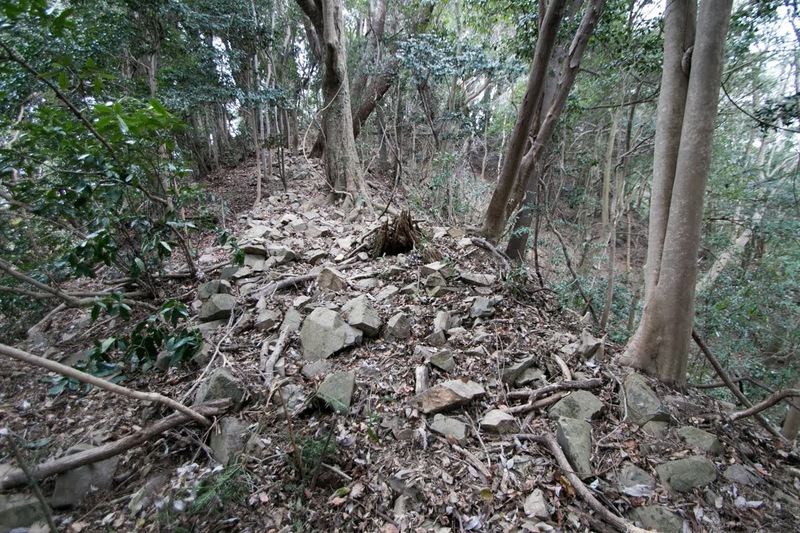 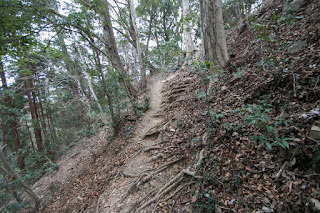 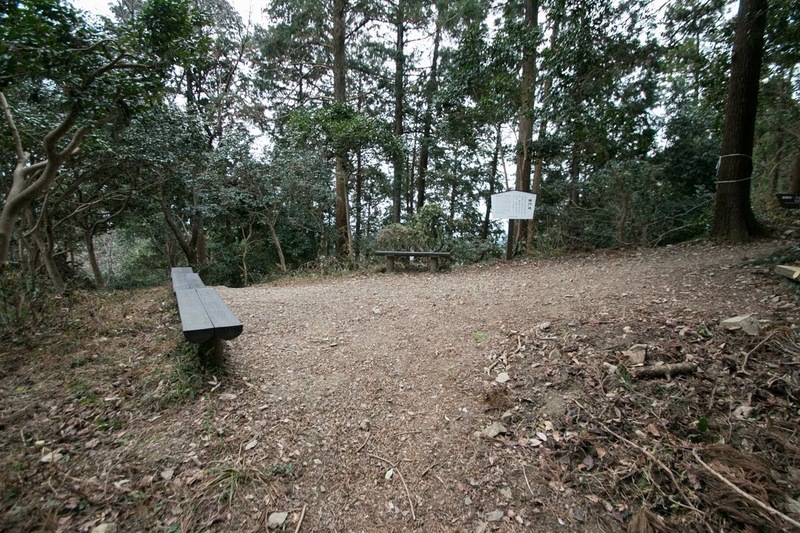 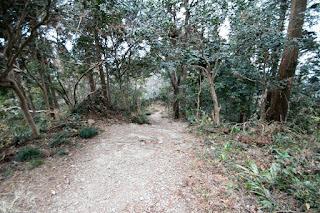 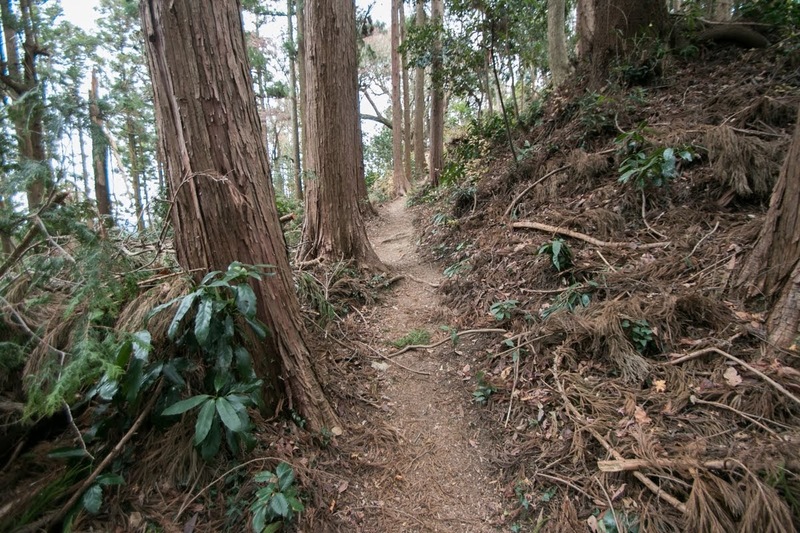 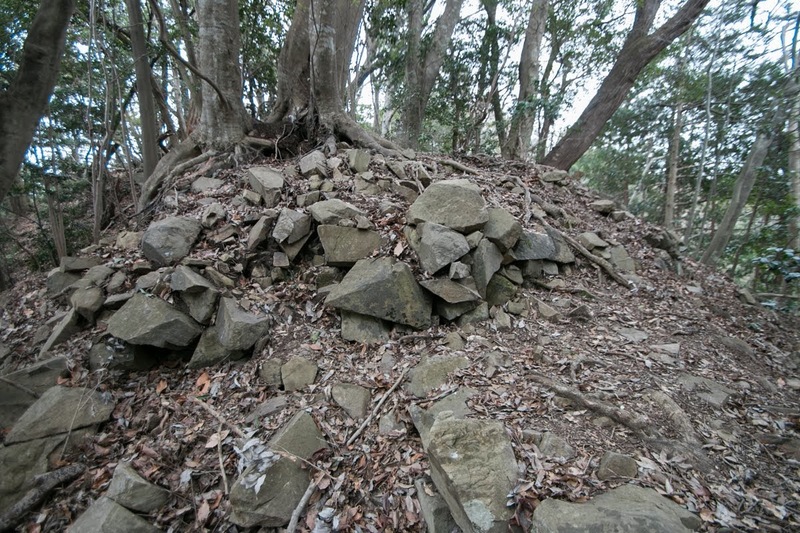 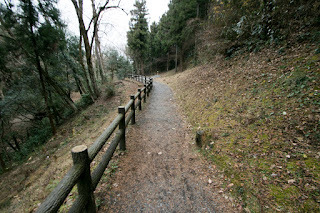 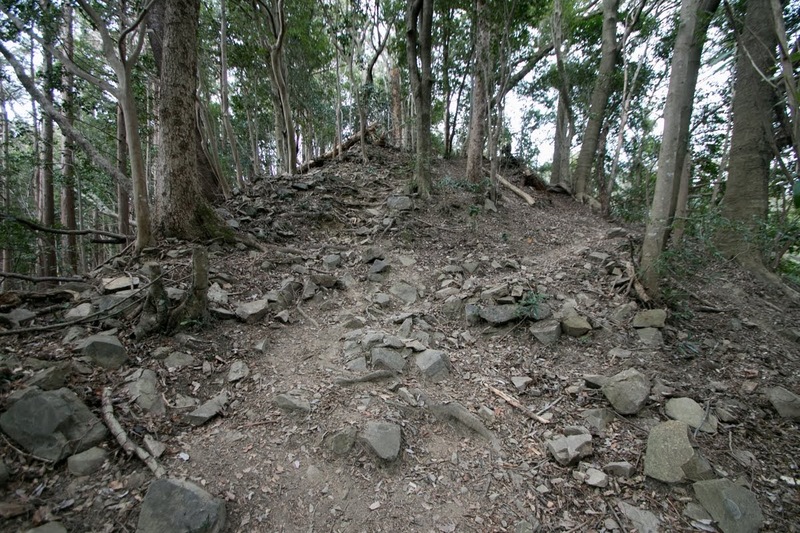 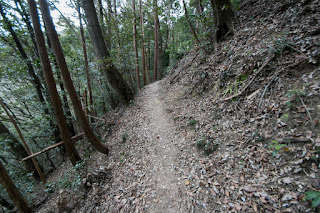 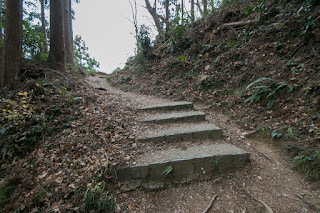 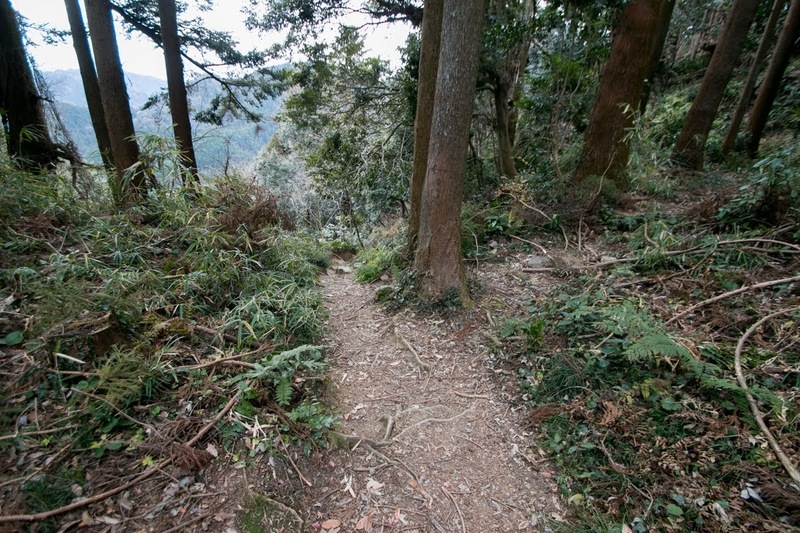 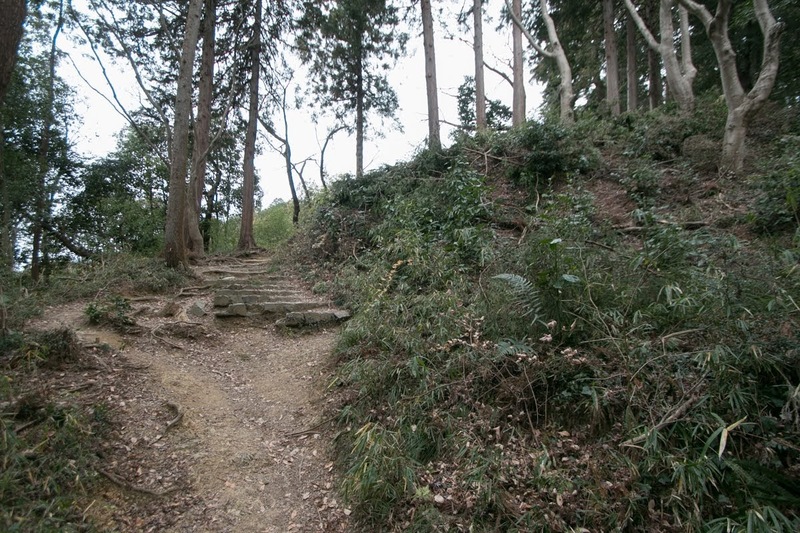 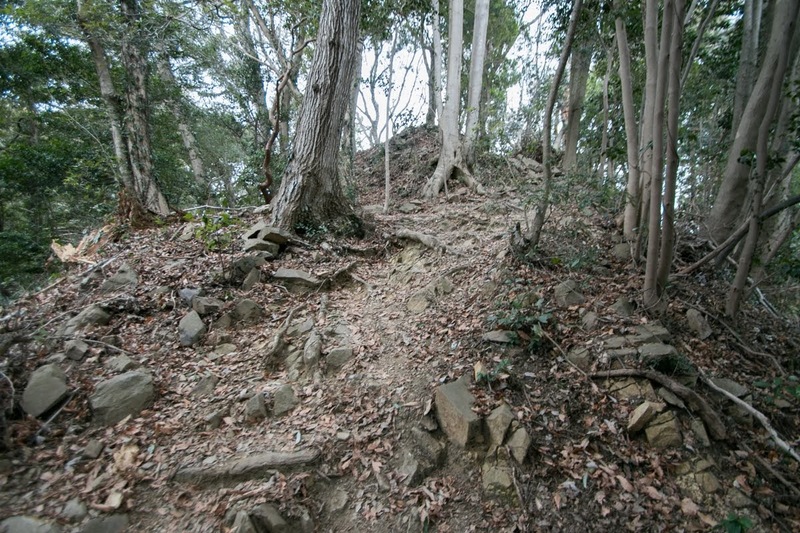 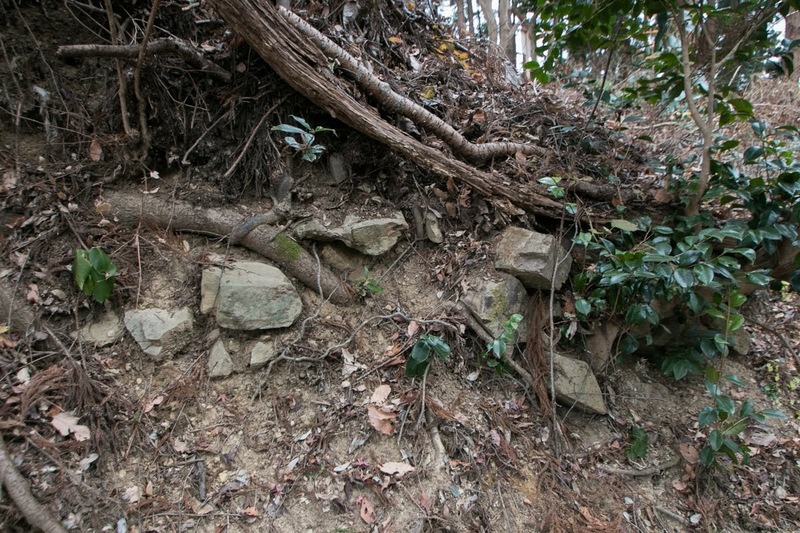 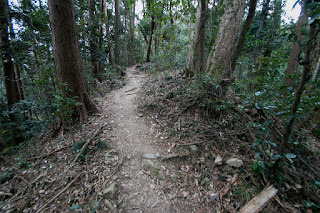 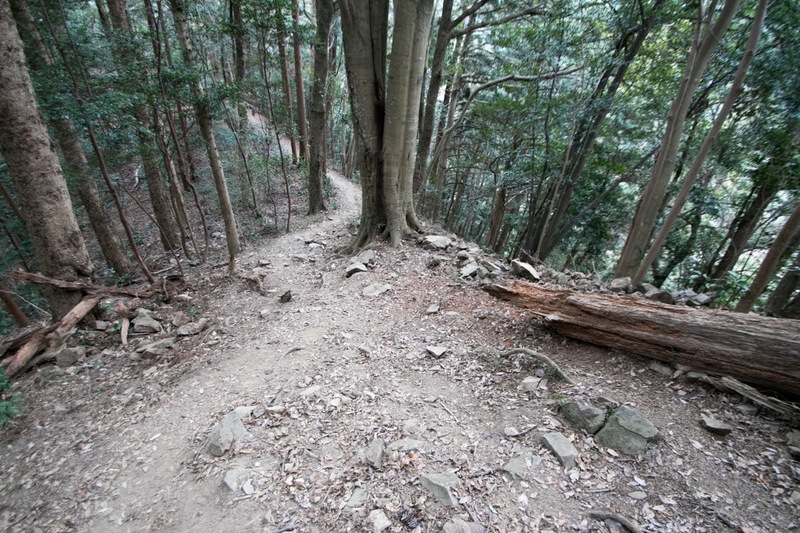 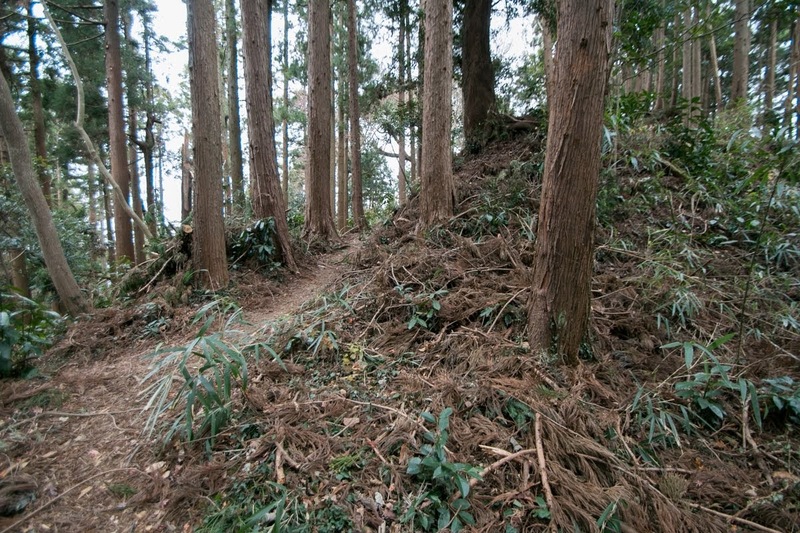 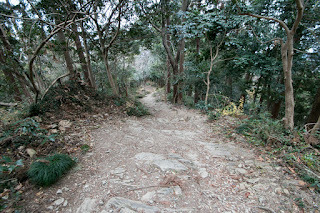 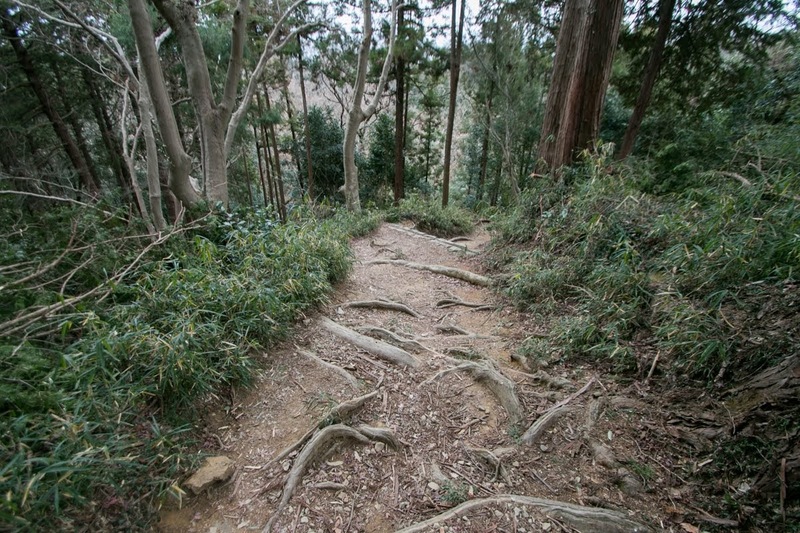 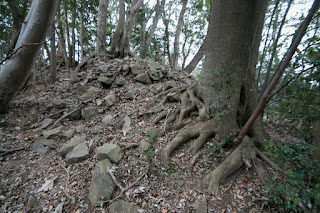 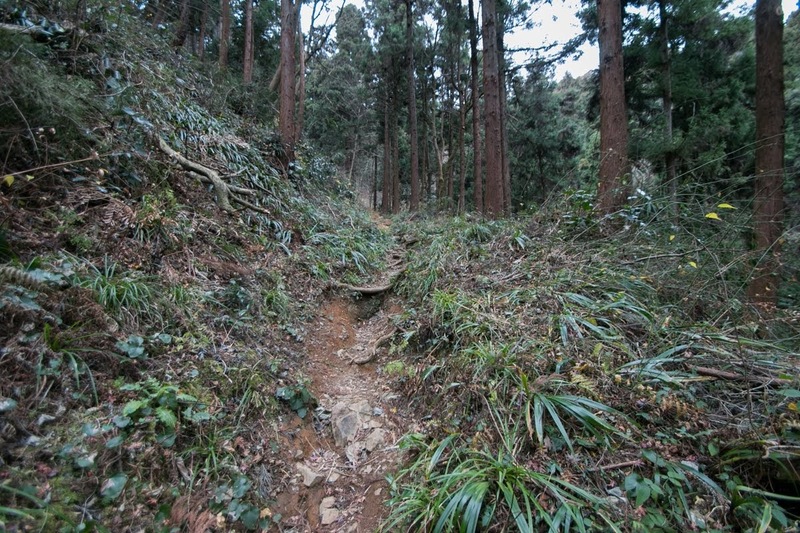 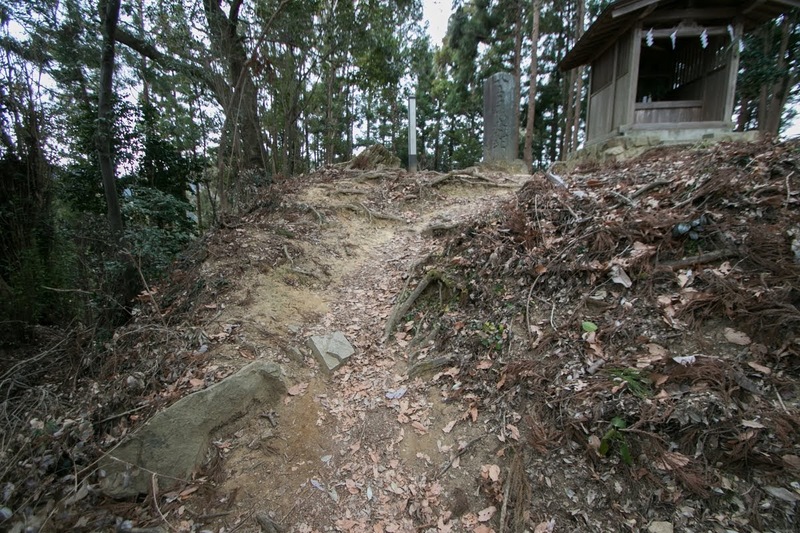 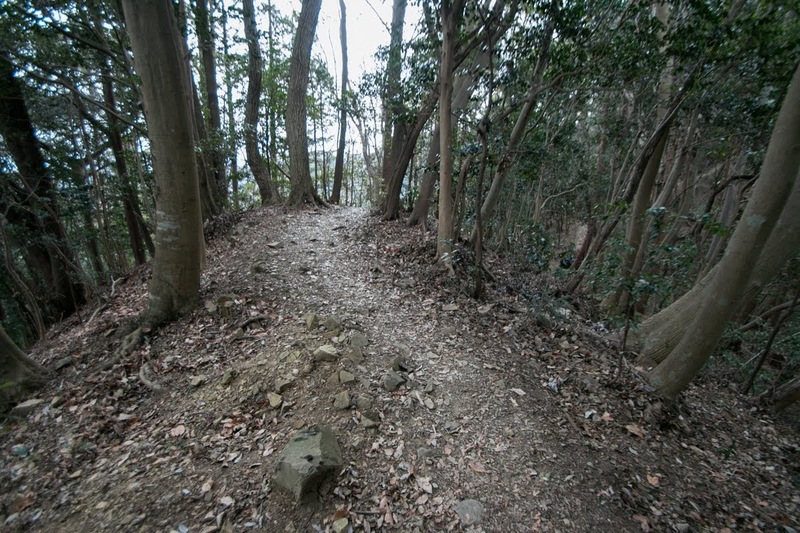 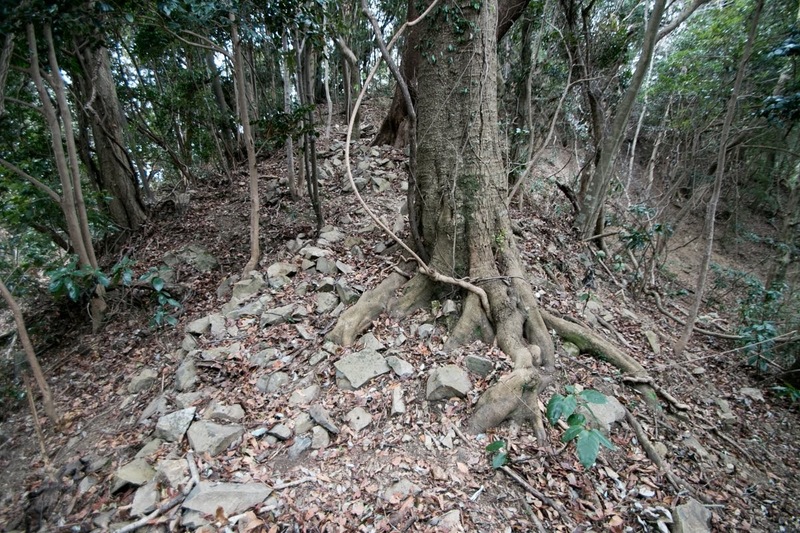 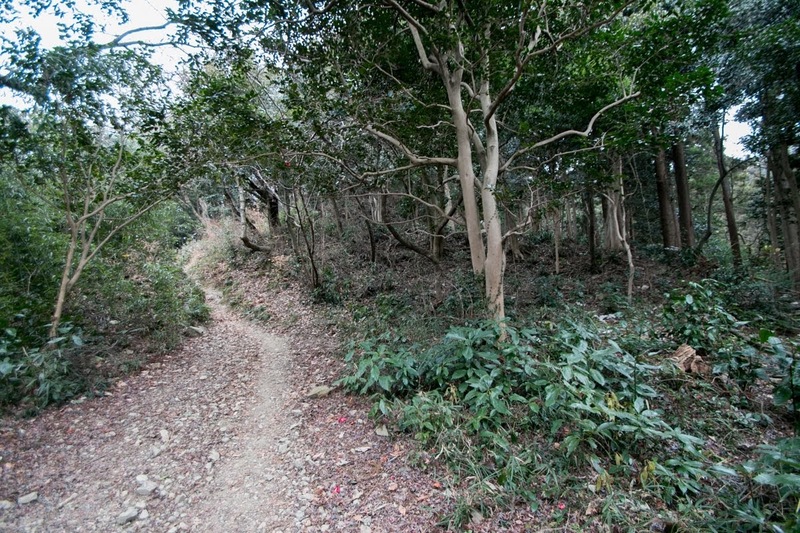 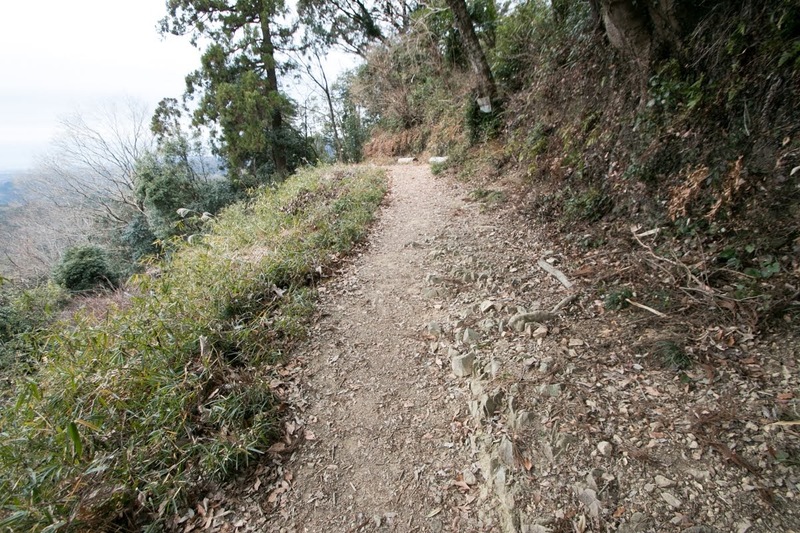 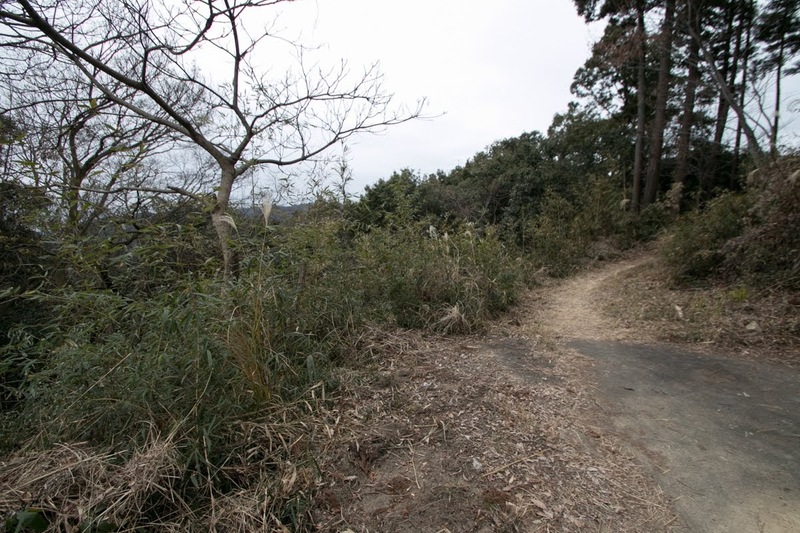 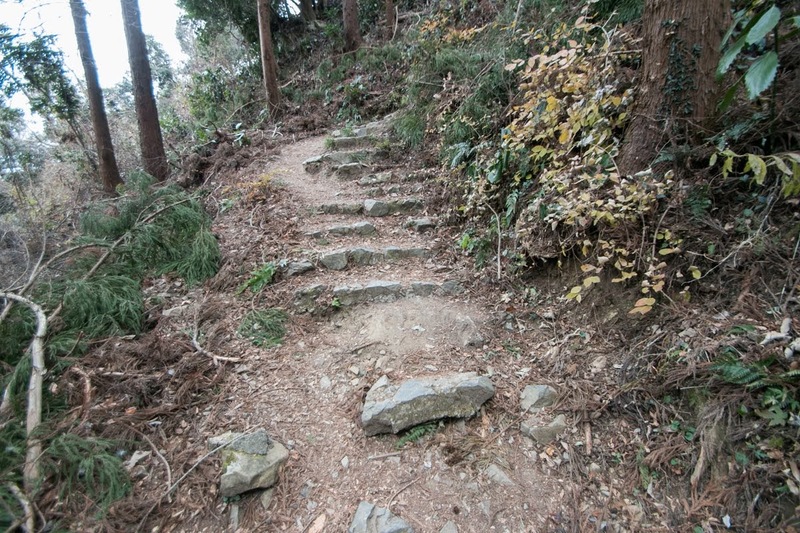 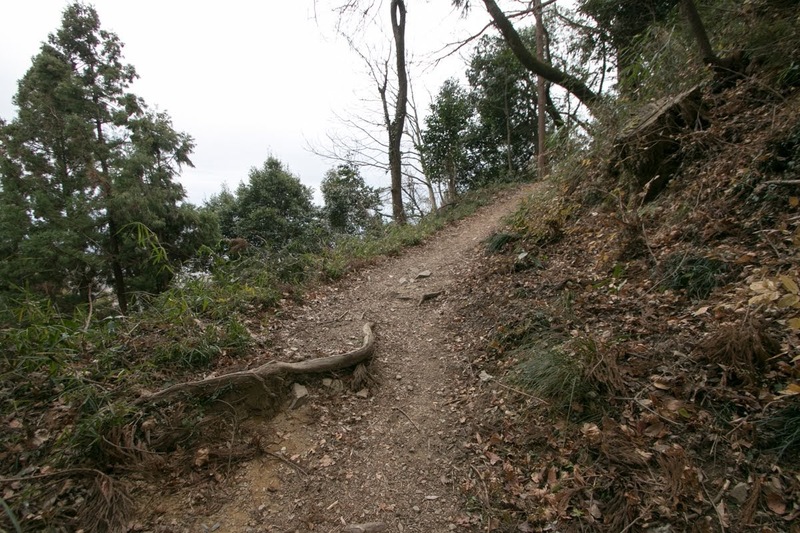 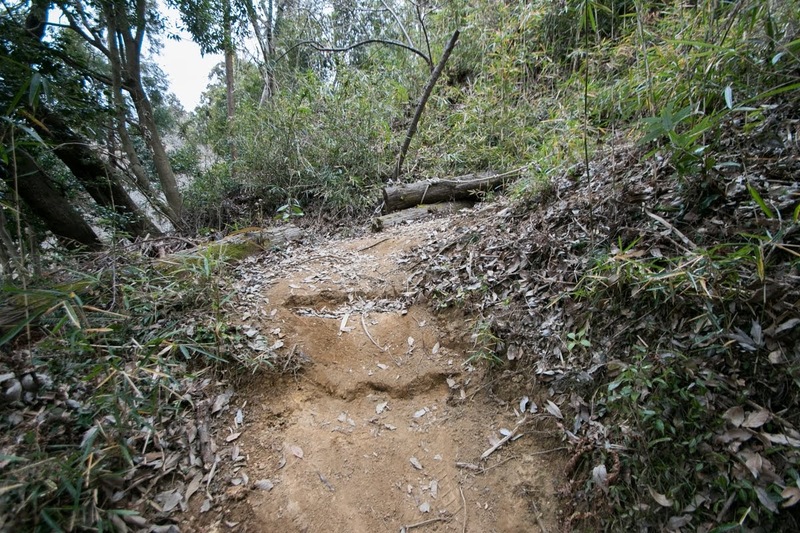 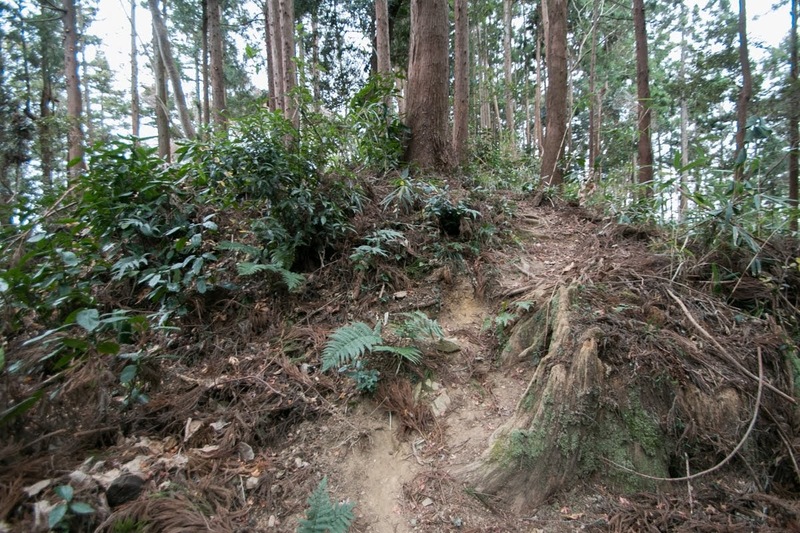 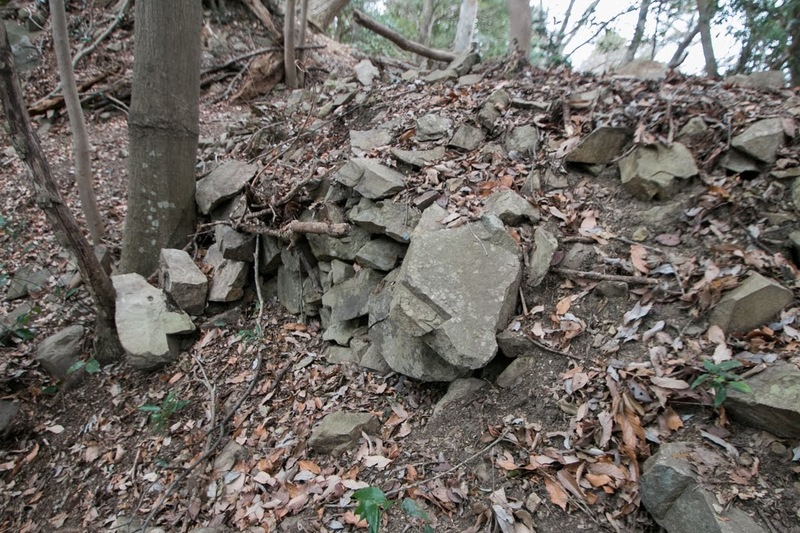 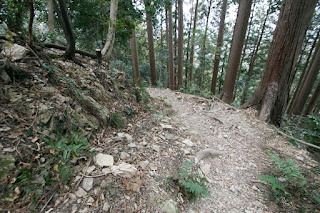 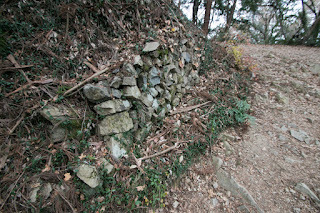 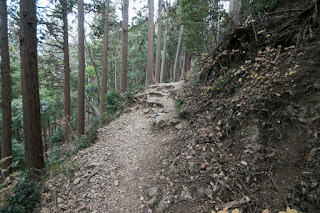 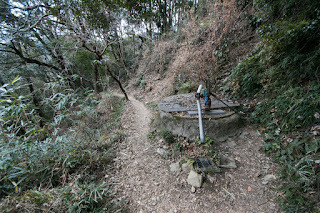 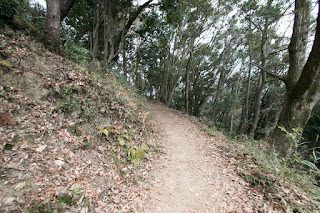 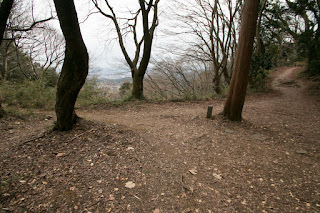 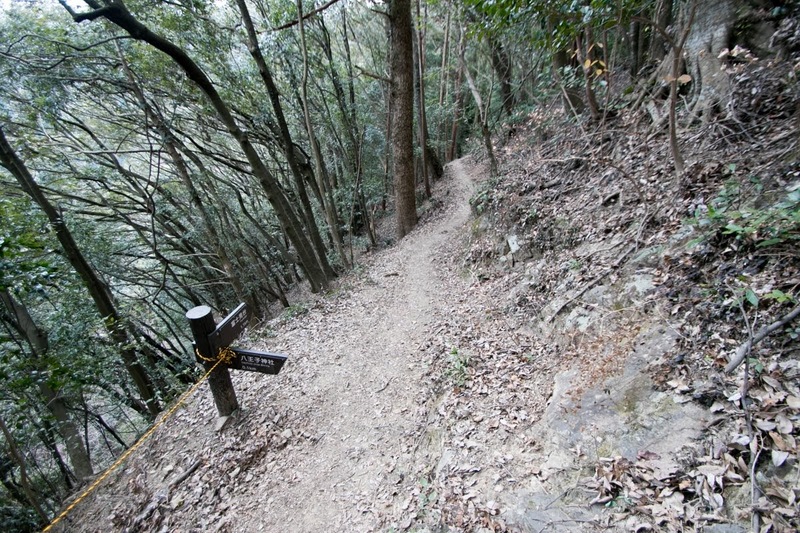 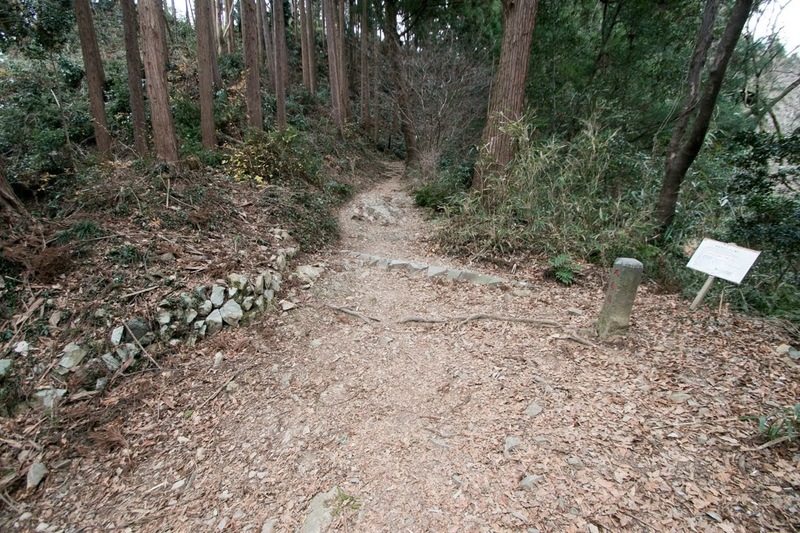 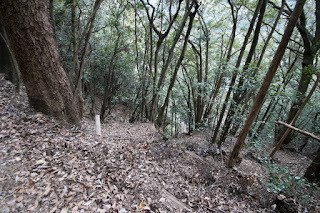 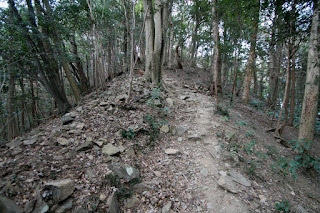 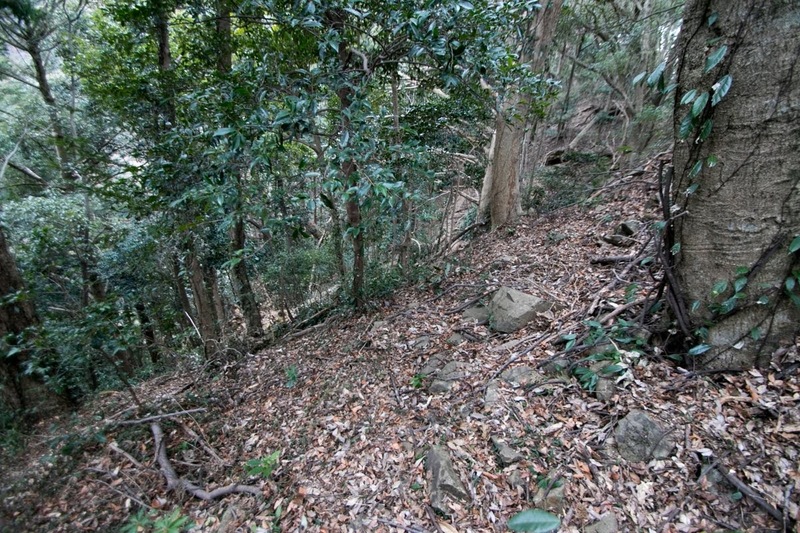 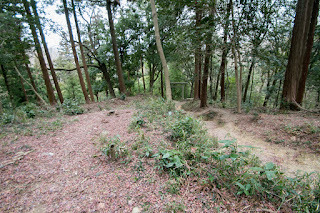 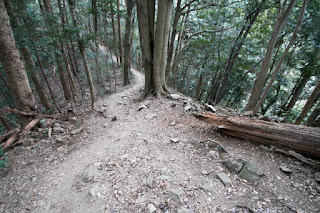 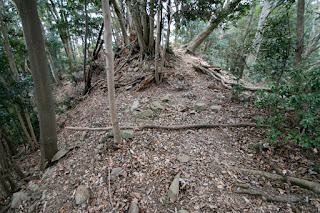 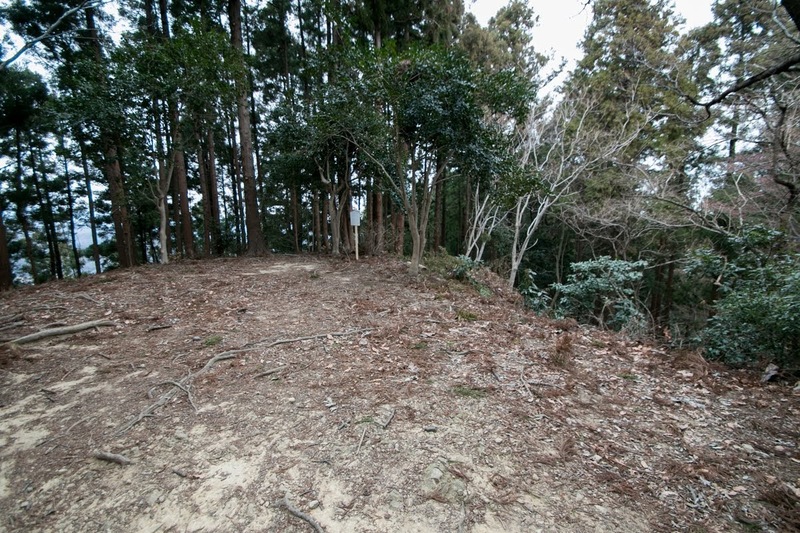 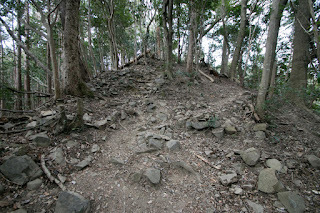 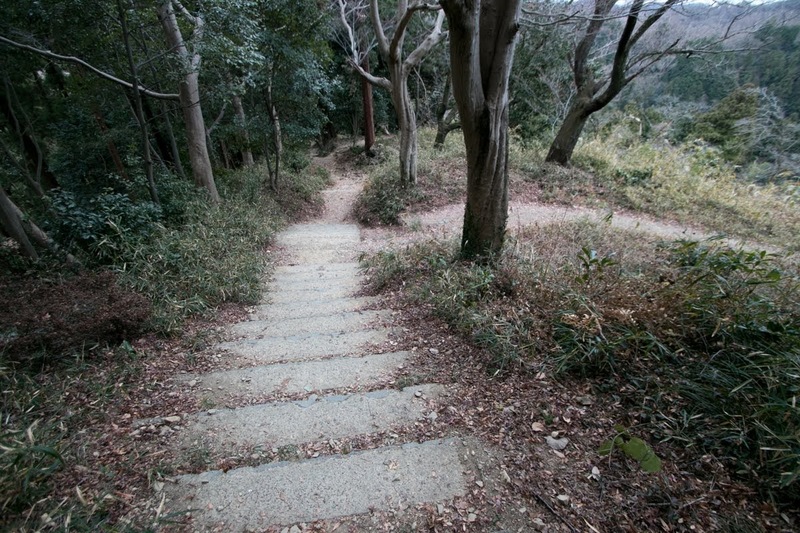 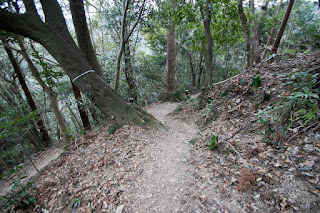 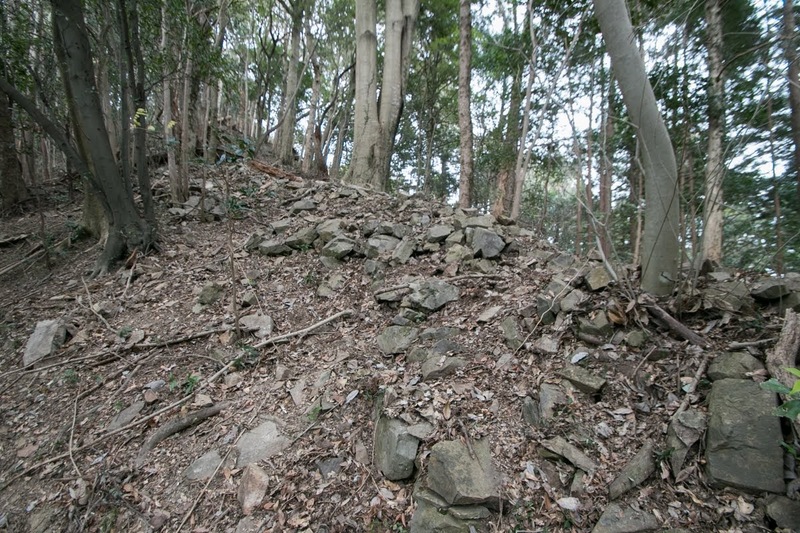 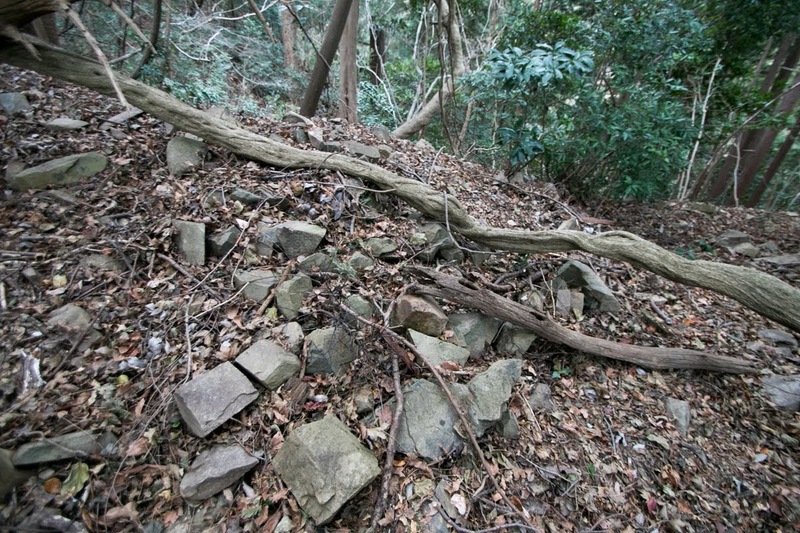 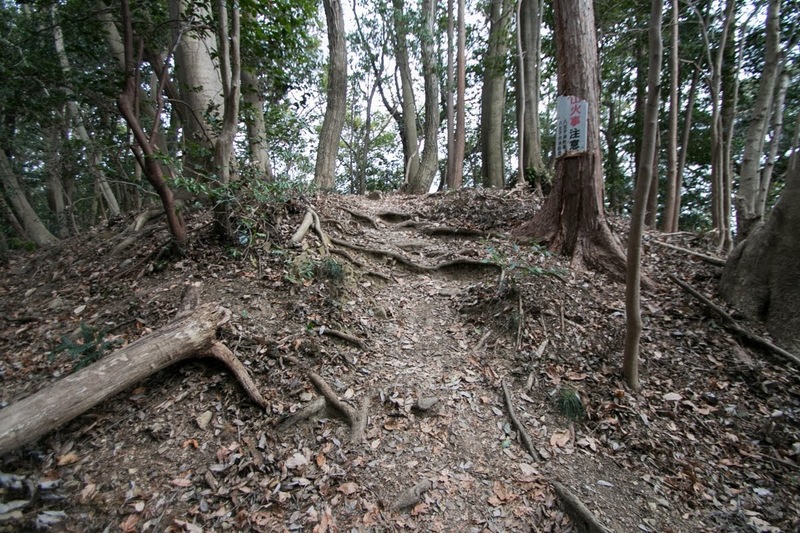 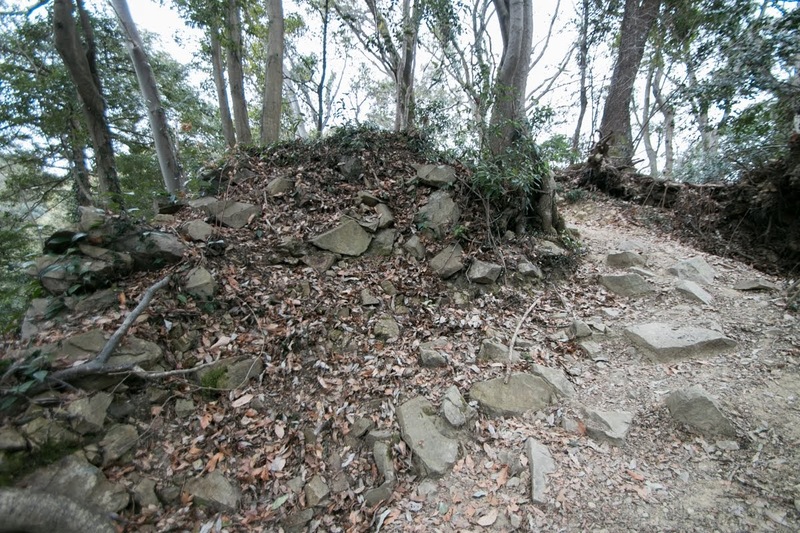 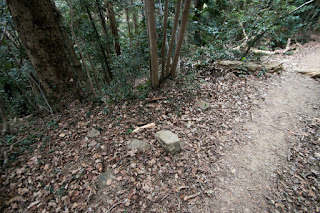 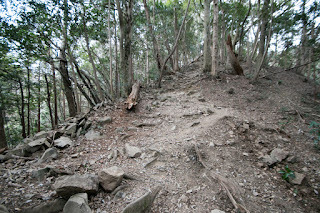 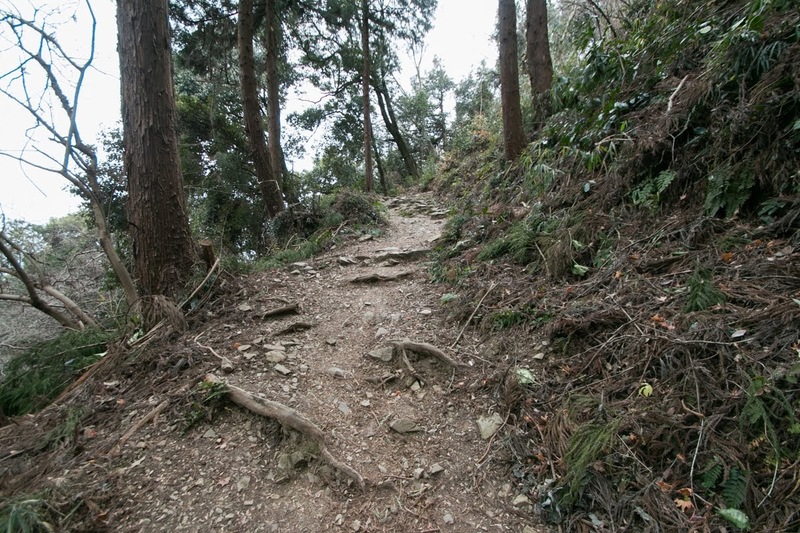 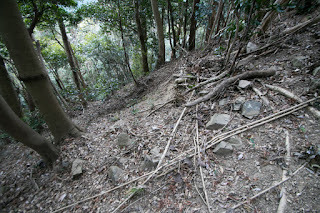 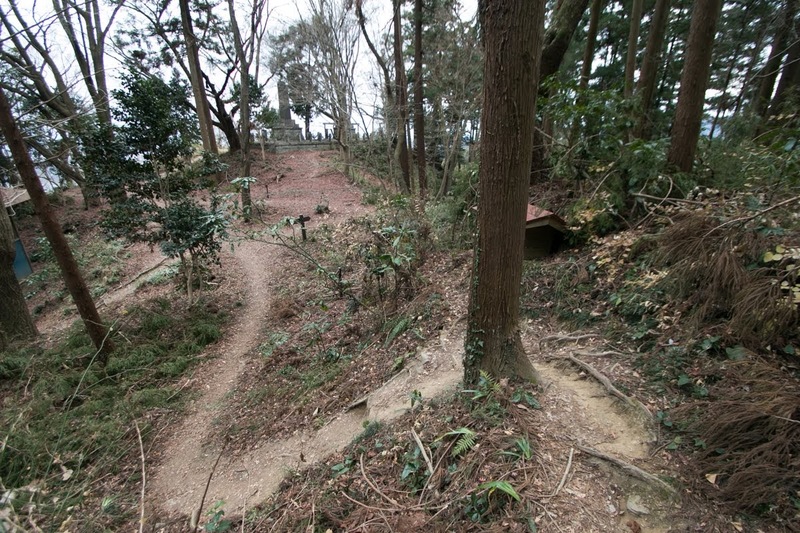 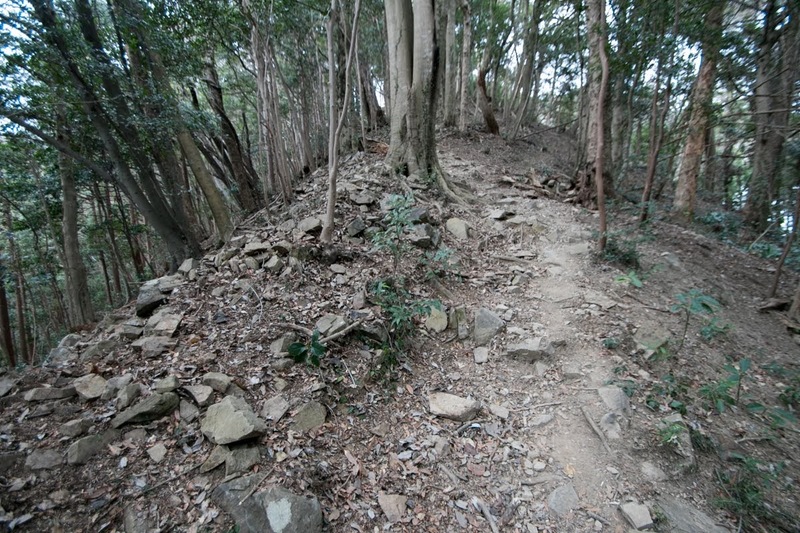 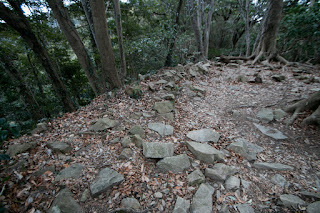 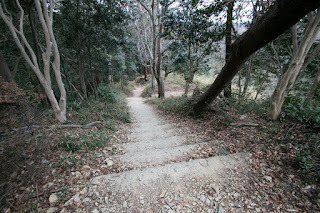 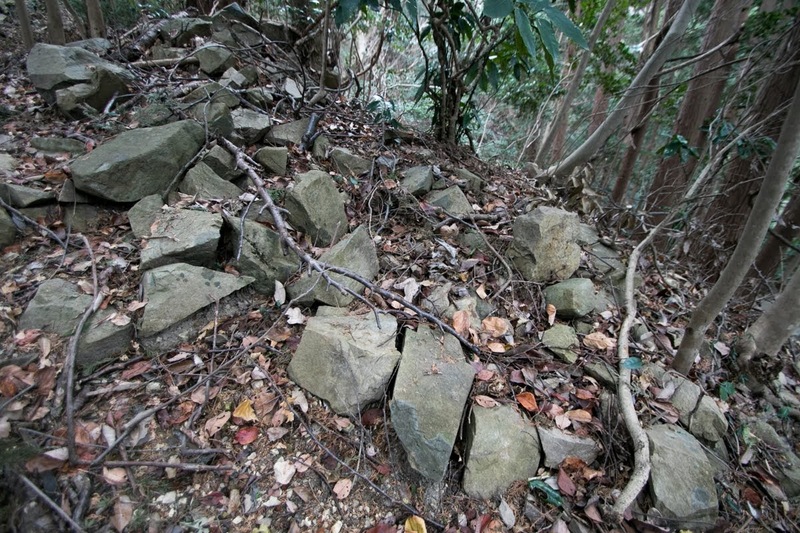 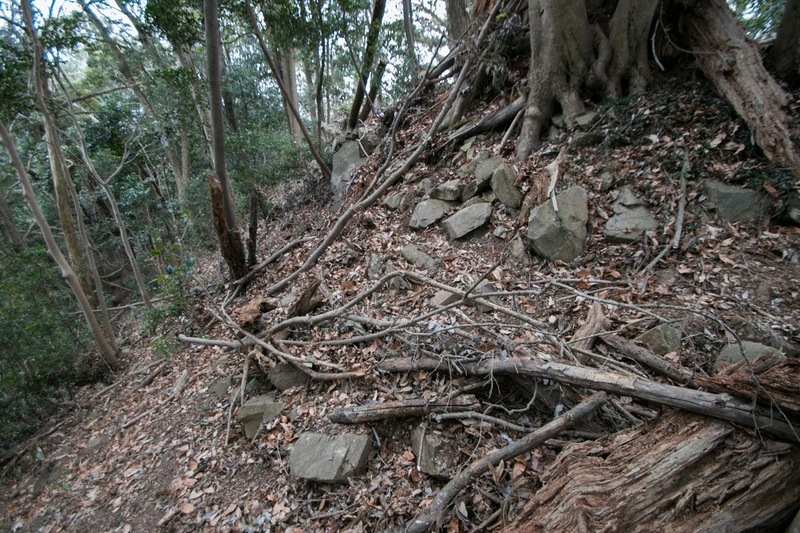 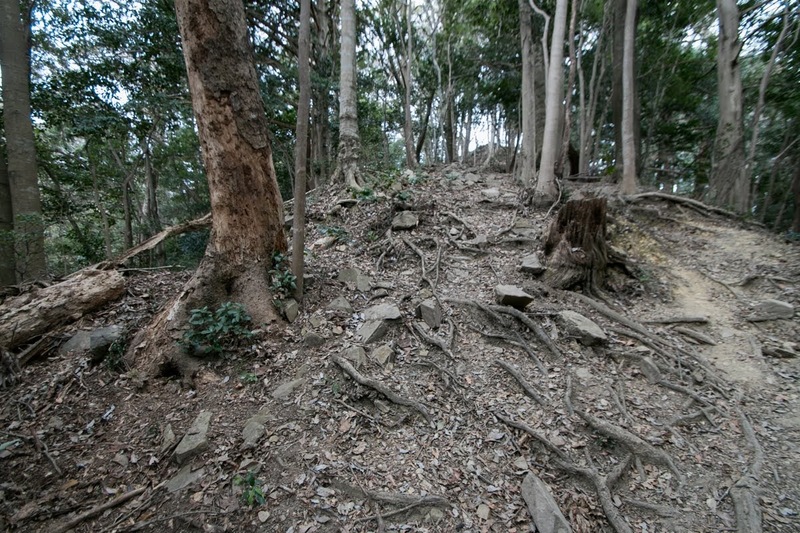 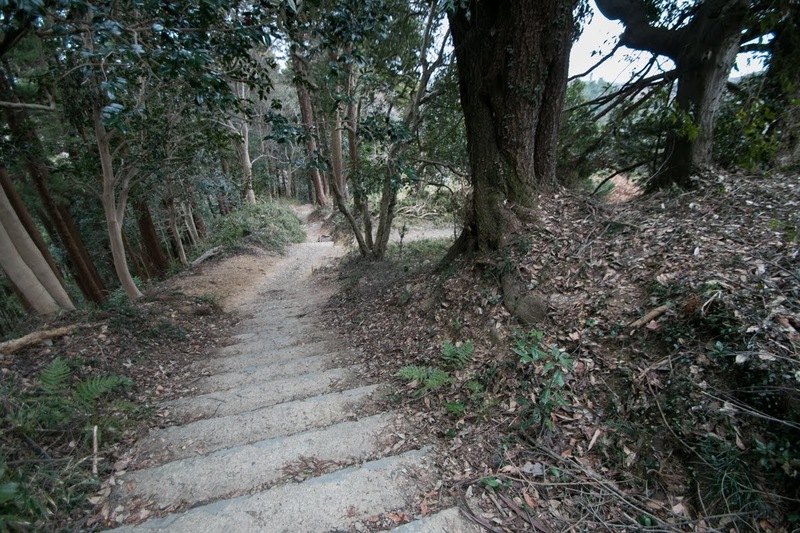 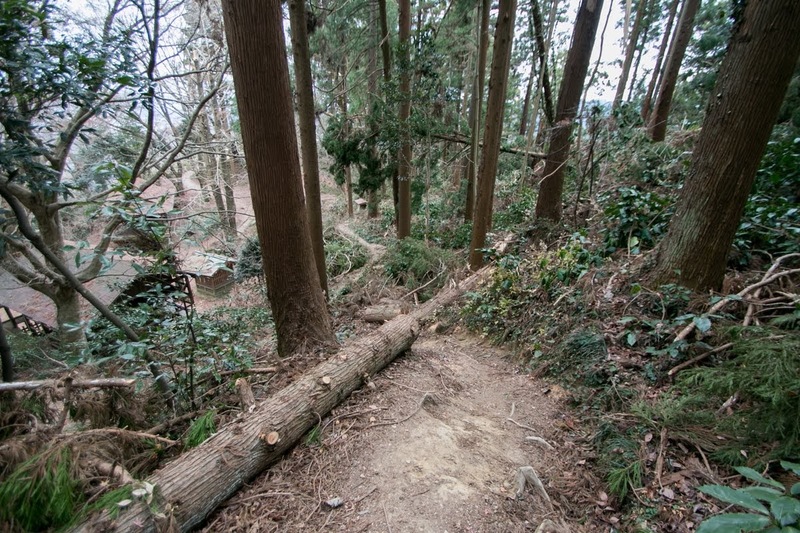 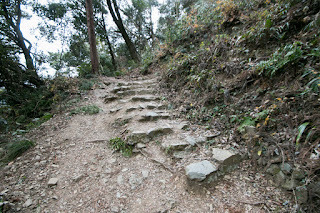 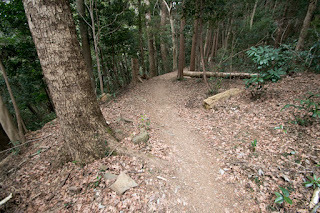 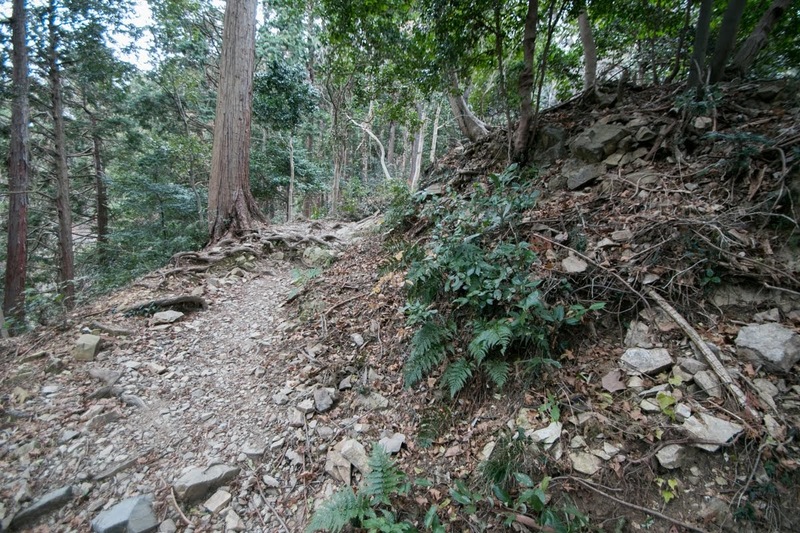 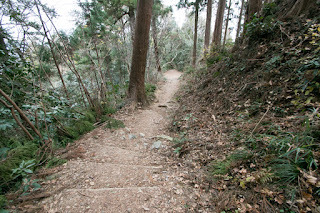 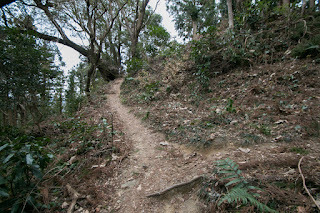 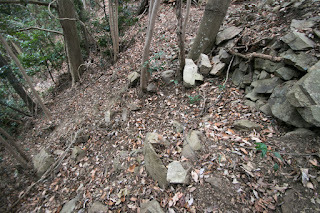 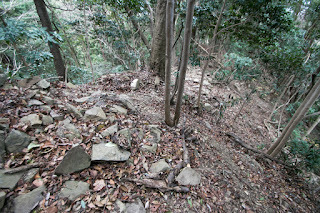 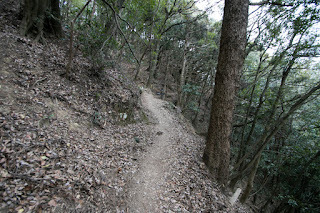 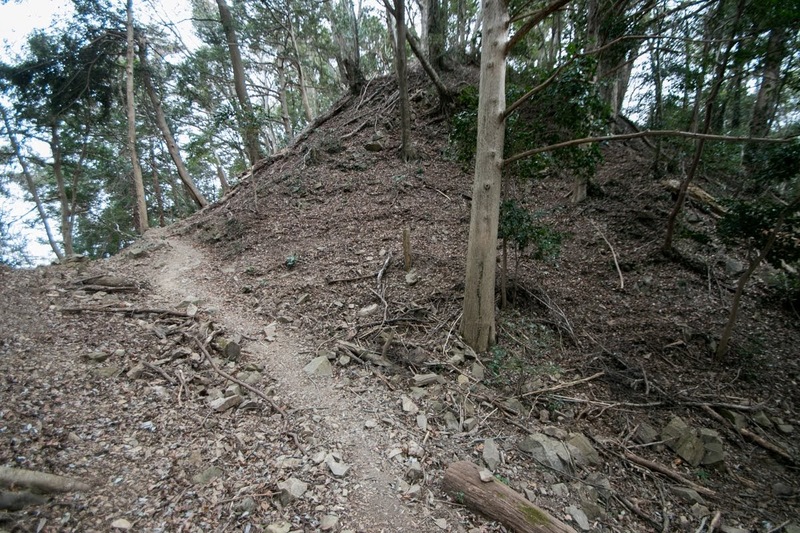 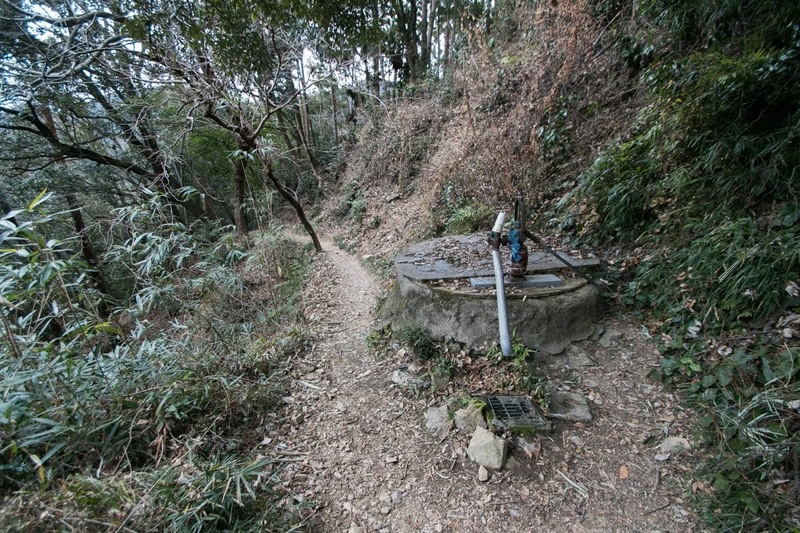 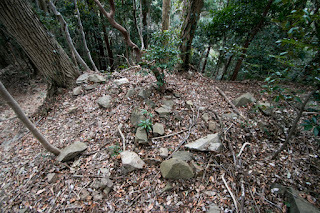 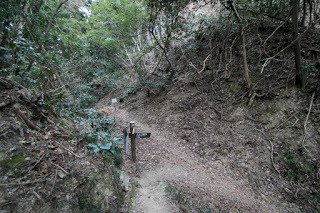 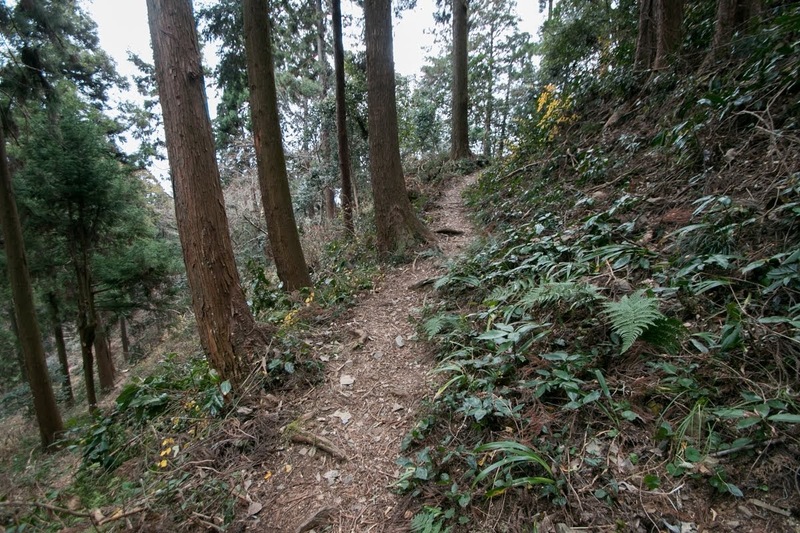 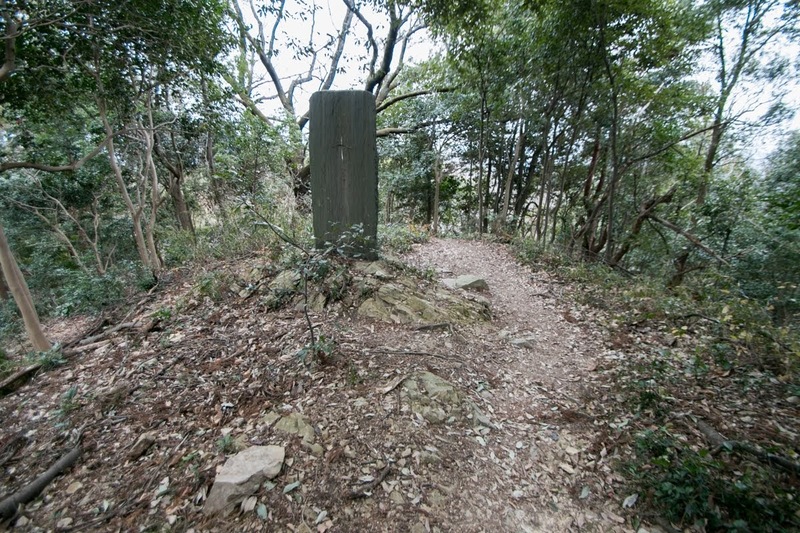 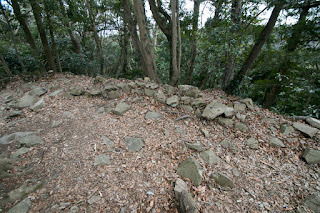 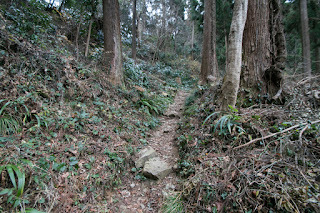 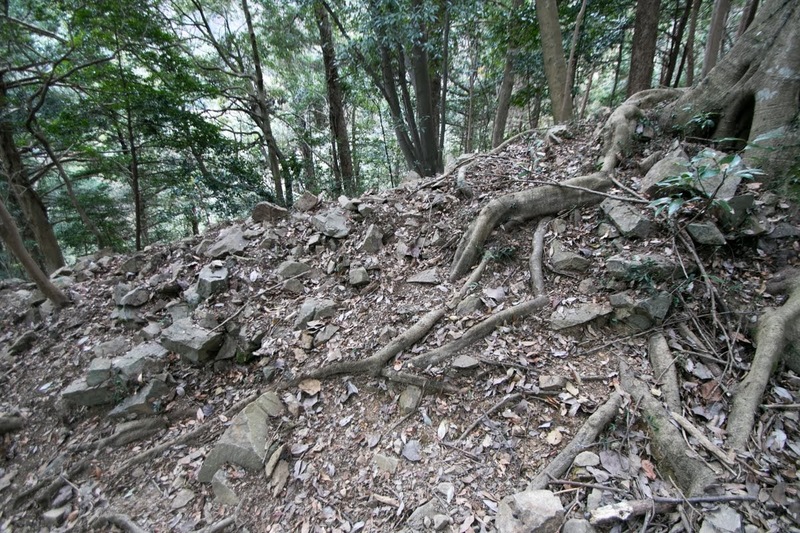 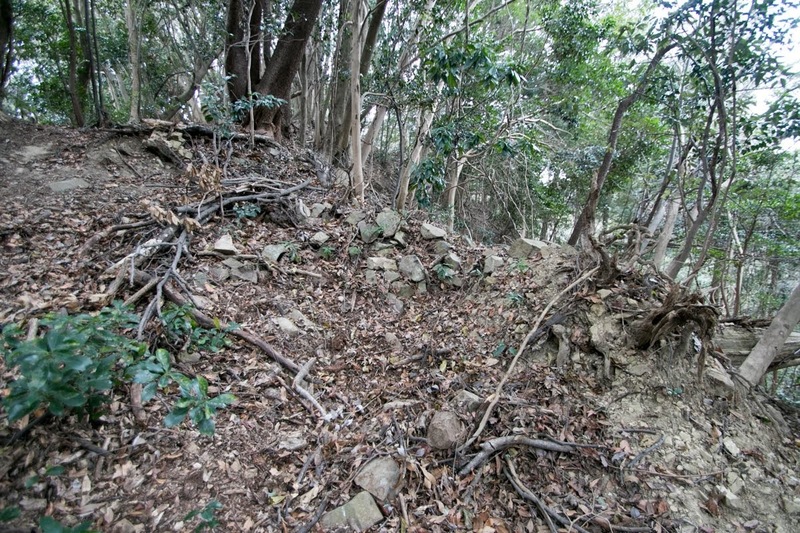 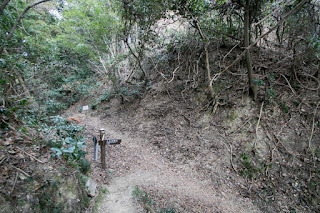 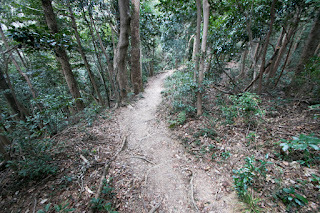 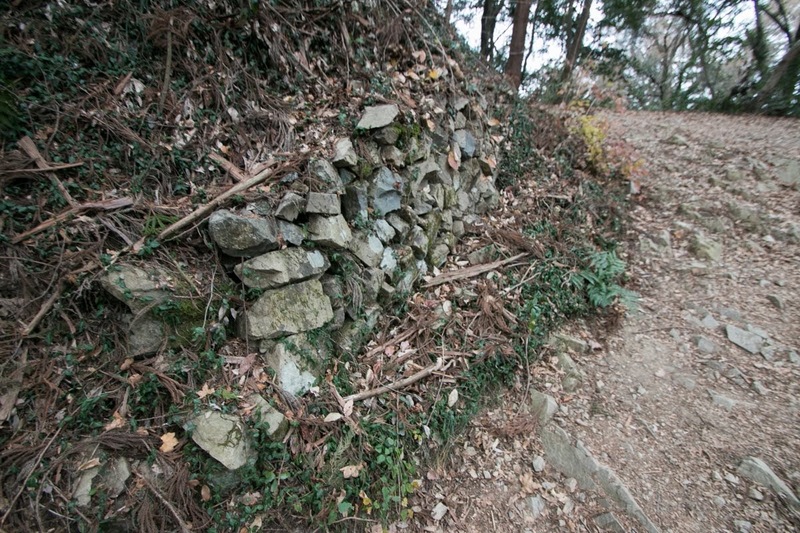 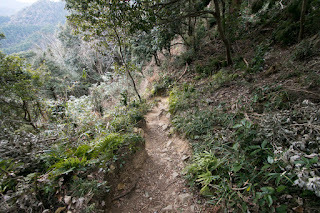 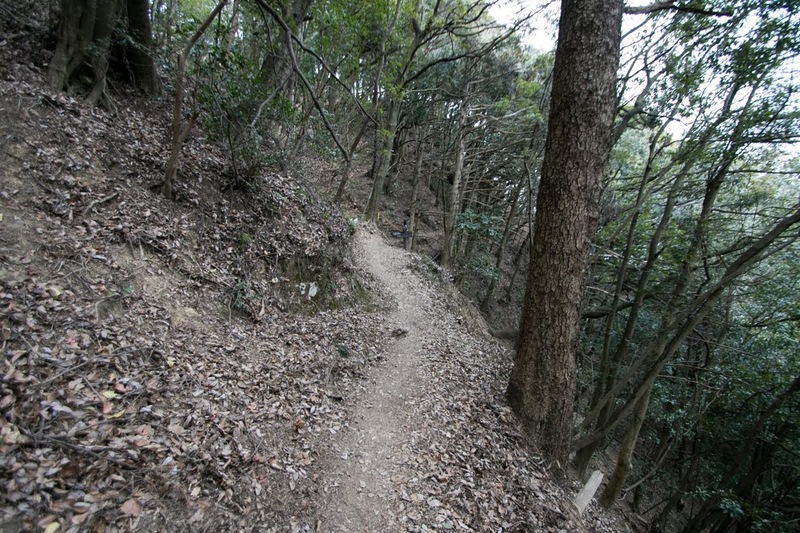 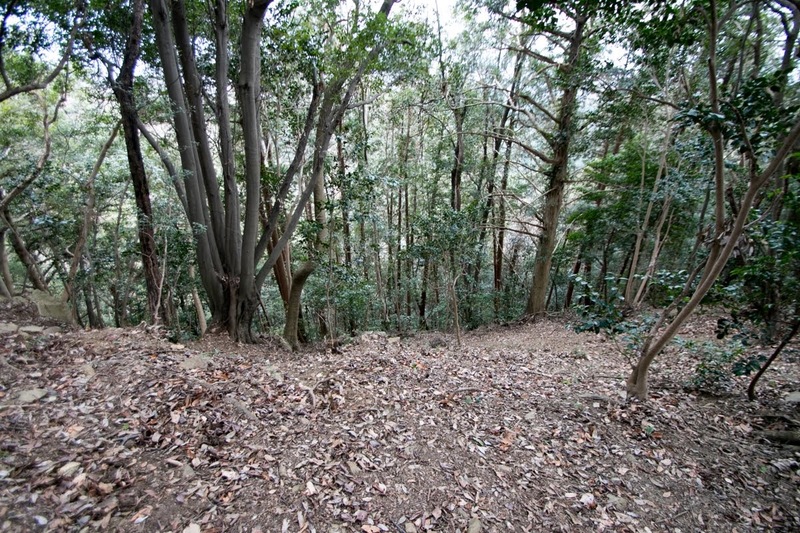 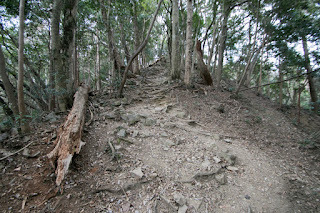 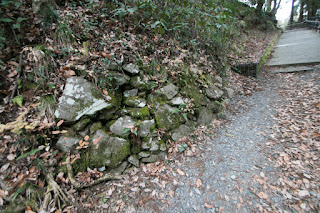 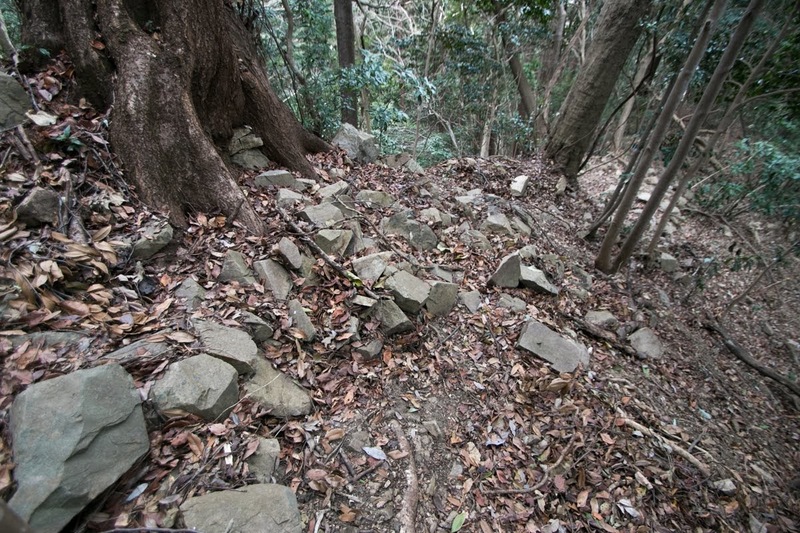 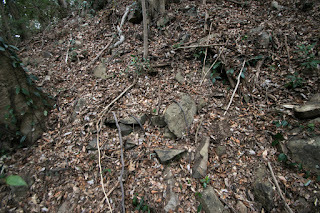 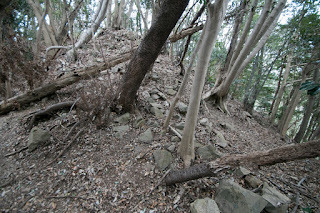 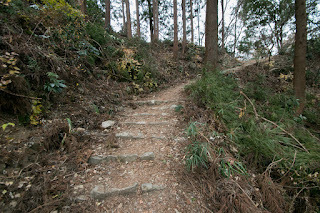 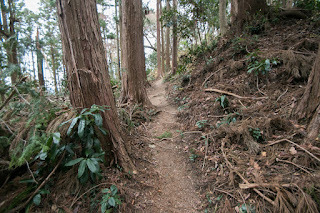 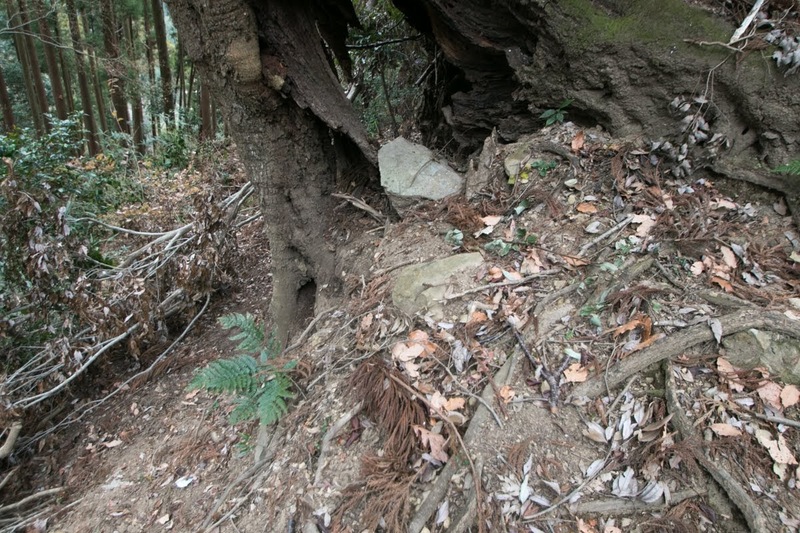 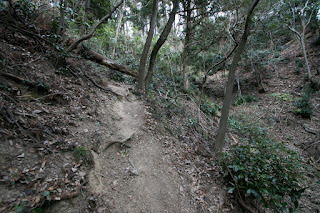 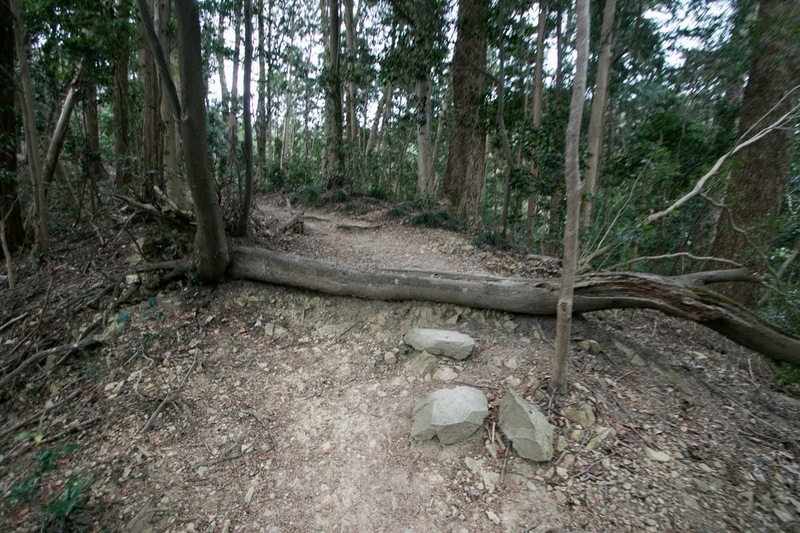 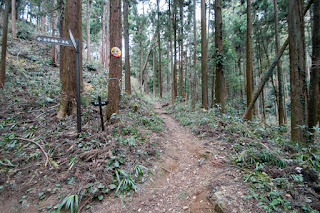 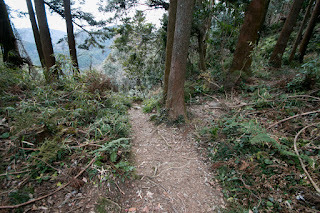 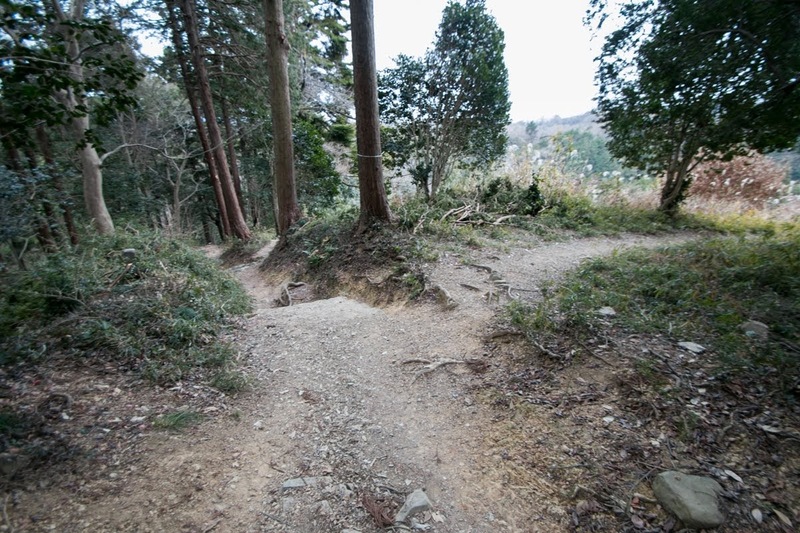 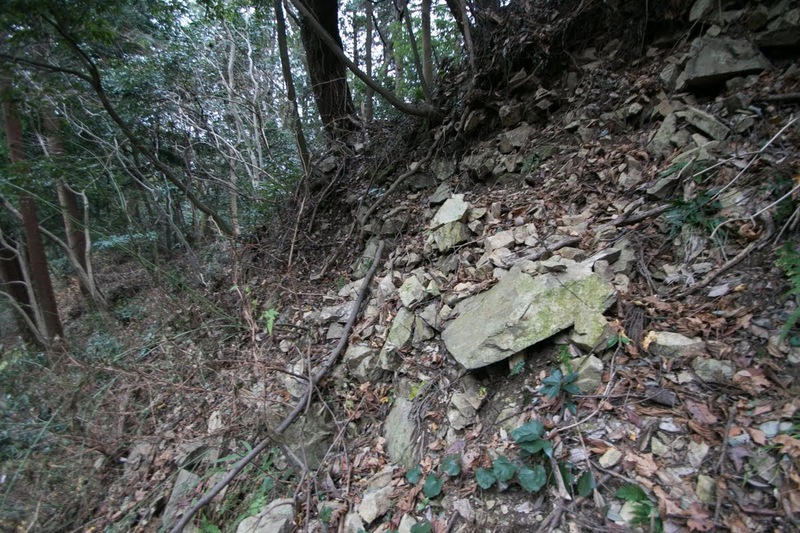 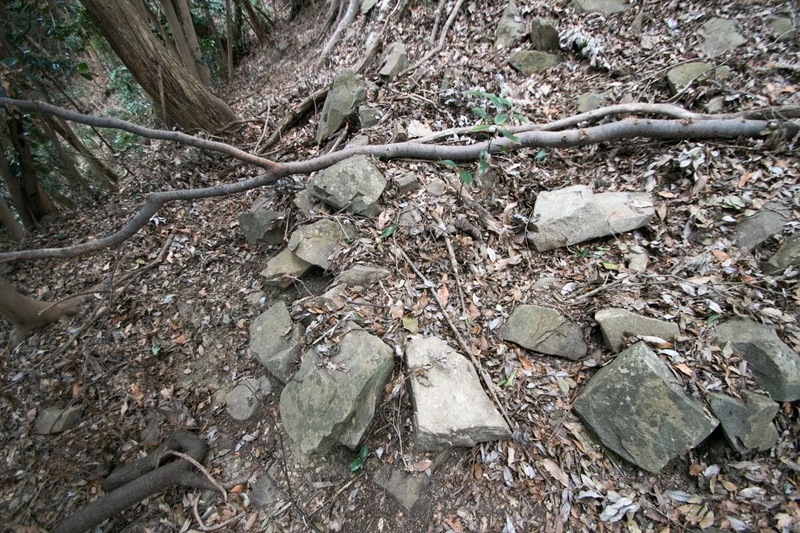 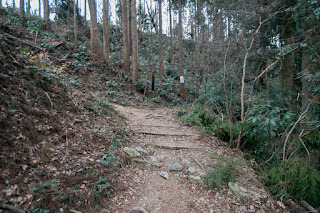 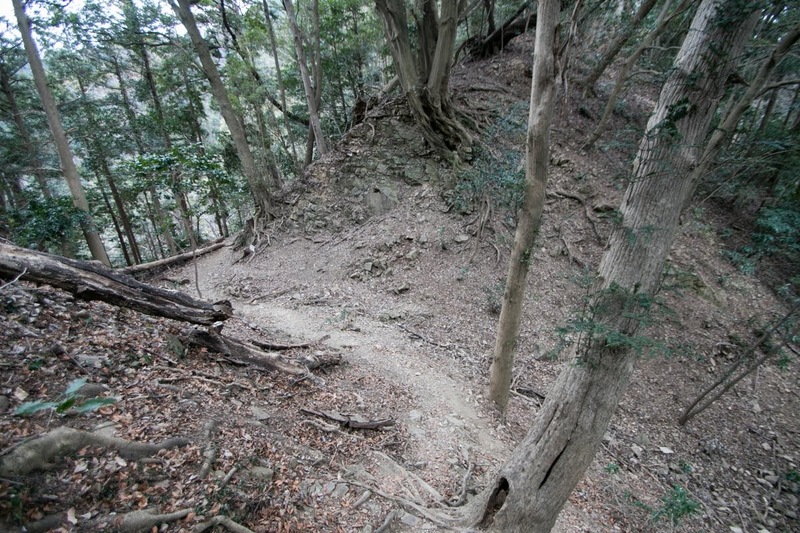 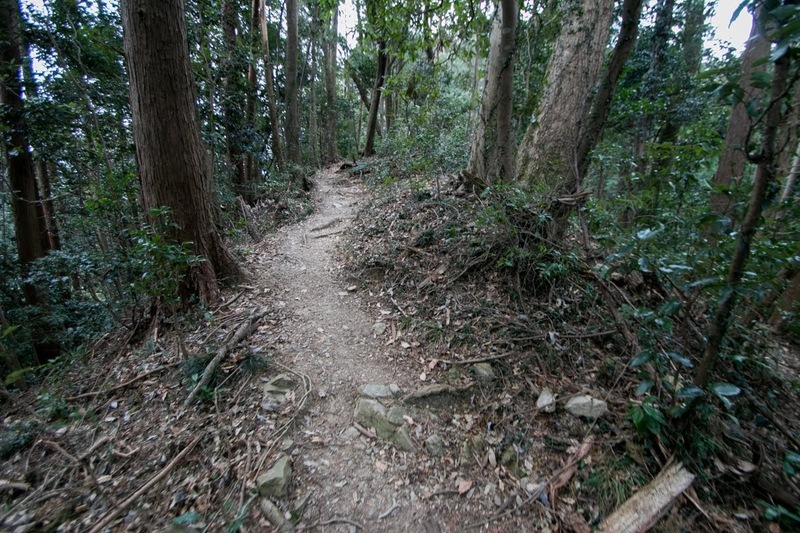 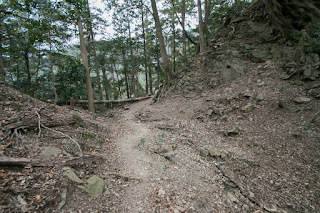 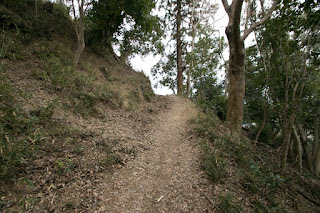 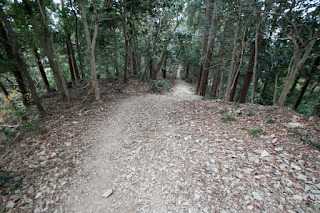 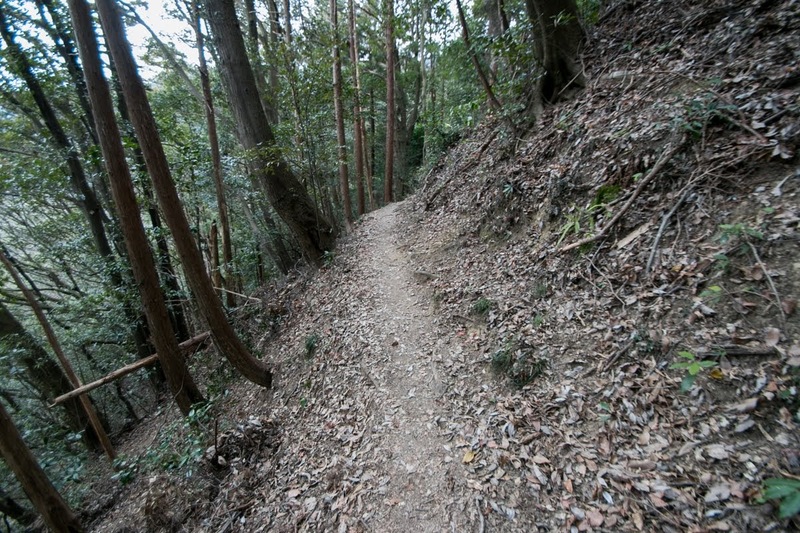 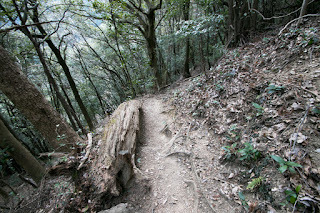 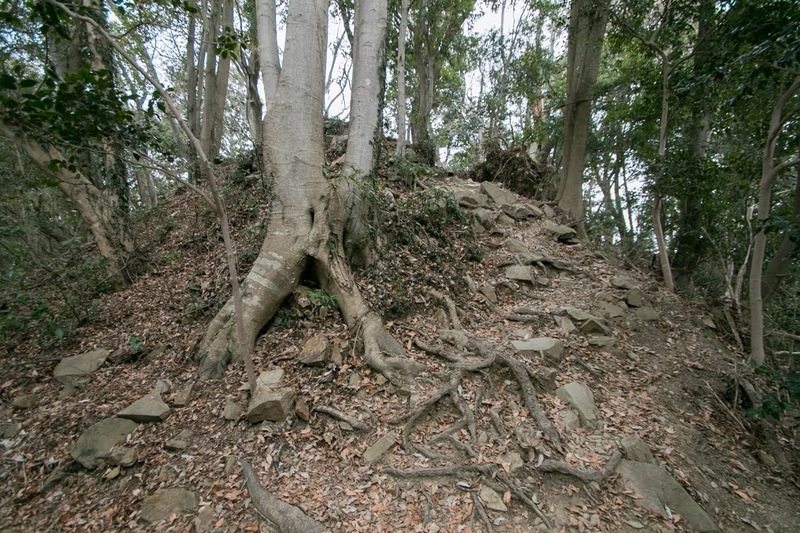 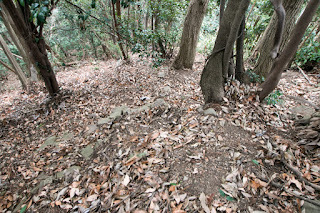 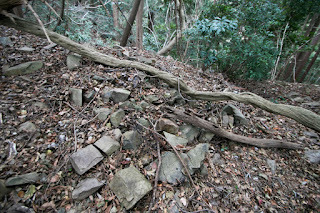 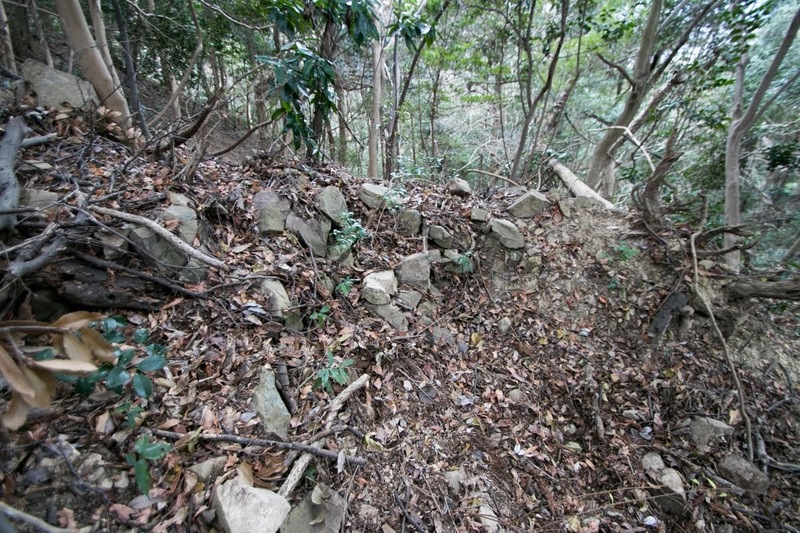 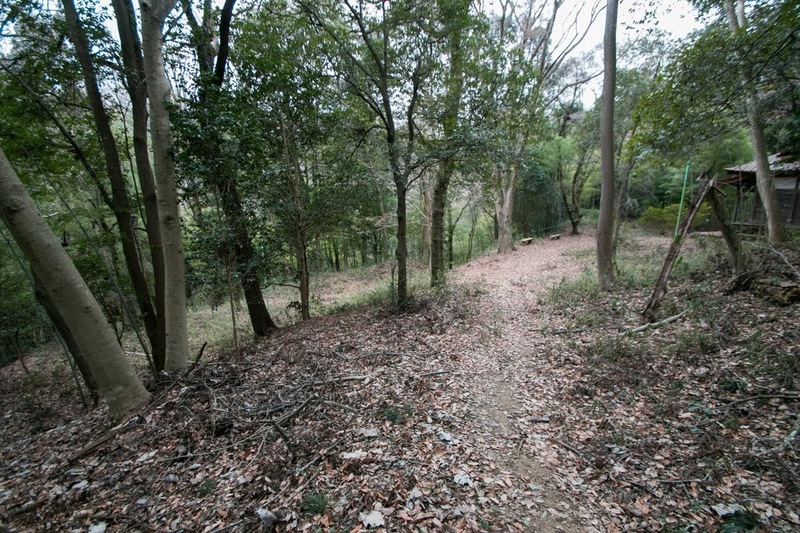 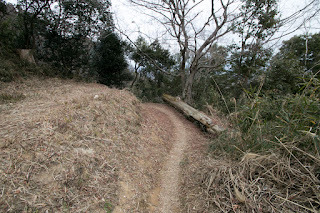 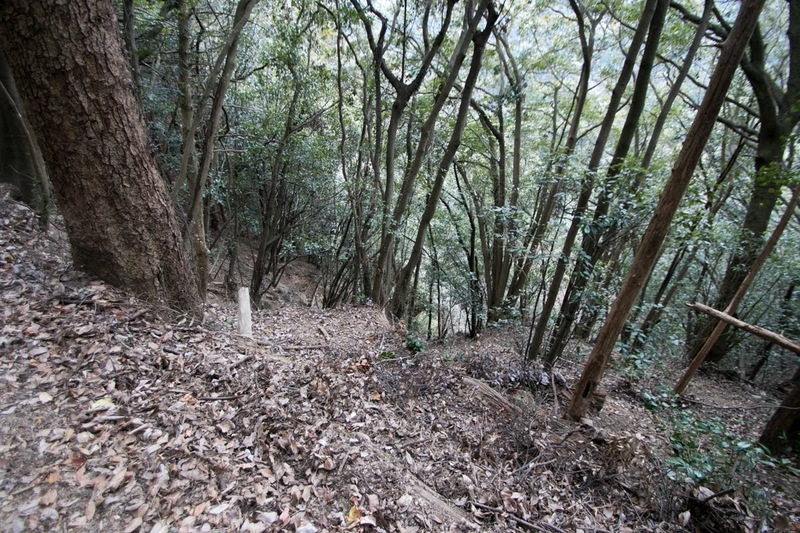 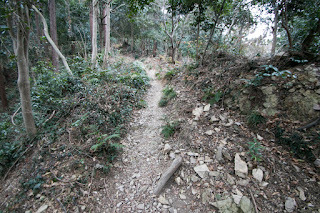 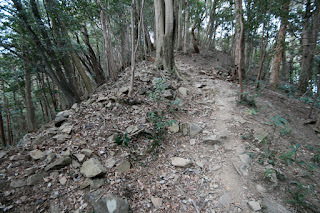 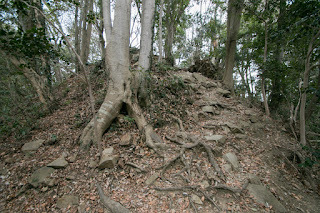 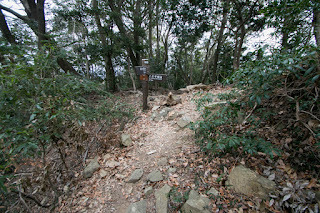 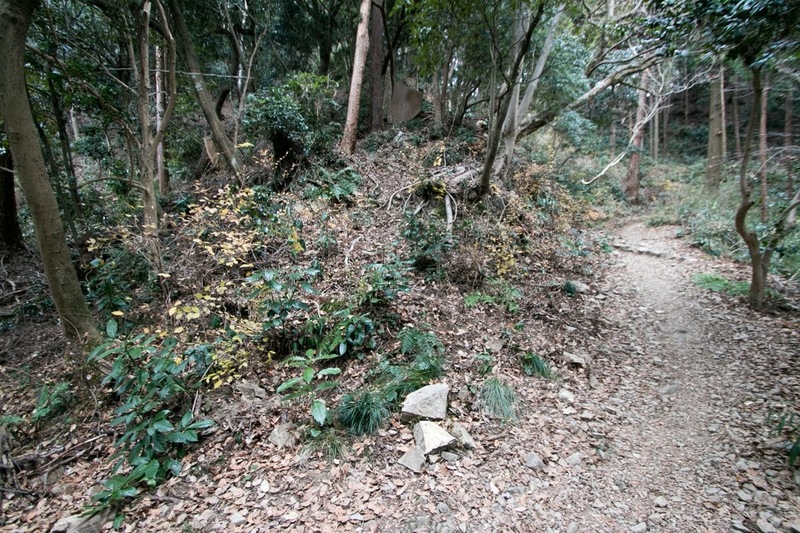 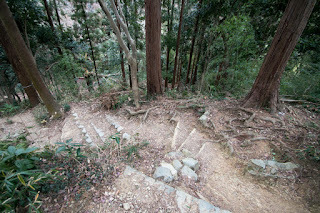 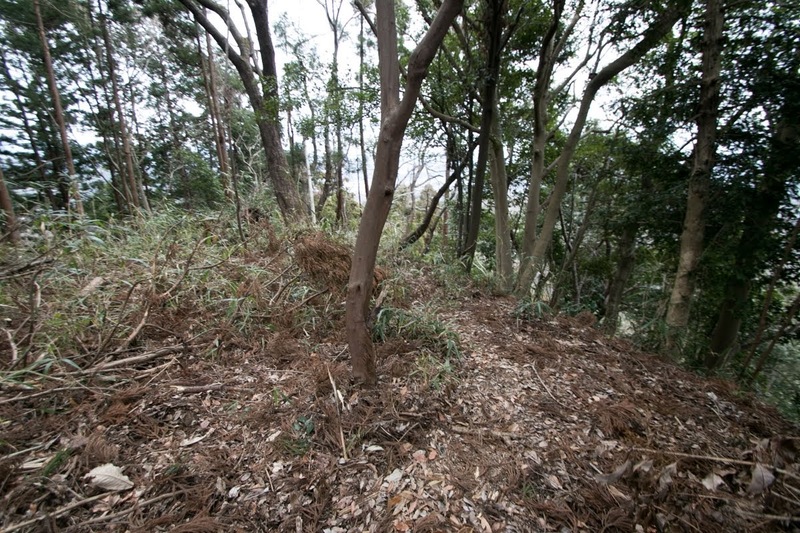 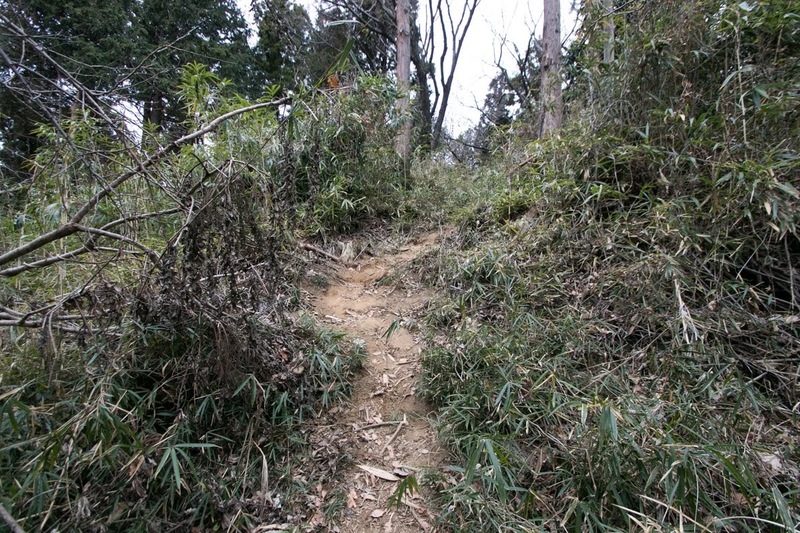 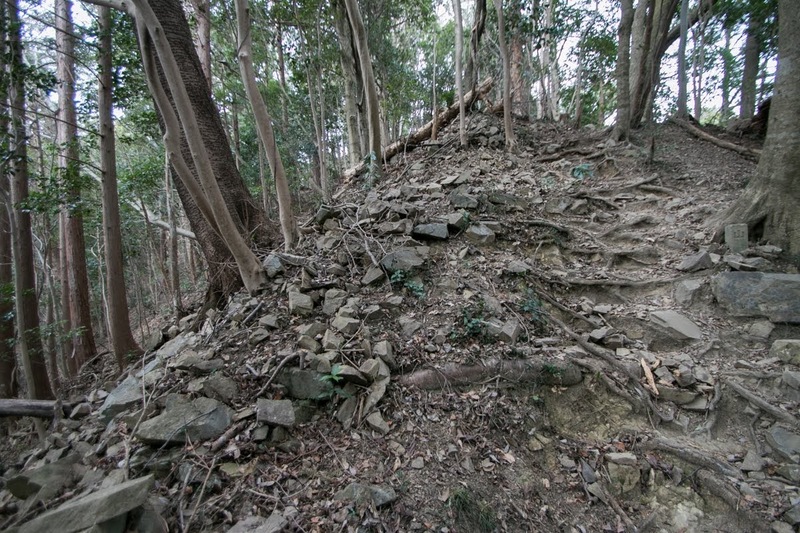 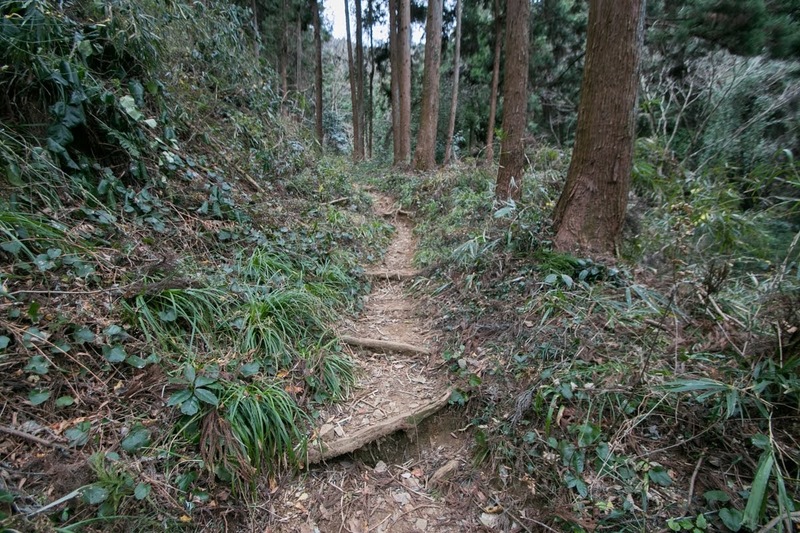 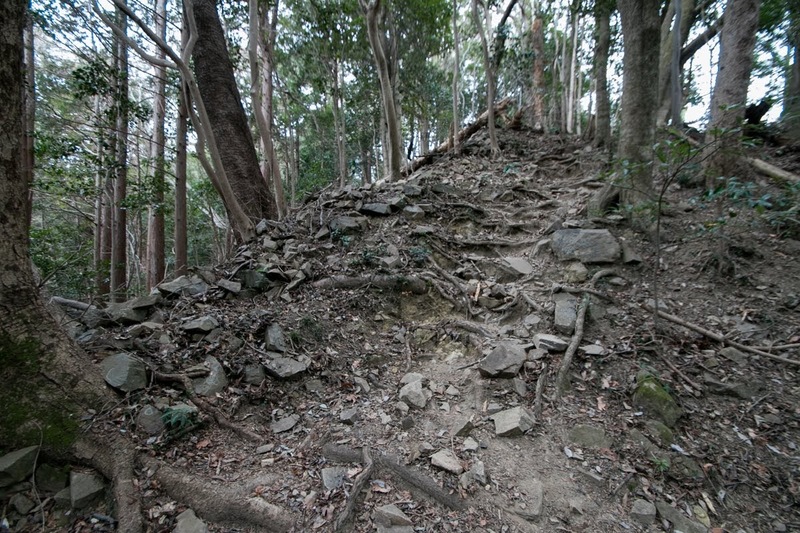 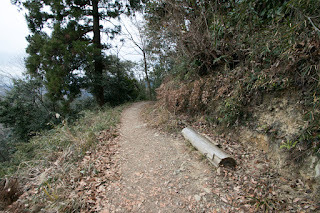 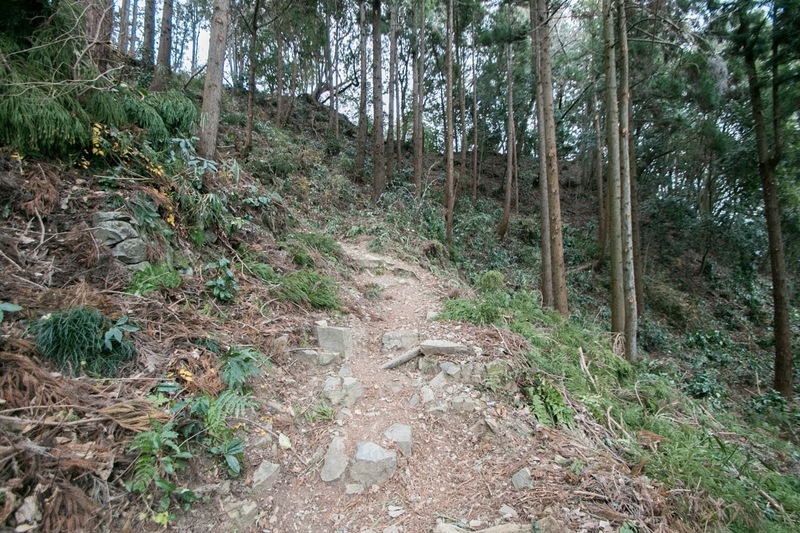 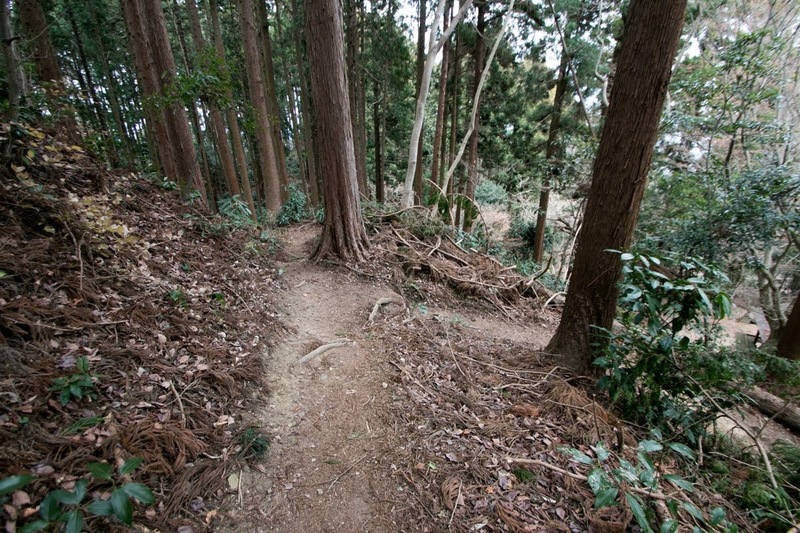 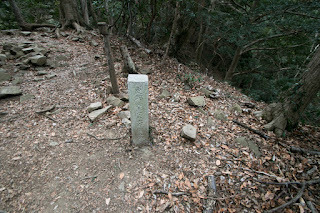 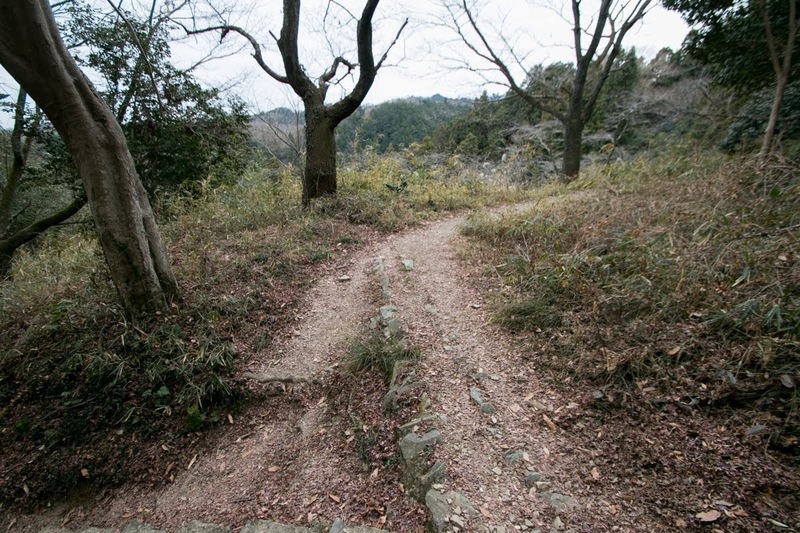 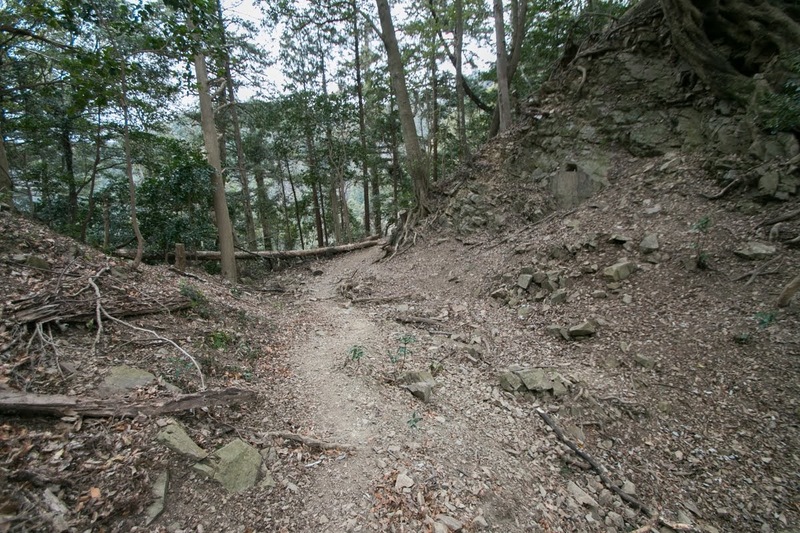 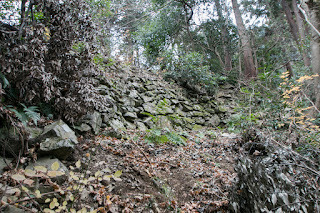 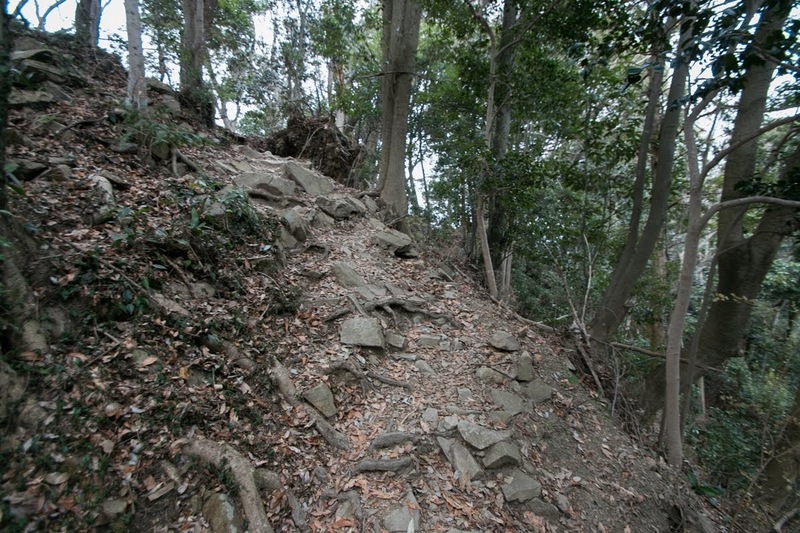 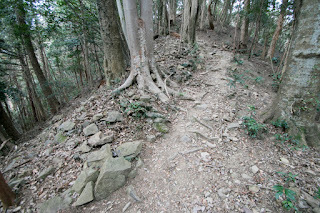 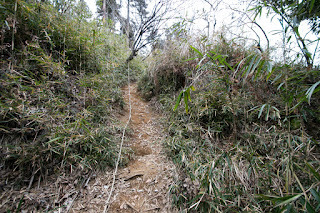 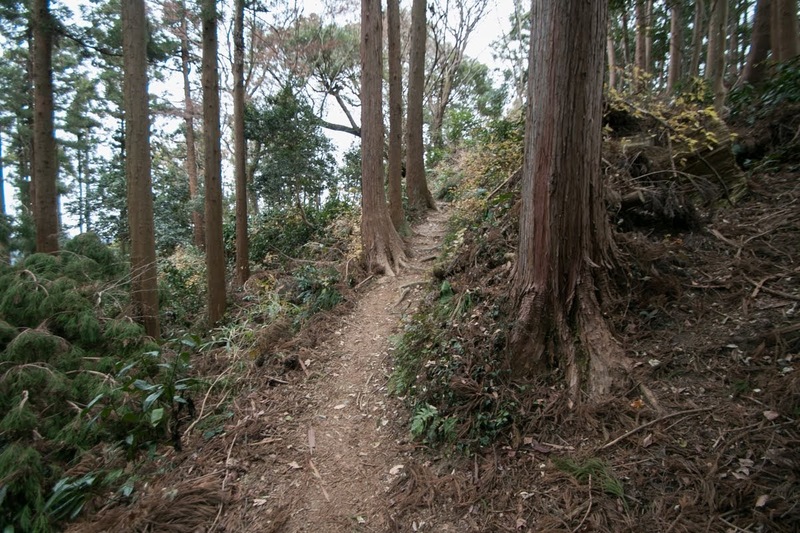 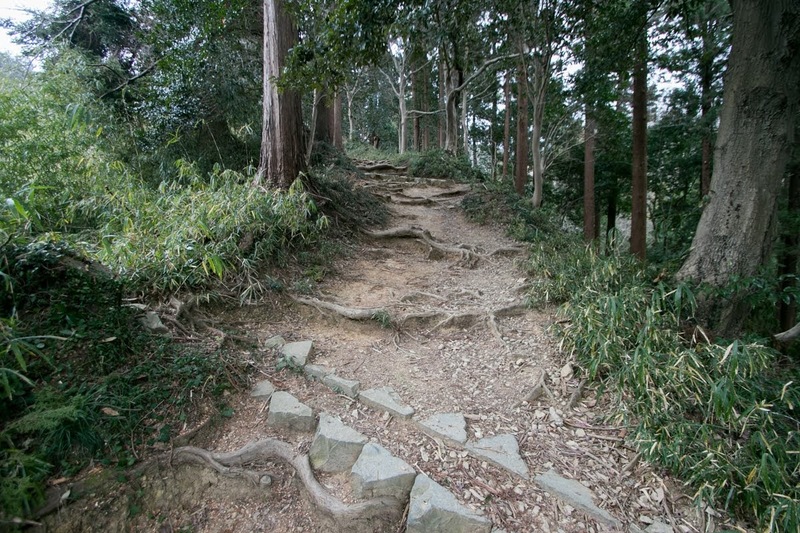 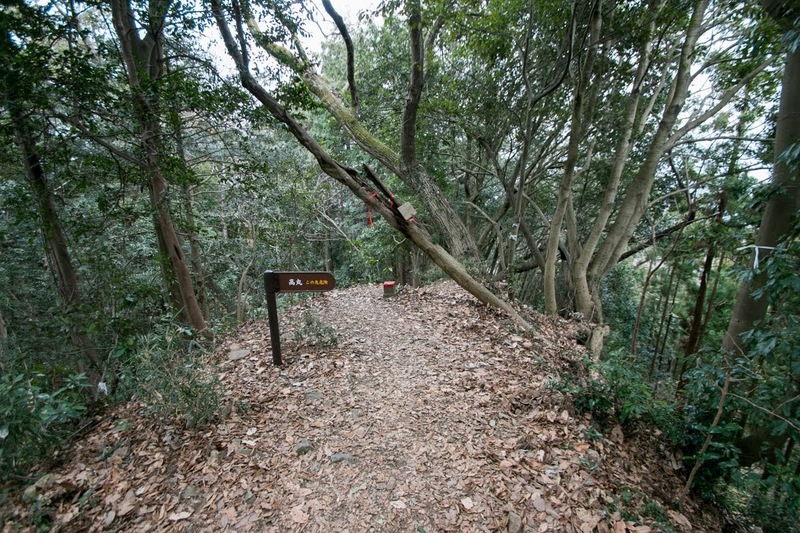 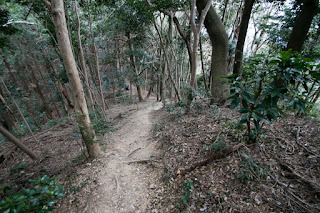 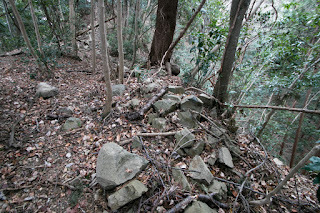 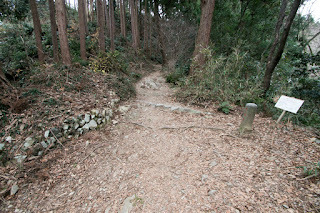 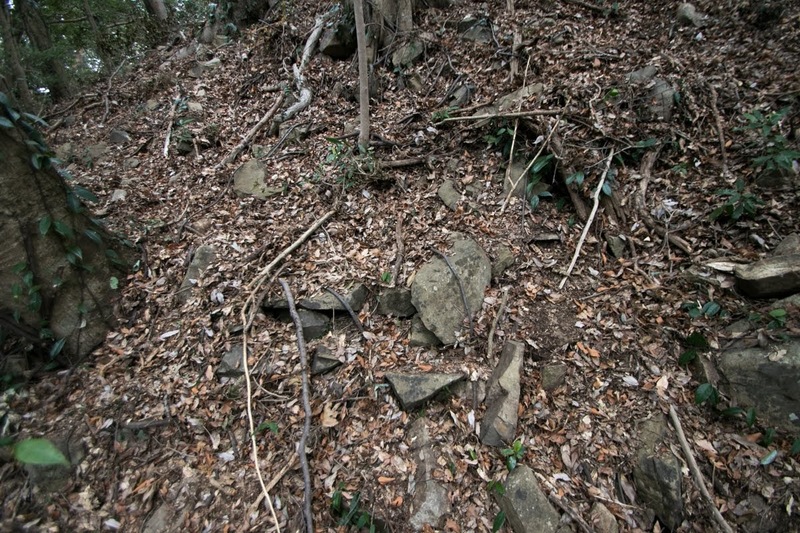 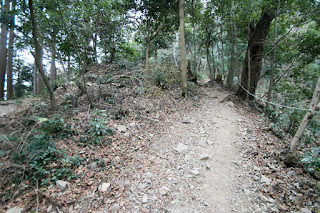 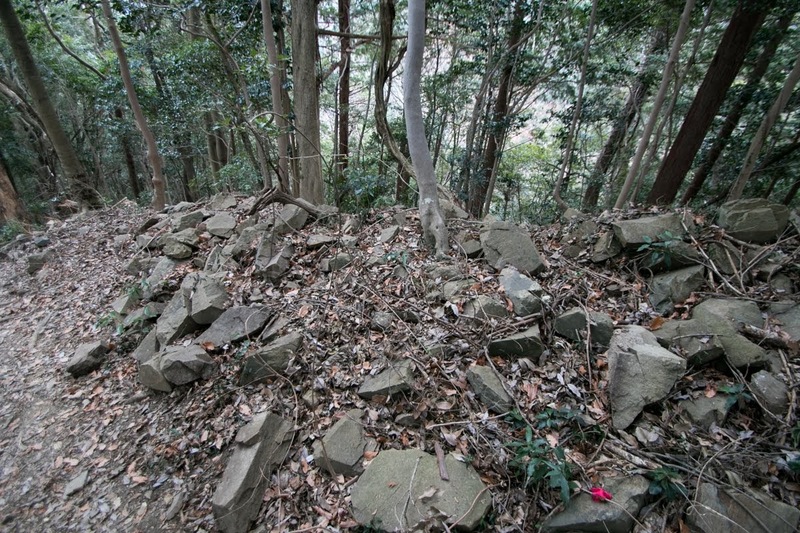 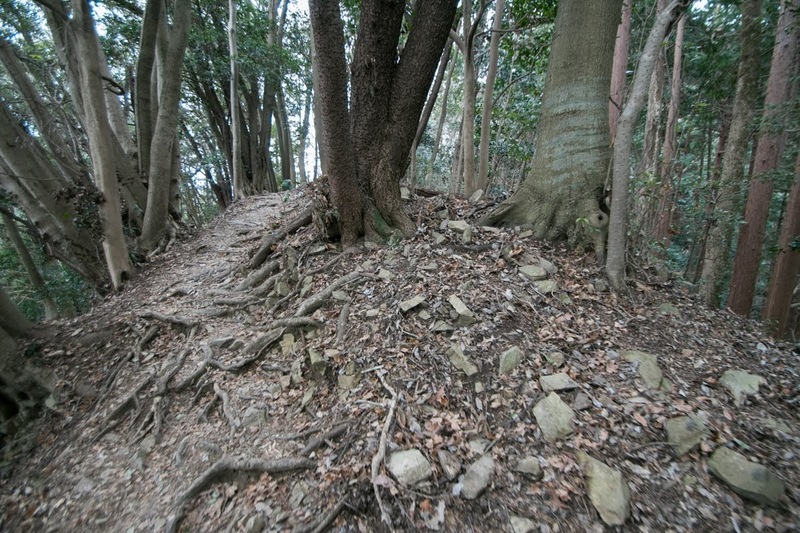 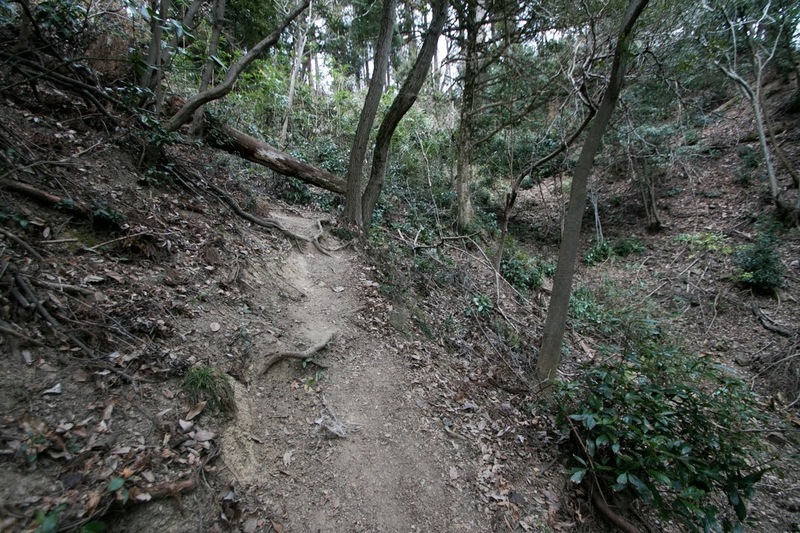 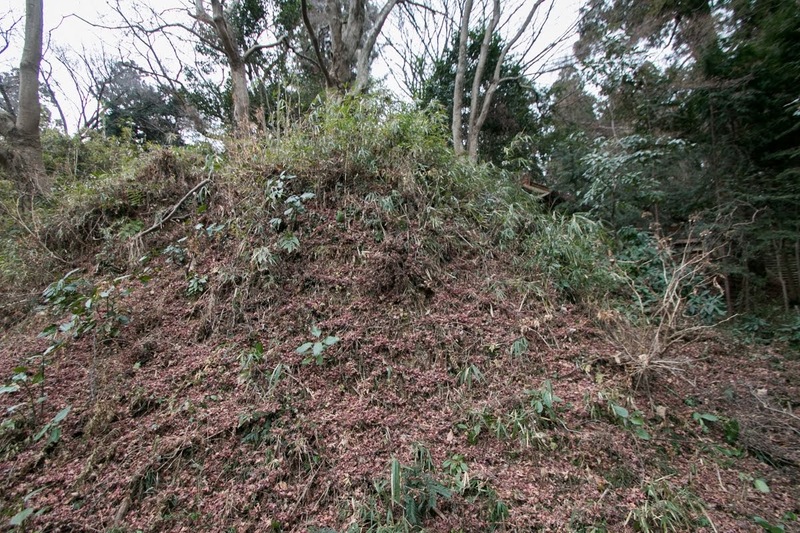 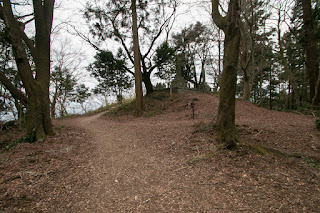 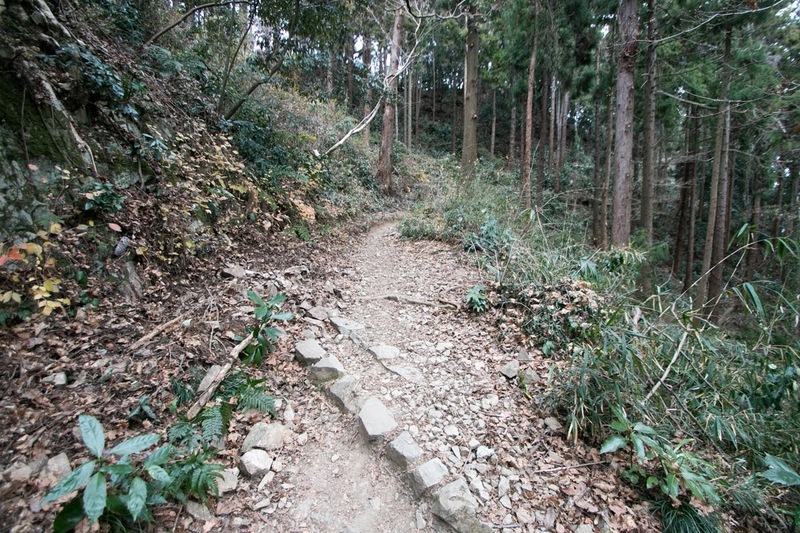 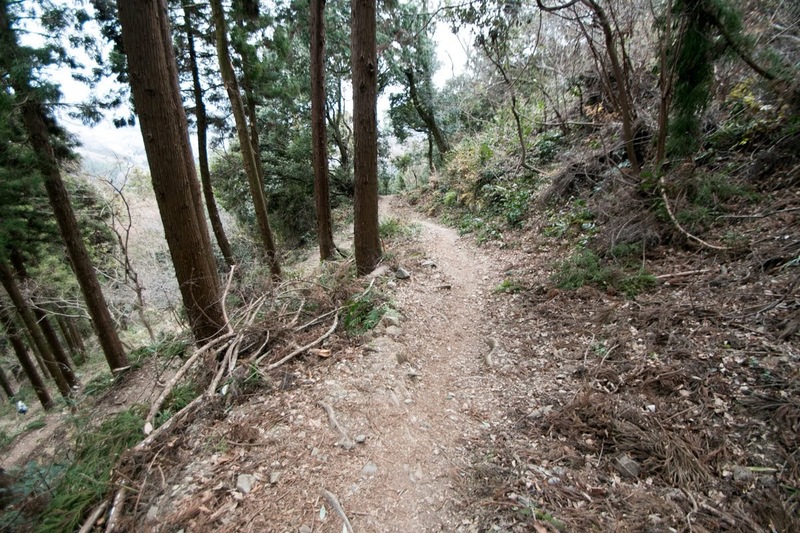 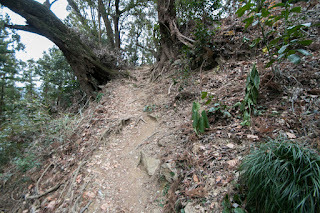 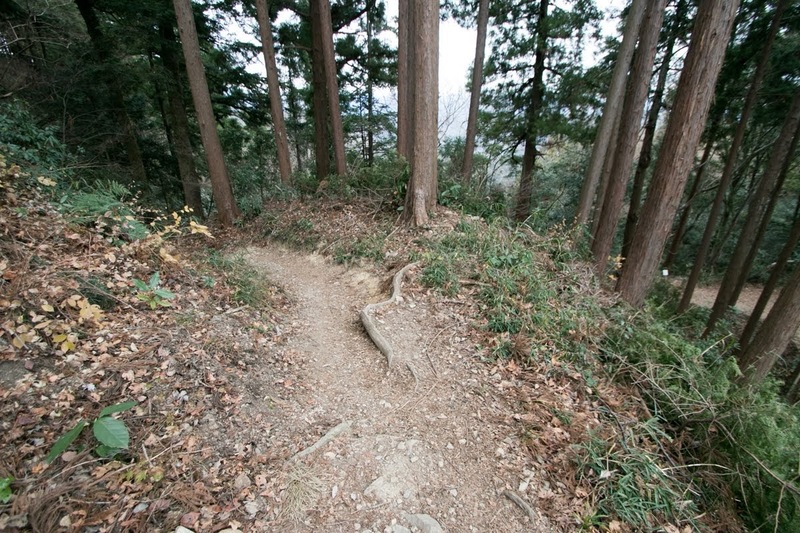 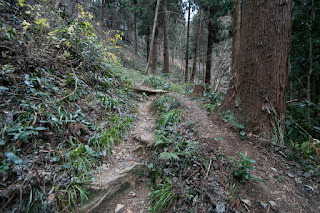 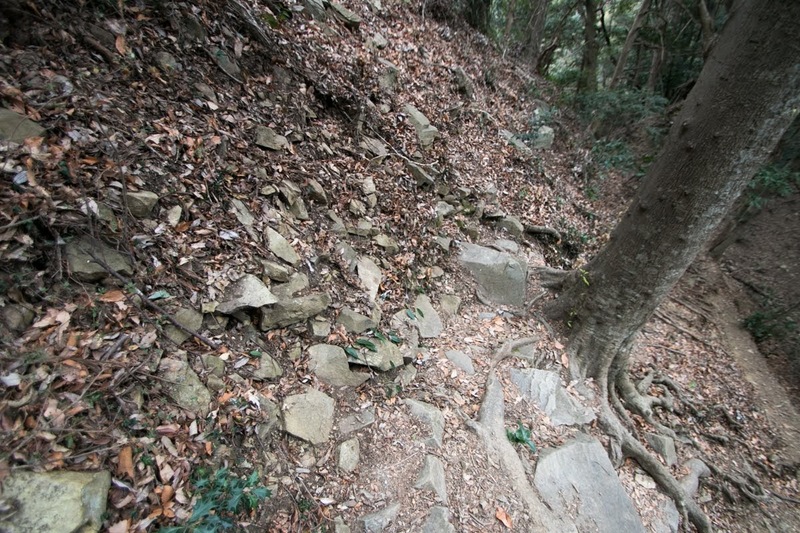 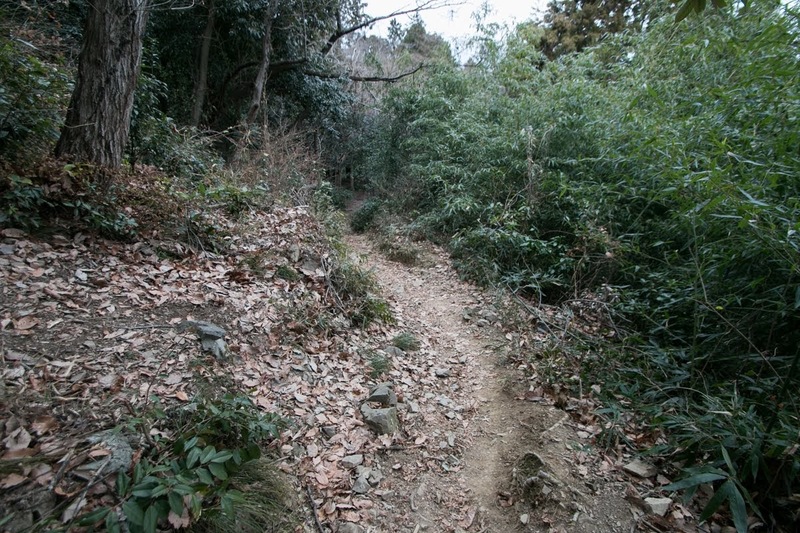 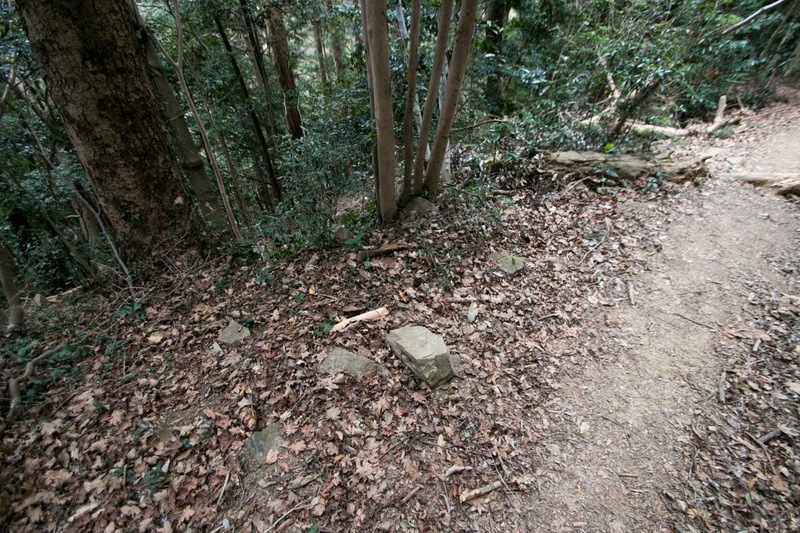 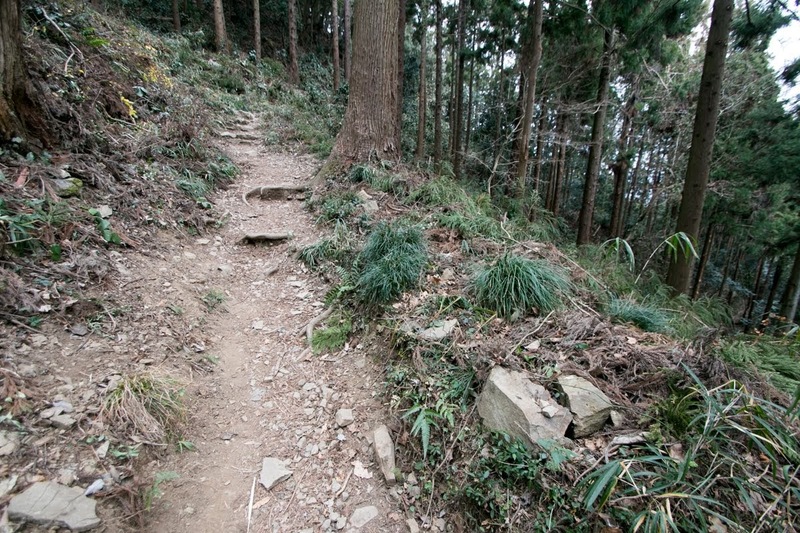 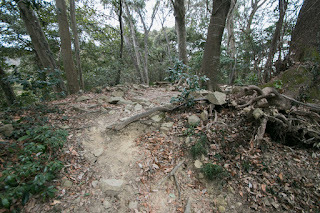 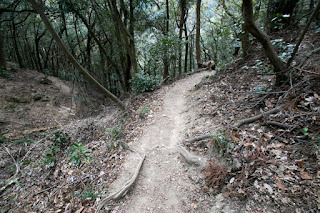 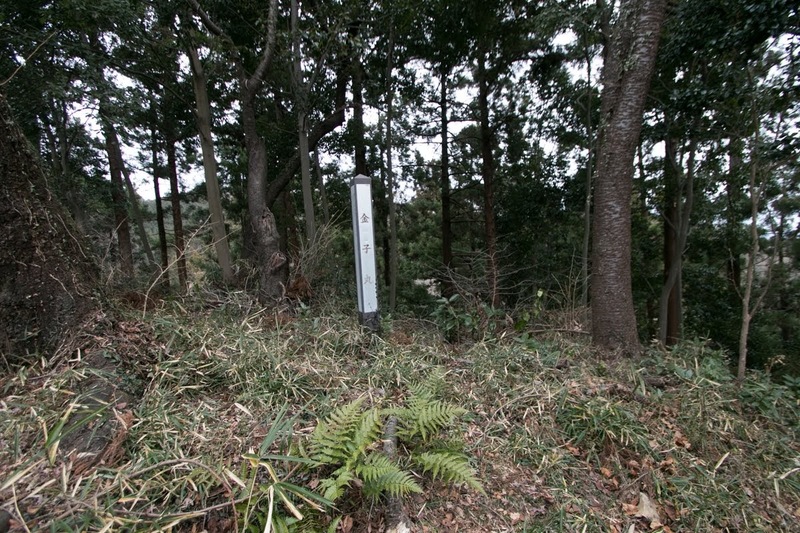 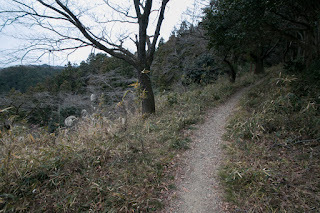 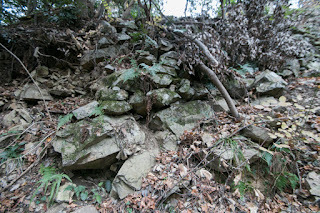 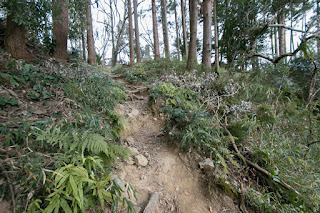 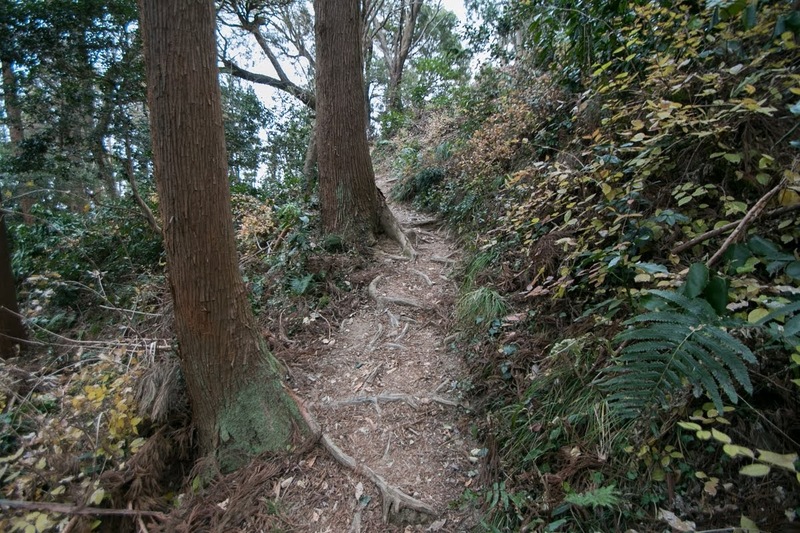 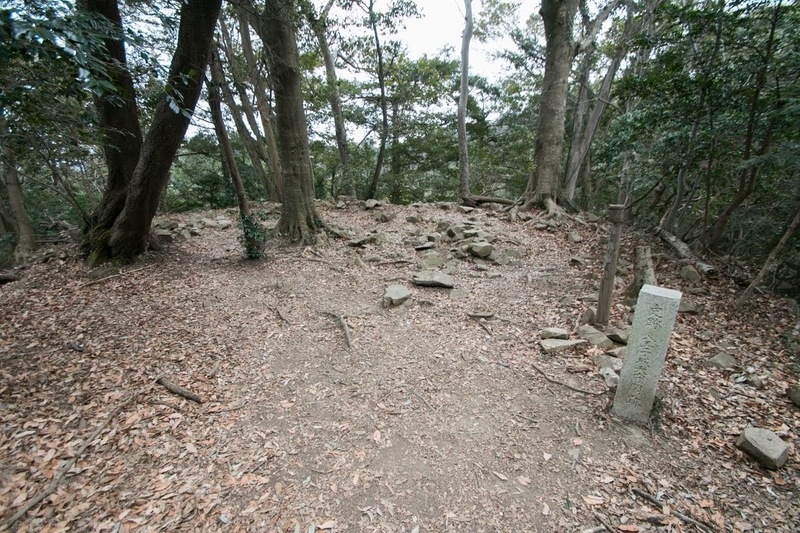 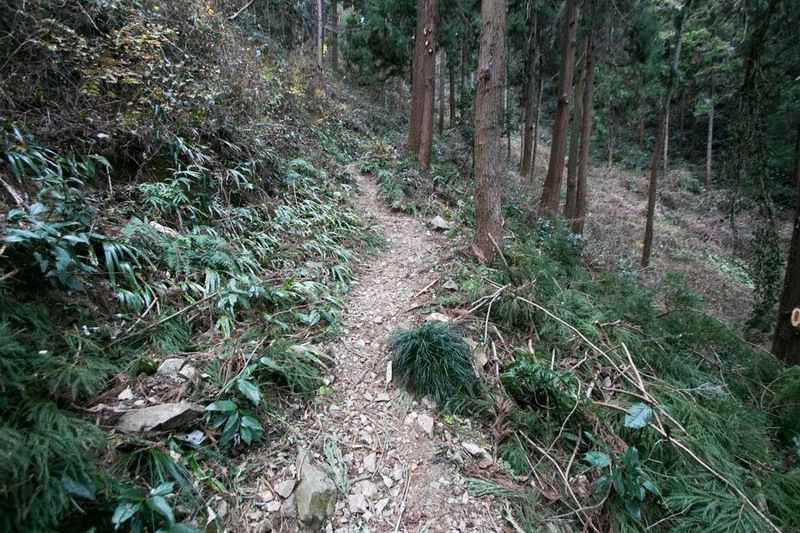 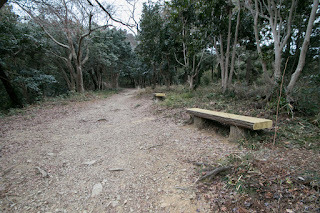 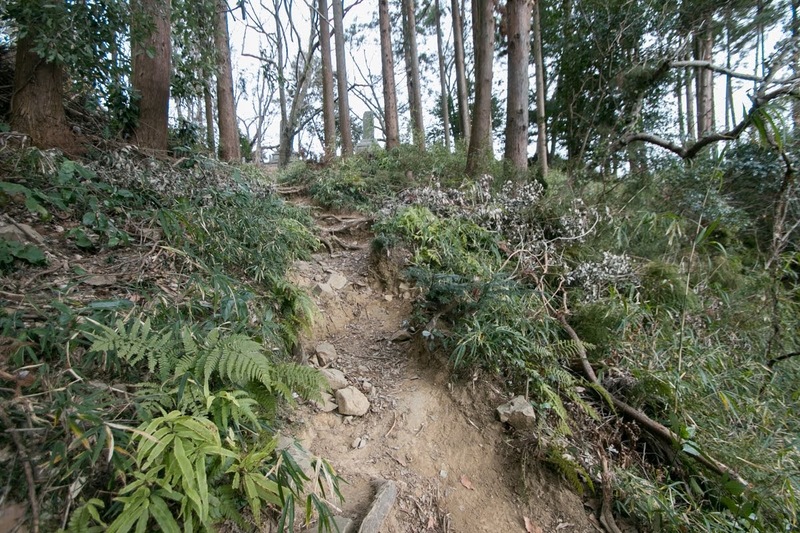 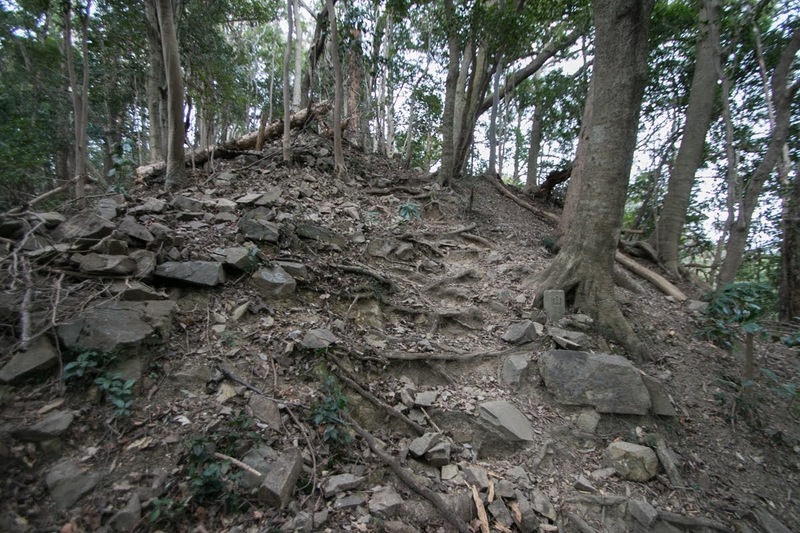 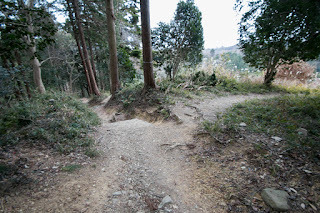 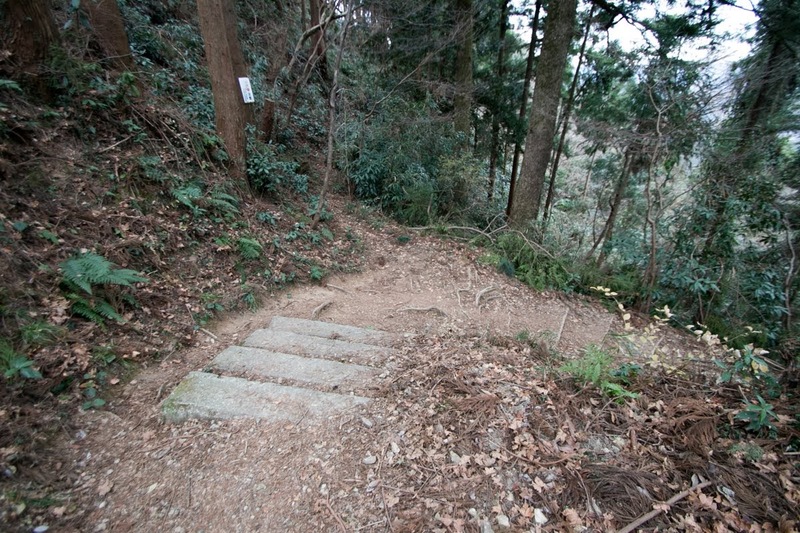 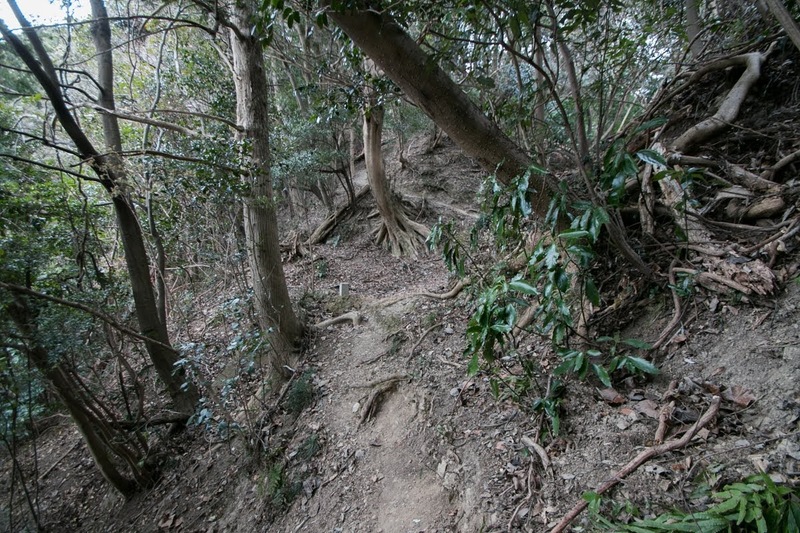 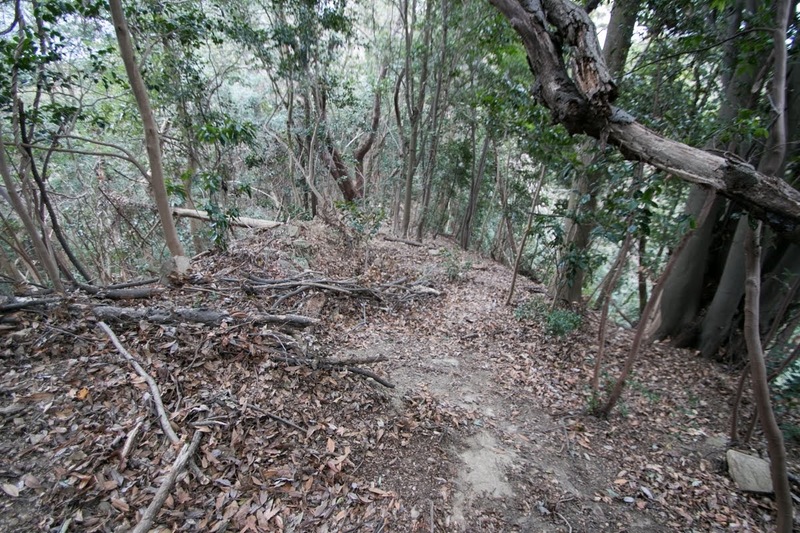 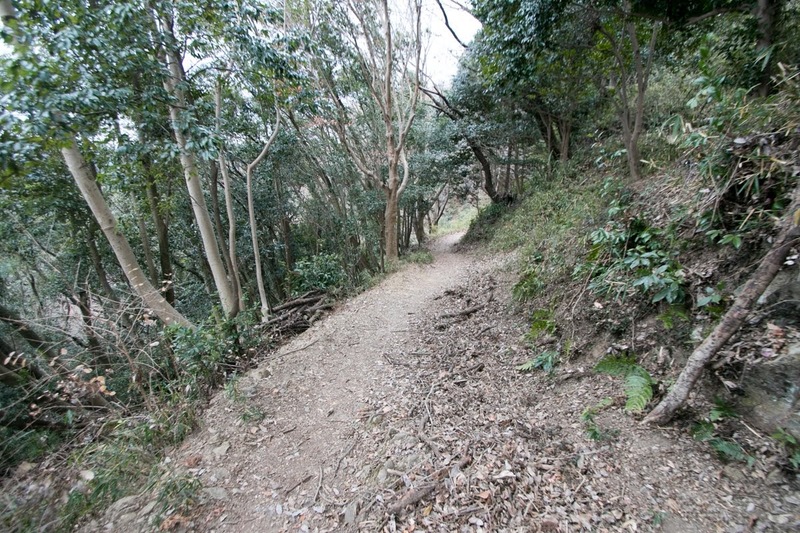 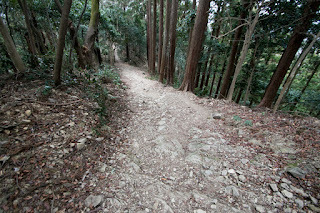 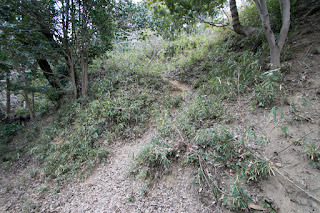 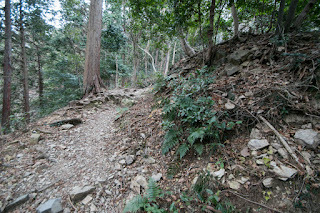 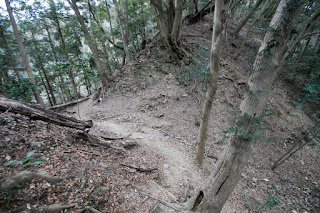 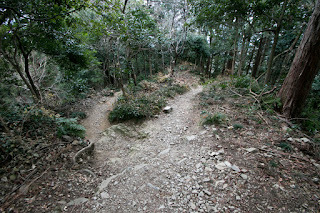 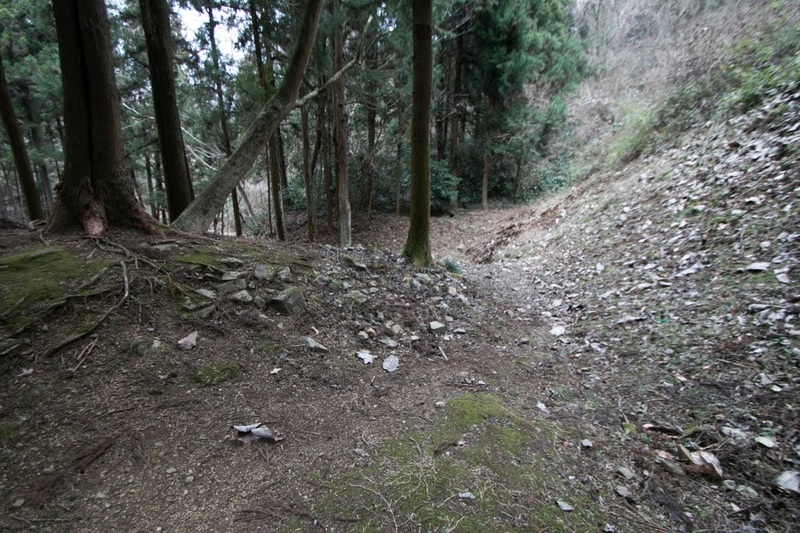 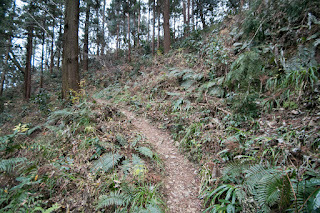 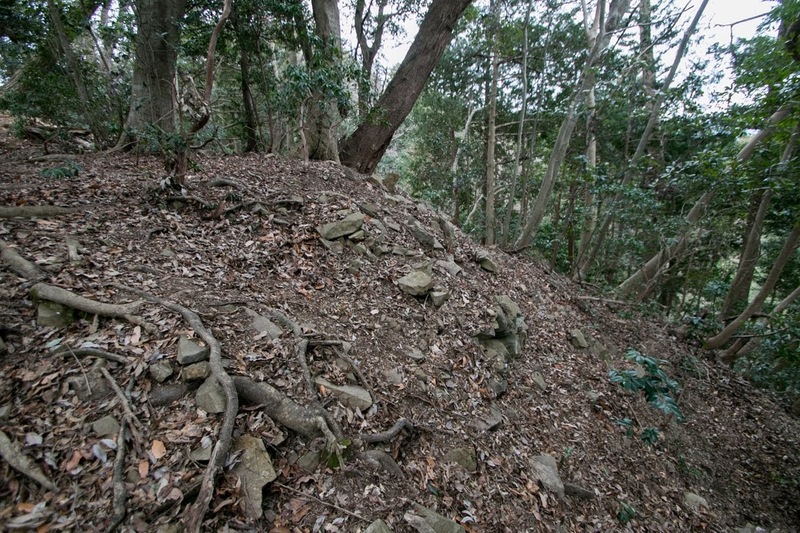 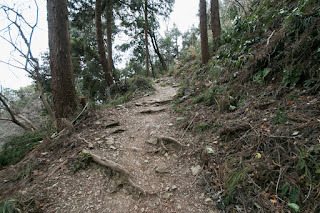 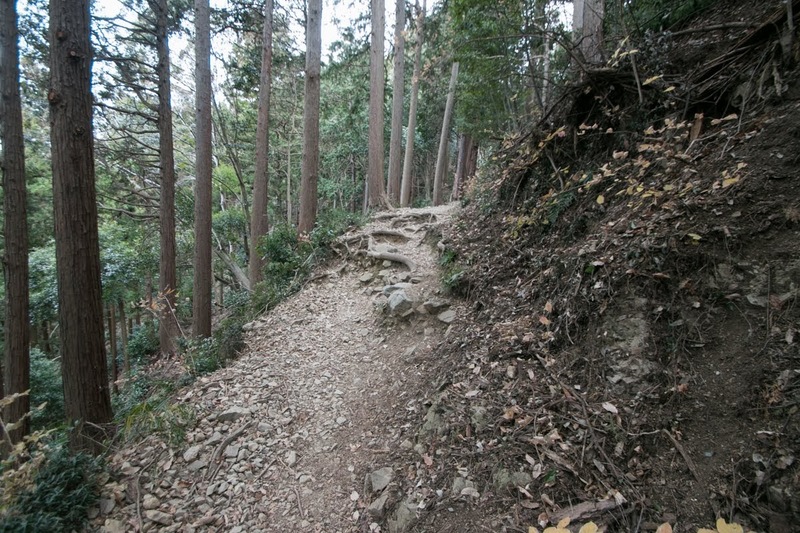 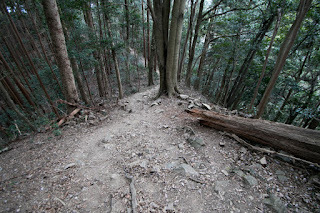 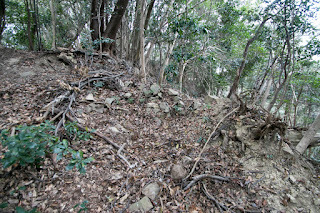 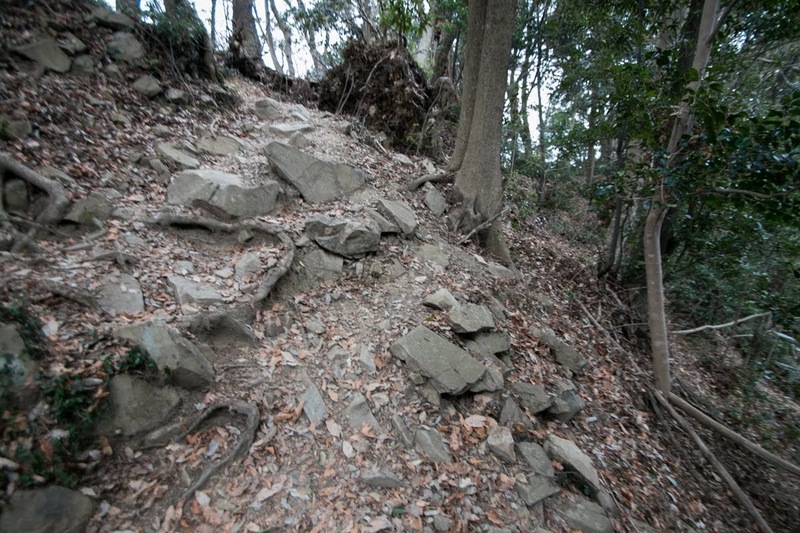 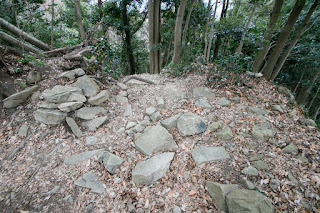 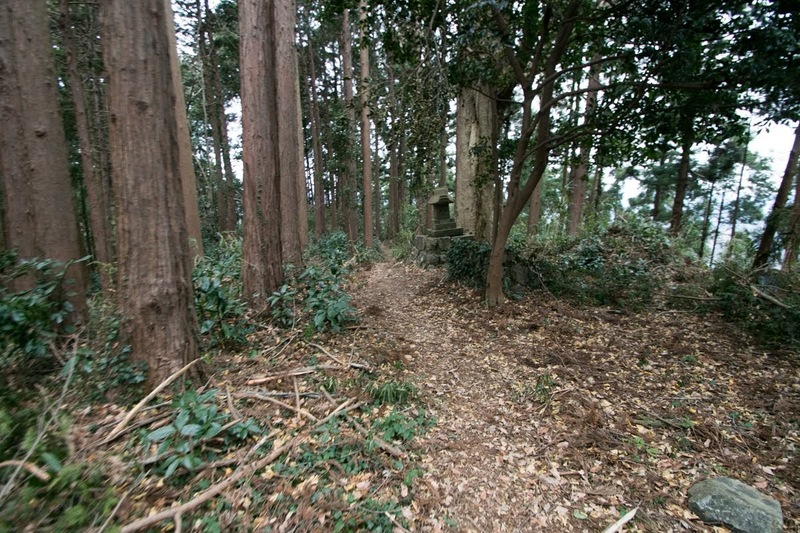 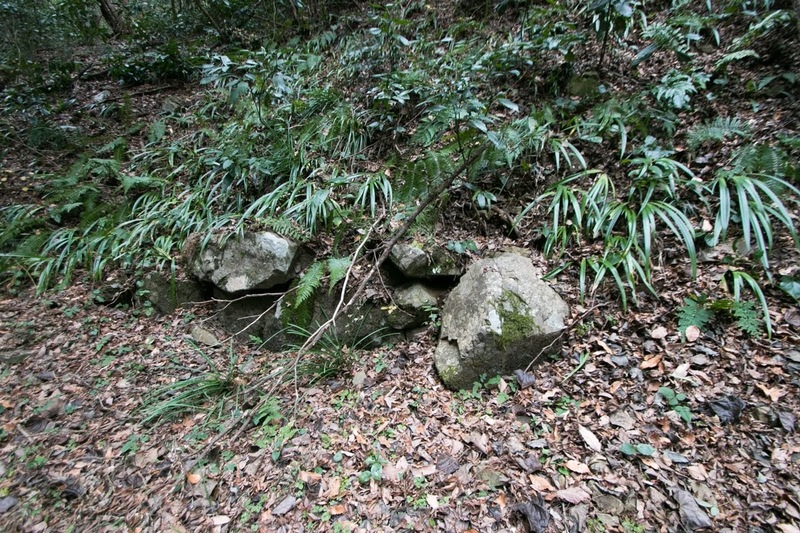 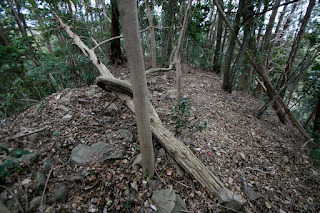 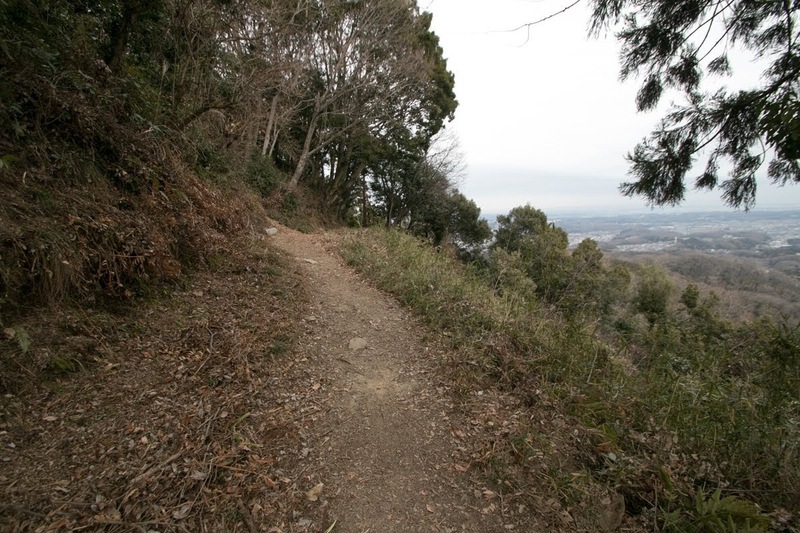 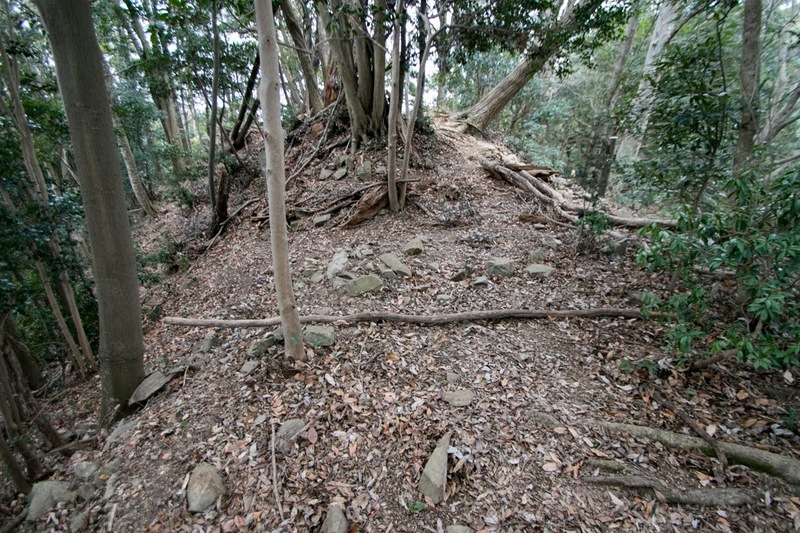 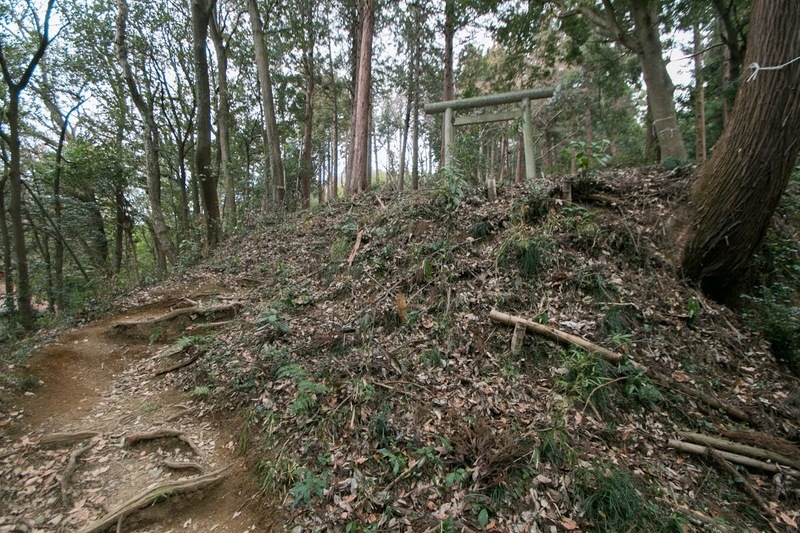 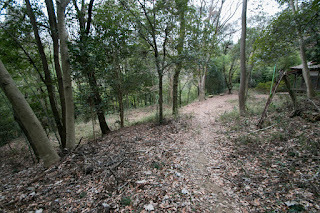 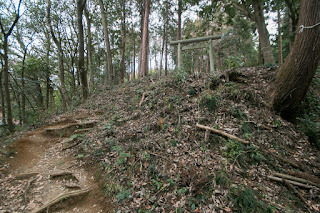 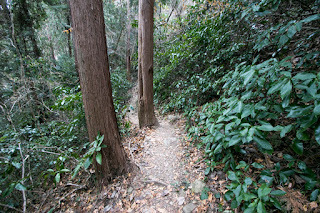 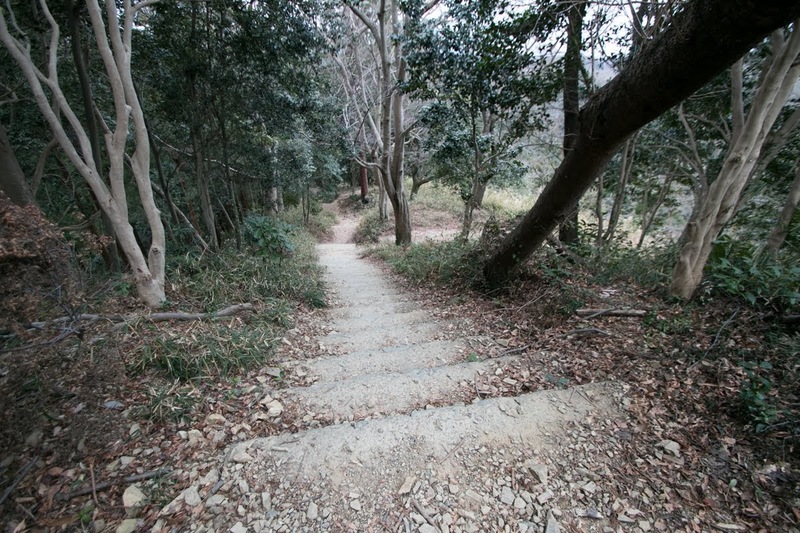 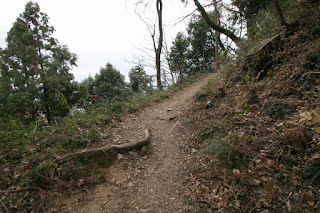 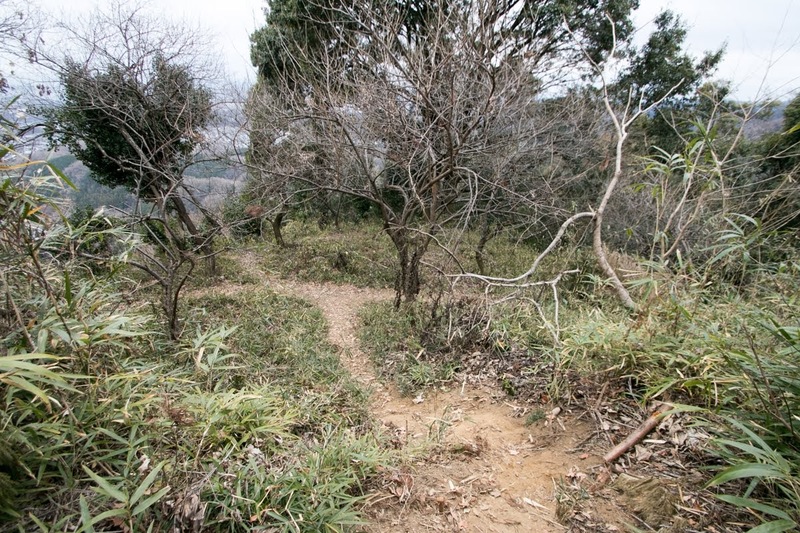 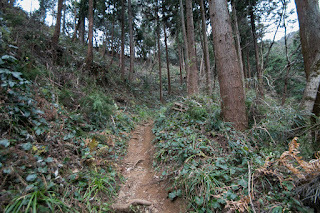 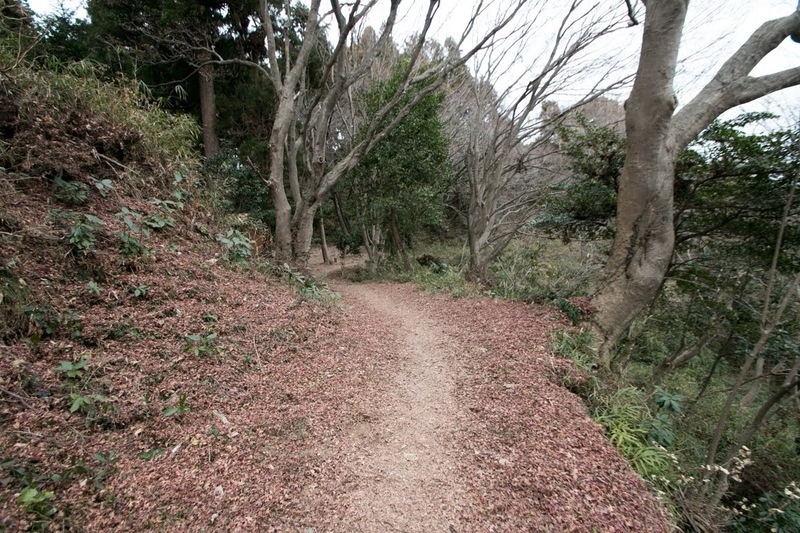 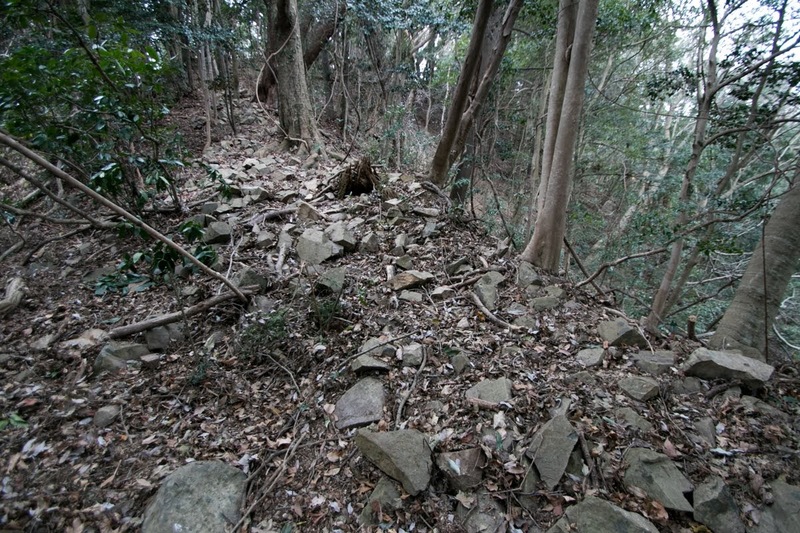 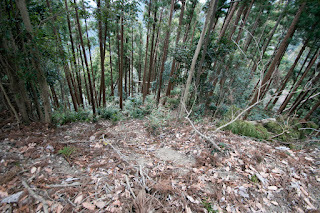 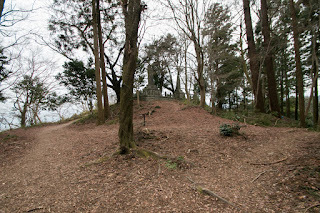 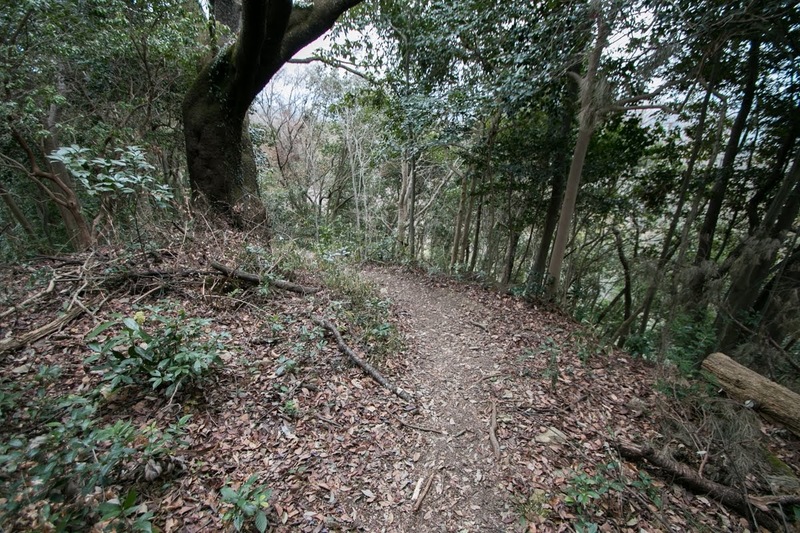 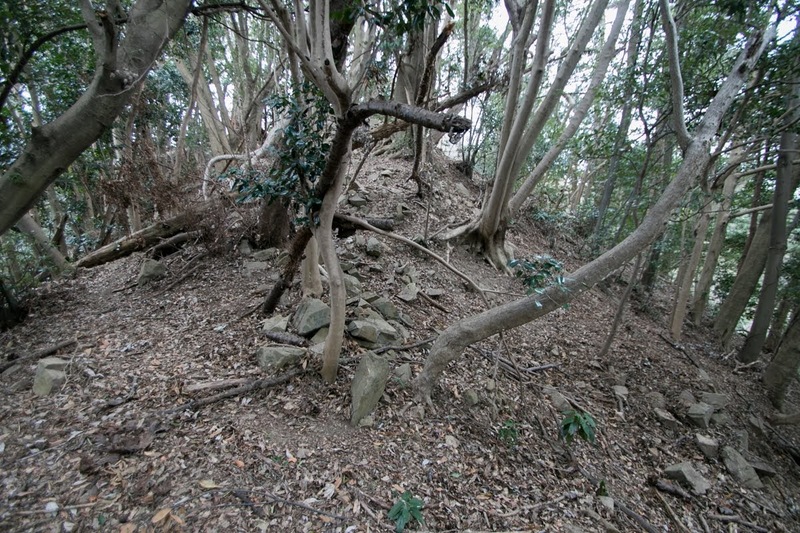 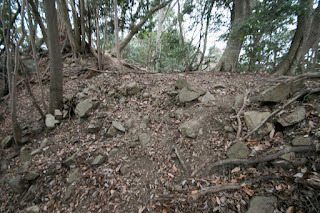 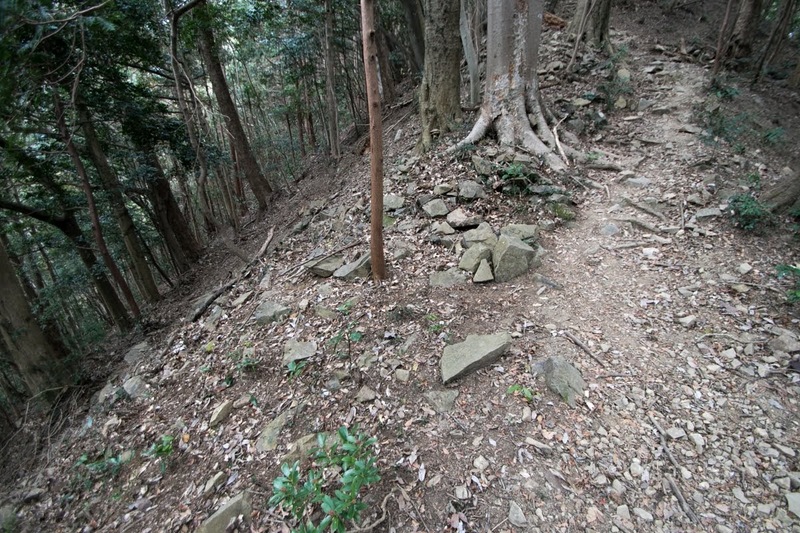 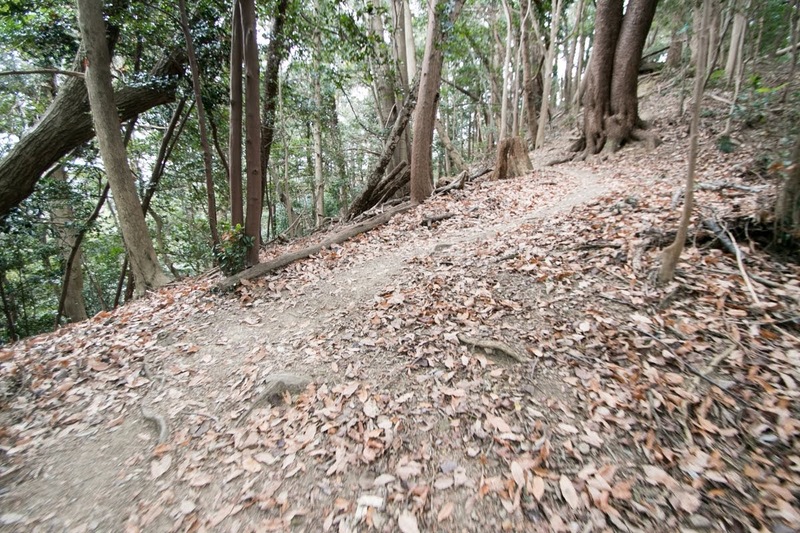 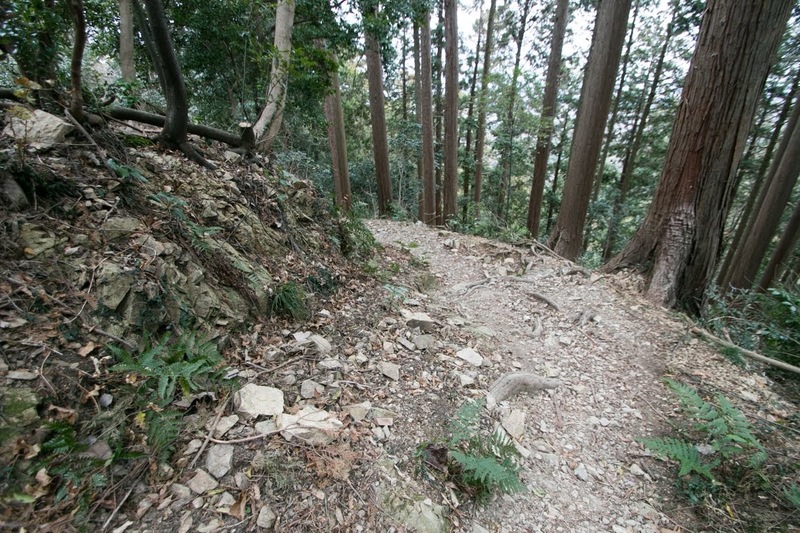 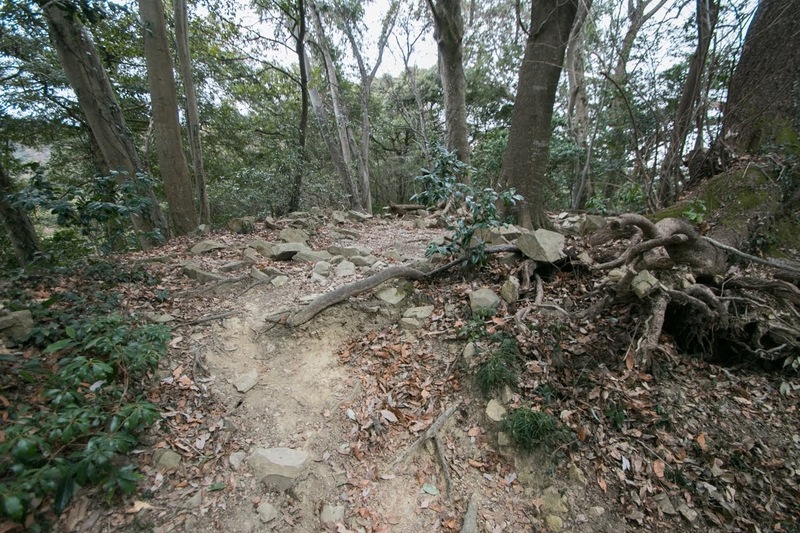 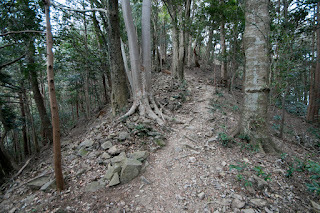 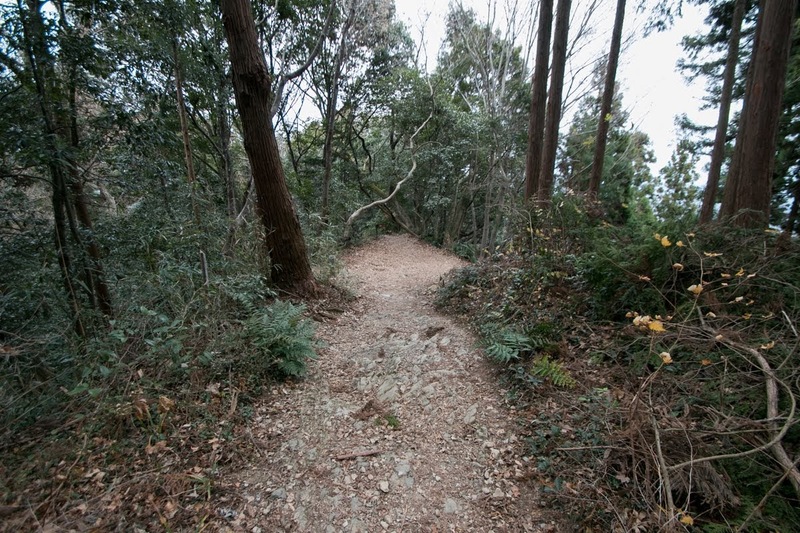 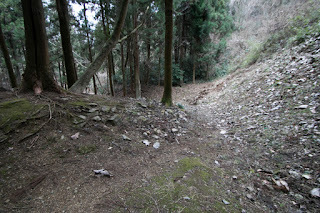 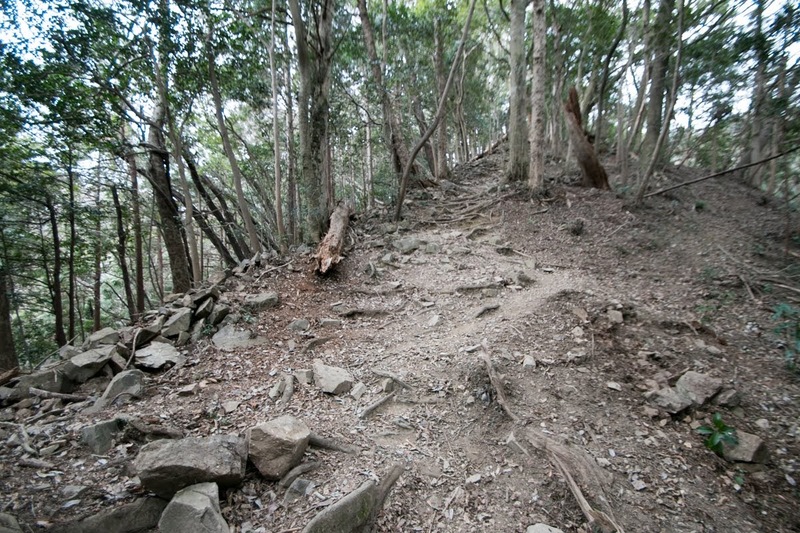 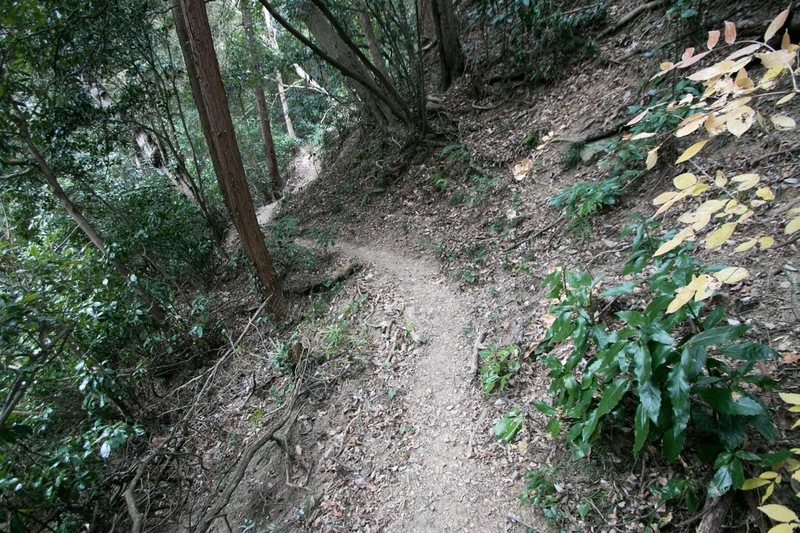 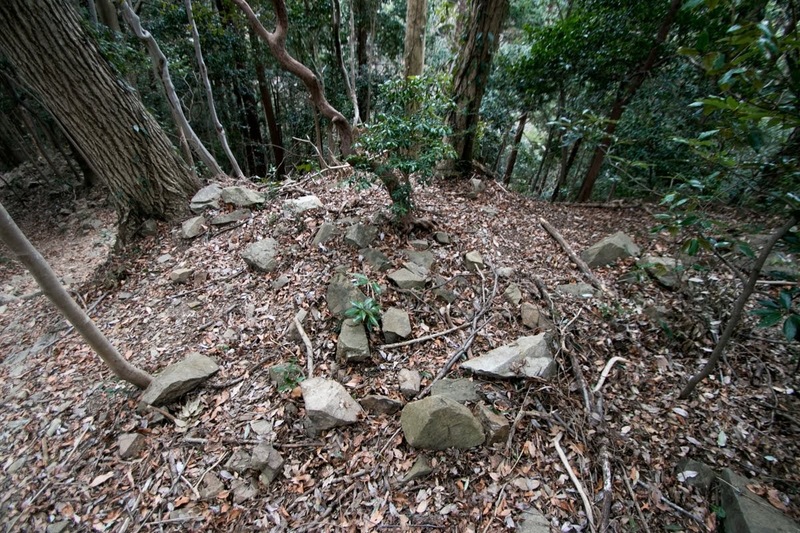 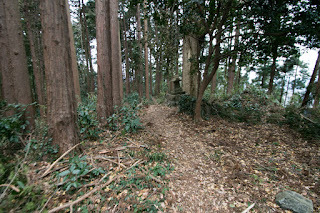 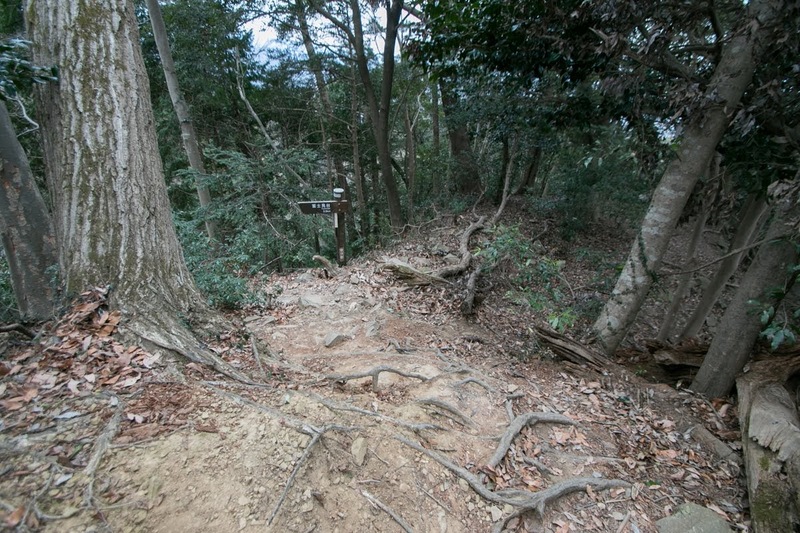 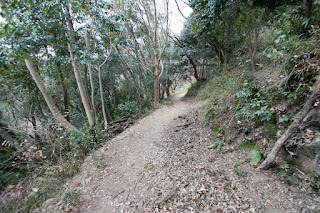 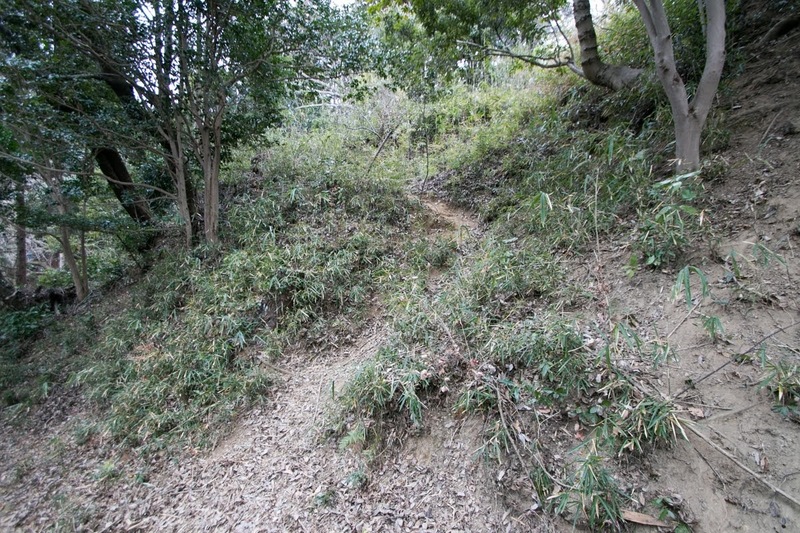 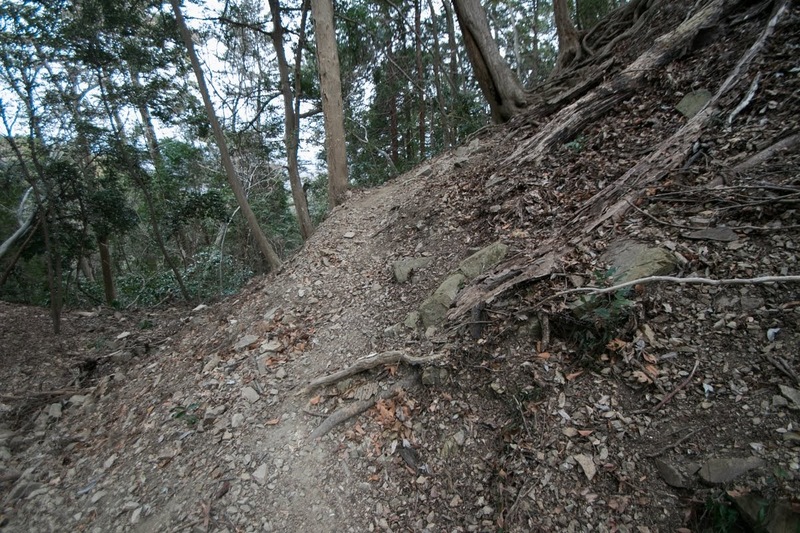 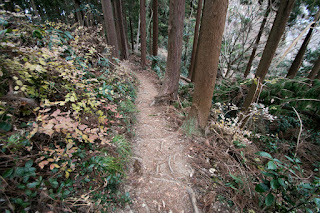 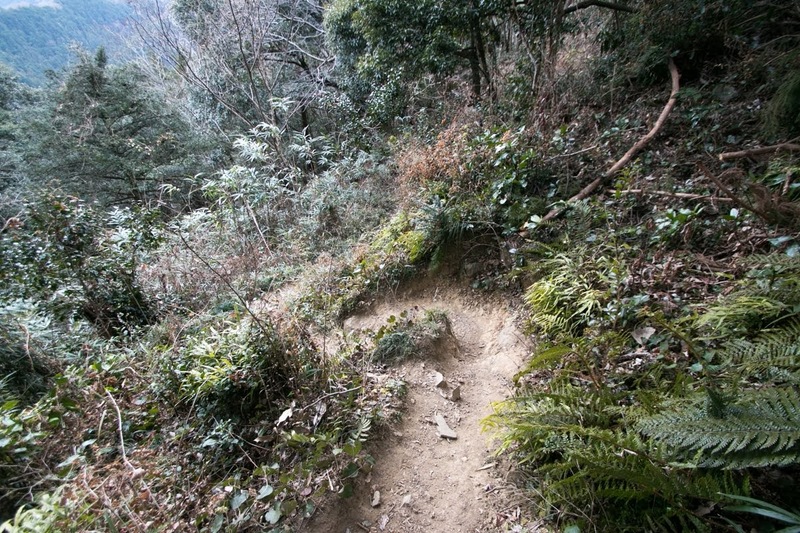 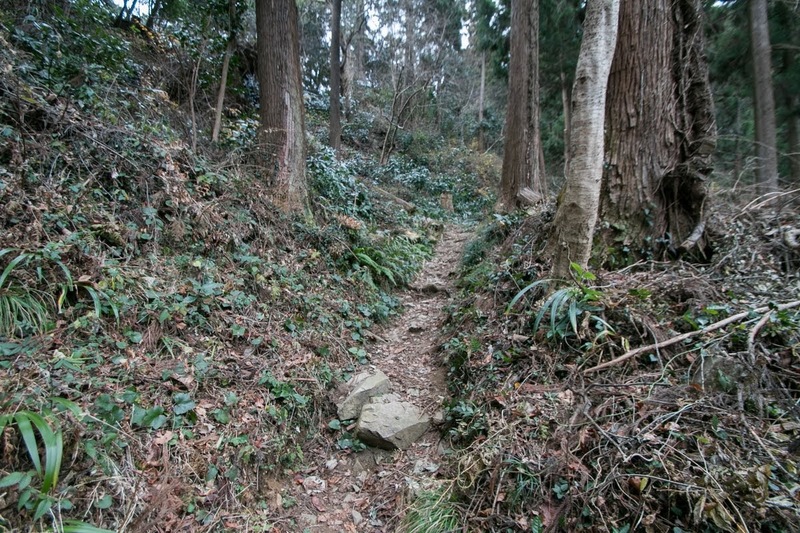 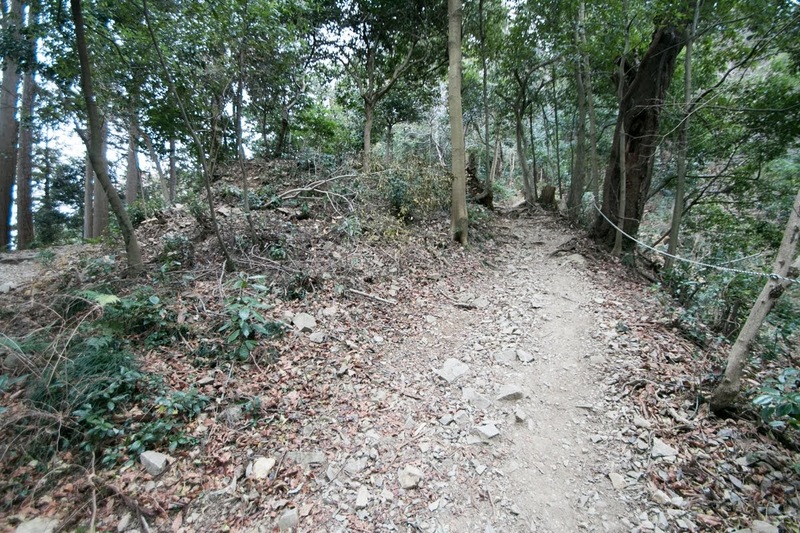 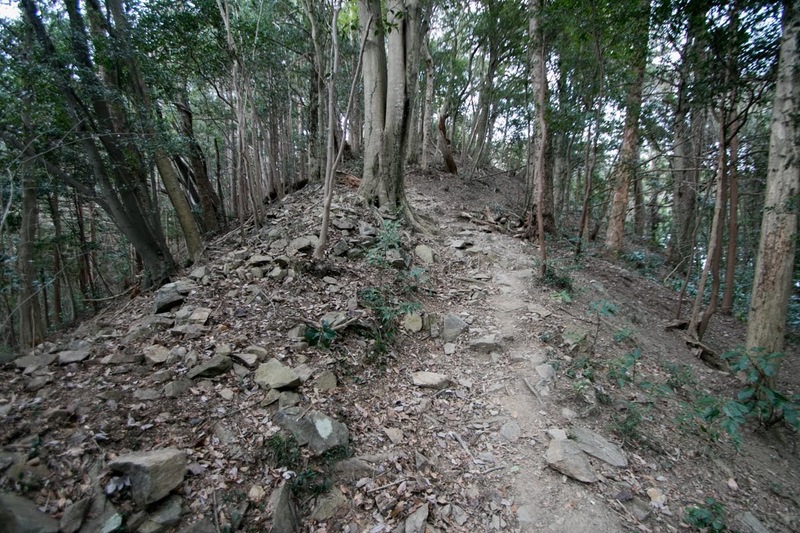 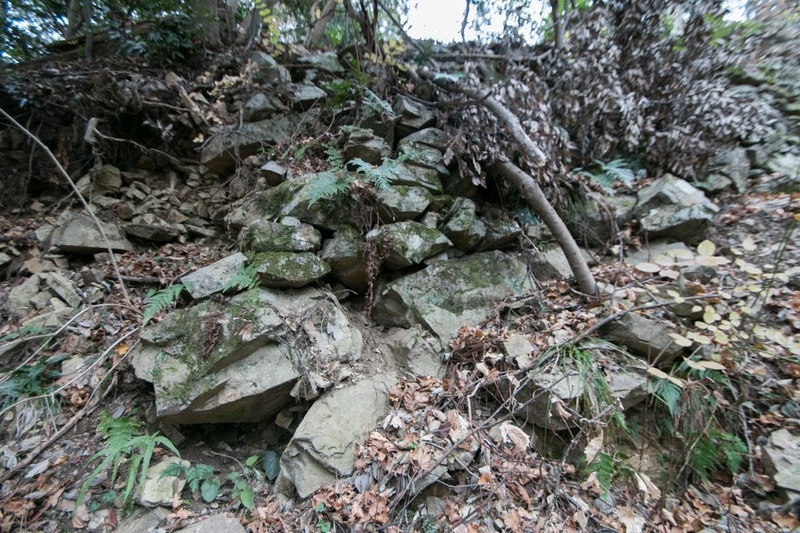 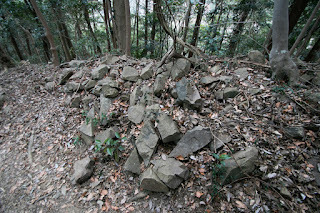 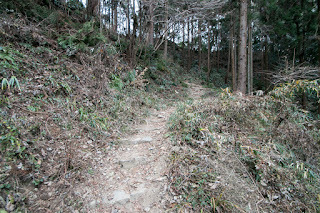 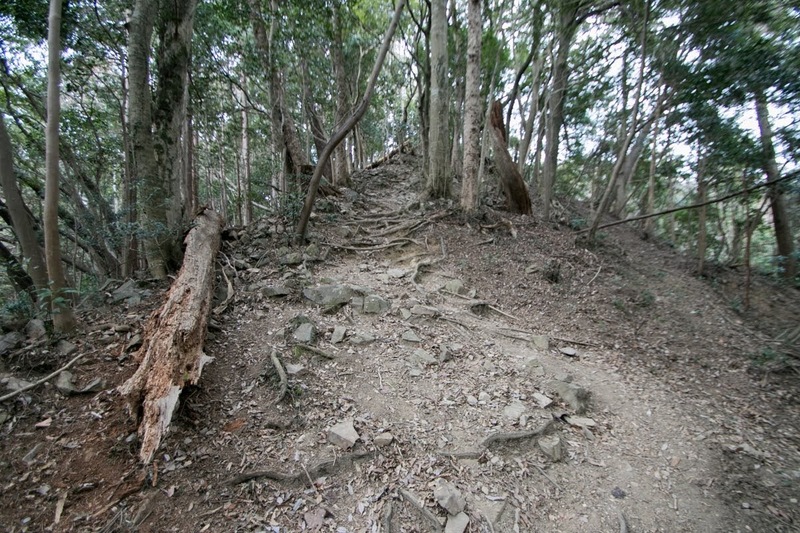 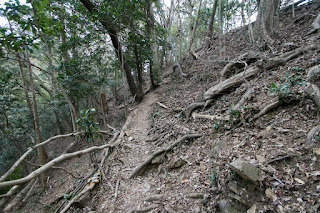 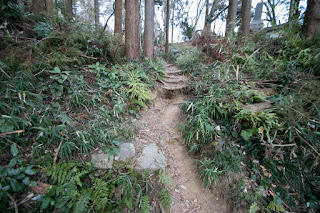 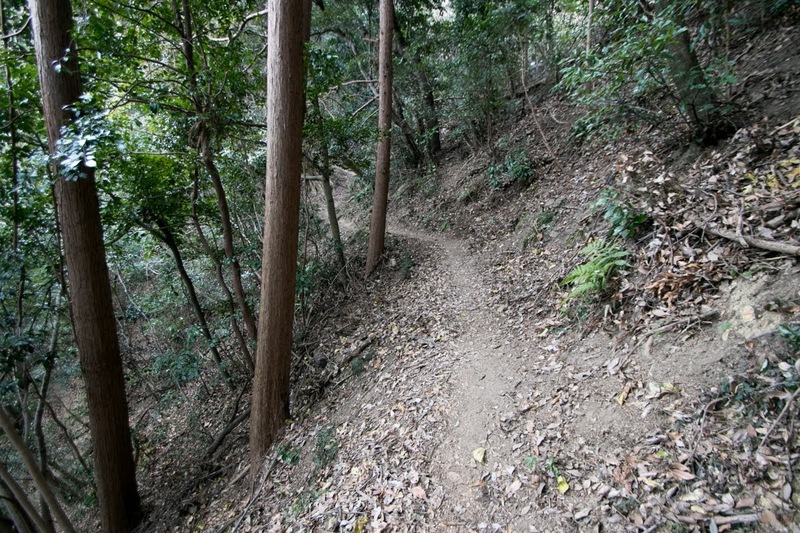 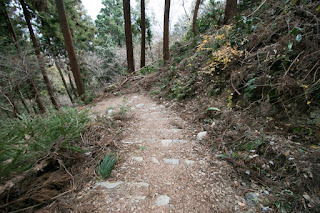 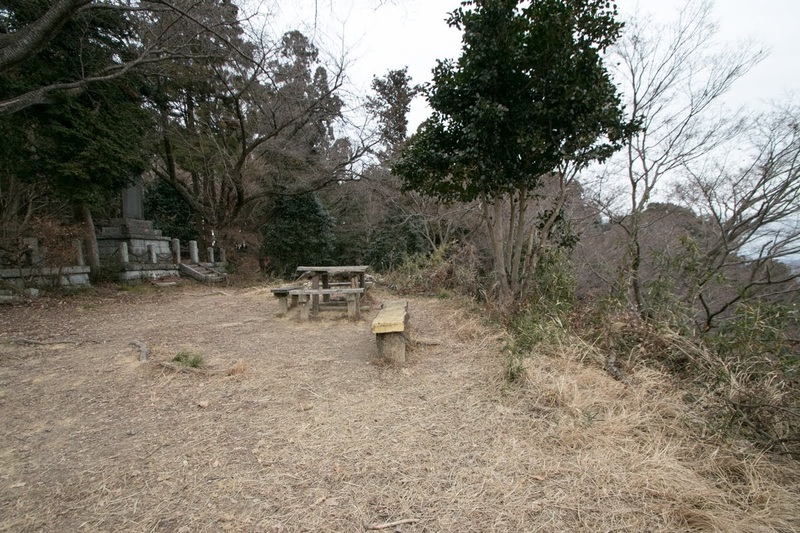 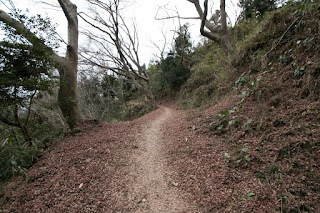 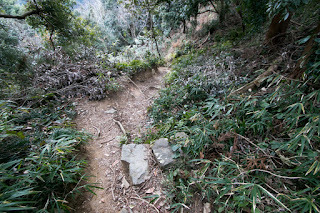 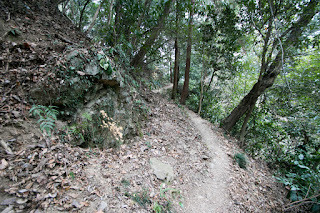 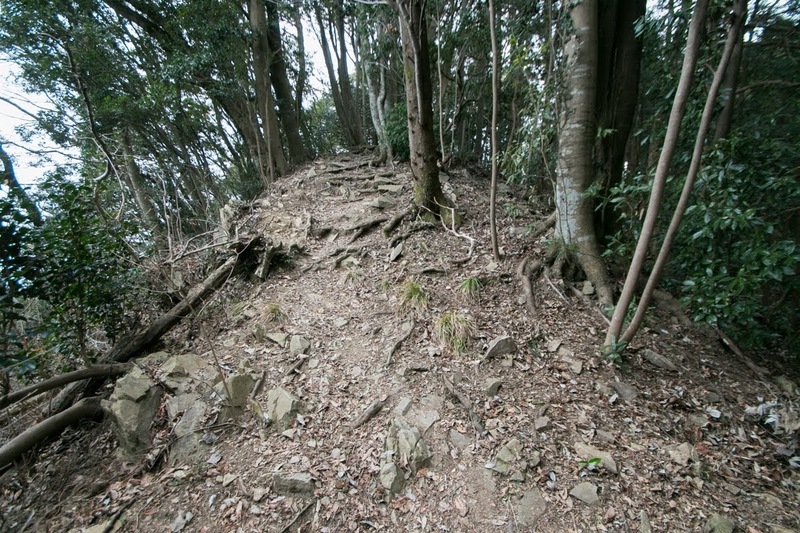 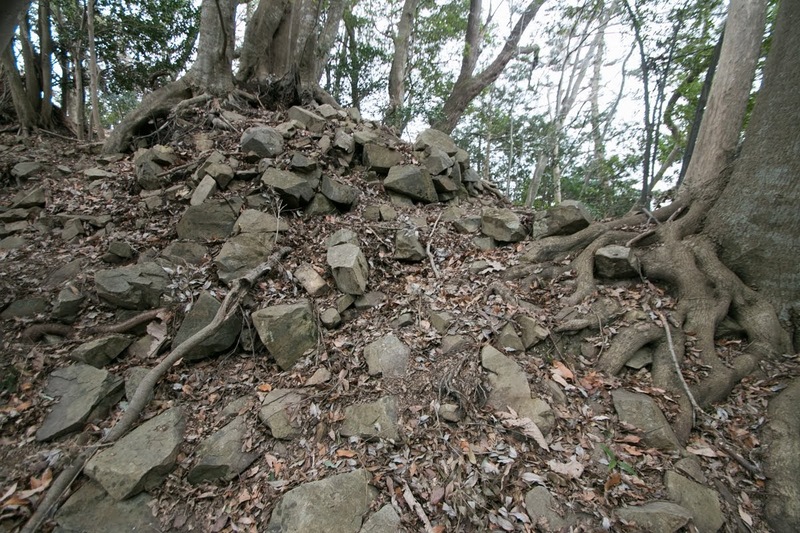 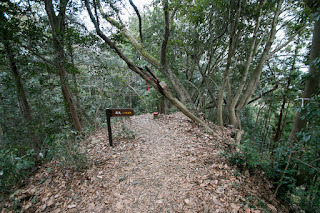 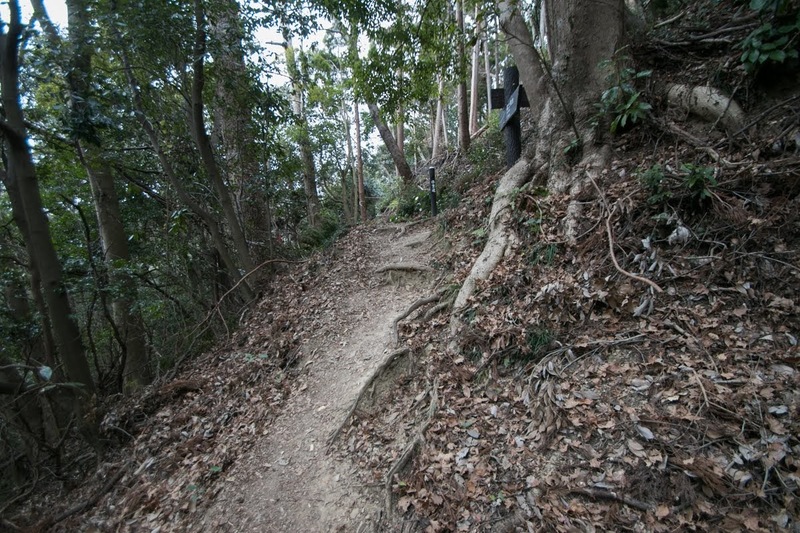 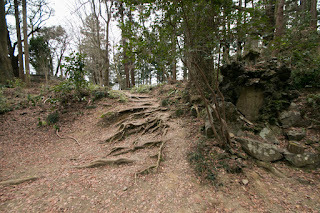 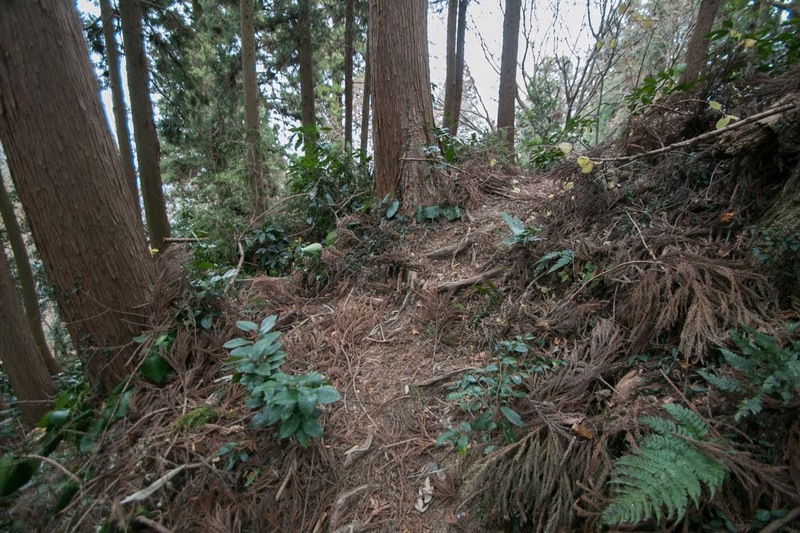 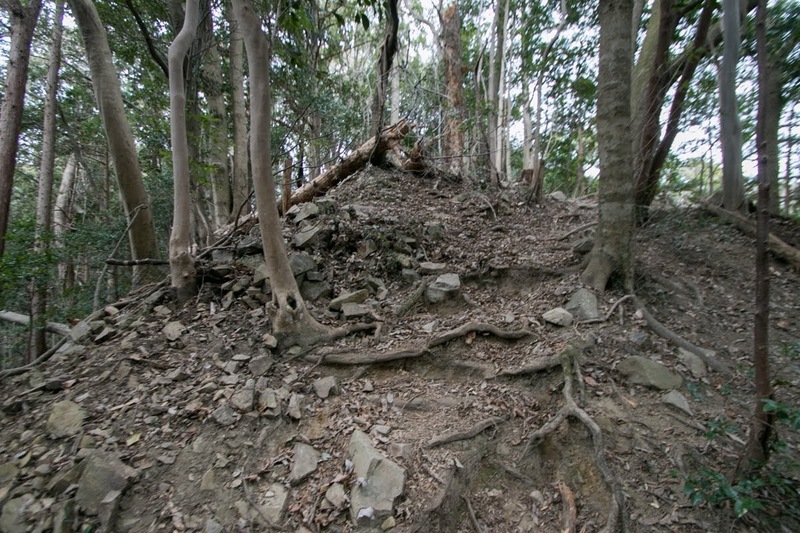 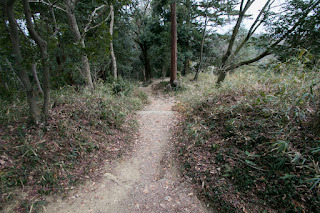 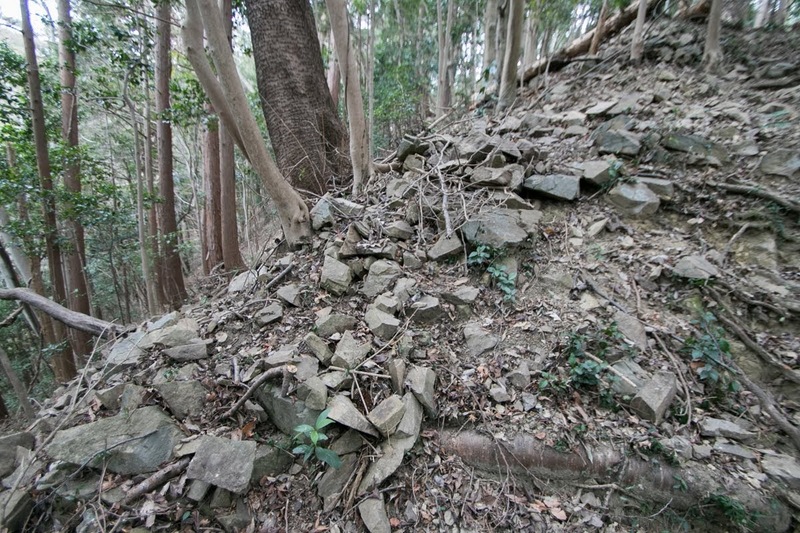 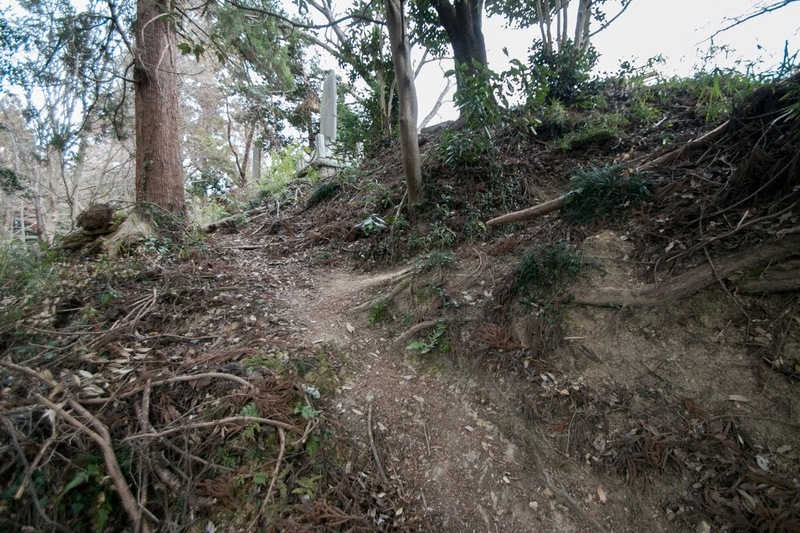 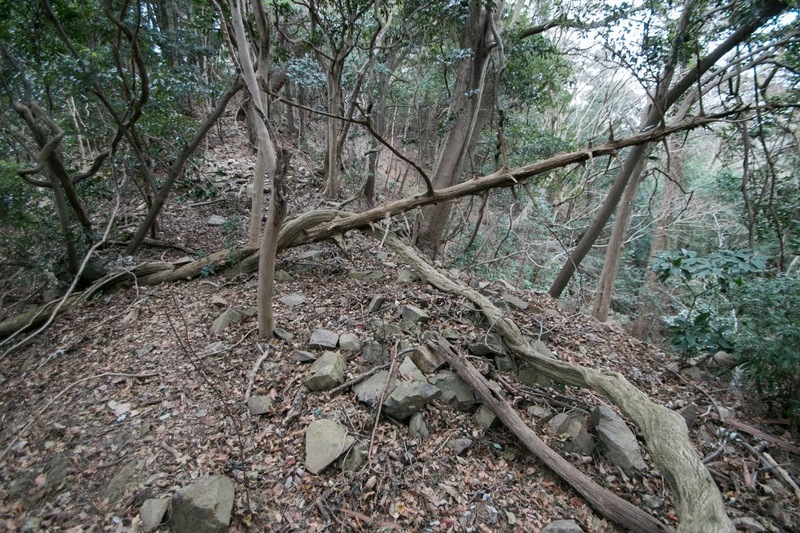 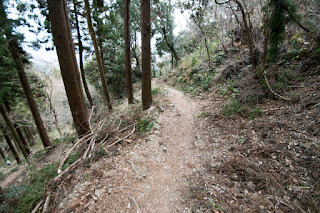 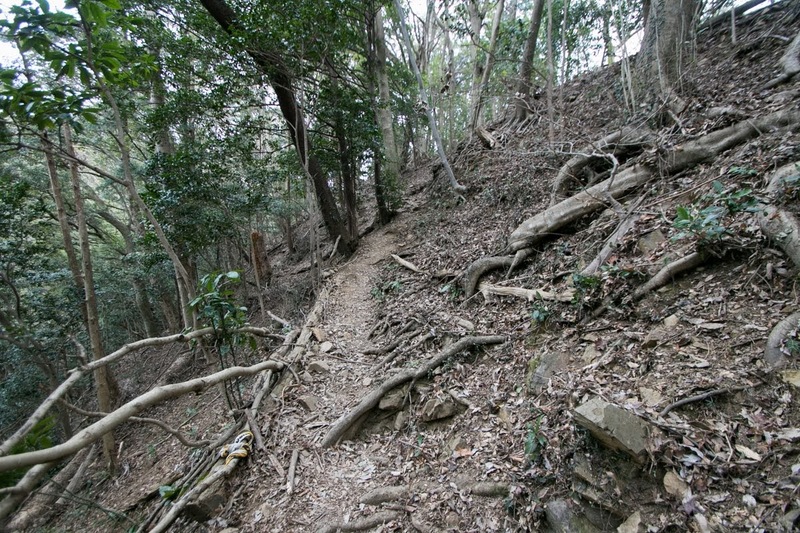 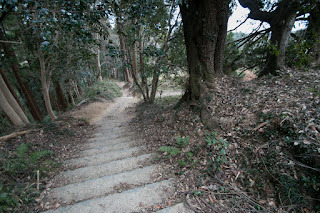 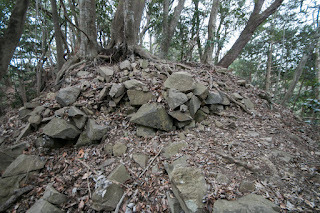 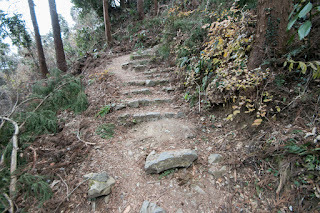 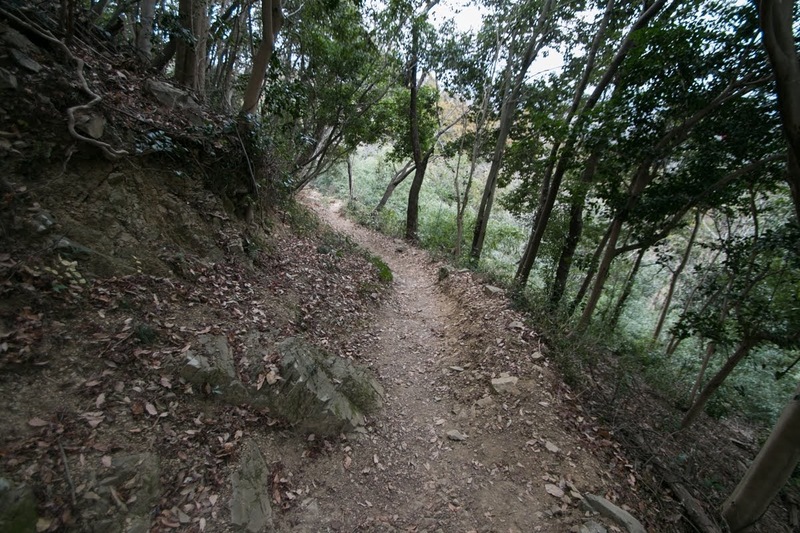 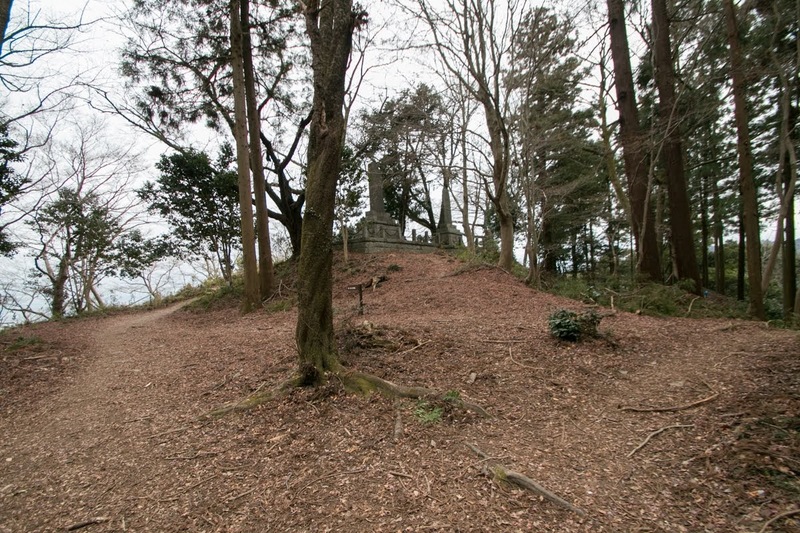 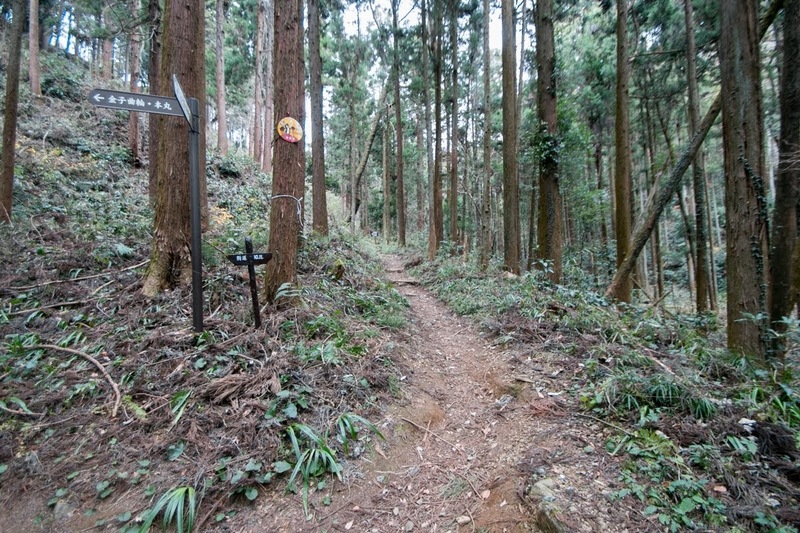 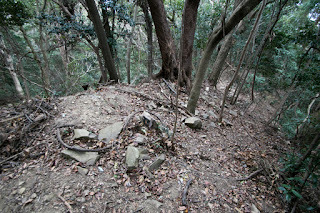 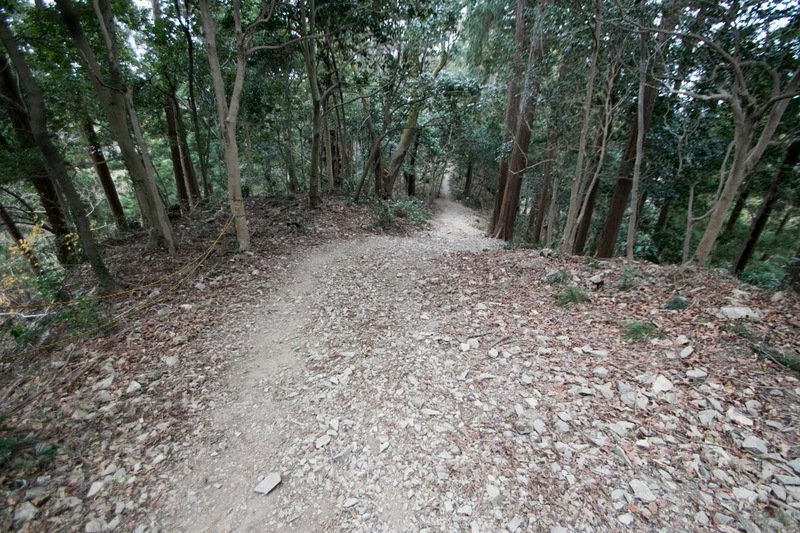 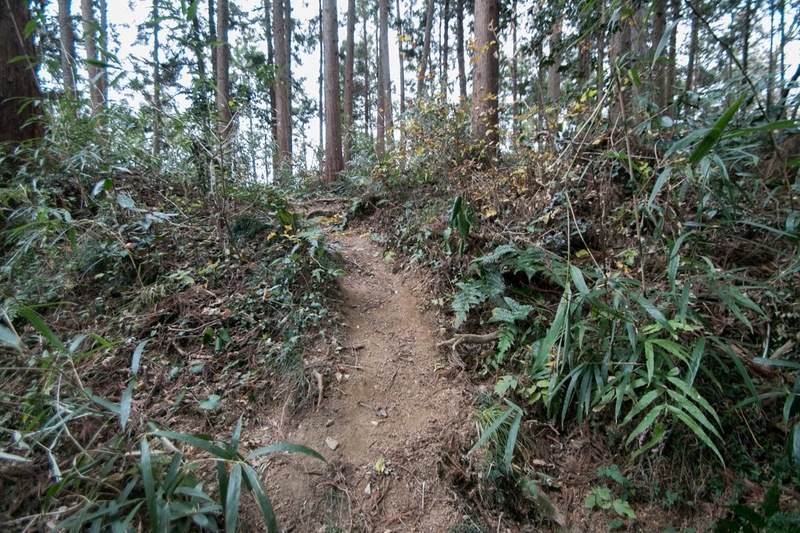 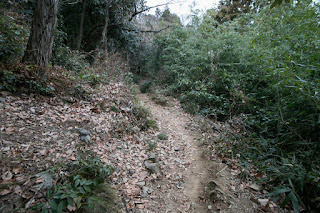 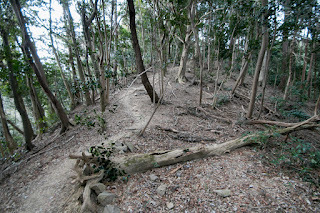 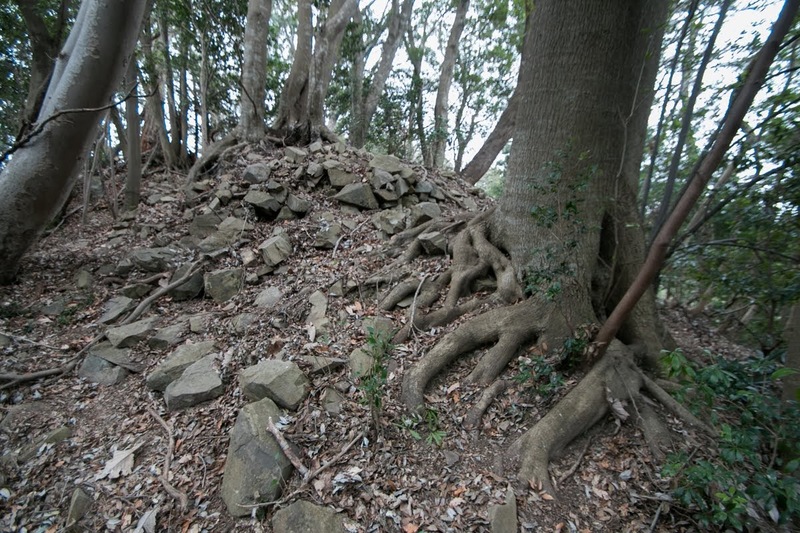 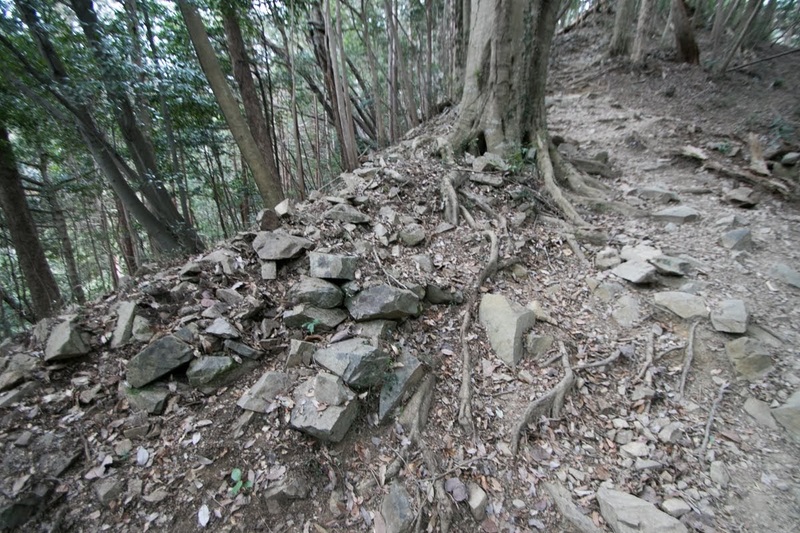 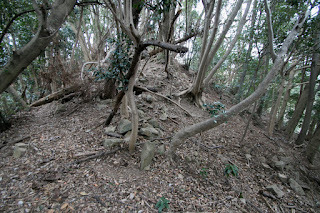 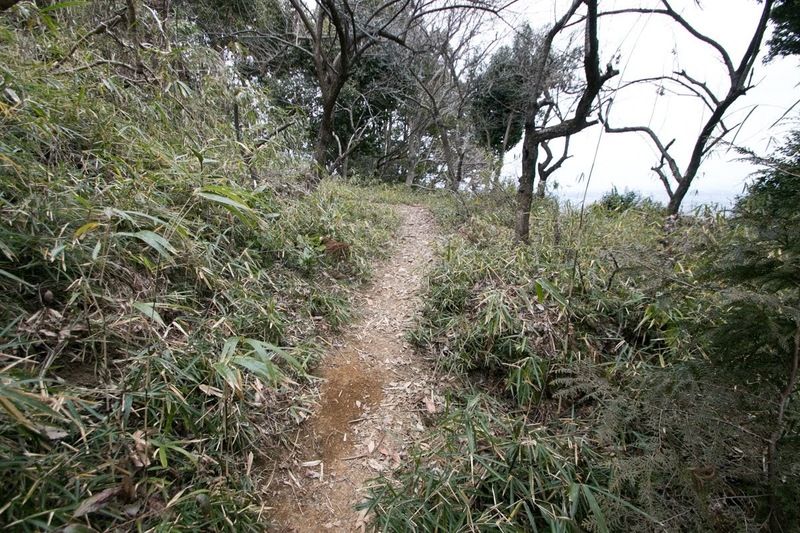 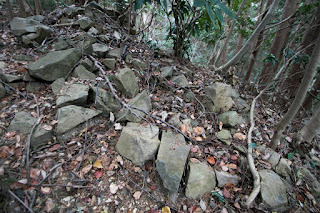 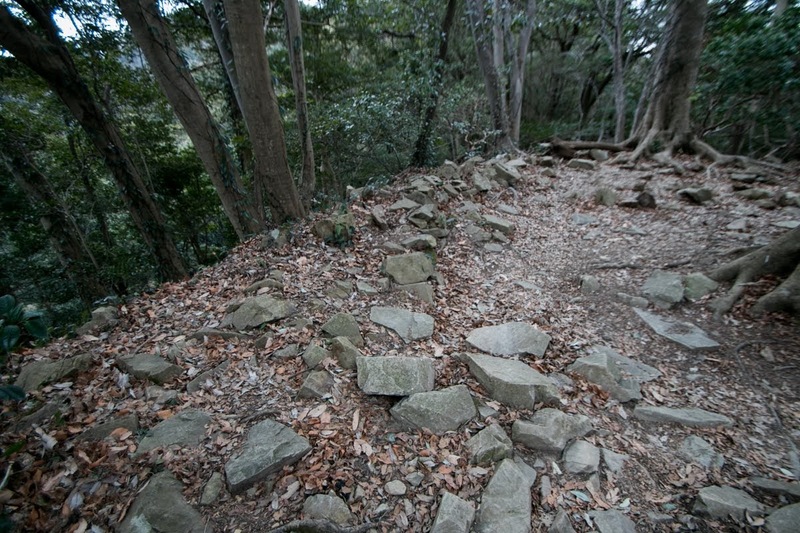 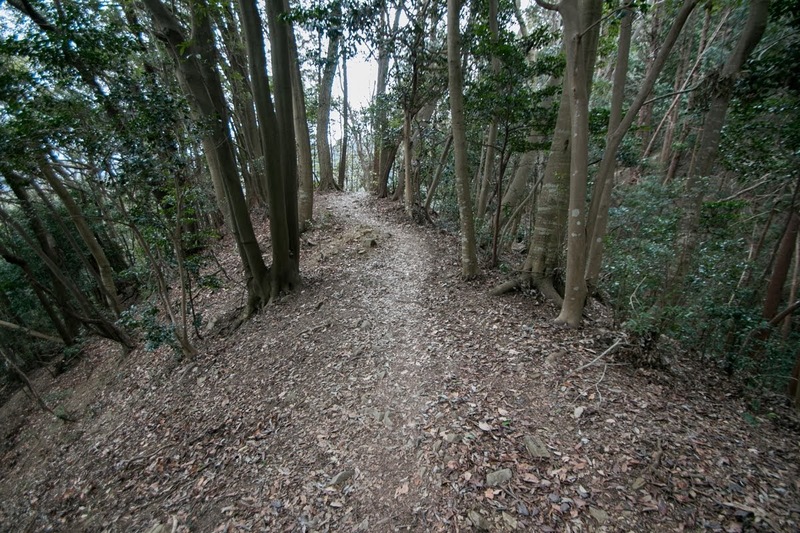 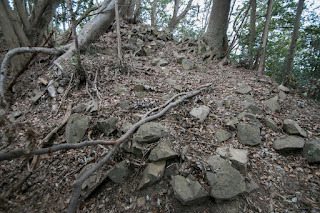 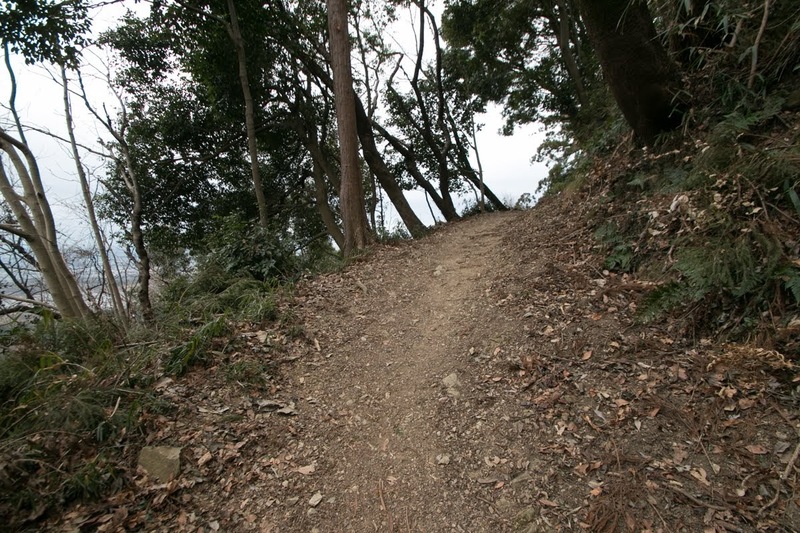 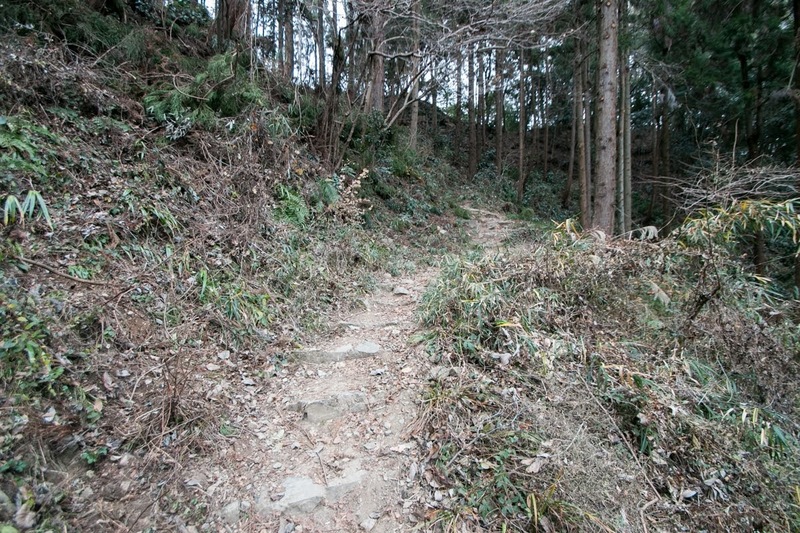 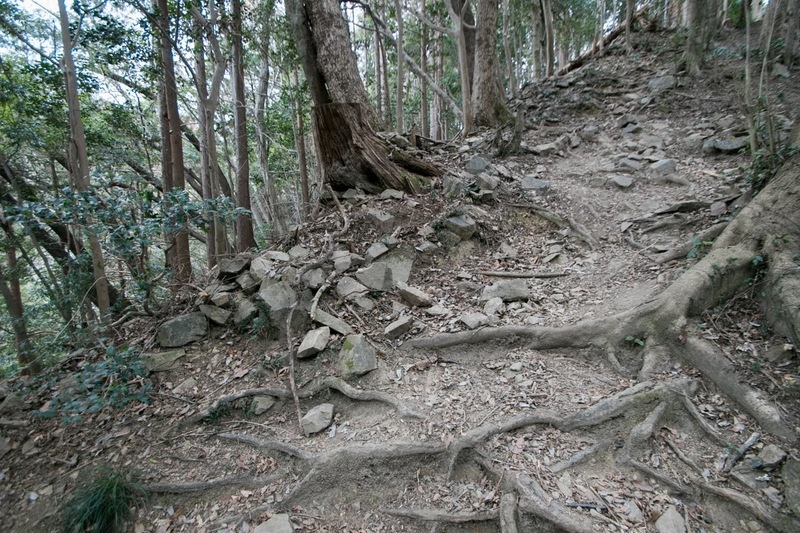 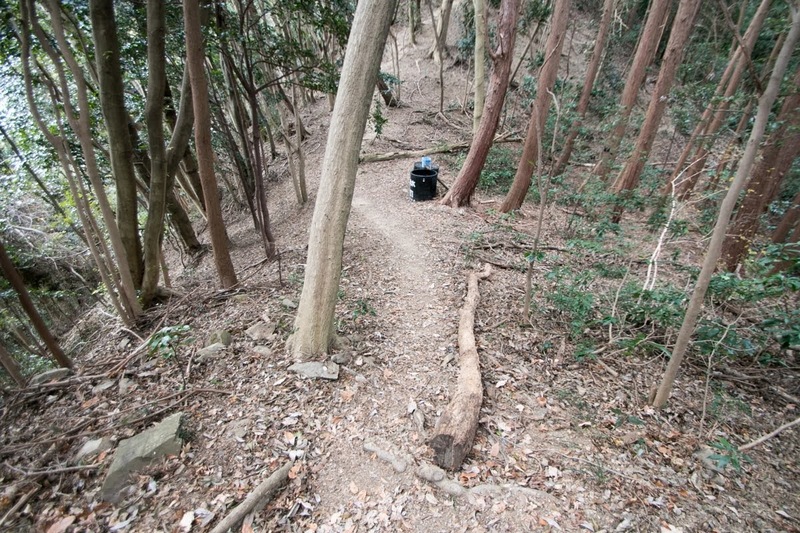 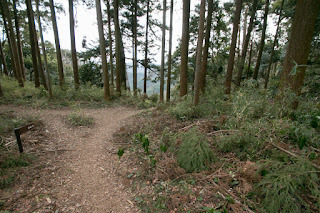 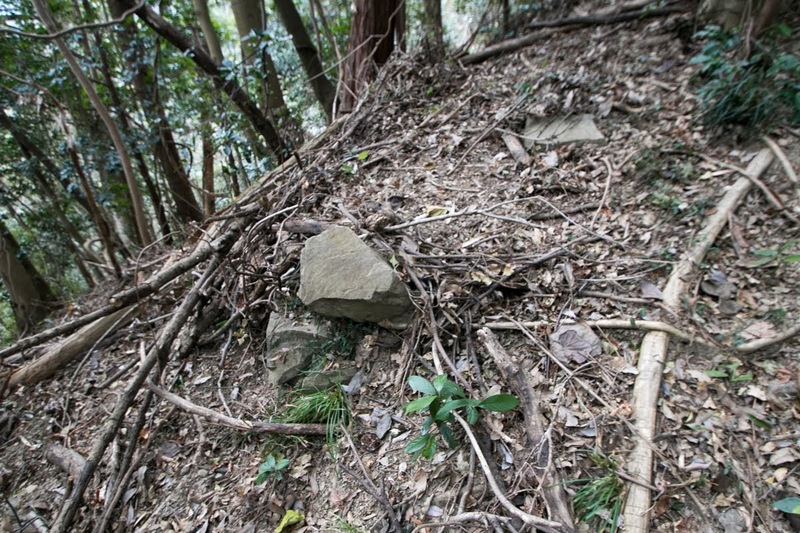 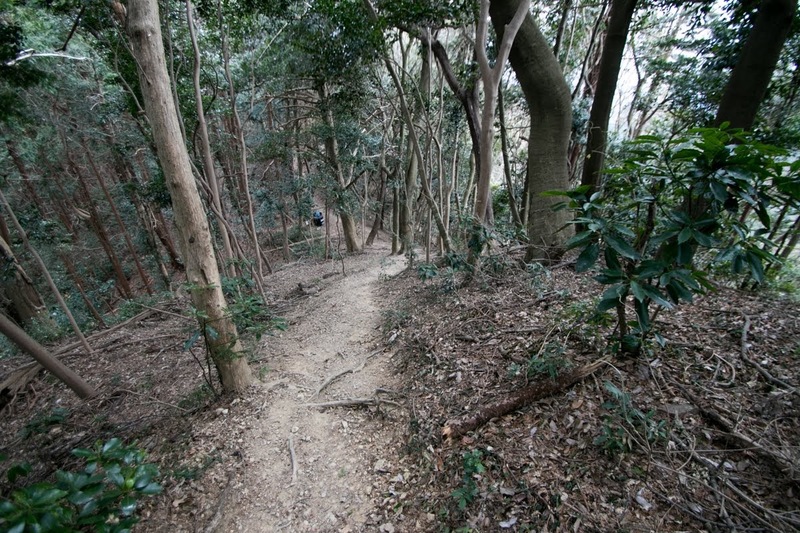 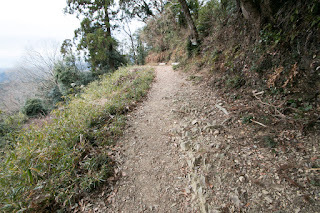 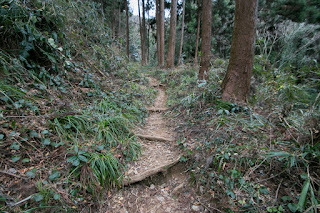 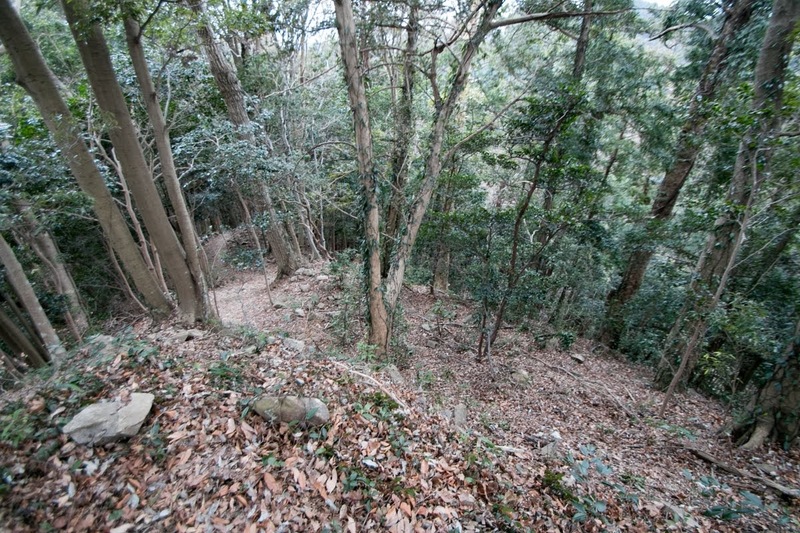 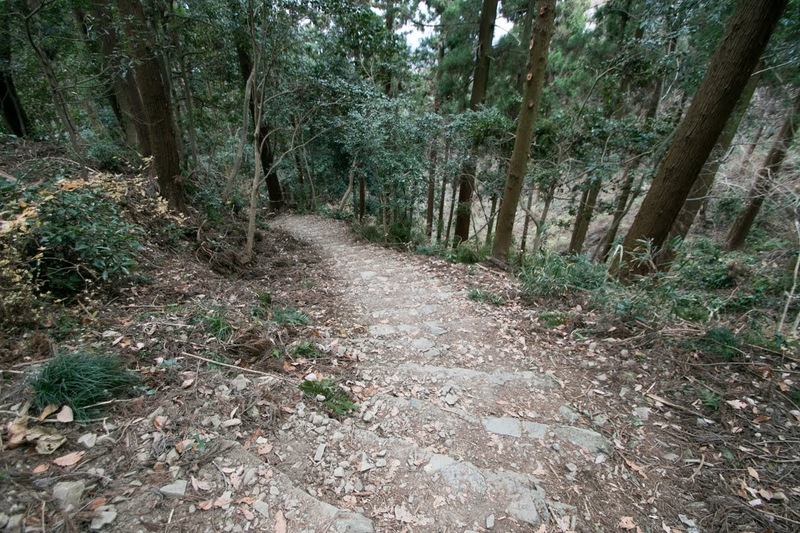 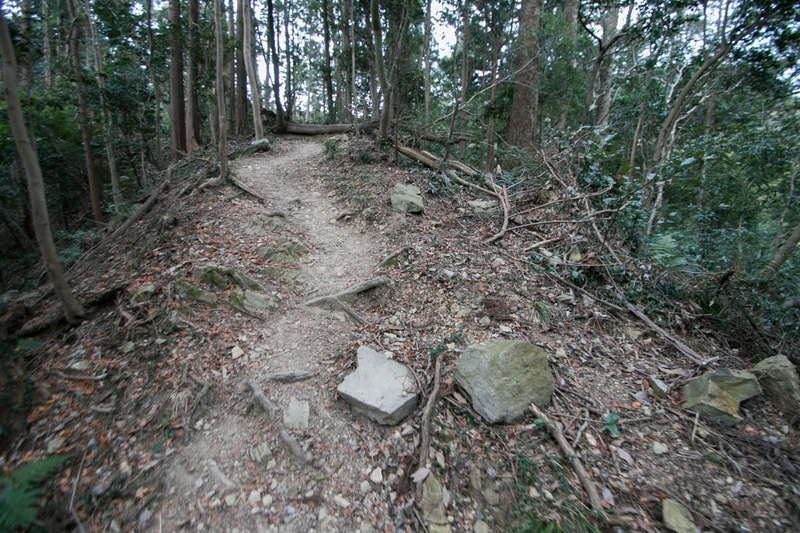 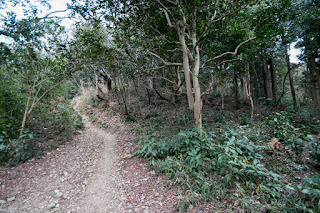 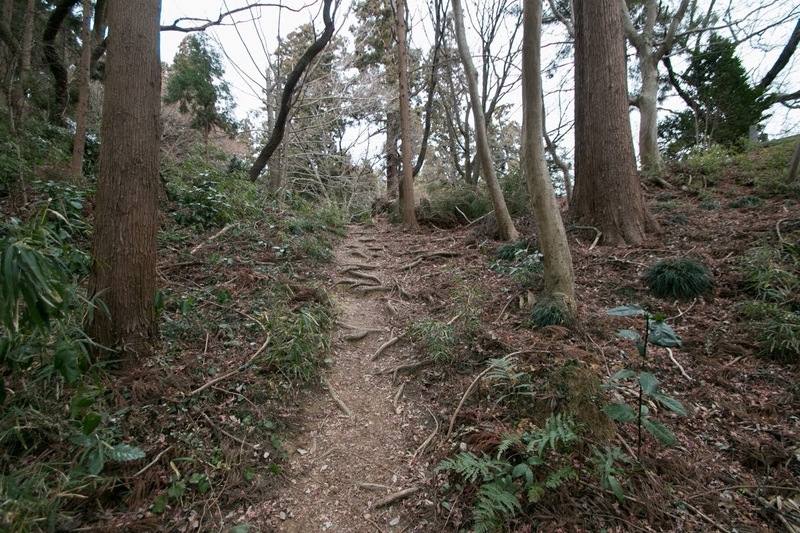 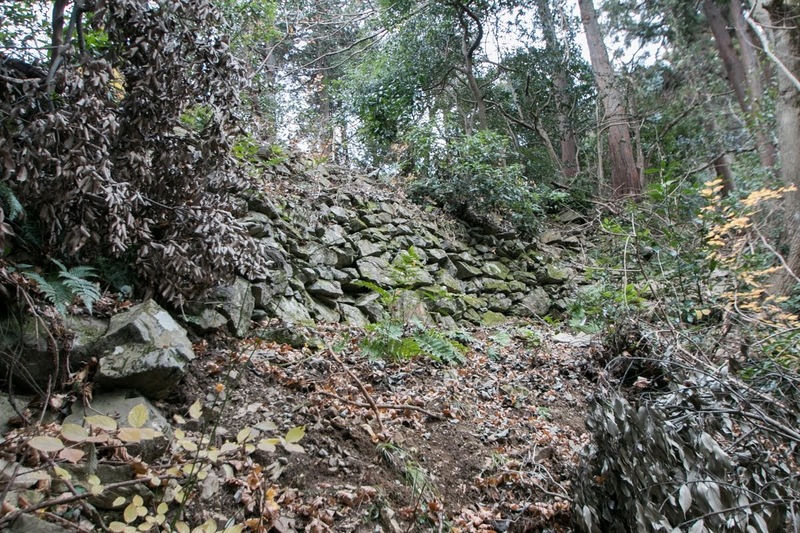 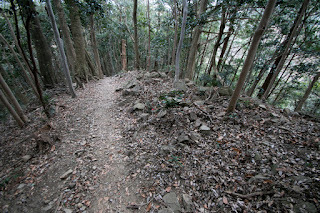 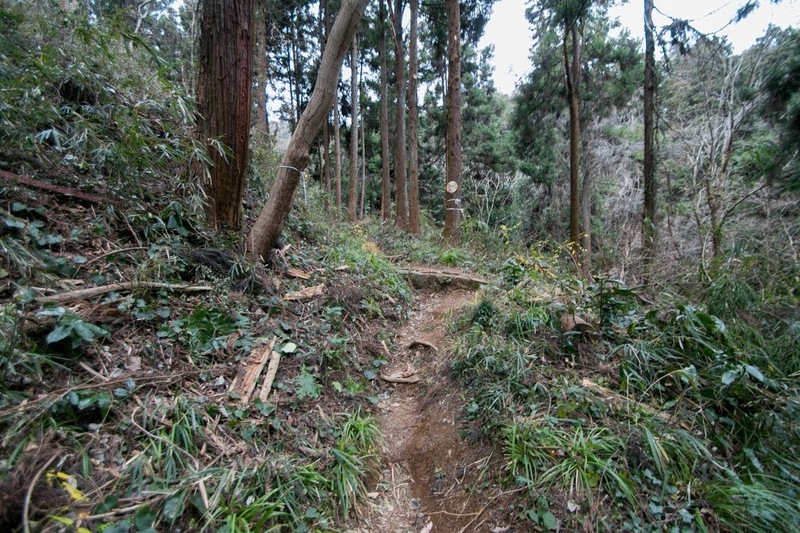 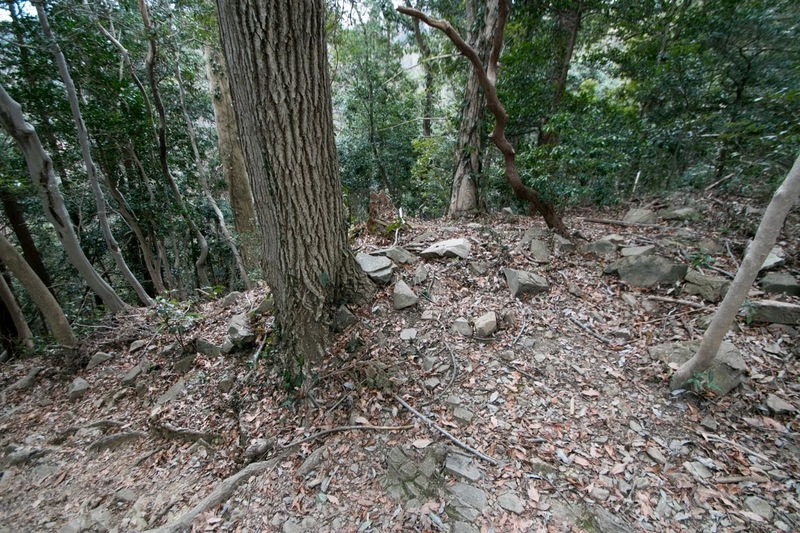 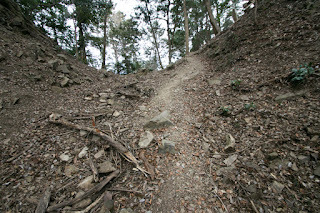 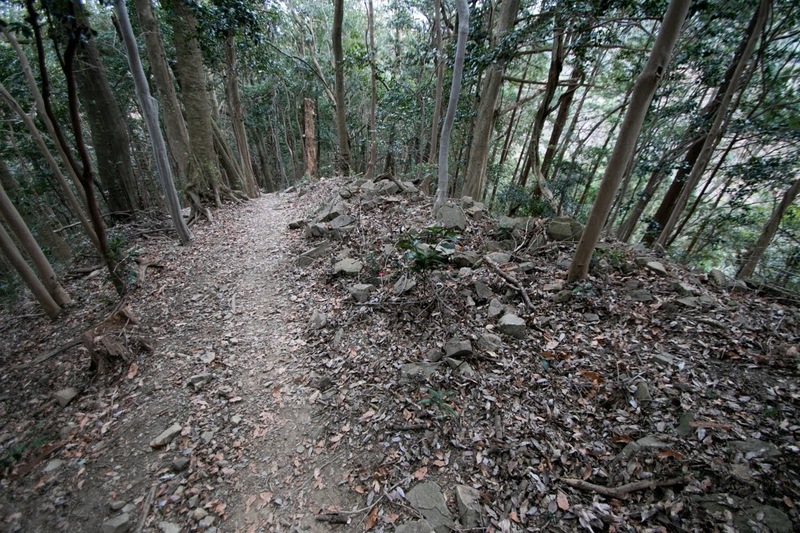 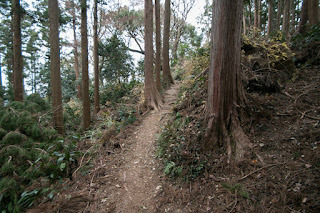 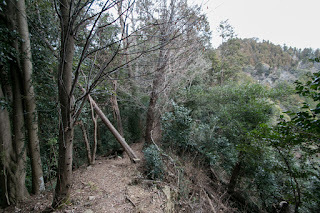 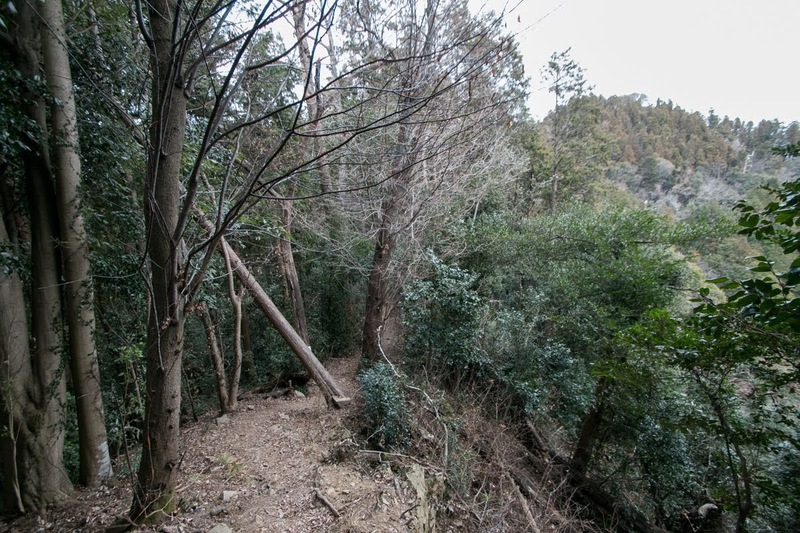 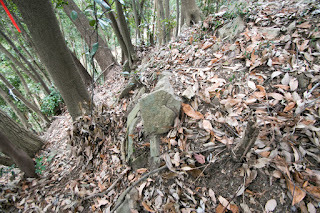 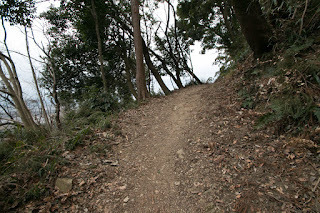 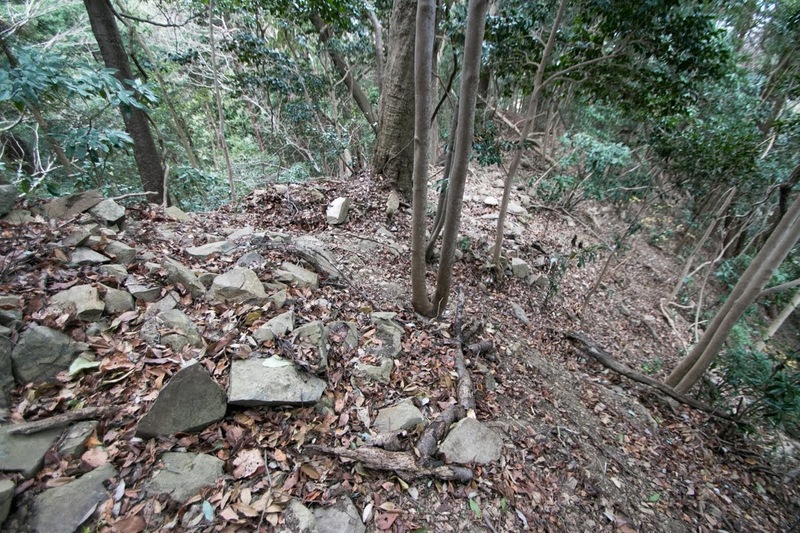 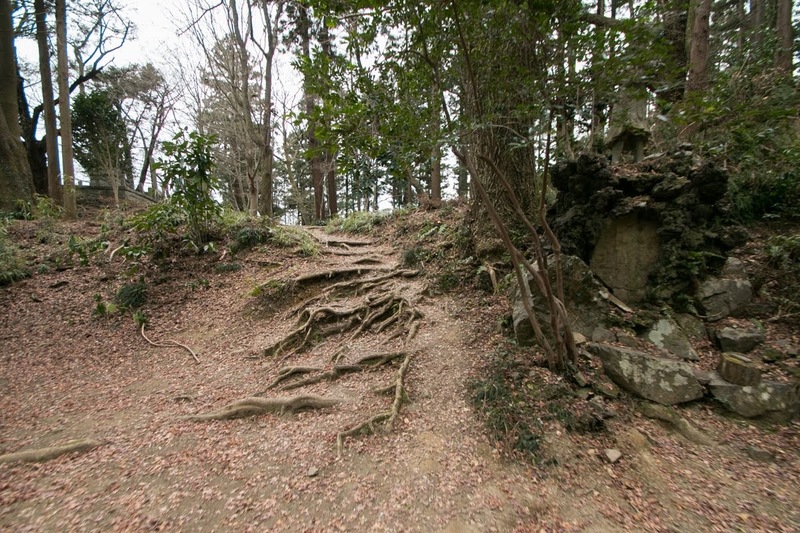 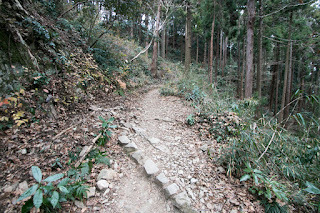 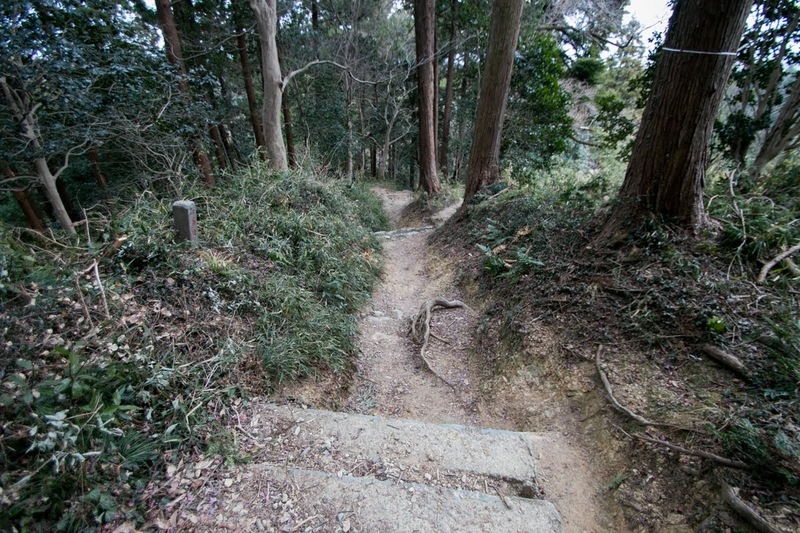 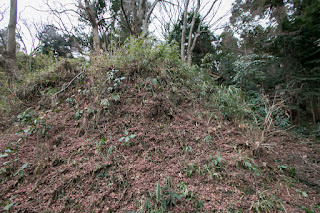 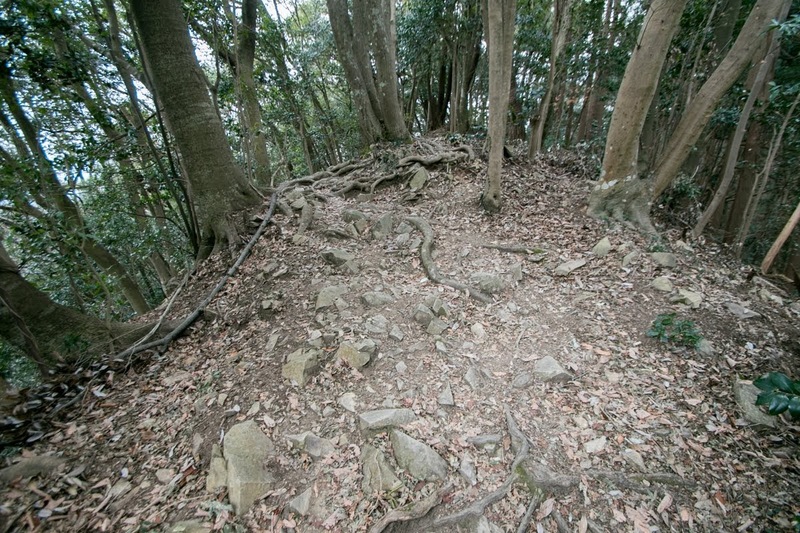 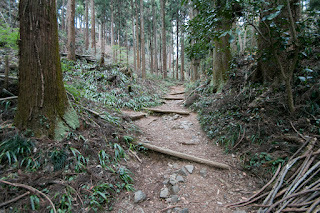 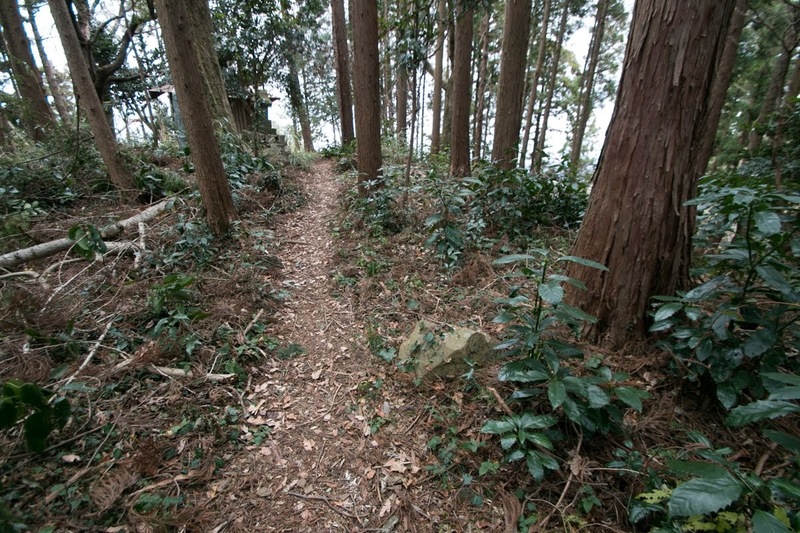 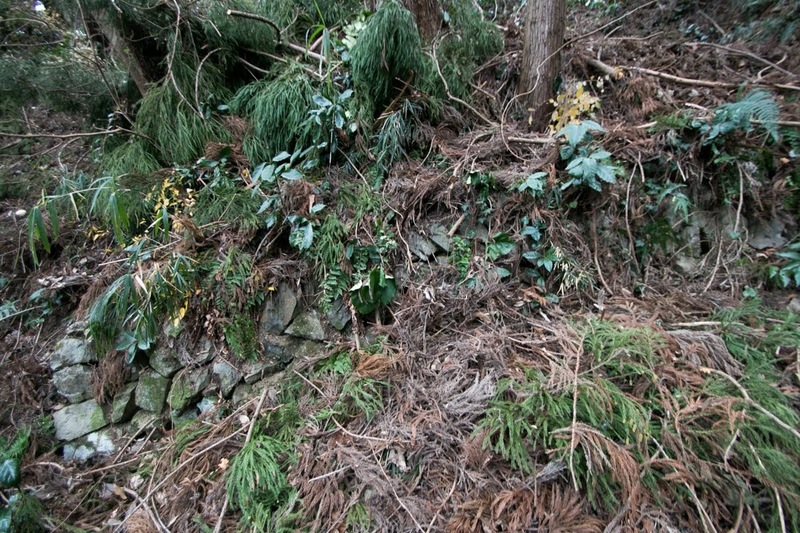 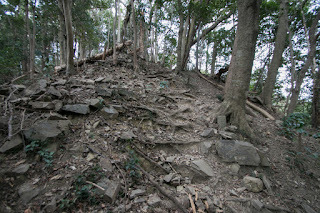 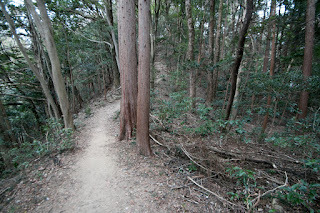 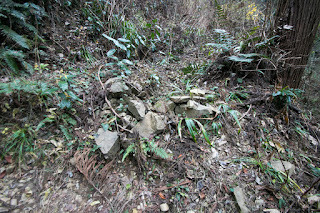 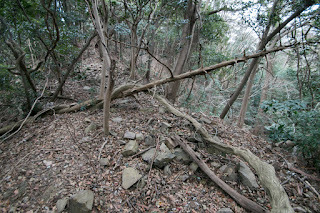 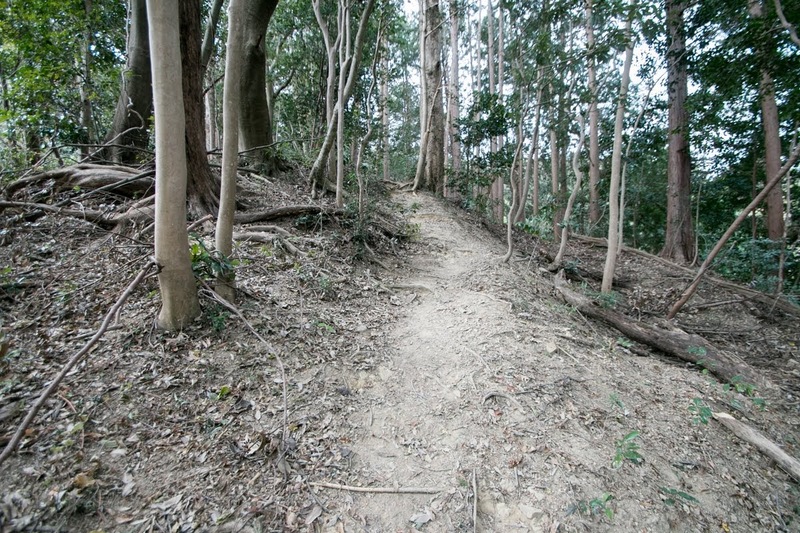 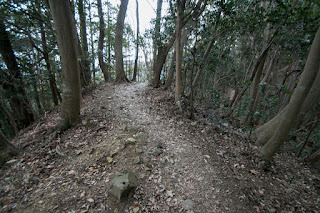 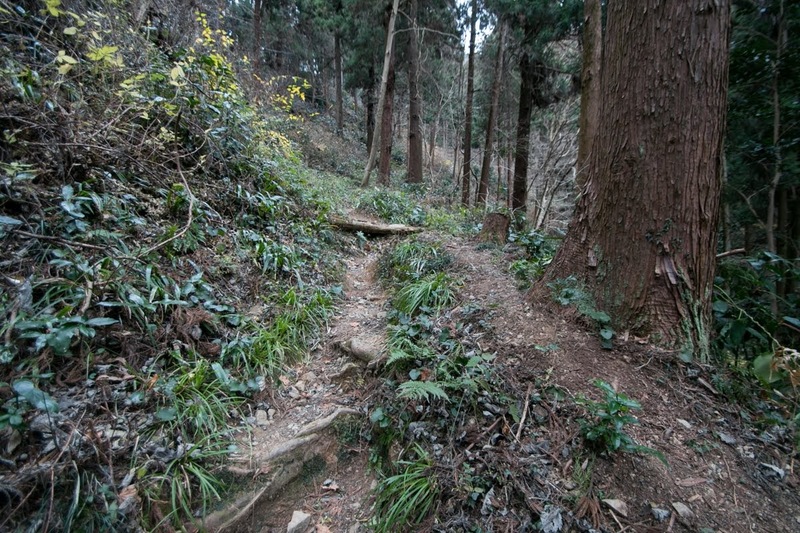 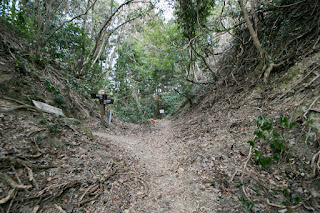 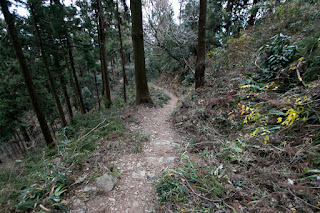 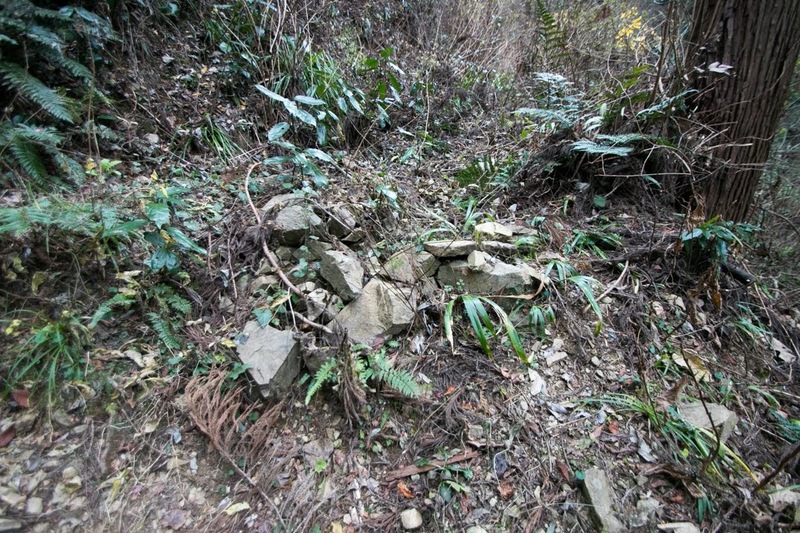 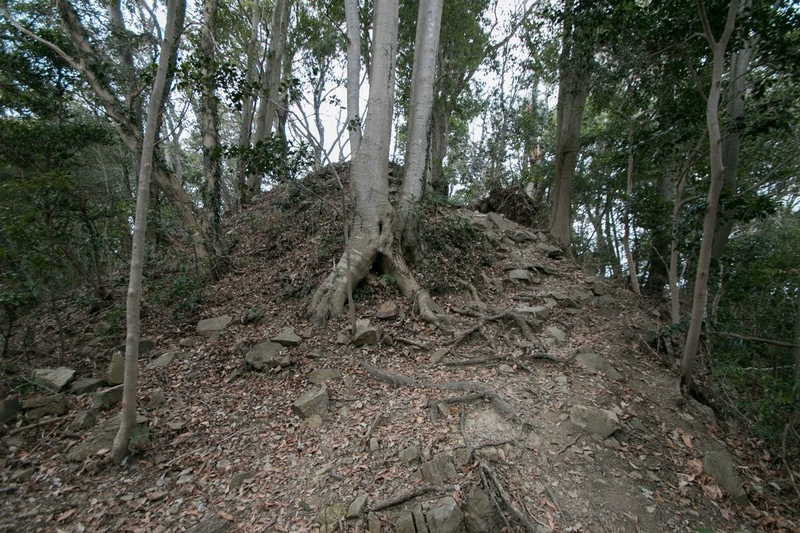 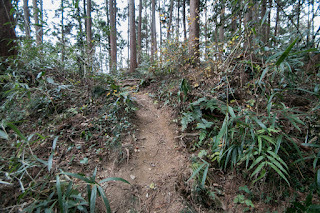 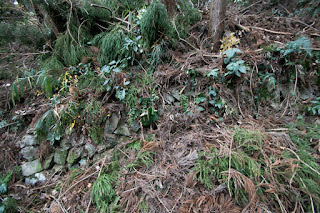 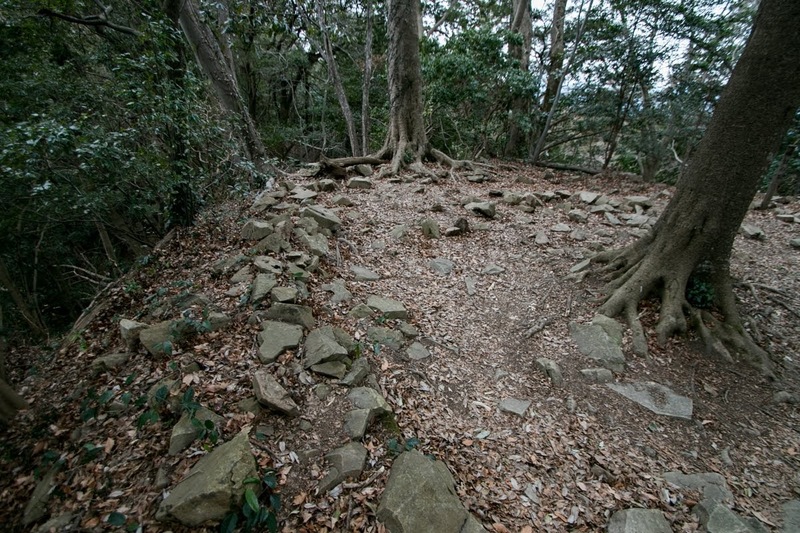 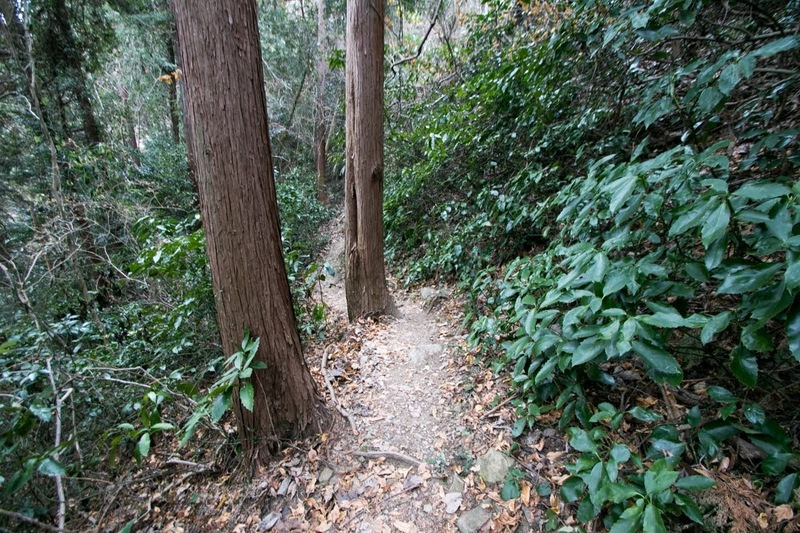 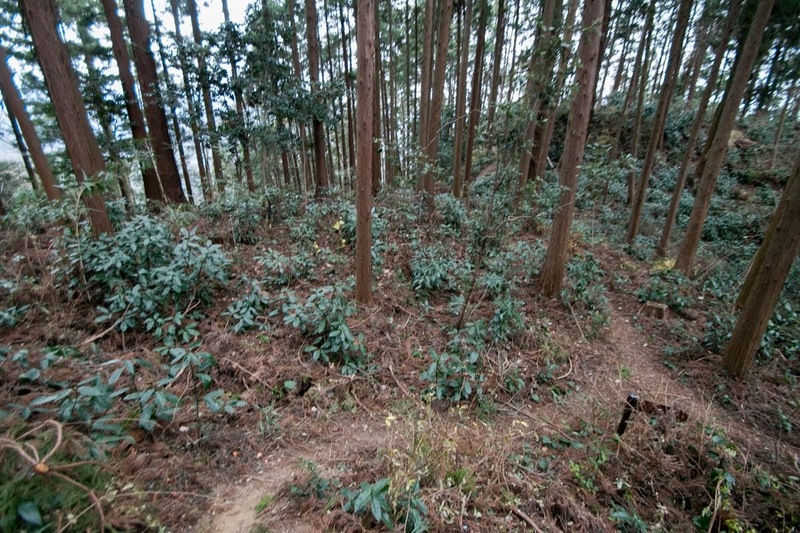 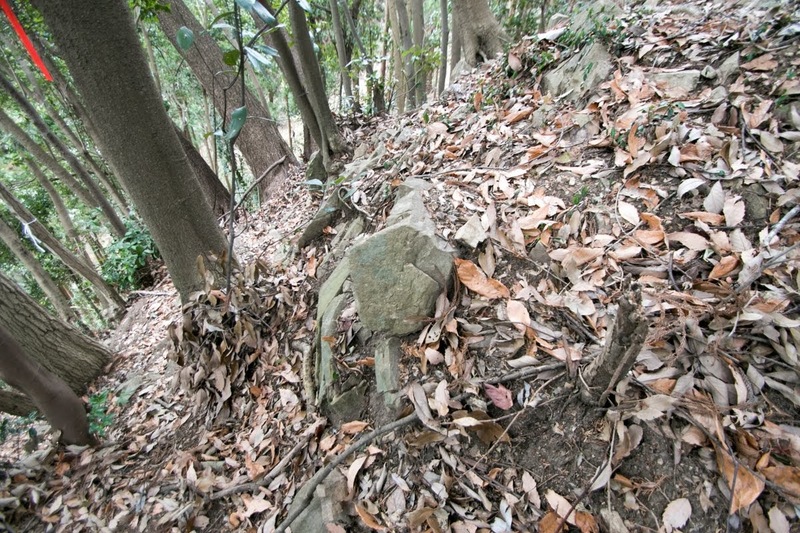 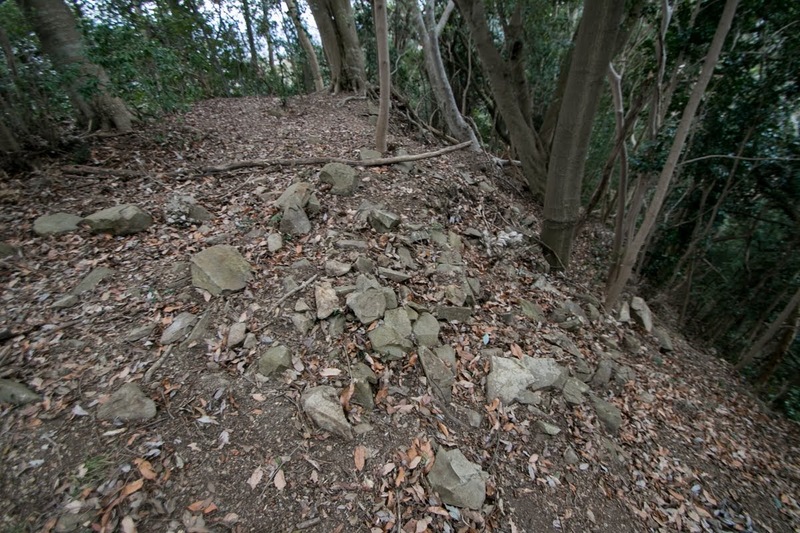 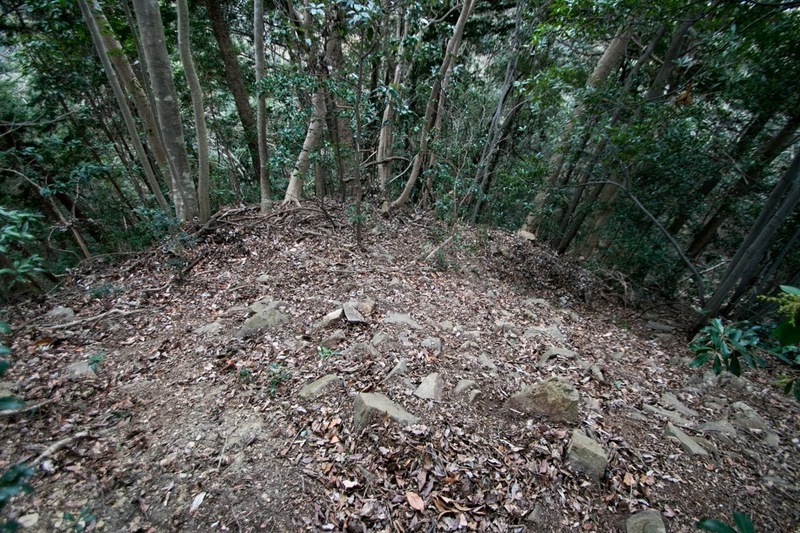 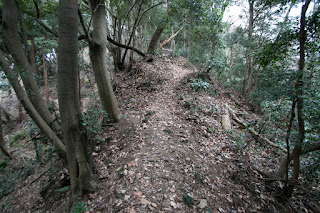 At last, on the top of next hill at 20 minutes walk from central area, there is a ruin of front fort named “Daitenshu” (inner castle) which has a line of stone walls prolongs over 500 meter at the both side of inner peak. 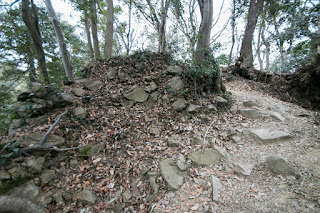 This inner castle was built to prevent attack from Kai province through higher backside mountains such as Jinba-san mountain or Fujimidai peak, and long line of stone wall might be intended to obstruct detour side attack of enemy. 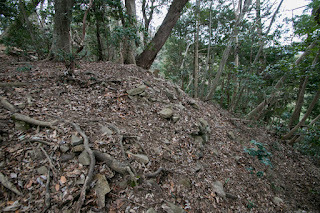 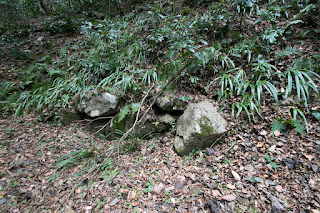 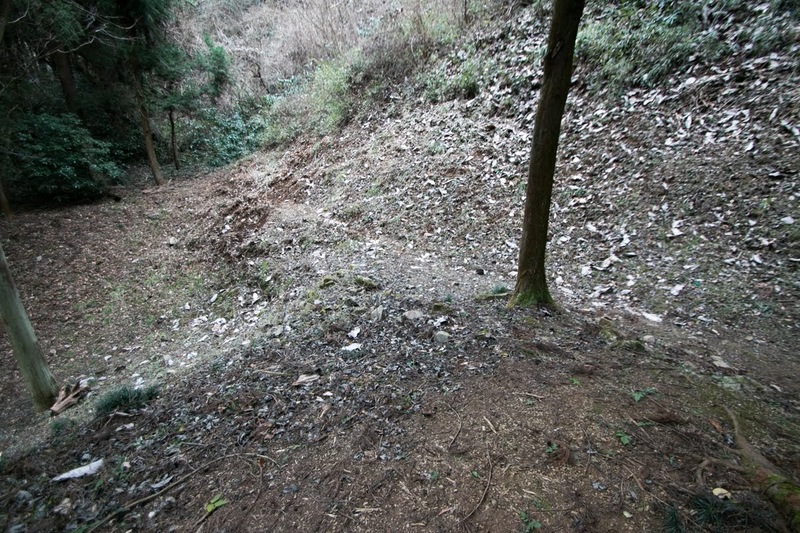 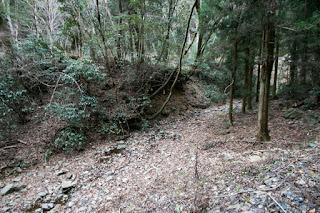 Around the mountain, outer defense line consisted of clay walls and dry moats were made at surrounding hills and ridges. 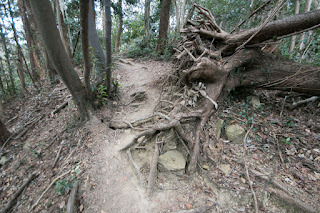 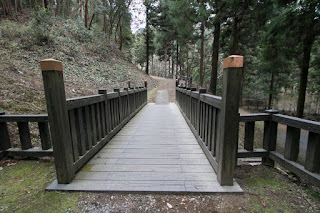 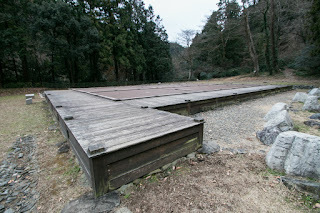 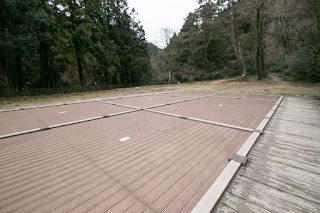 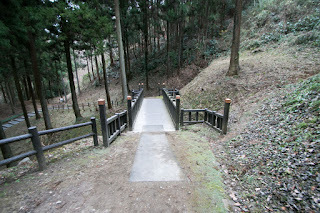 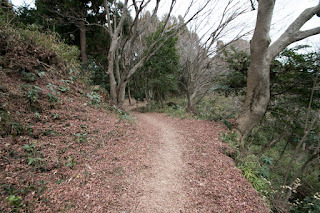 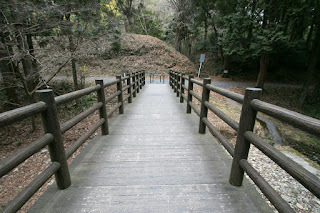 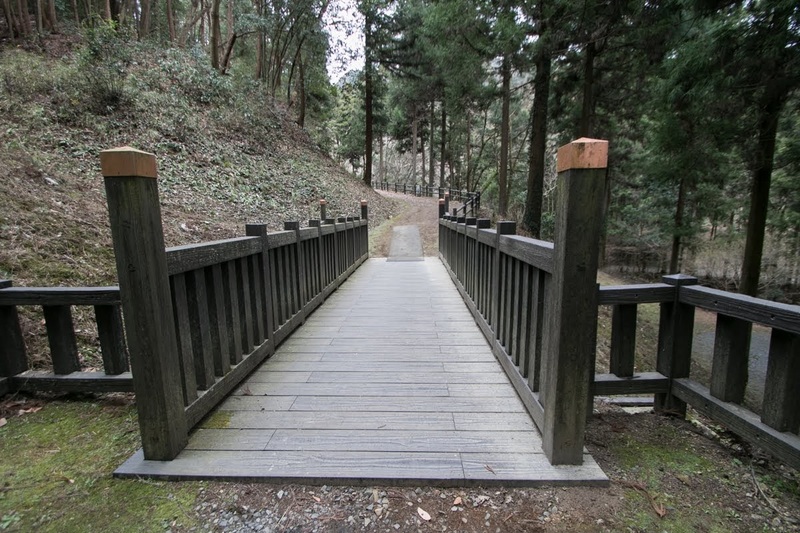 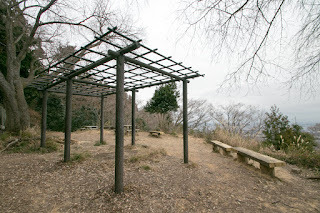 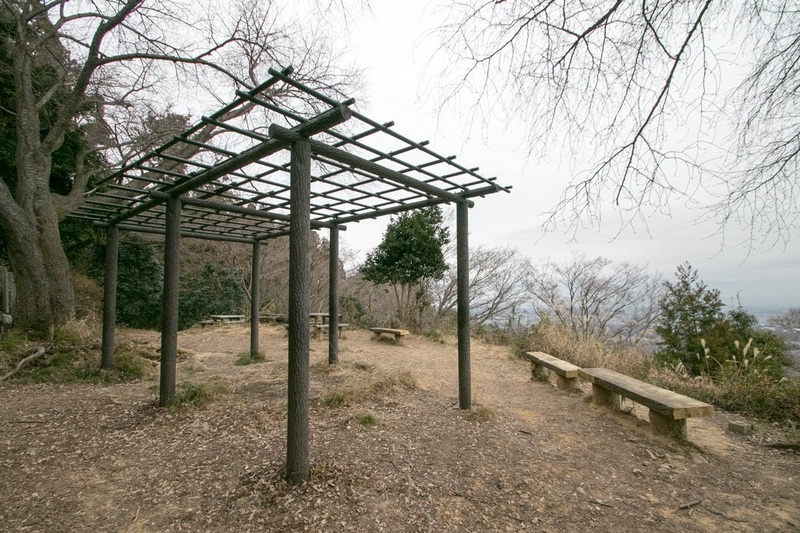 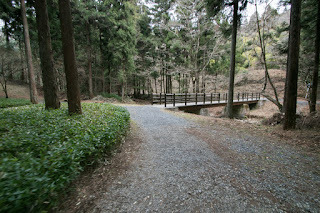 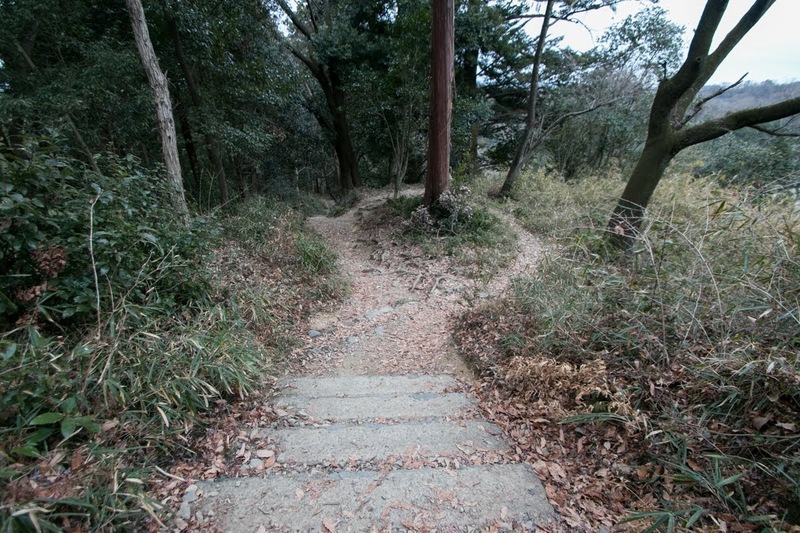 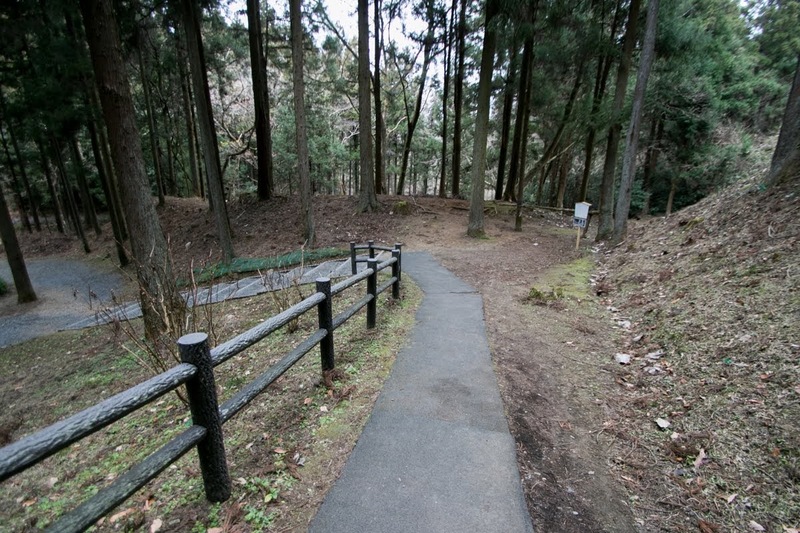 Generally, the facilities of Hachioji castle are very unbalanced. 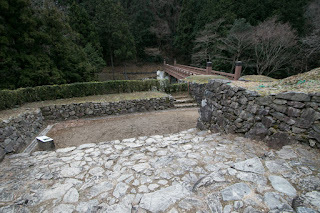 The palace of Ujiteru was splendid and advanced one affected by castles of Kinki area, but defense facilities at hilltop area were not so sophisticated rather degenerated from Takiyama castle. 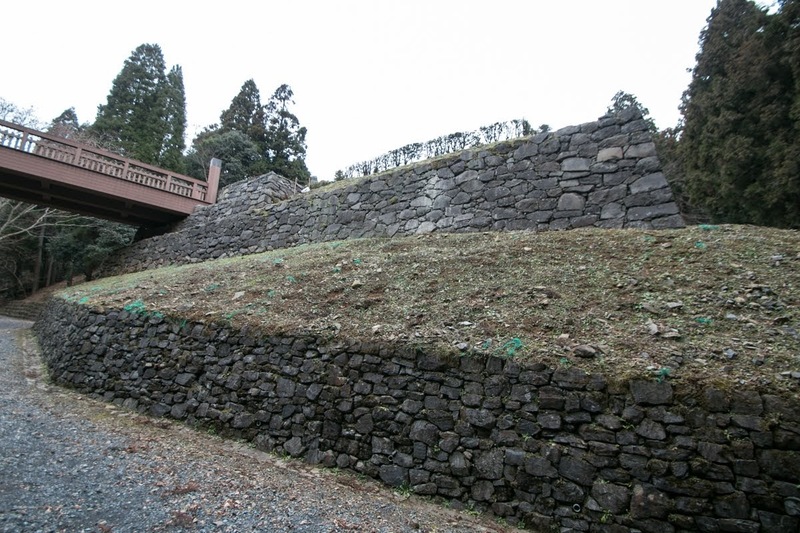 But inner castle was built by stone walls, an advanced technology. Probably Ujiteru thought to build a large fortress having secure central castle and wide outer area, but due to the limitation of time he first built minimum and least necessary facilities such as his palace and defense wall against Kai province. He might plan to spend more years to make up whole castles, but environment surrounding Hojo clan did not allow it. 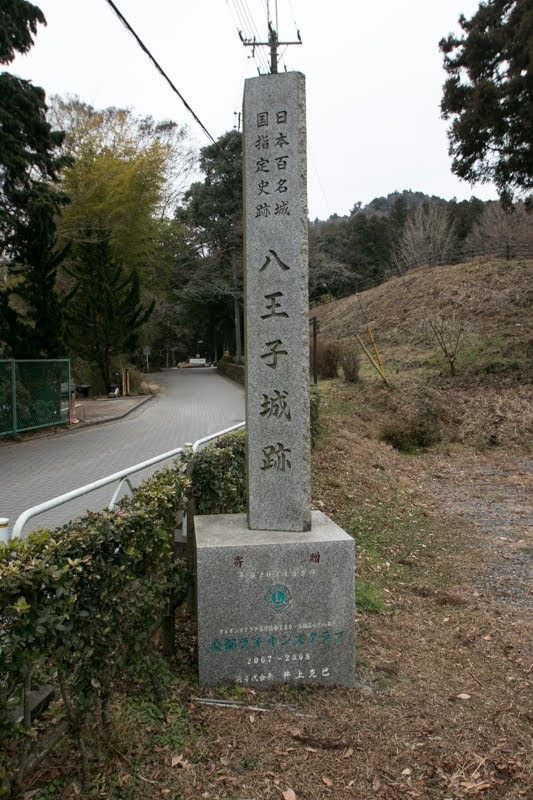 In 1589, Hideyoshi Toyotomi (1537-1598), the ruler of central area, forced Hojo clan to subordinate to his government. 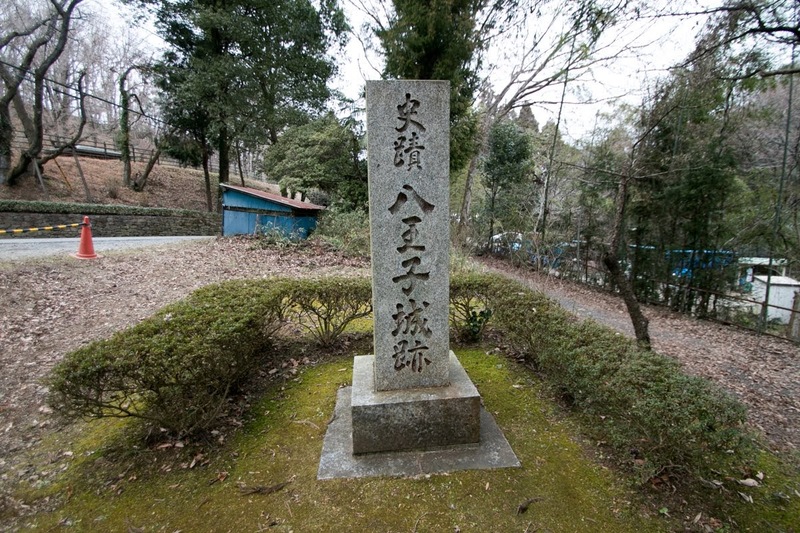 Once Ujinao Hojo (1562-1591), last leader of Hojo clan, accepted it. 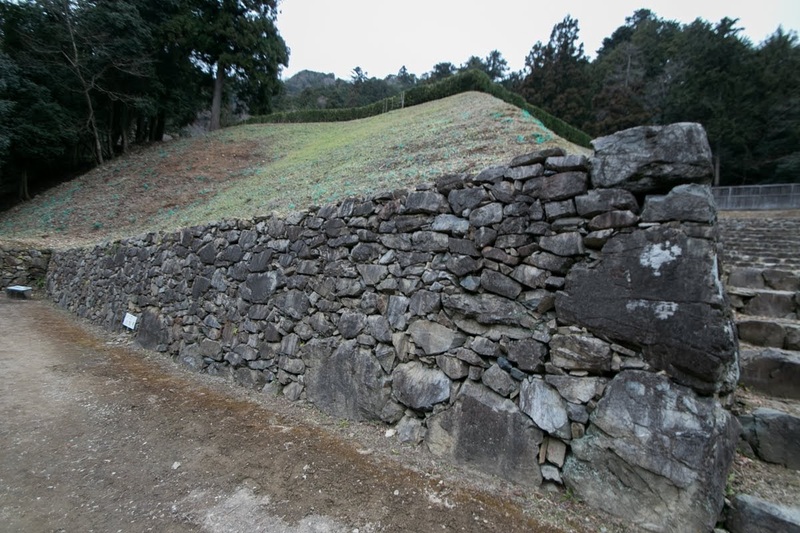 But as a result of the territorial conflict of Nagurumi castle (Gunma prefecture), Hideyoshi decided to conquest Hojo clan by over 200,000 troops. 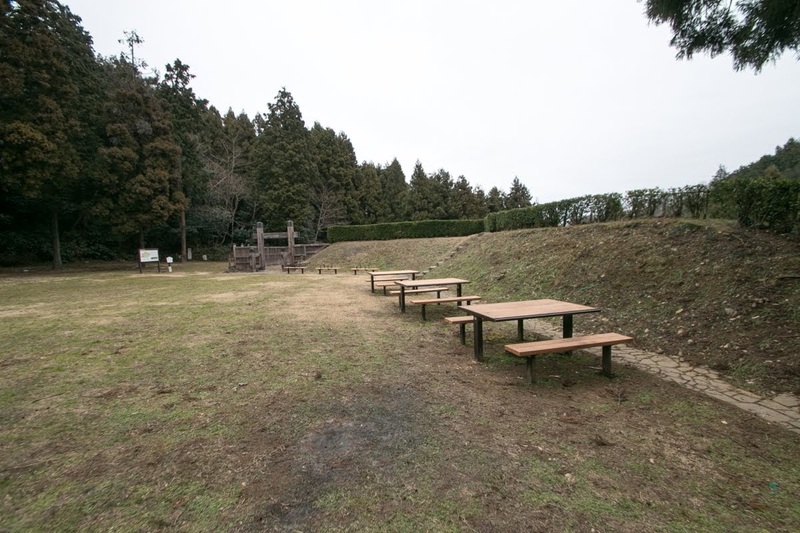 In response to this, Hojo clan gathered 80,000 soldiers and decided to besiege at Odawara castle, their residence. 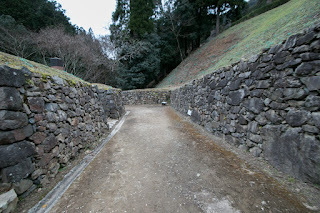 As a military leader of Hojo clan Ujiteru also entered Odawara castle with good part of his soldiers, thus Ujiteru could leave only 3,000 solders including mobilized civilians at Hachioji castle lead by deputy commanders. On March 1590, Hideyoshi’s main troop fell Yamanaka castle and encircled Odawara castle. On the other hand, a detached force consisted 30,000 soldiers lead by Toshiie Maeda (1538-1599), and Kagekatsu Uesugi (1556-1623), intruded into north Kanto region passing through Usui path. 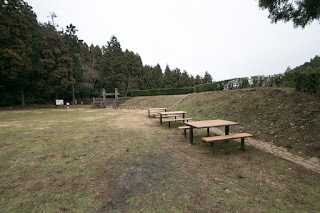 This detached force captured castles of Hojo clan such as Matsuida castle, Minowa castle, Maebashi castle (Gunma prefecture), Musashi Matsuyama castle or Hachigata castle (Saitama prefecture), and they finally arrived at Hachioji castle in June. 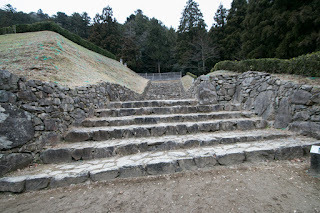 As Hachioji castle was a residence of Ujiteru who was a military leader of Hojyo clan and supported war against Toyotomi government, Hideyoshi ordered Toshiie and Kagekatsu to assault Hachioji castle in force. 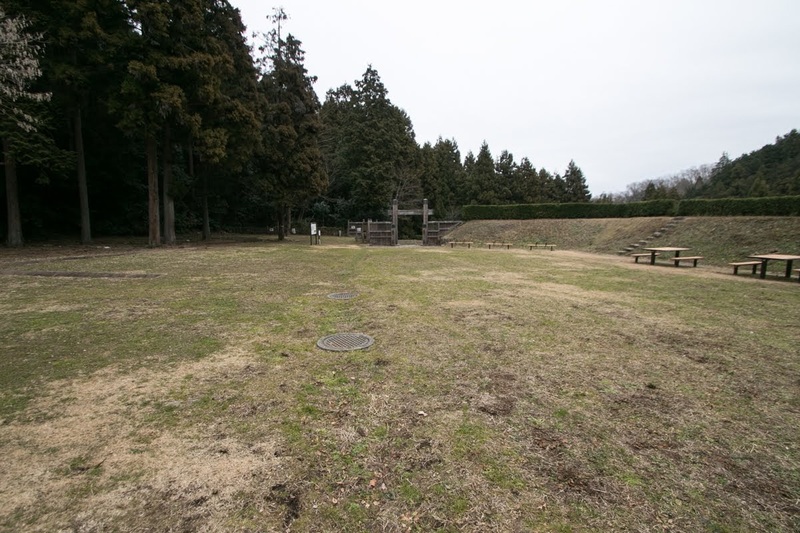 In early morning of June 23, Toyotomi army consisted of 15,000 army approached to the castle and start attack, and in spite of brave fight of defending soldiers, Hachioji castle was captured and major commanders of Hojo side all died. In addition to a significant difference of soldiers, due to above incompleteness of defense facilities lead to this quick fall. 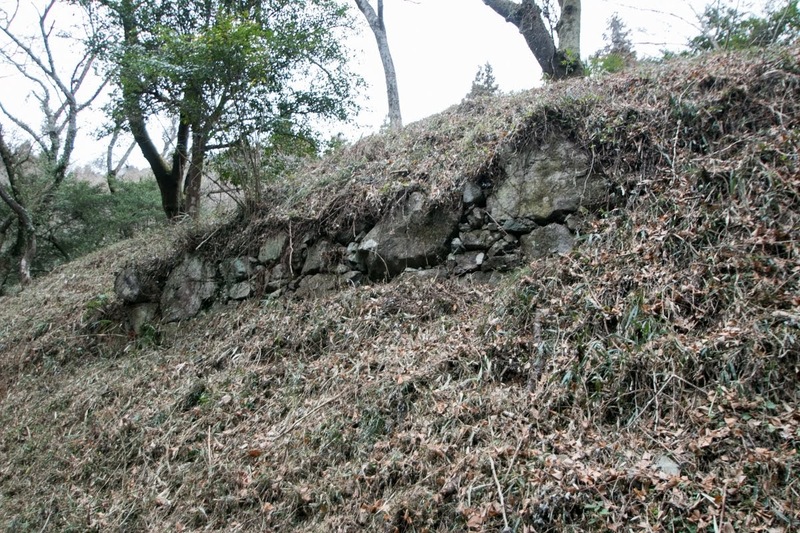 Fall of Hachioji castle gave a severe impact to leaders of Hojo clan including Ujiteru. 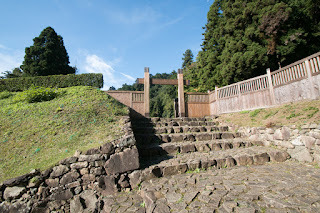 Concurrently with this, betrayal of chief vassal Norihide Matsuda (?-1590) became revealed, and Ishigakiyama castle, a modern castle built for the headquarter of Hideyoshi, completed just beside Odawara castle. Considering these situation, leaders of Hojo clan decided to open Odawara castle and surrender to Hideyoshi next month. 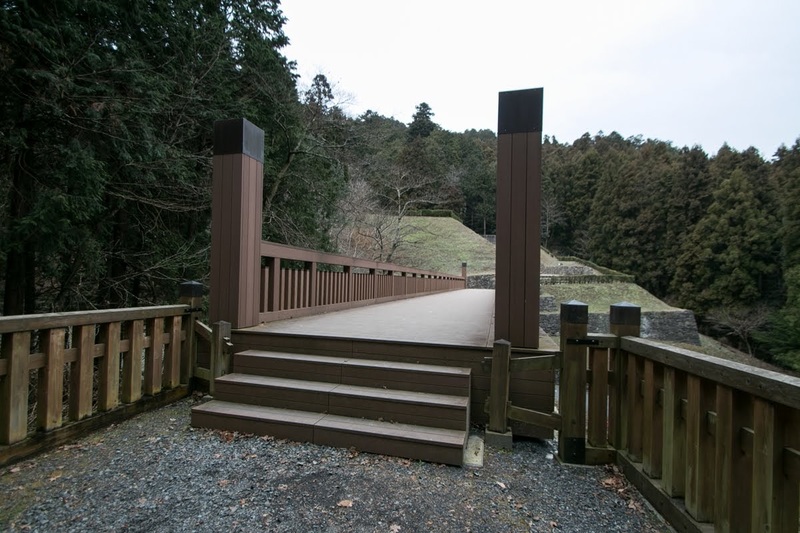 In this meaning, the battle of Hachioji castle was final decisive battle for Hideyoshi’s unification of Japan. 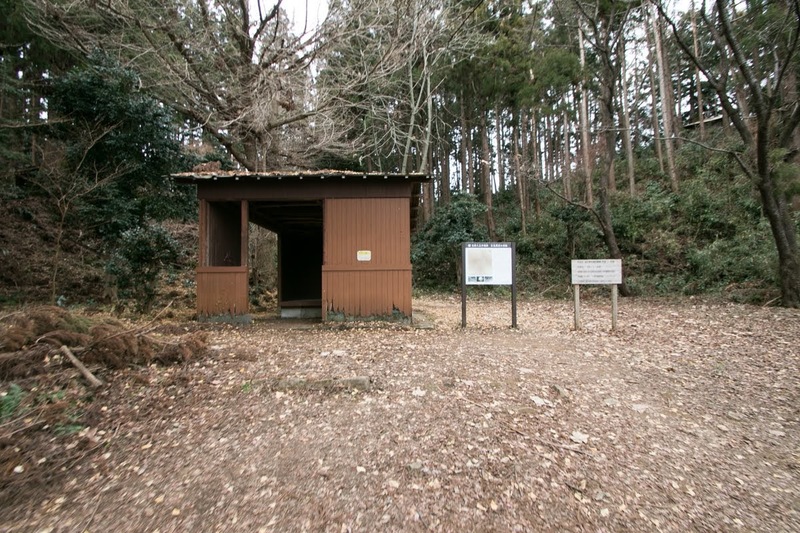 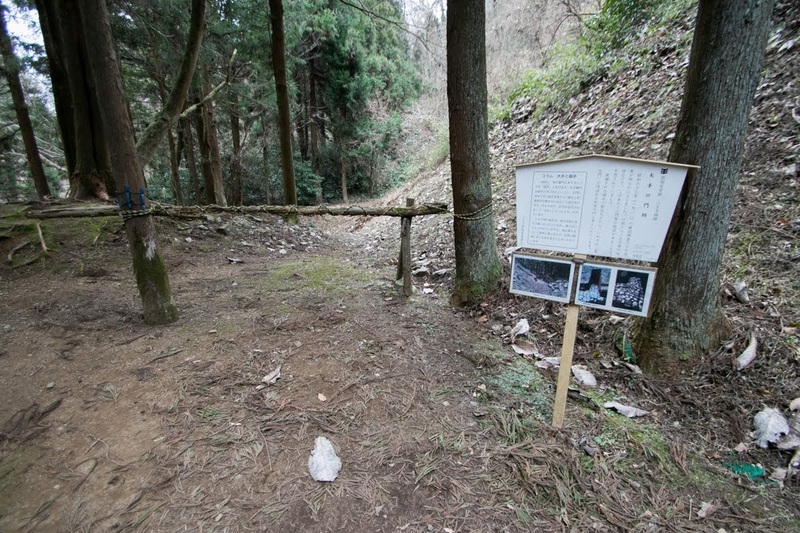 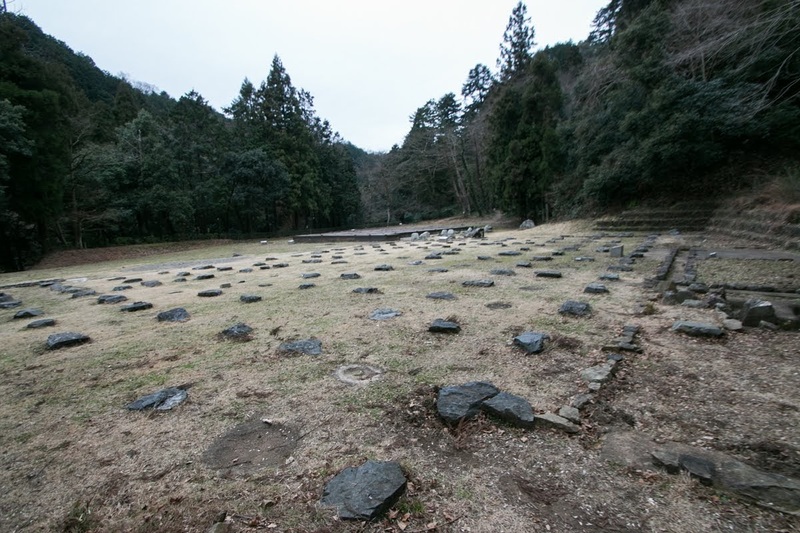 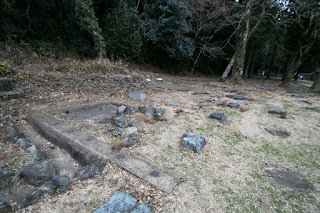 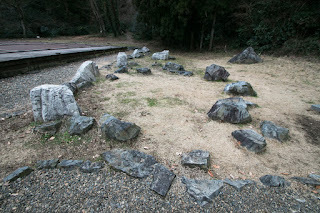 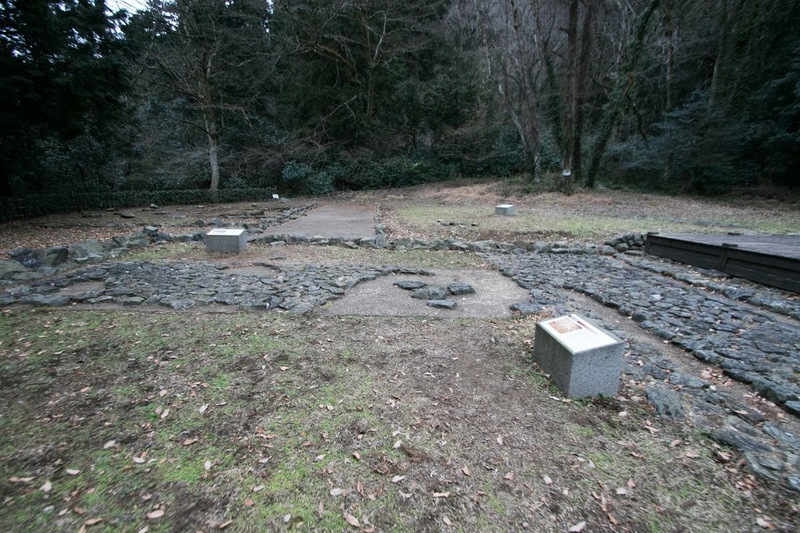 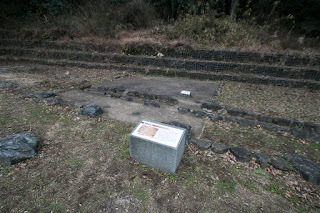 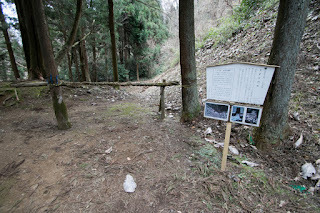 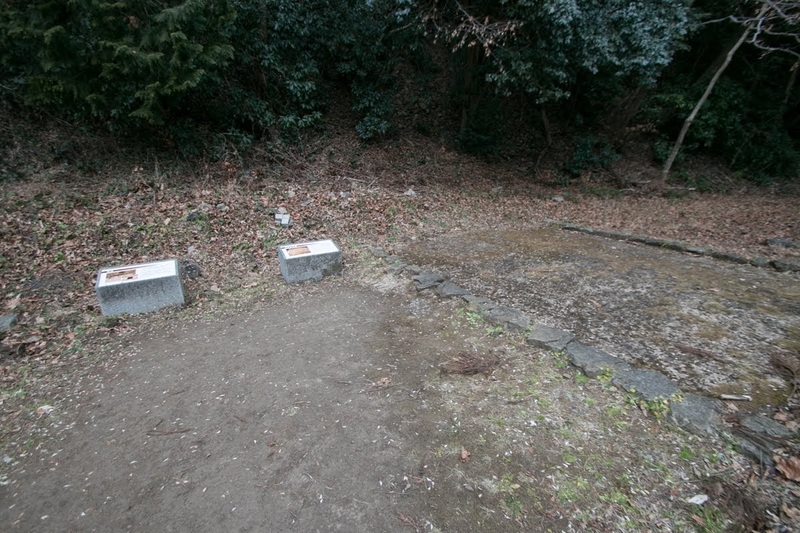 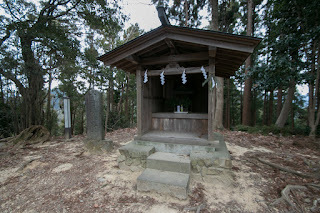 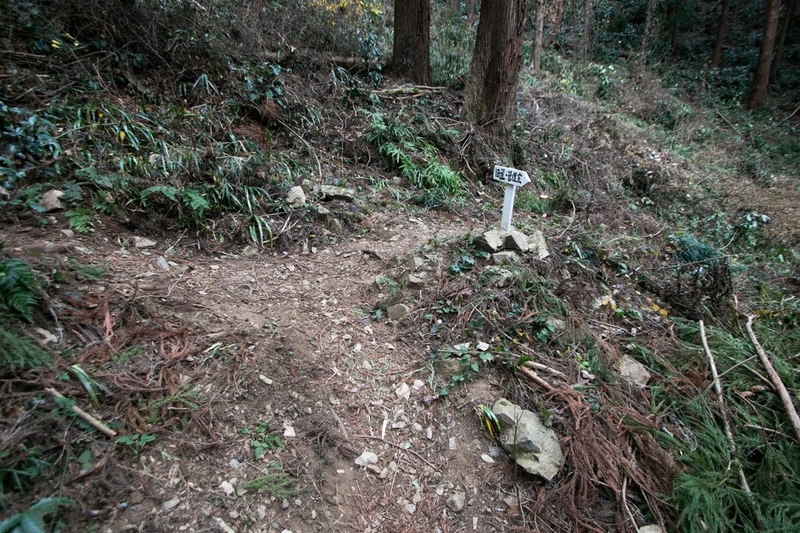 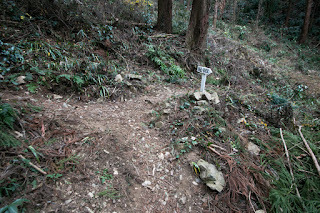 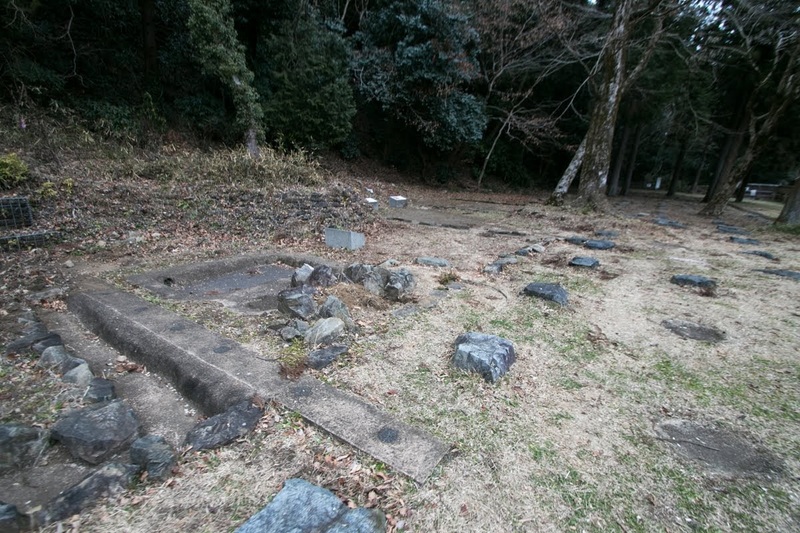 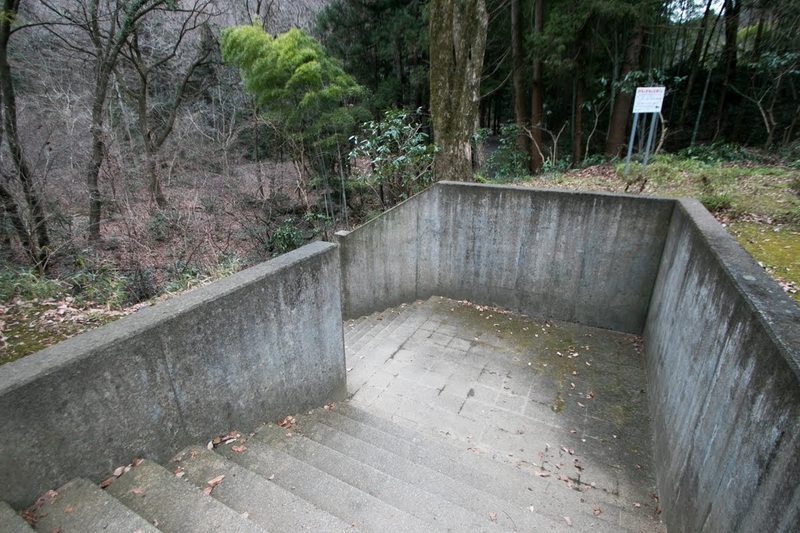 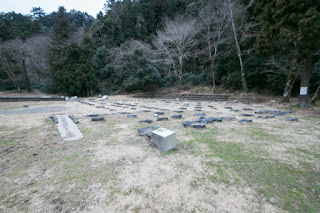 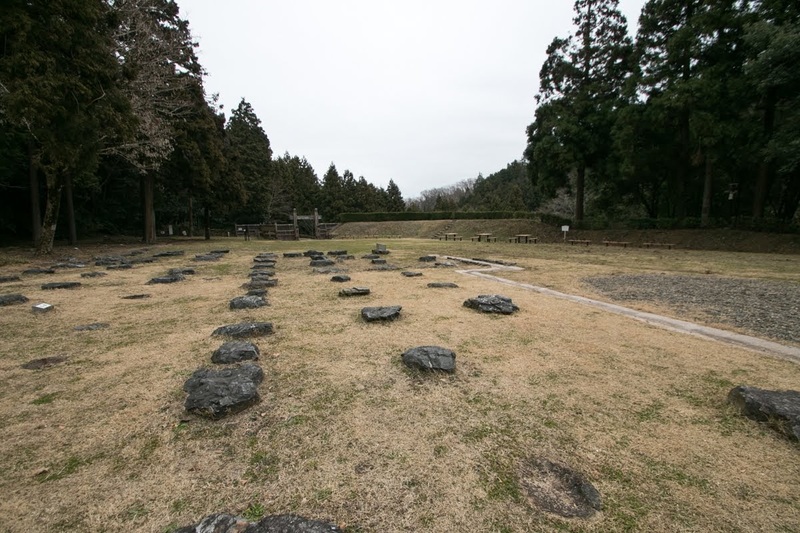 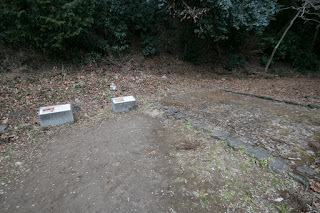 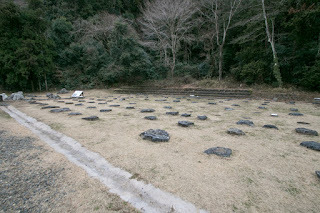 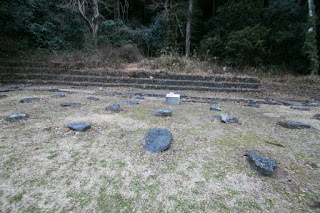 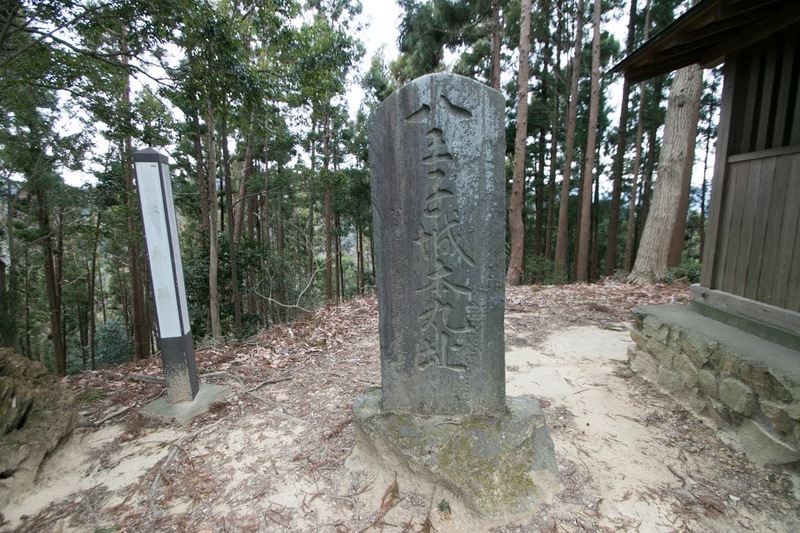 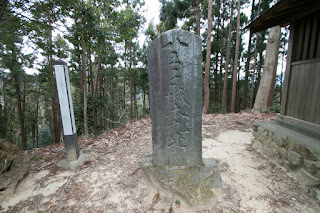 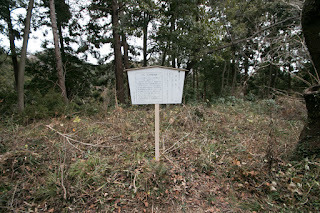 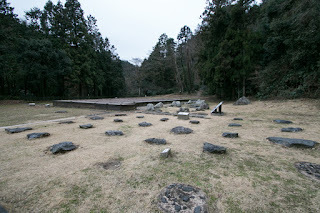 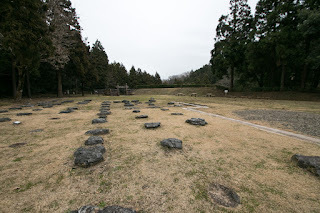 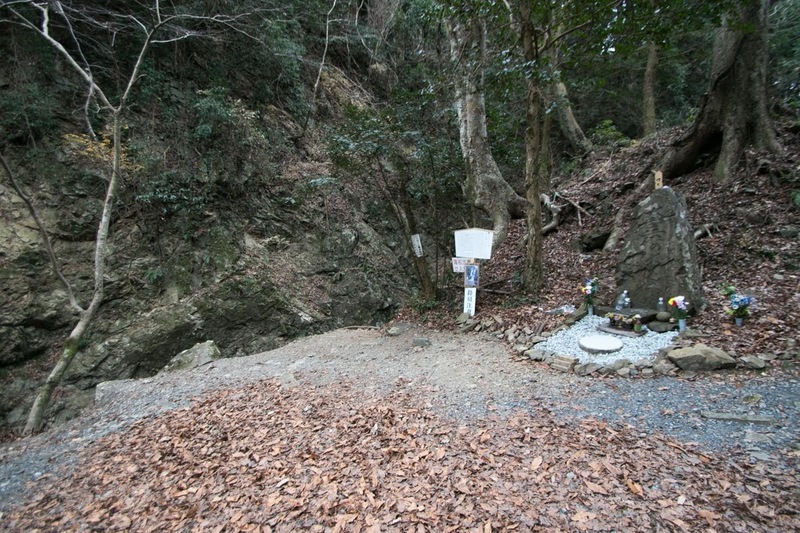 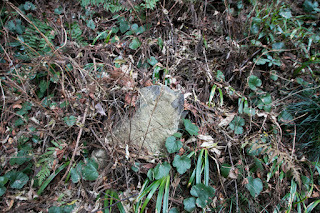 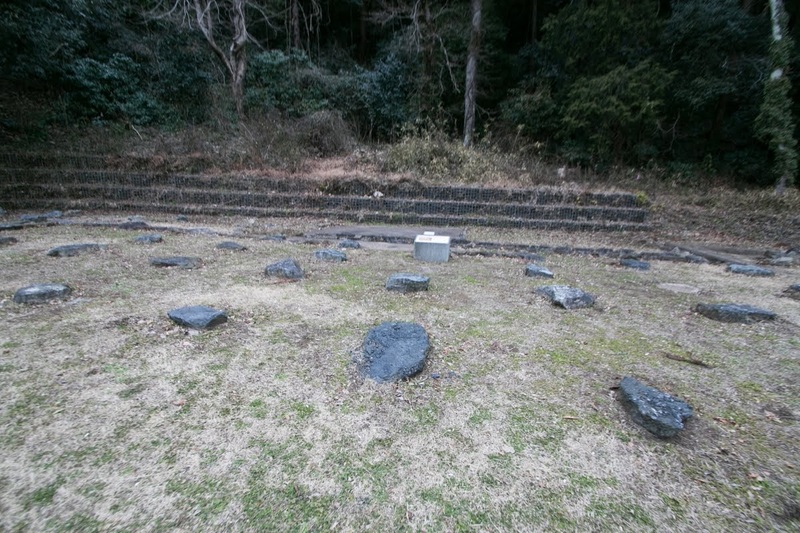 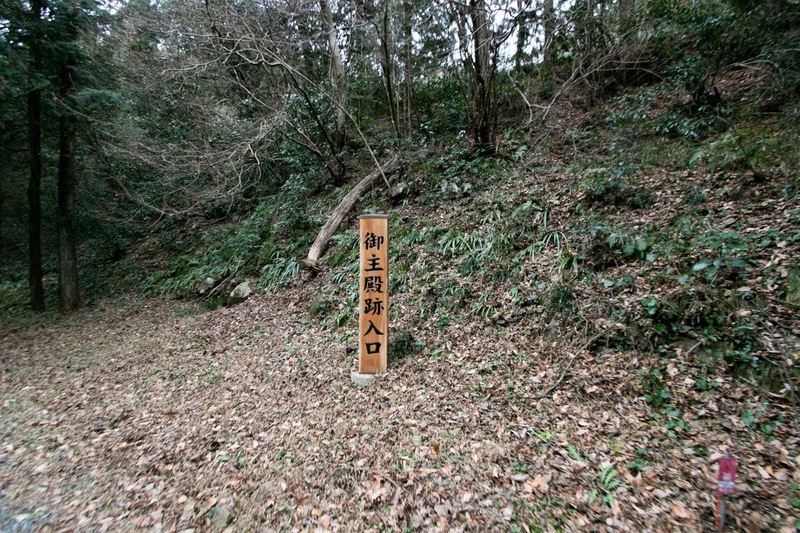 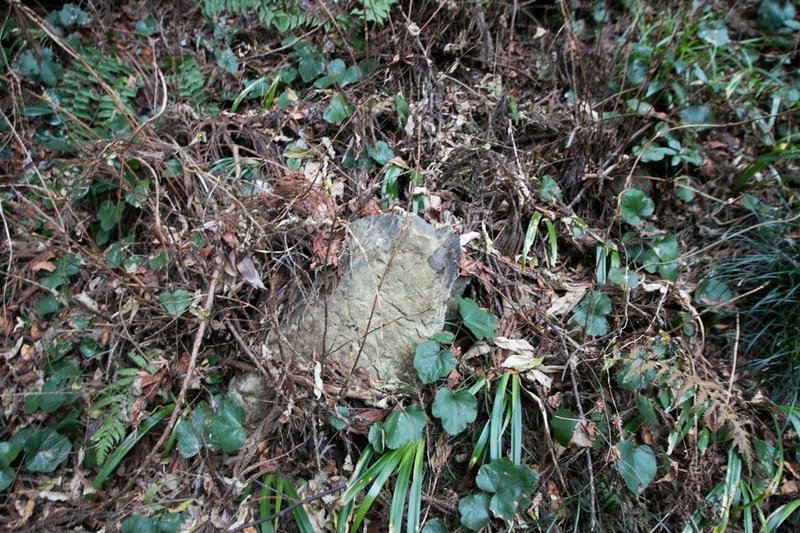 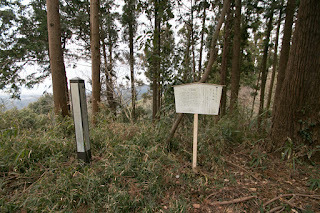 As a postwar dealing, Ujiteru was forced to suicide along with Ujimasa Hojo to take responsibility for opening battle with Toyotomi government, and his grave located near Hachioji castle. After the war, Hachioji castle was abolished, and its attached town moved to north and became the origin of current Hachioji city. 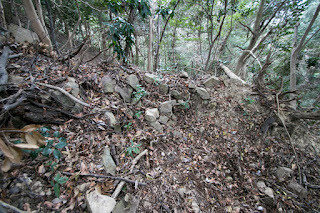 The ruin of castle had been left untouched, but recently investigation and improvement progress and former shape gradually become clear.